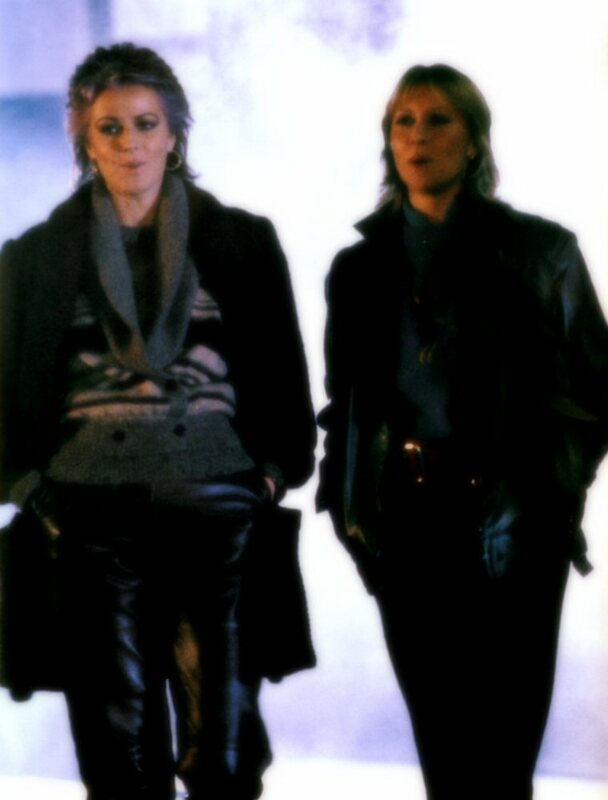 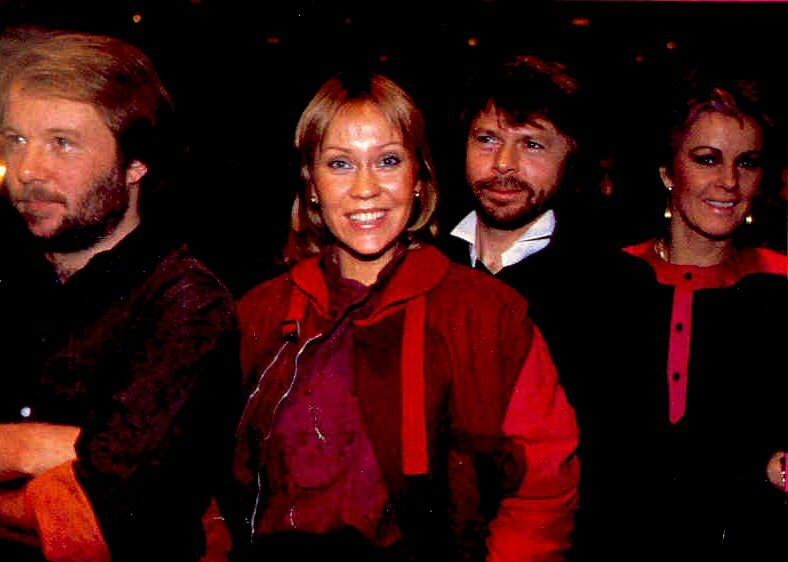 The video to this song was filmed on January 21st, 1982 in the Stockholm center and in the studio (go.to/ABBA related places). 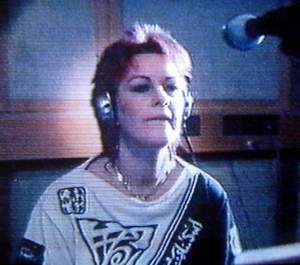 The photos were taken in the studio during the filming of the video. 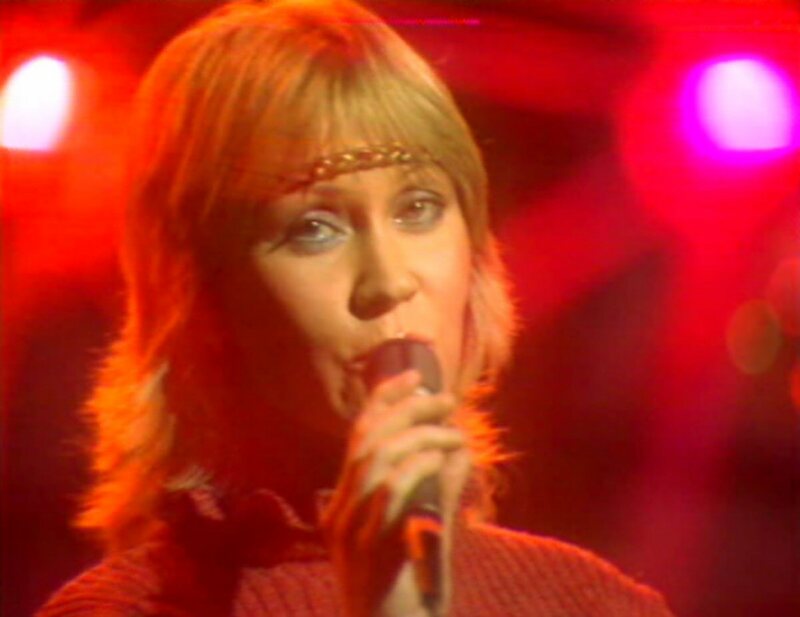 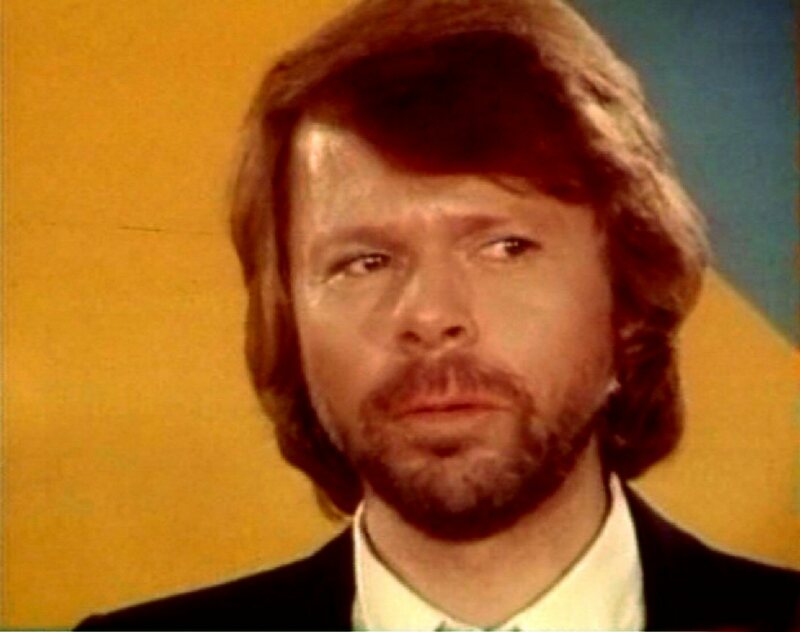 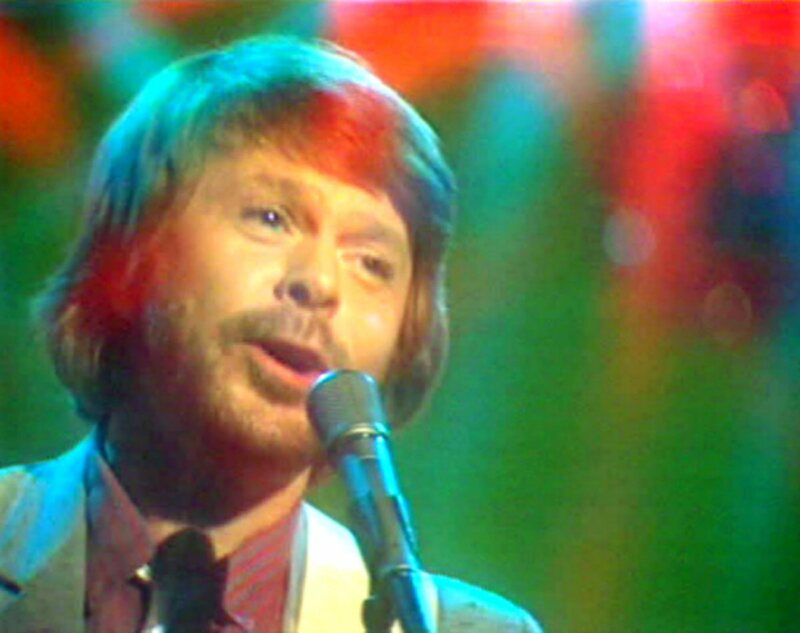 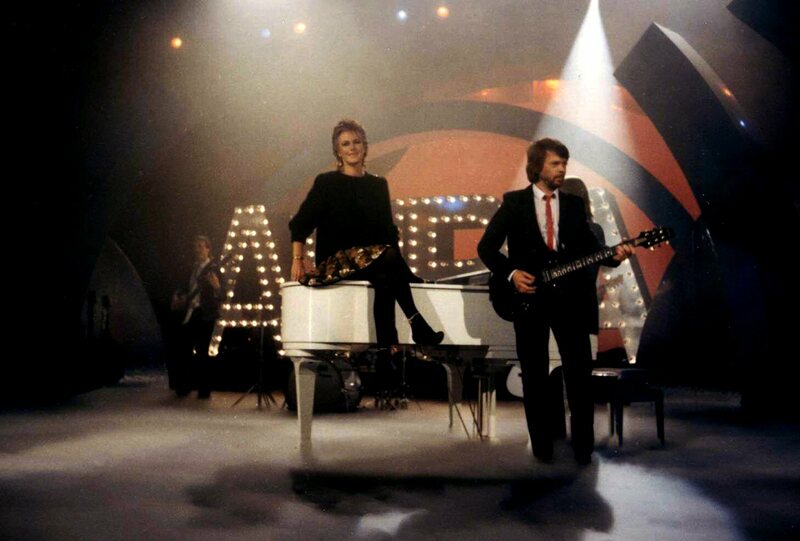 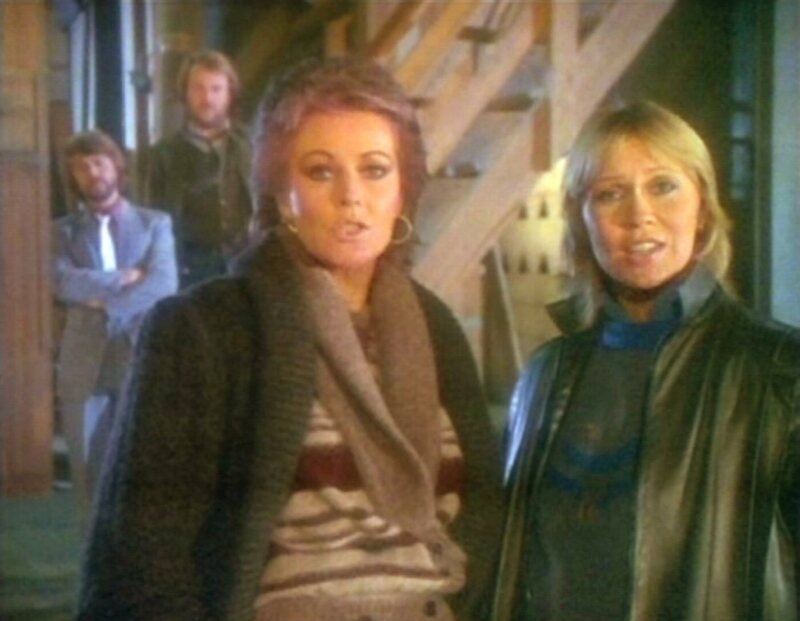 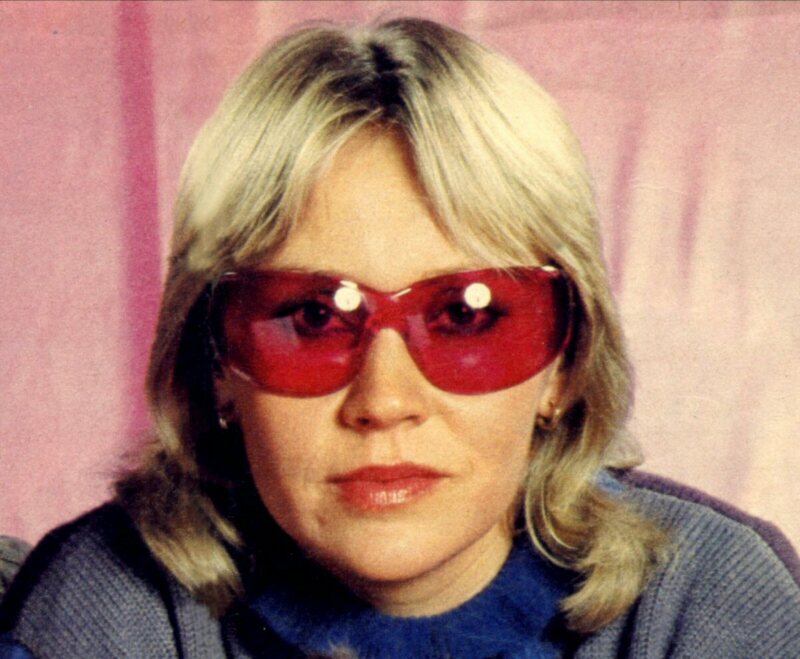 Agnetha is singing about her "very good friend," played in the music video by Frida, an overactive high-society woman who rushes through the shops, with her hapless and exhausted husband (played by Ulvaeus) following behind. 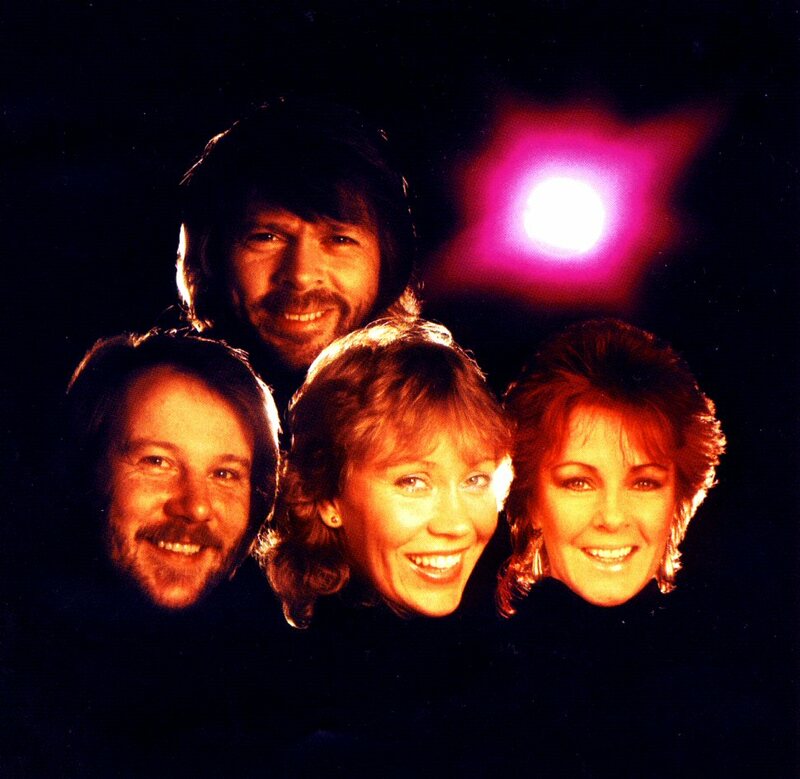 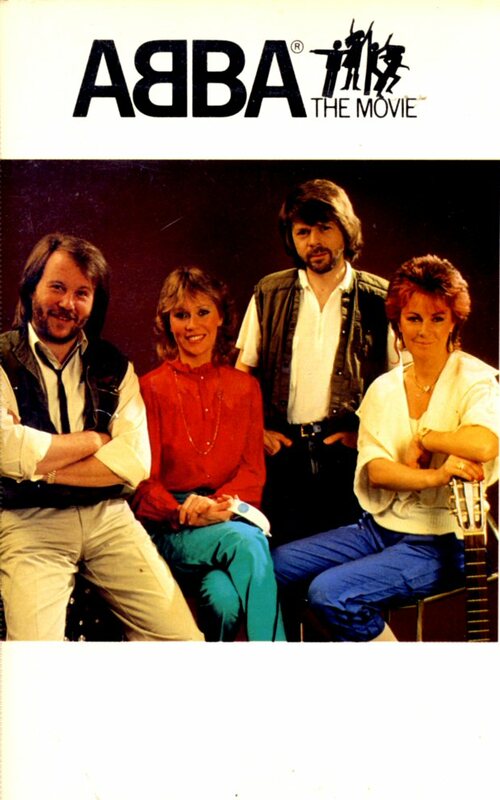 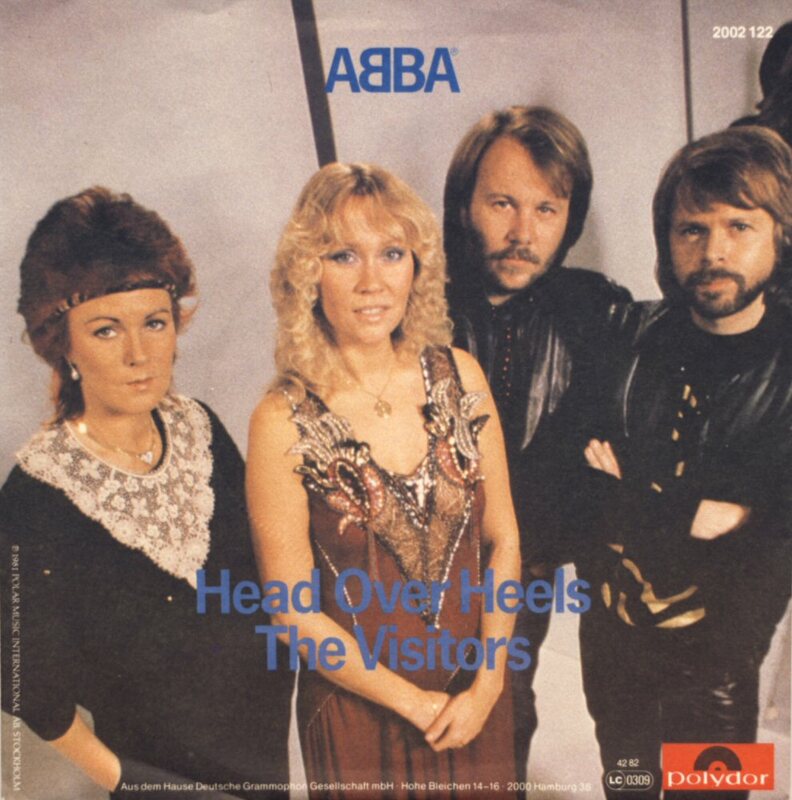 Lyrics to all ABBA songs released up-to-date (including the album "The Visitors") were issued as a book entitled "ABBA - A lyrical collection" which saw its release in the UK in March 1982. 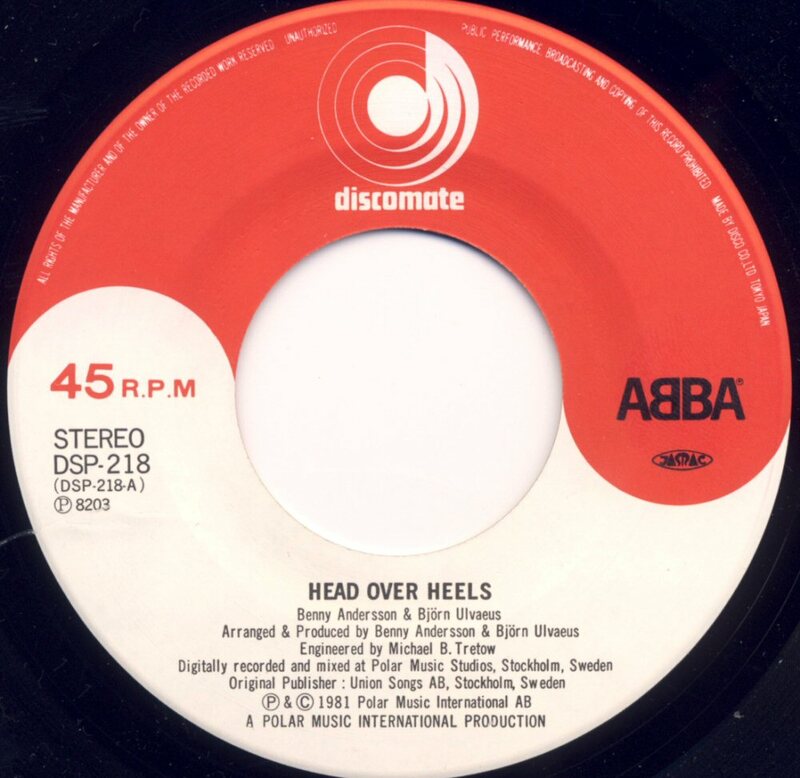 "Head Over Heels" b/w "The Visitors" were chosen for the second single release in most of the countries. 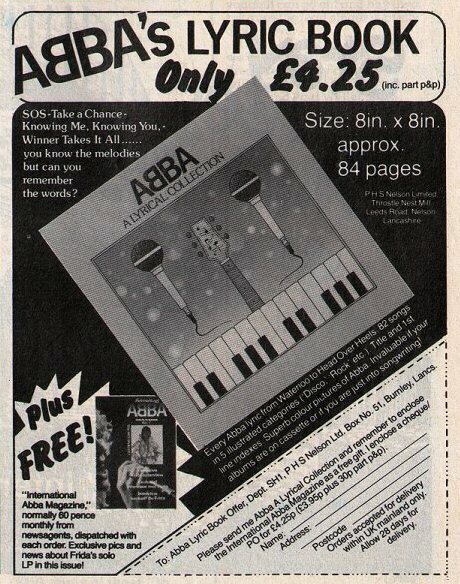 It was of course thought that this catchy pop piece with funny text should have become a big hit. 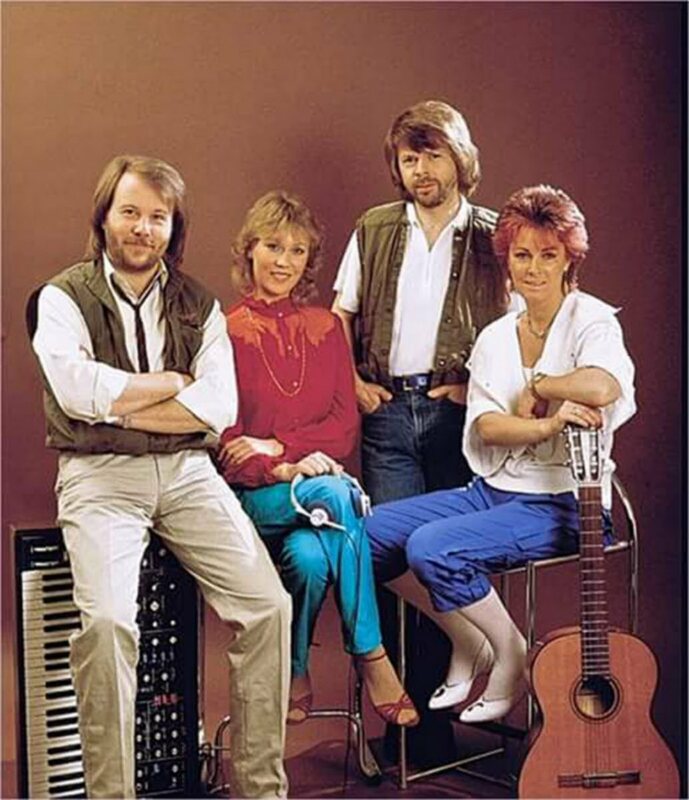 Sadly it became the first serious ABBA flop since 1975. 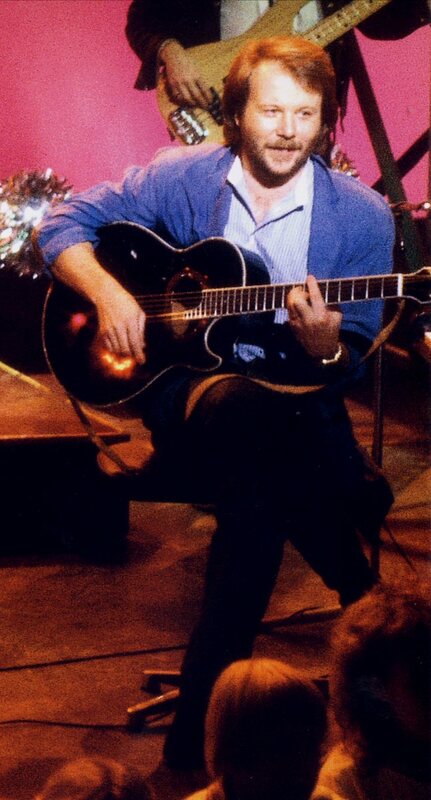 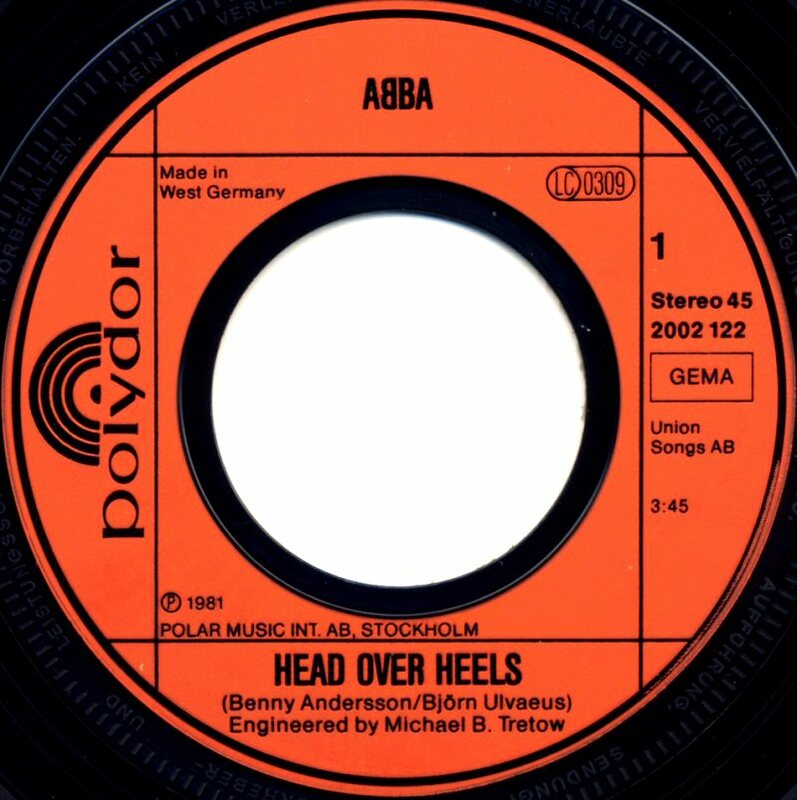 In West Germany where "Head Over Heels" entered the chart in February 1982 and stayed there for 12 weeks reaching #19. 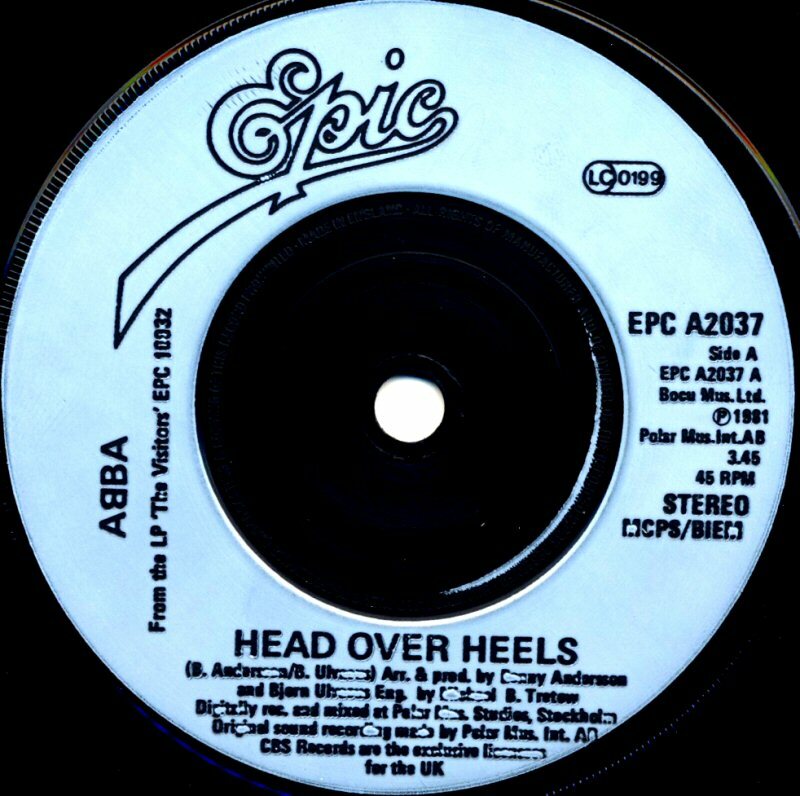 In Great Britain "Head Over Heels" was released already on February 5, 1982 and it stayed on the UK single chart for 7 weeks peaking at #25. 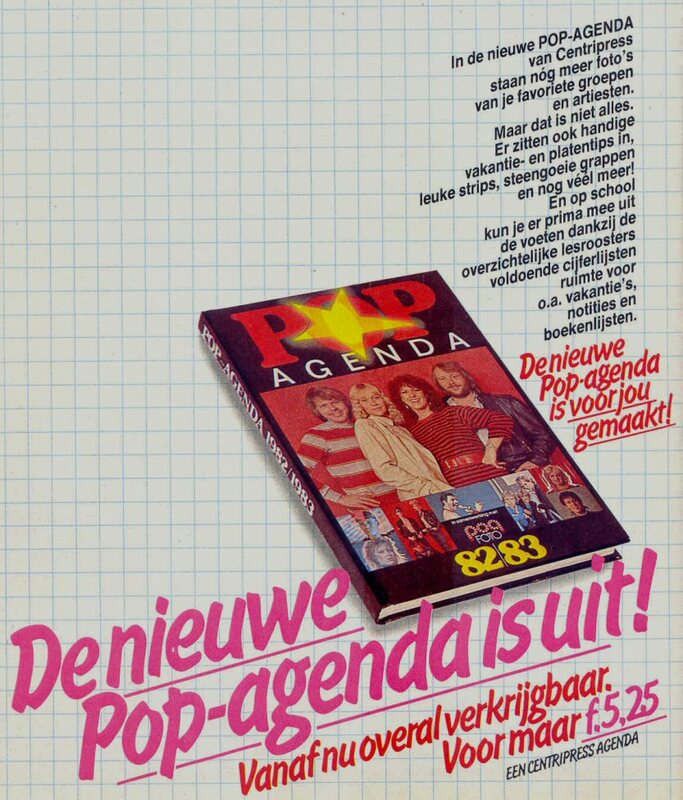 The single cover was completely different to the other European issues. 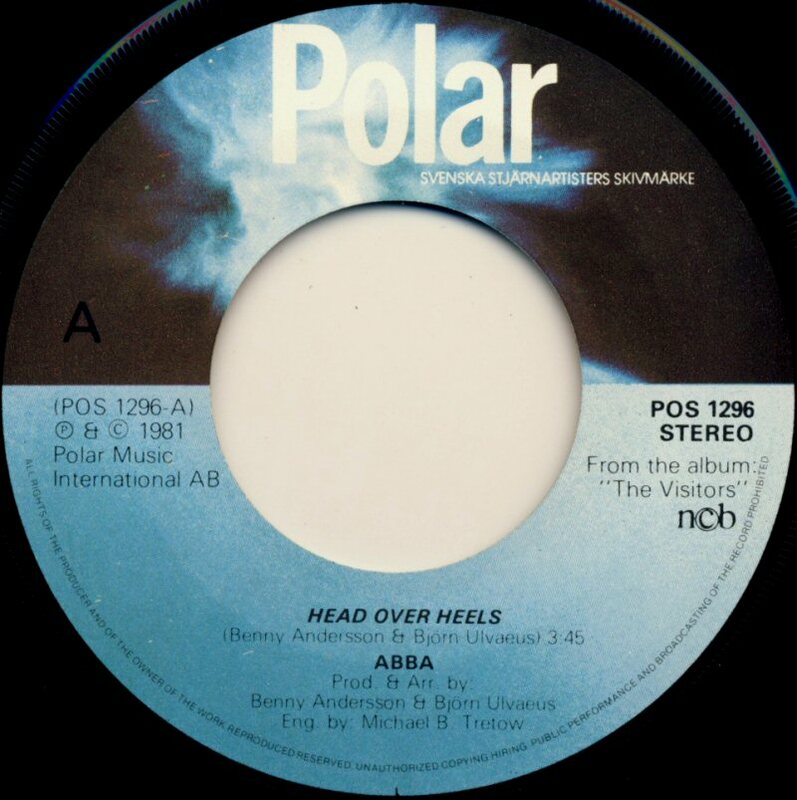 The single was much more successful in France where it entered the chart in February 82 and reached #10. 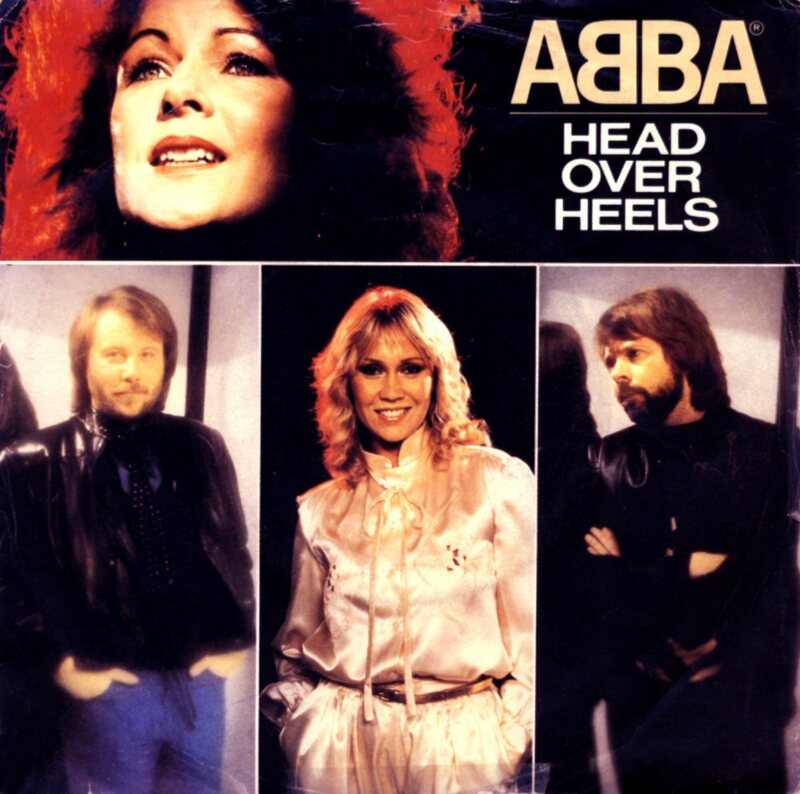 "Head over Heels" in other European countries: Ireland #14, Belgium #2, Holland #4 and Austria #8. 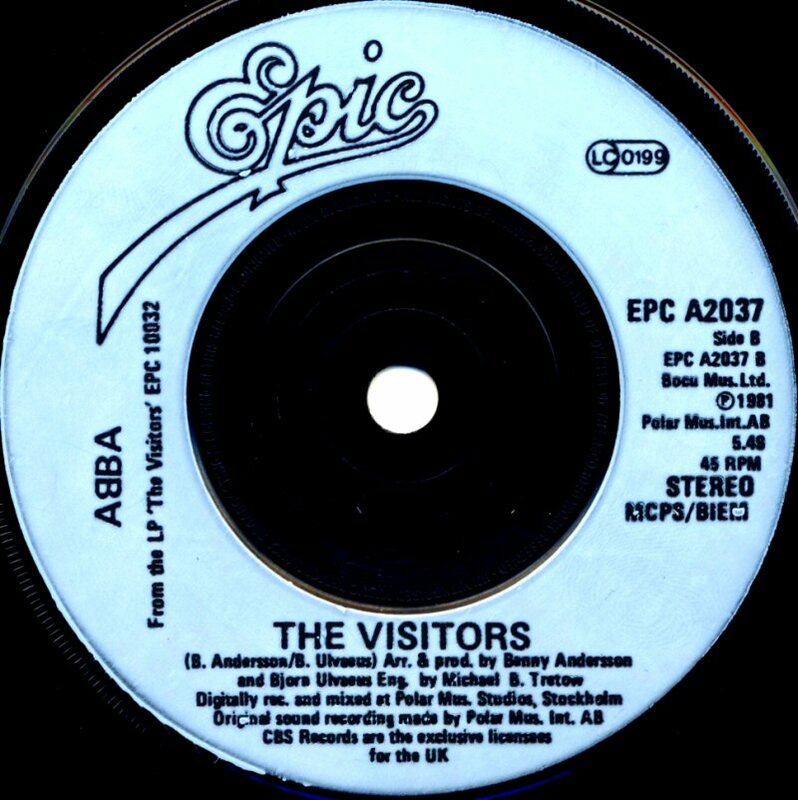 "The Visitors" entered the Polish chart on April 24th, 1982 at #6 which was the single's highest position and it stayed on the chart for 5 weeks. 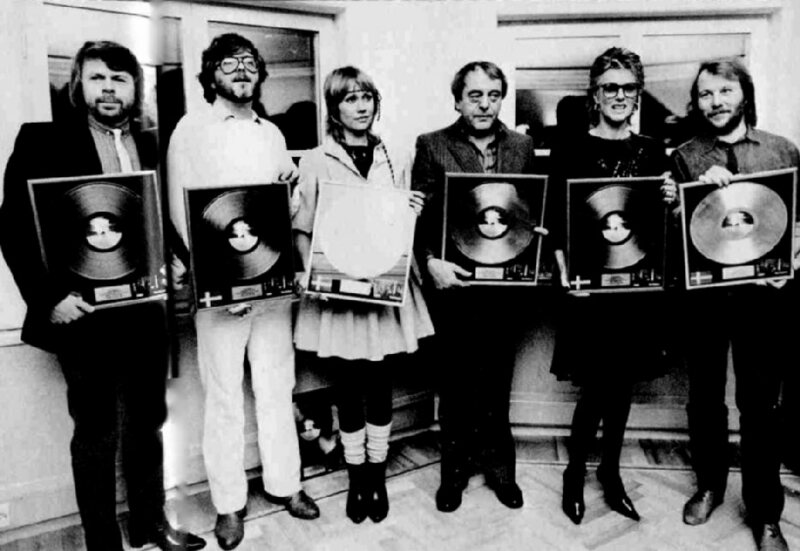 It was the very first edition of Polish pop chart after martial law in Poland. 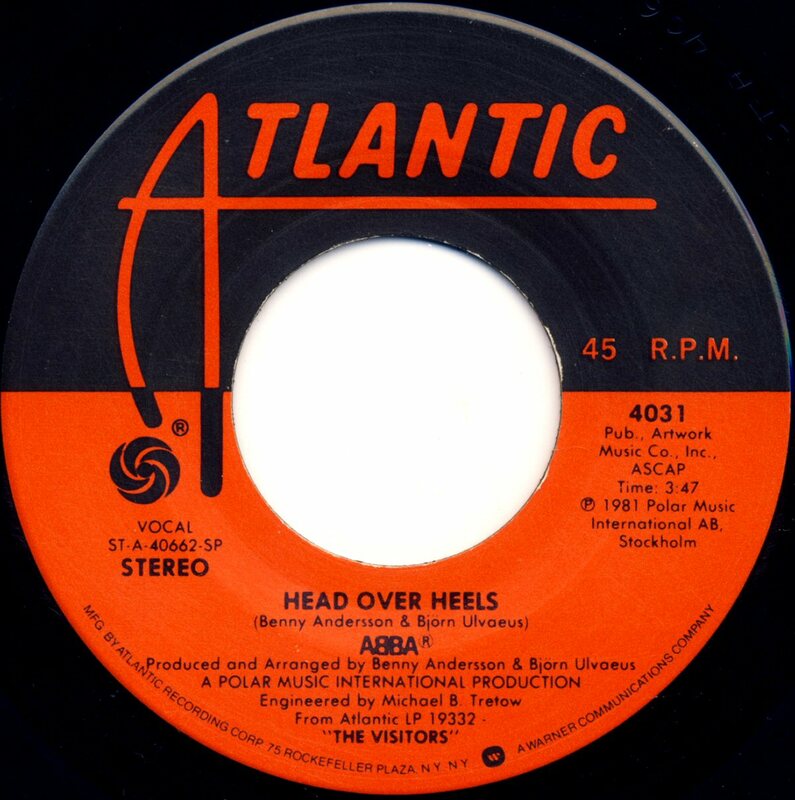 The second single selection (after "When All Is Said and Done") from the LP "The Visitors" in USA was the title song b/w "Head Over Heels". 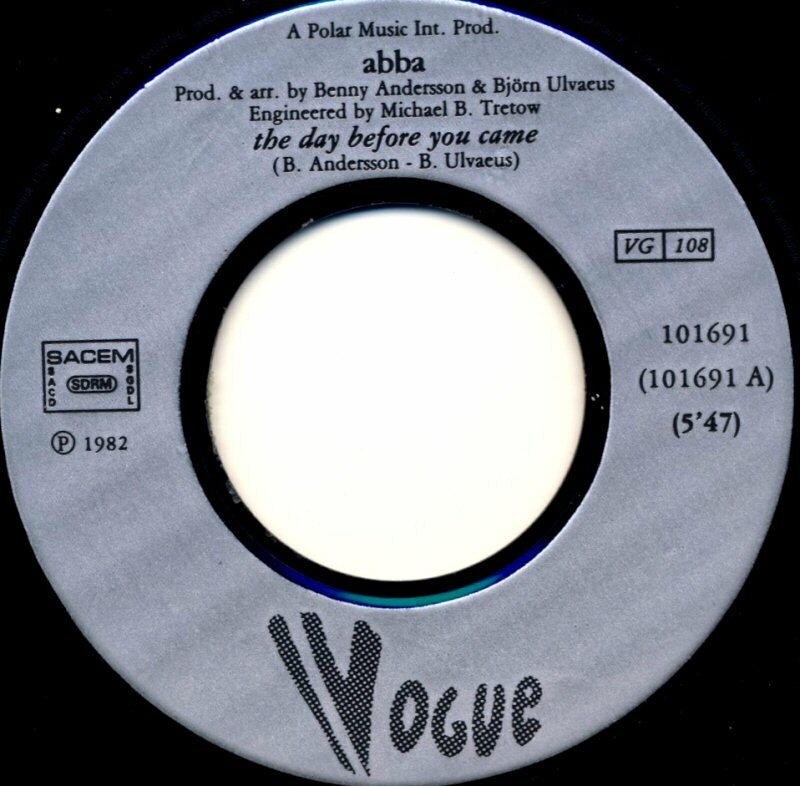 The single was released in April 1982 and it entered the US single chart where it stayed for 8 weeks reaching #63. 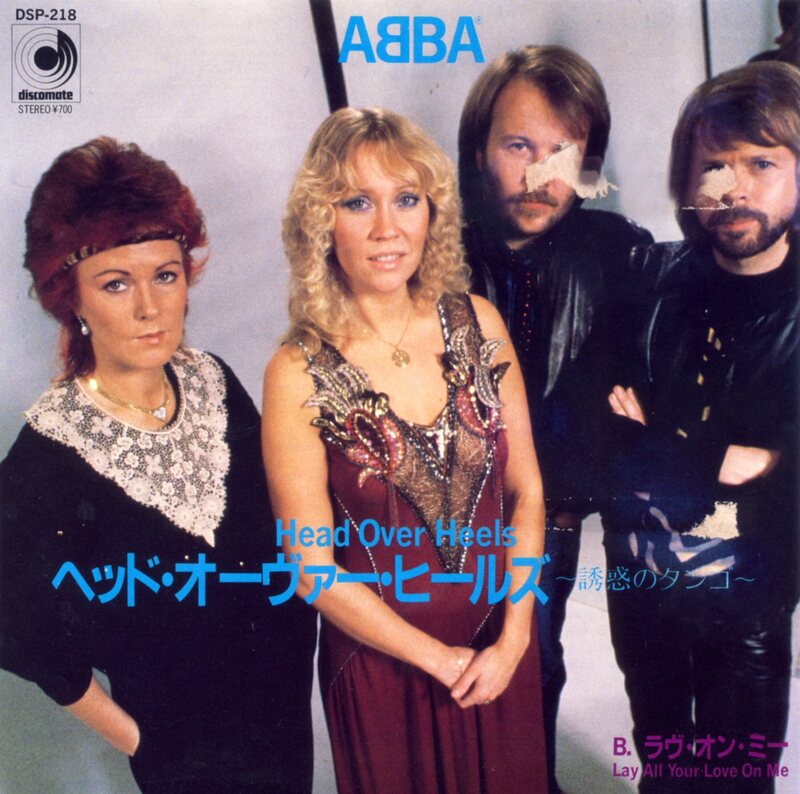 In Japan the single "Head over Heels" featured "Lay All Your Love On Me" and the B-side. 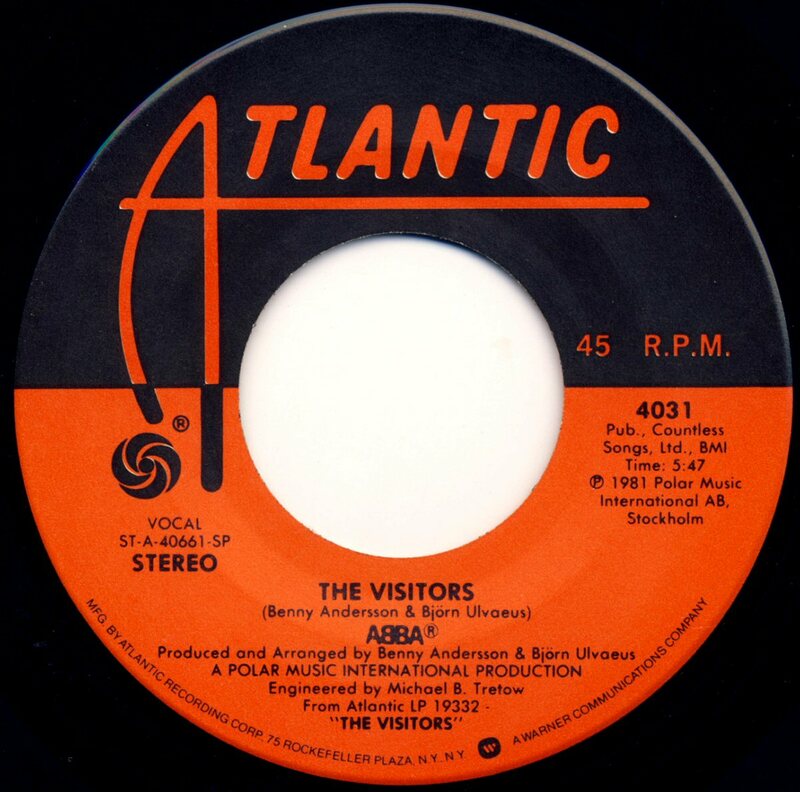 A special promotional maxi single featuring "When All Is Said and Done" and "The Visitors" was released at the beginning of 1982 by Atlantic in USA. 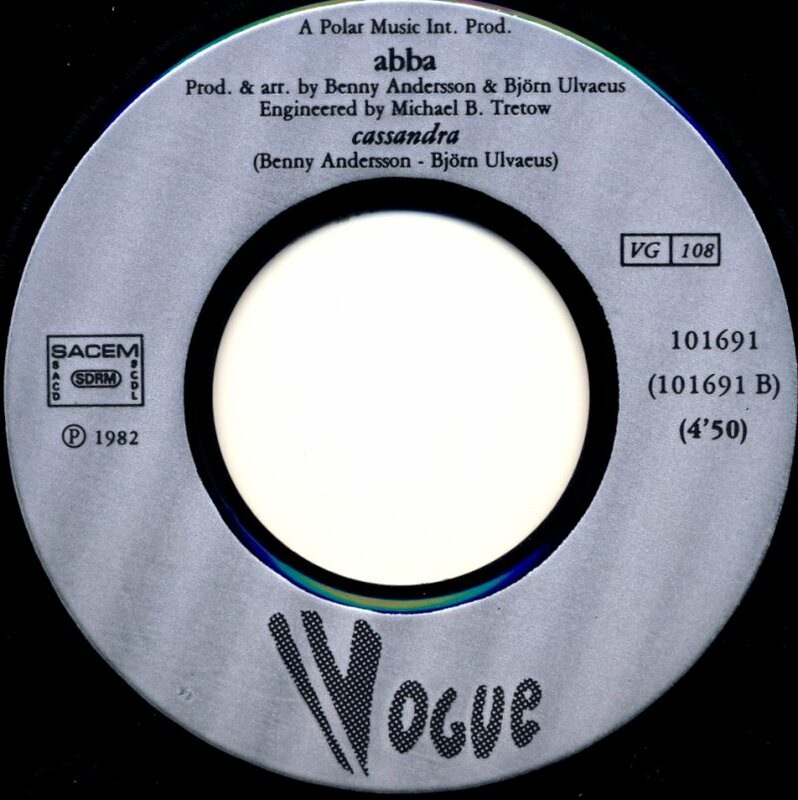 The versions on the maxi single were the same as on the LP. 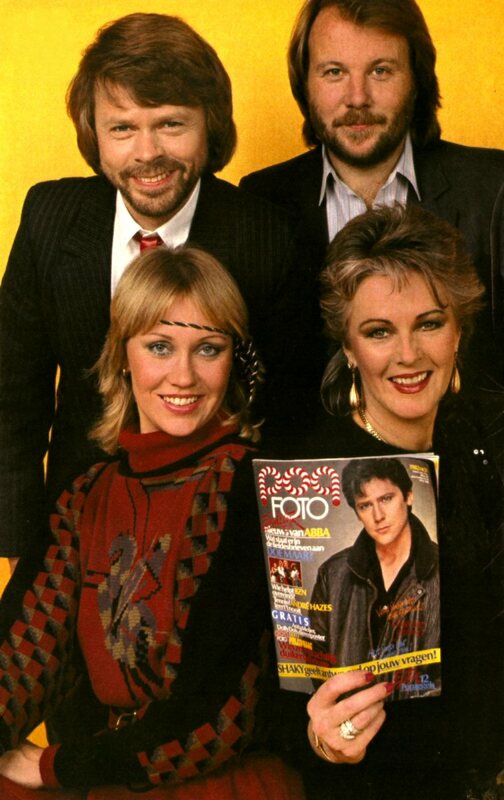 ABBA were featured on the cover of the Dutch pop calendar for 1982-83 issued by the music paper "Pop foto". 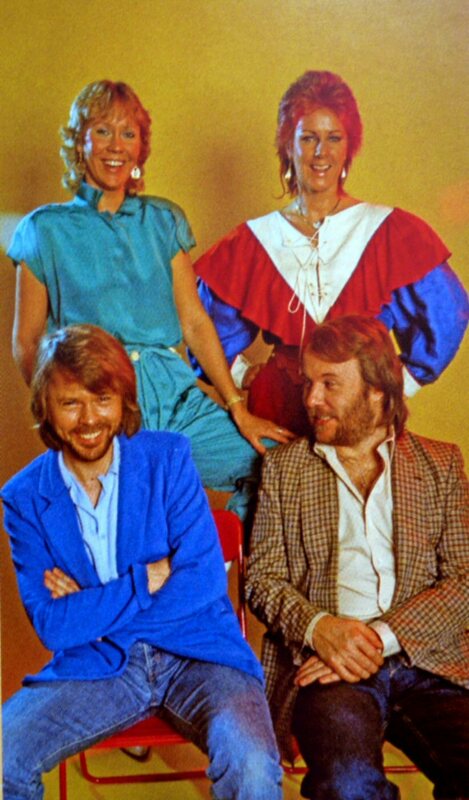 The British music magazine "Smash hits" published the ABBA diagram. 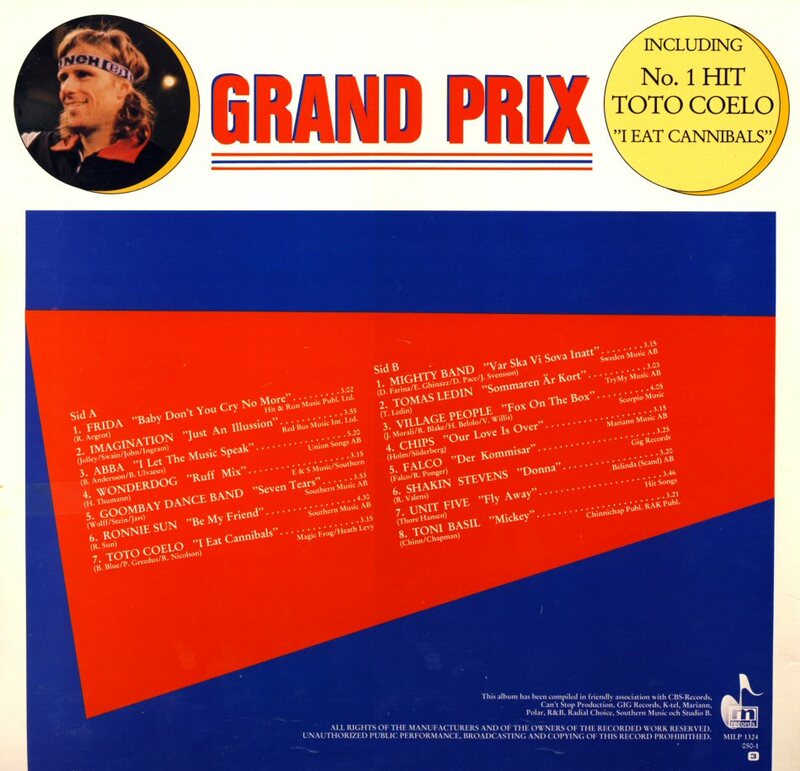 A new compilation album was released in France at the end of February 1982. 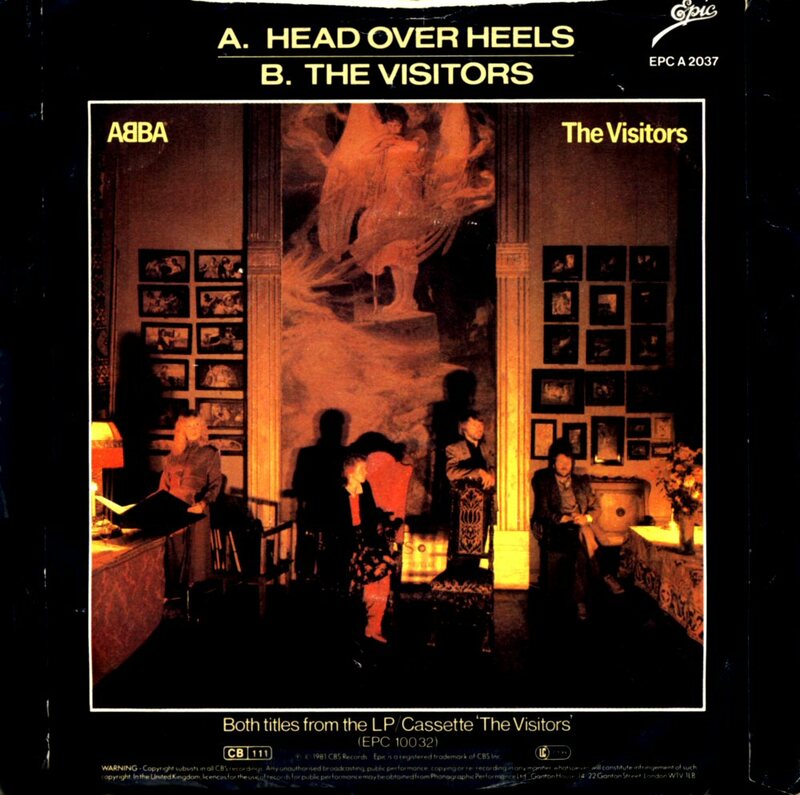 The LP contained 16 greatest hits from the period before "The Visitors". 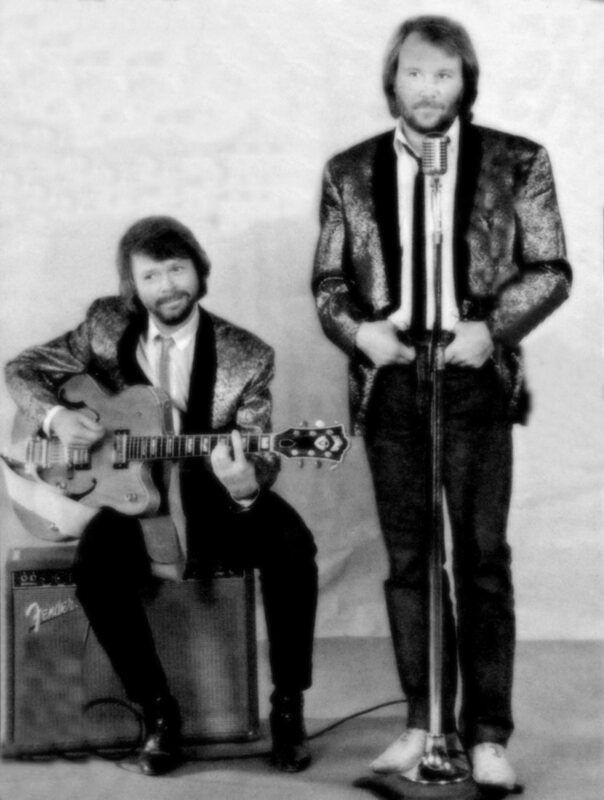 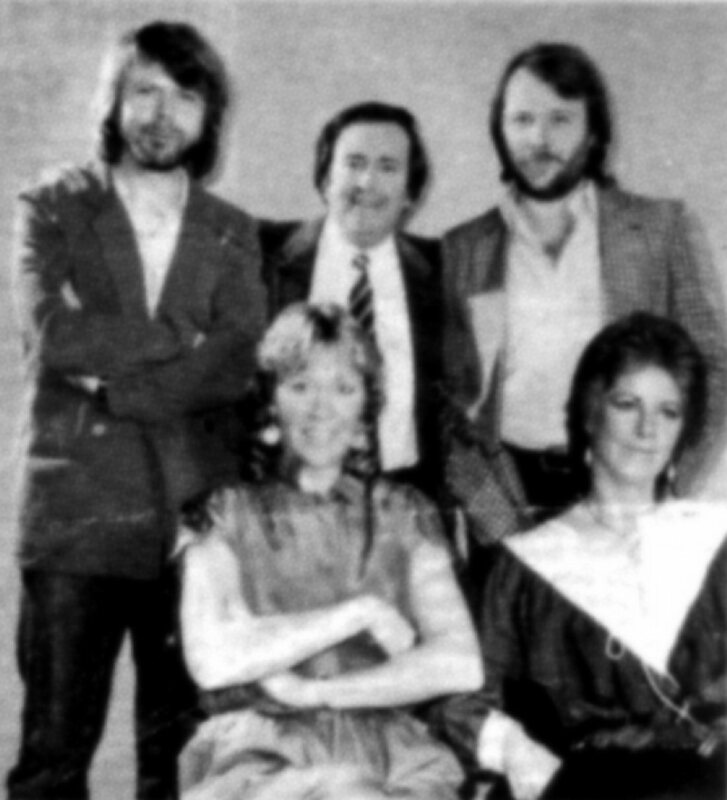 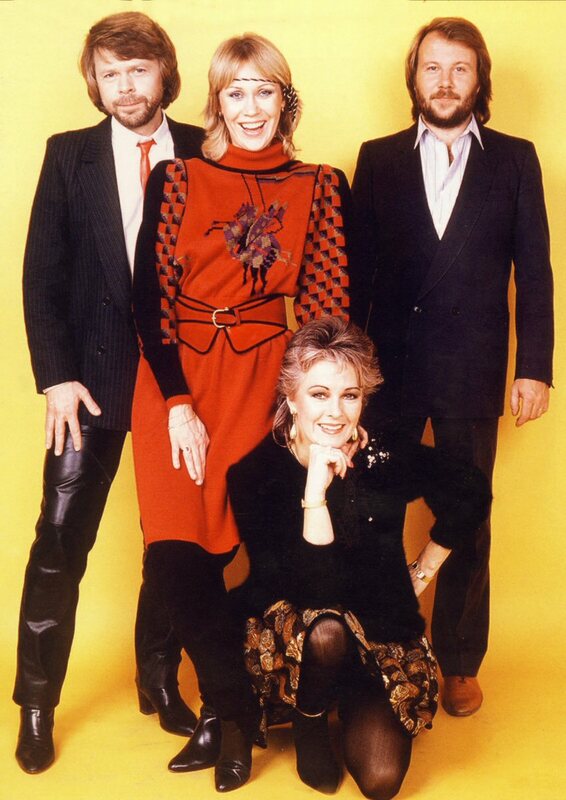 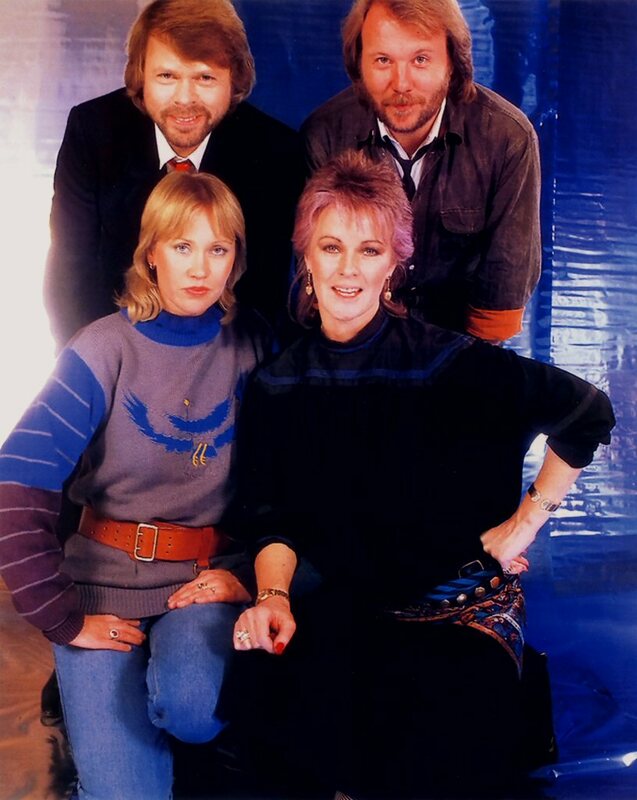 All four members appeared standing together for three very short clips which appeared in between the comedy sketches on The Kenny Everett Television Show aired in February. 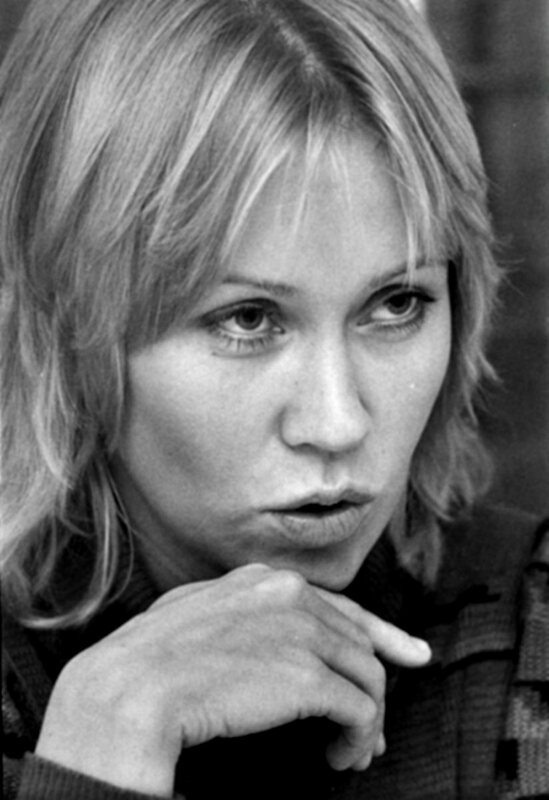 A tragic political occurance at the end of the year 1981 was the martial law which was introduced in Poland on December 13, 1981 because of a big threat of a possible military invasion from Soviet Union. 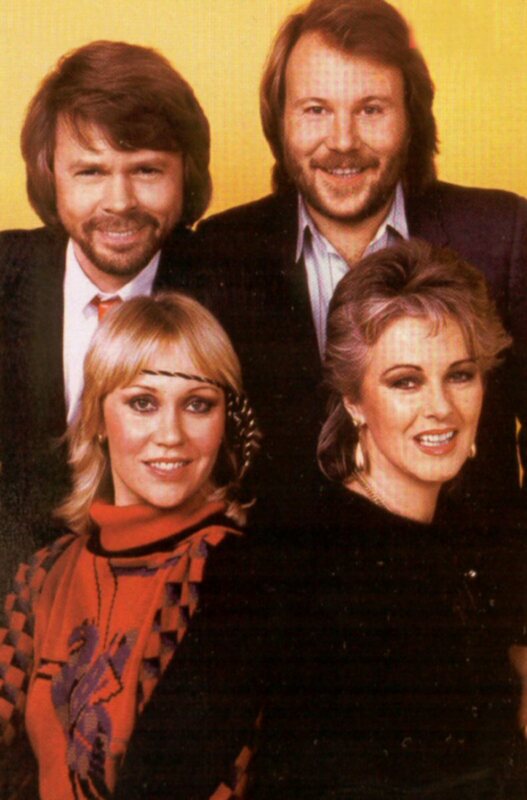 A big gala for Poland "Let Poland Be Poland" would be shown by leading TV stations in USA in March and ABBA were asked about a possible participation. 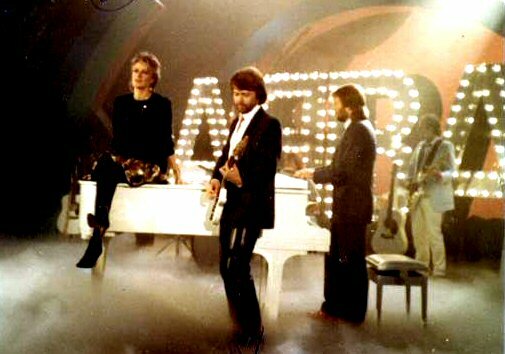 The group could not not participate but Björn and Benny recorded a message for the show which together with the video "When All Is Said And Done" was sent to USA. 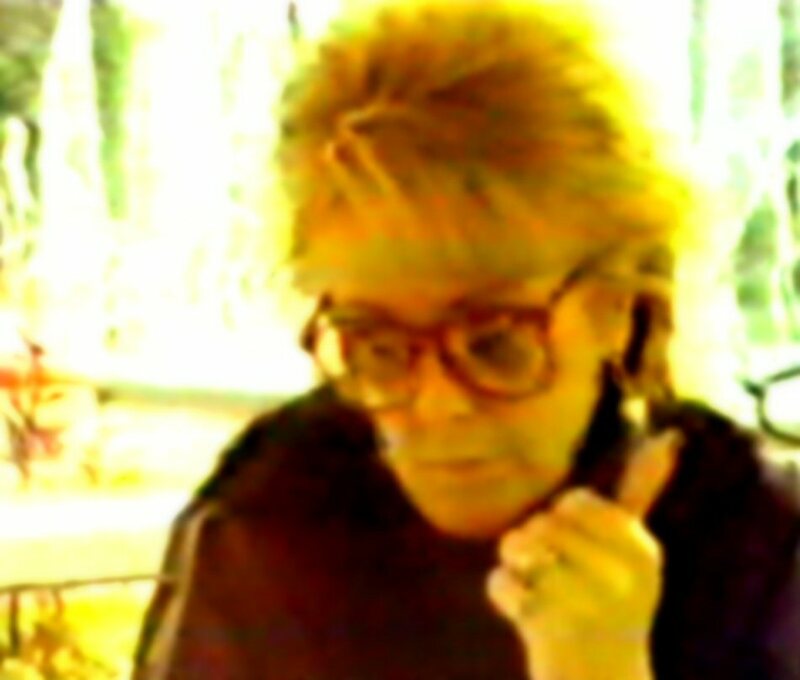 The message was never shown though. 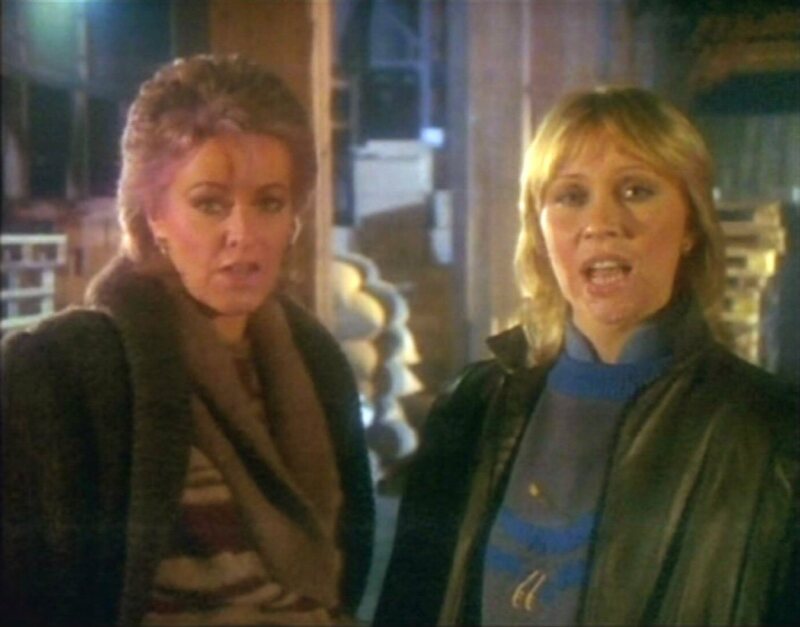 Benny: Our thoughts are in Poland. 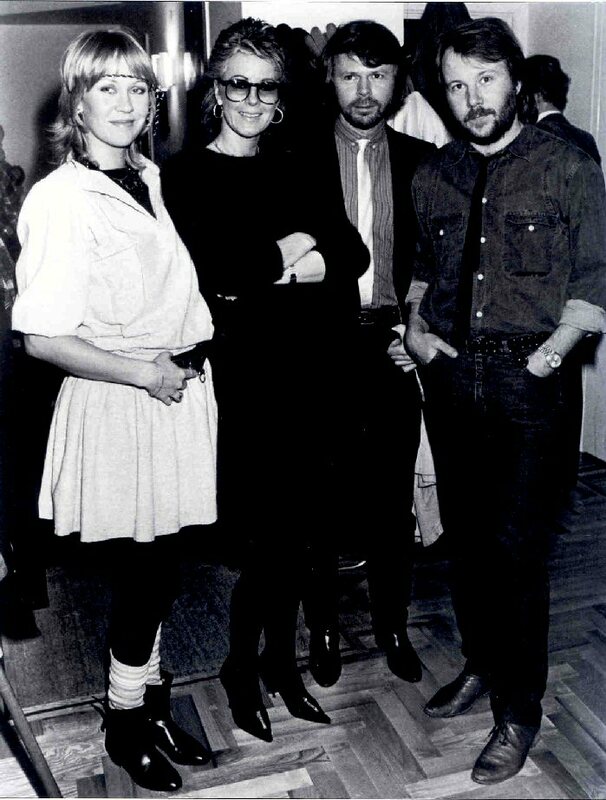 There are many galas all over the world this weekend in support of the Polish people. 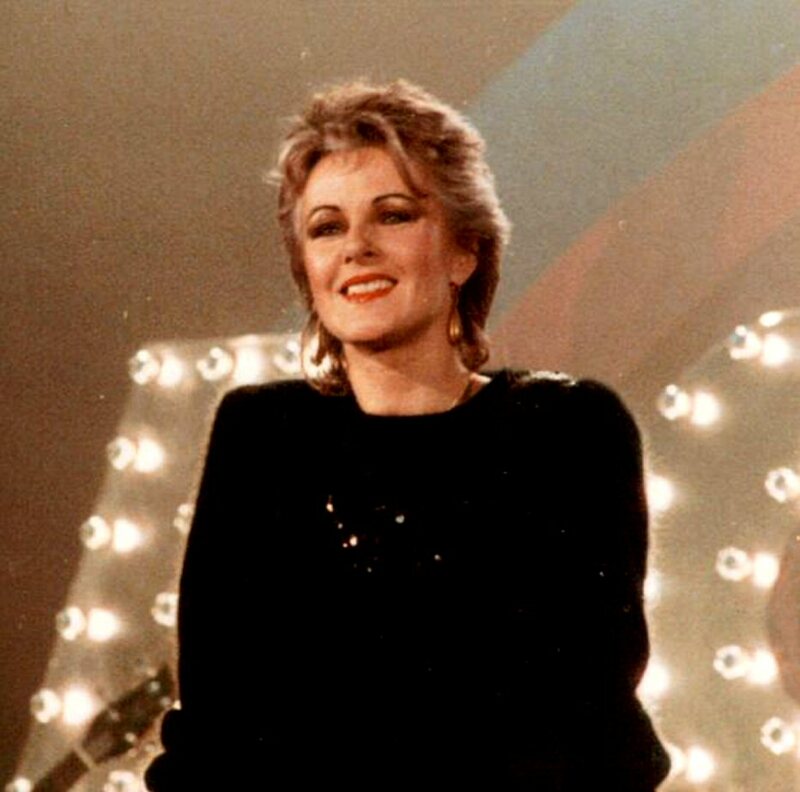 But I think that we should remind of that there are many countries around the world for example: Chile, El Salvador, Afghanistan and Iran where people cannot express themselves openly and freely like we are doing now. 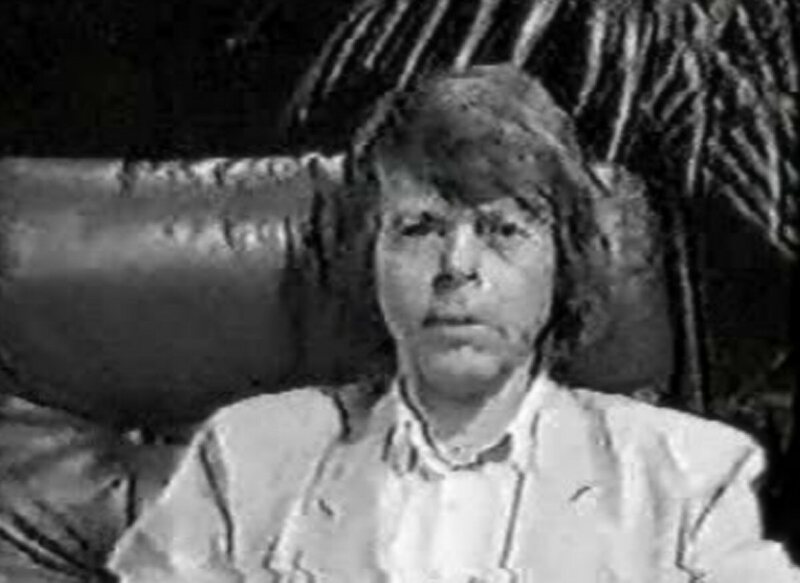 Björn: Human rights are things that we take for granted. 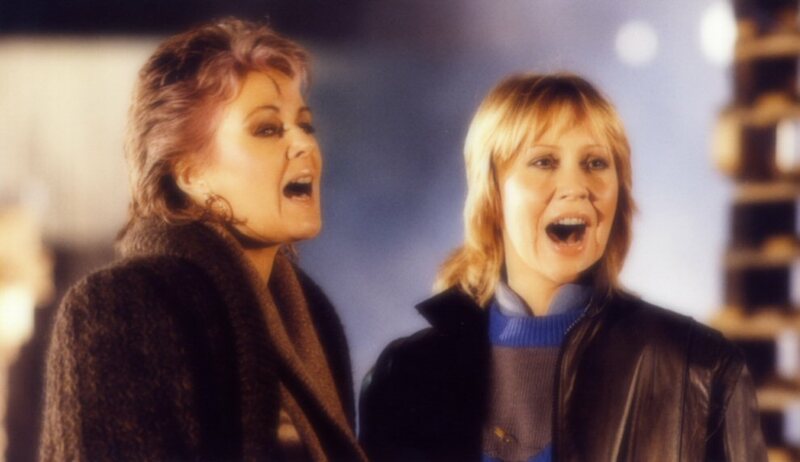 And yet we are surrounded by so many examples how easily they can be crashed. 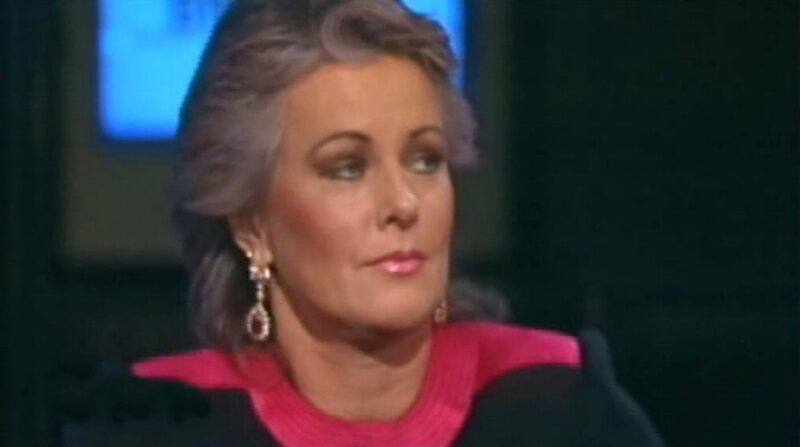 I hope that this show will be something to keep us watchful and let us understand how delicate and vulnerable democracy is. 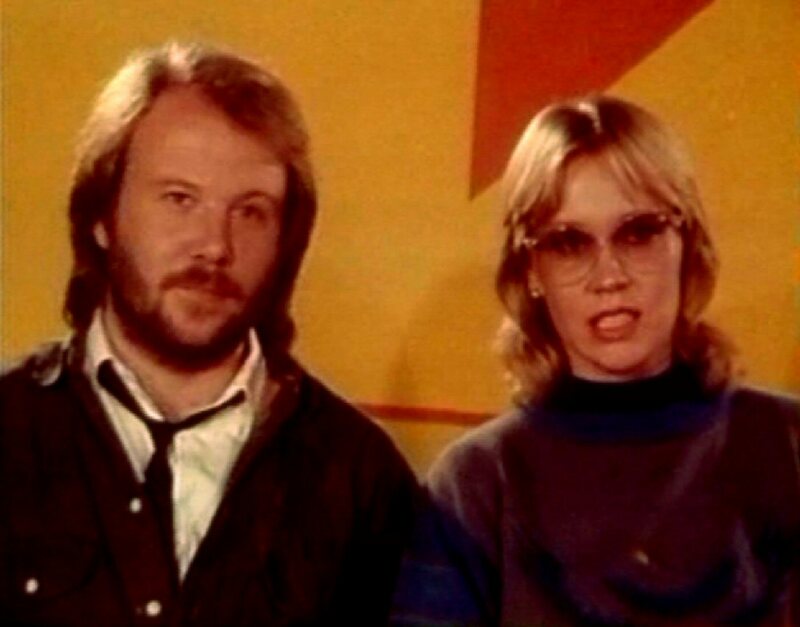 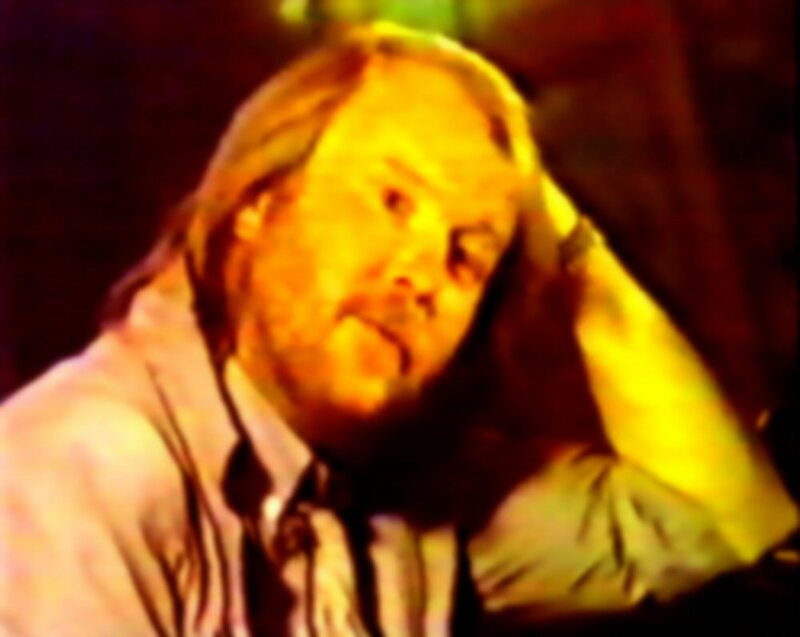 Swedish news programme "Aktuellt" made an interview with Björn in March after have received the message from USA that the film sent by ABBA had not been aired during the gala. 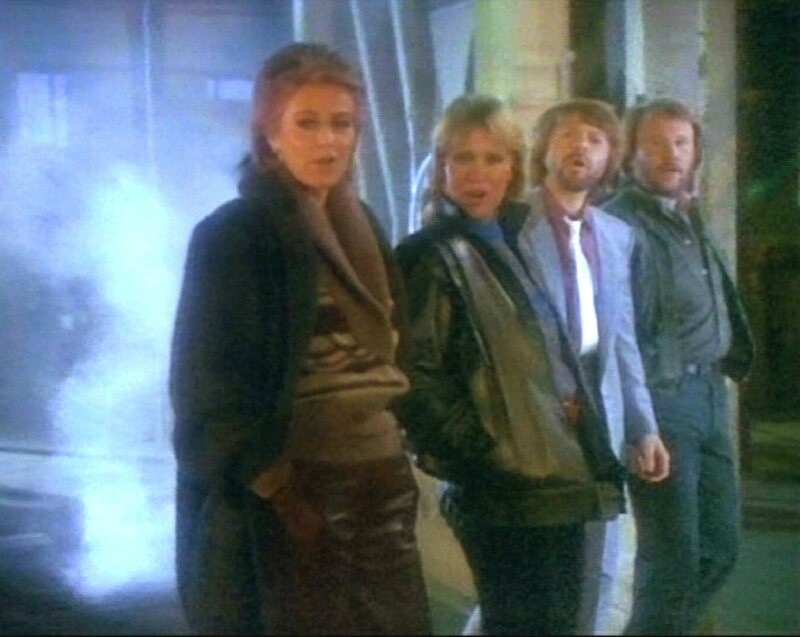 Of course everybody wanted to know what the problem was. 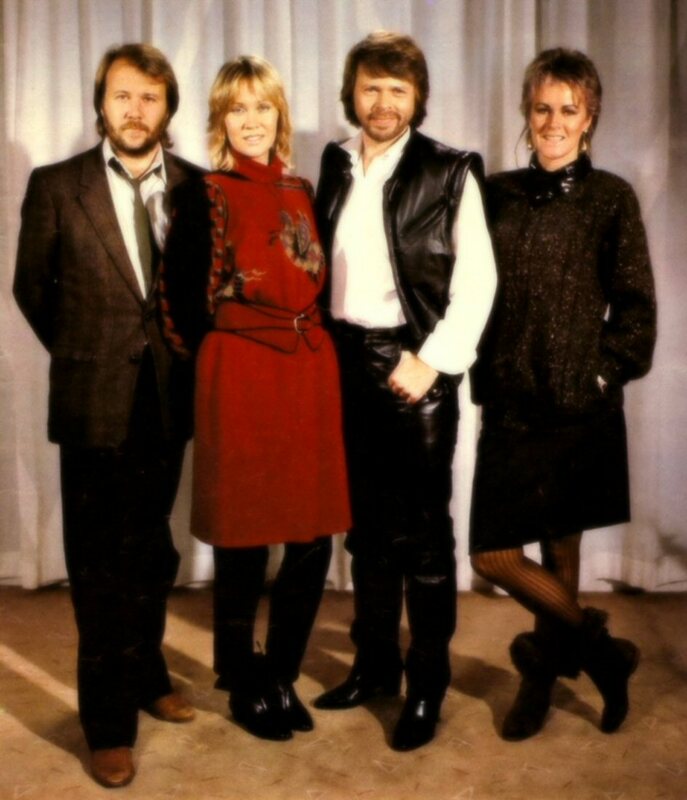 Björn assured that they stood for every word they said. 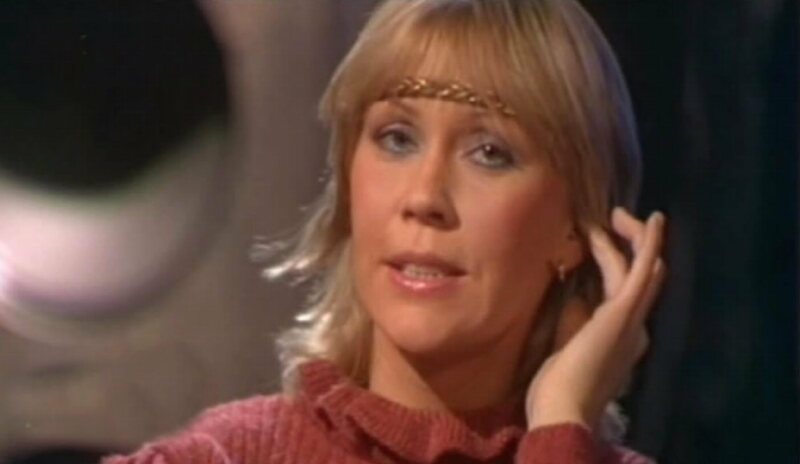 The message was shown on Swedish TV. 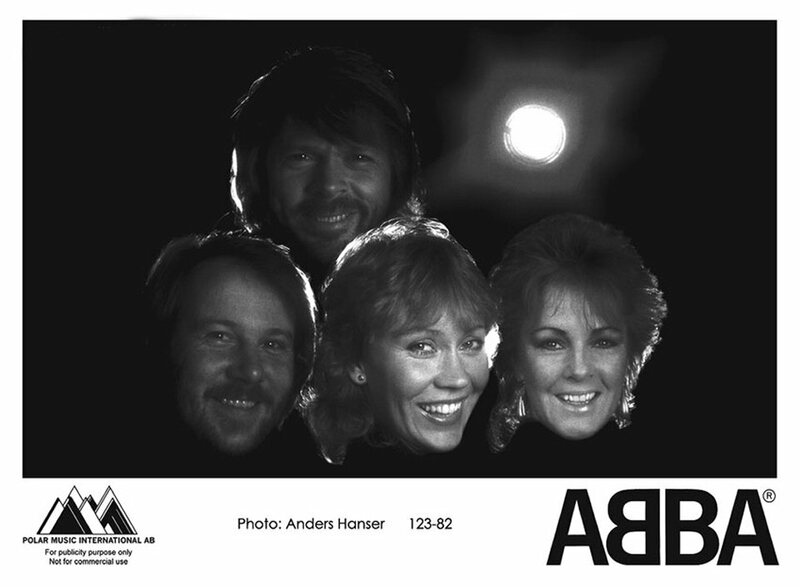 The Applauso TV team from Spain came to Stockholm in February and made a TV special with ABBA. 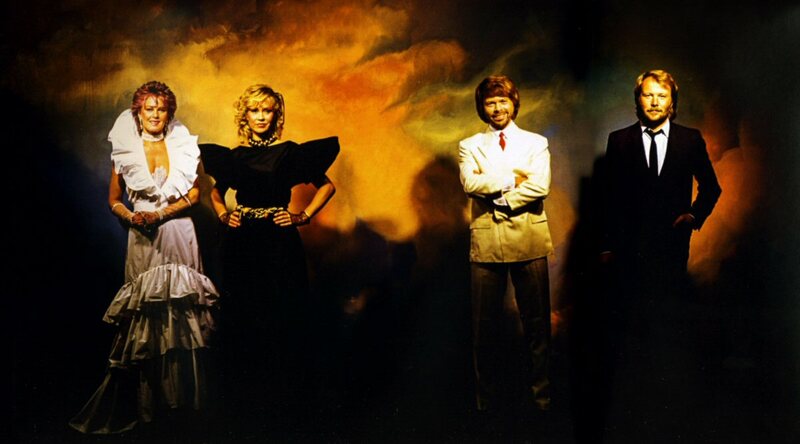 One of the rare photo sessions in 1982 taken at the same time as the Spanish TV interviewed the group. 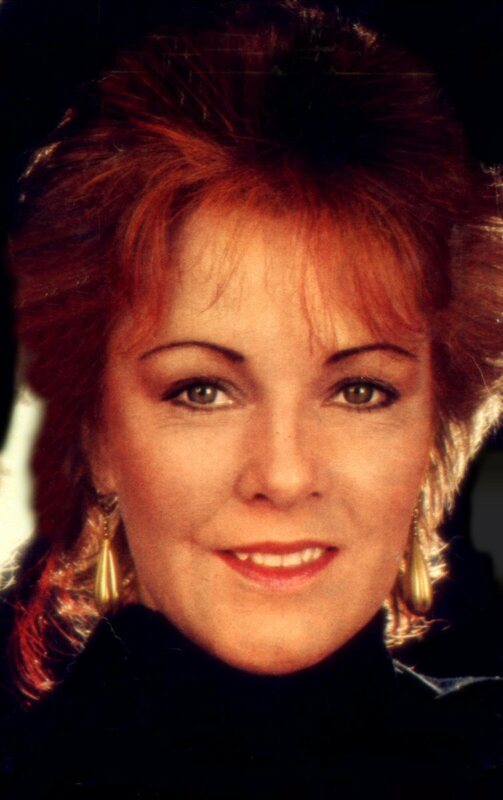 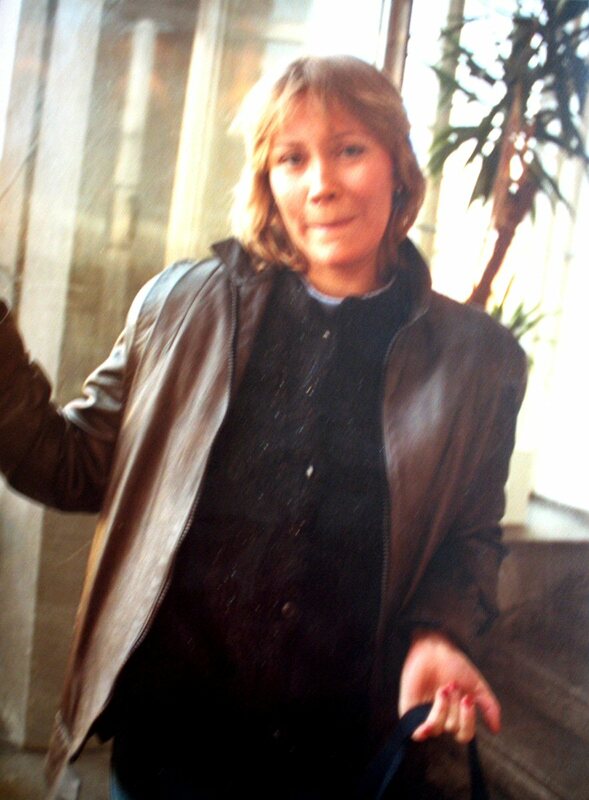 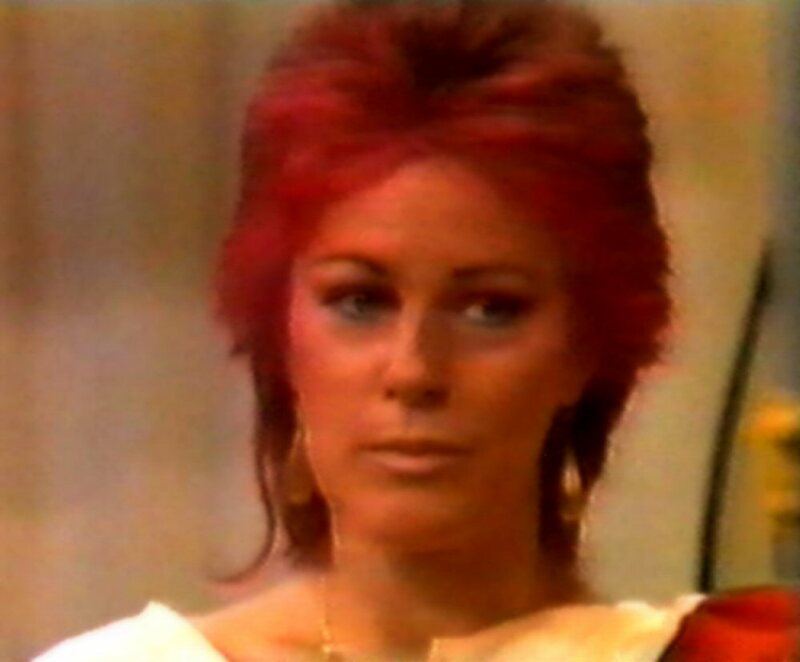 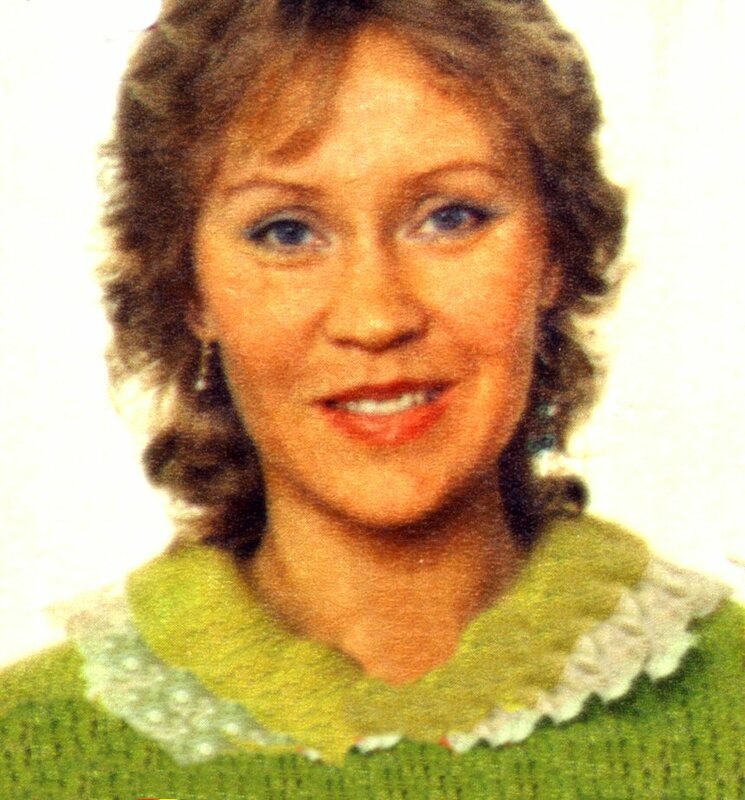 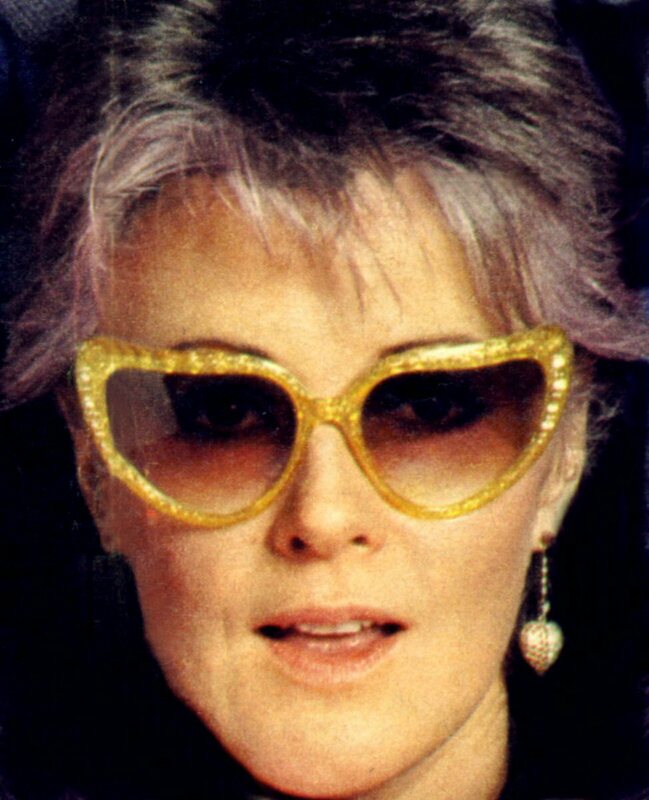 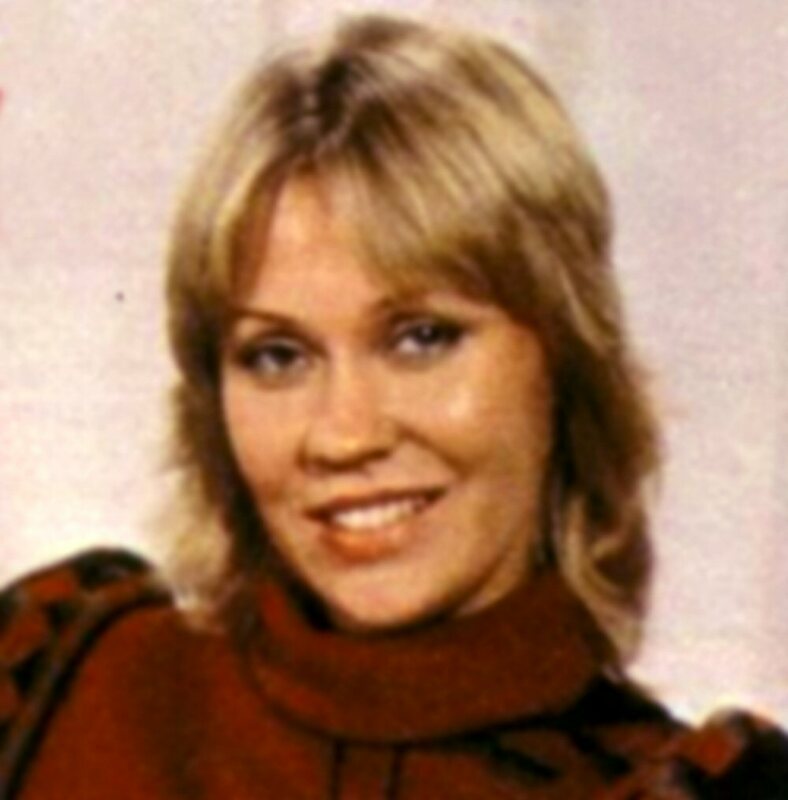 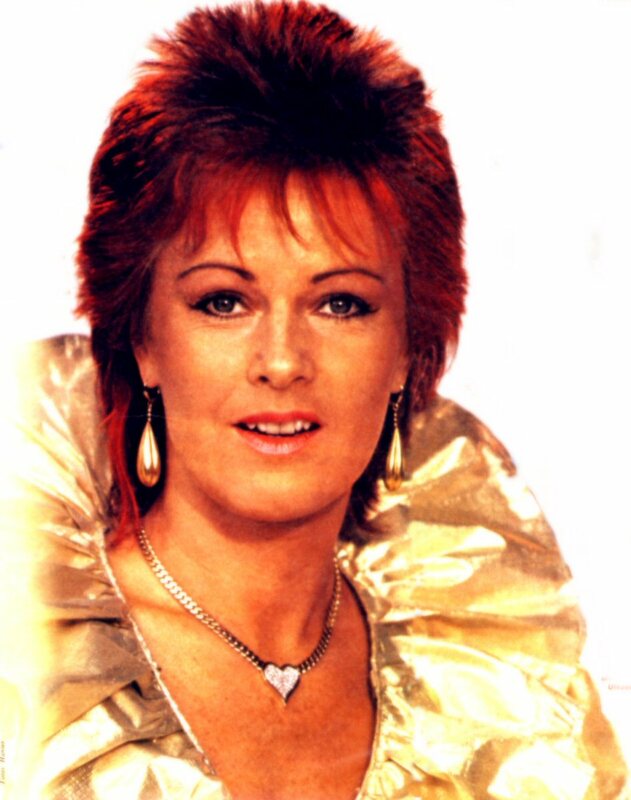 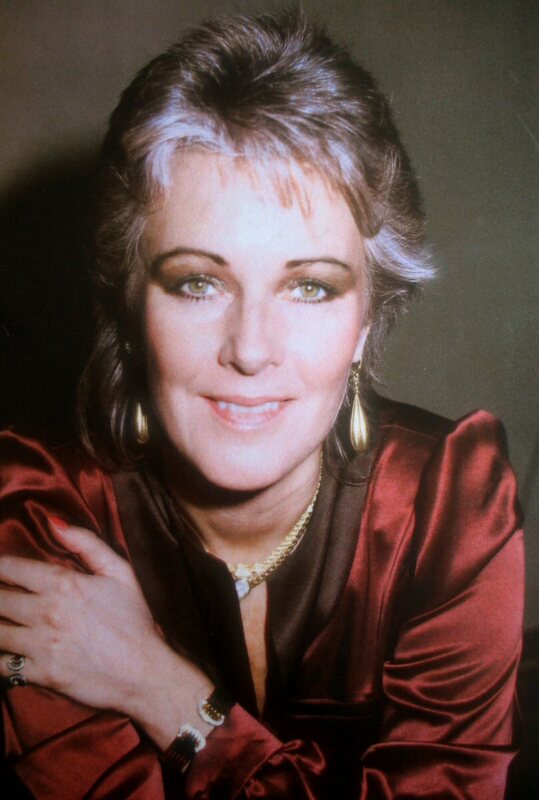 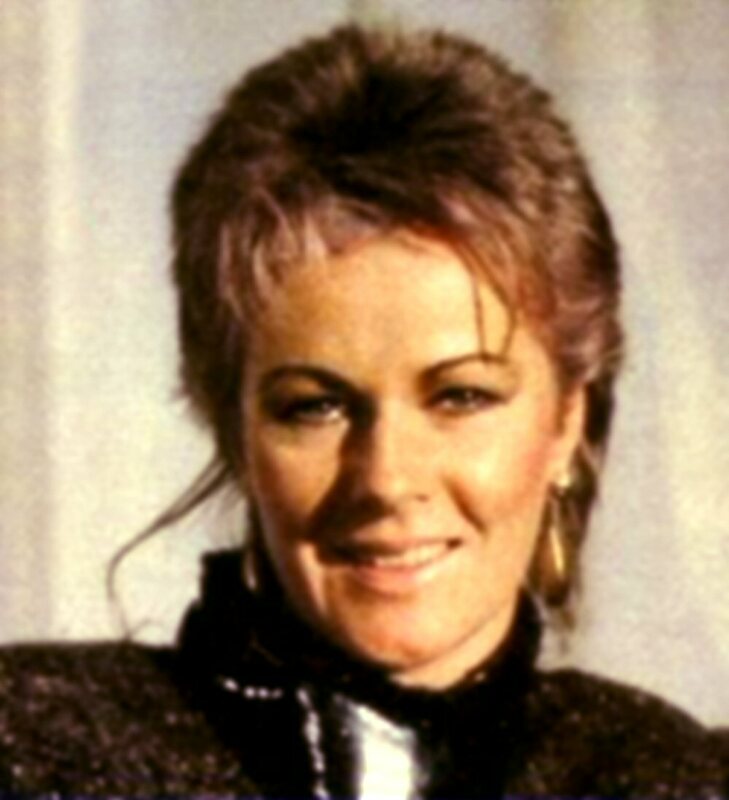 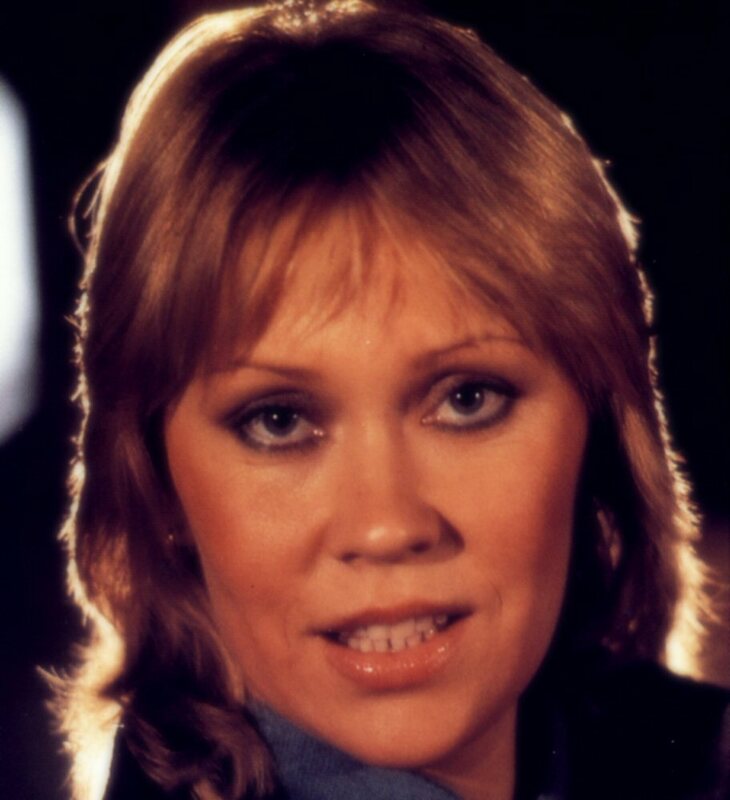 Agnetha cut her hair short and changed its colour as well. 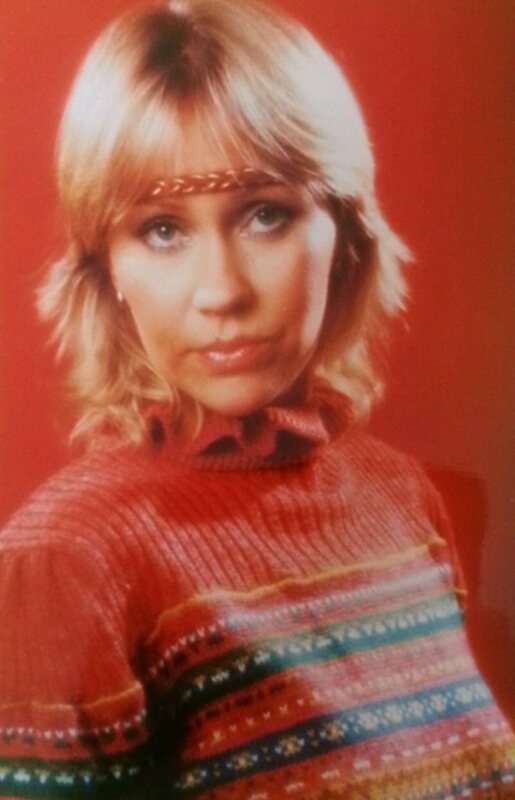 It was probably the most radical hair-do change for Agnetha during all ABBA time. 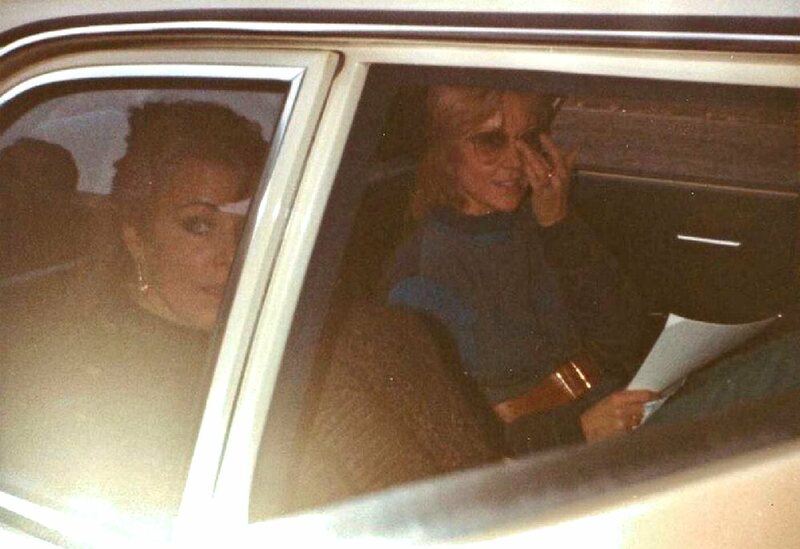 She went back to more usual blonde style a couple of months later. 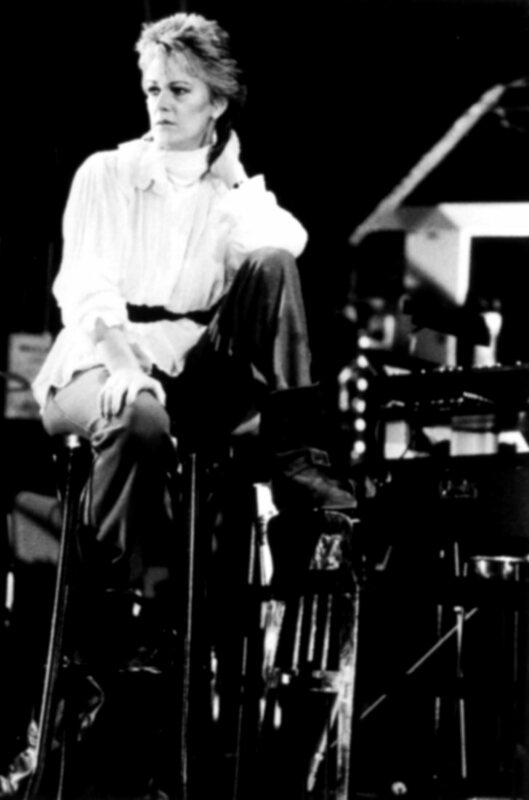 In February and March Frida was recording her first solo album in English with Phil Collins as a producer. 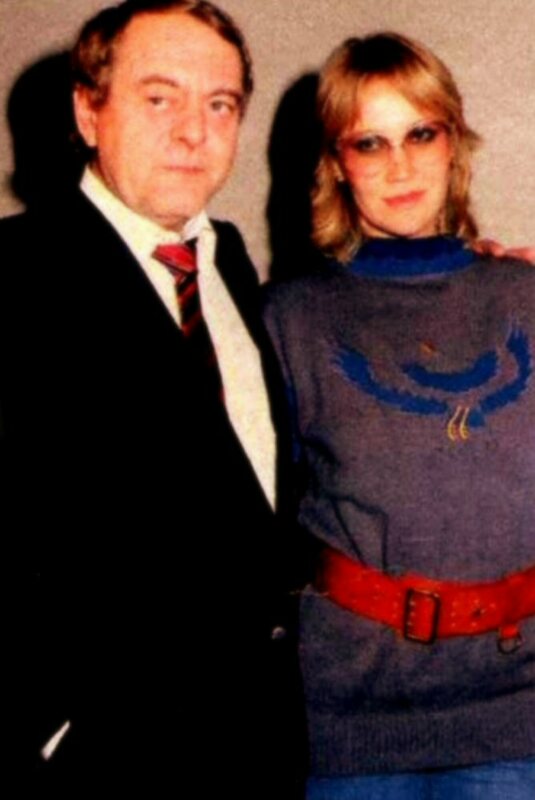 Björn & Lena's daughter Emma was born on January 10, 1982 but first in July 82 the Swedish press obtained this rare photo of Björn and Emma taken on Hornsgatan-street in Stockholm. 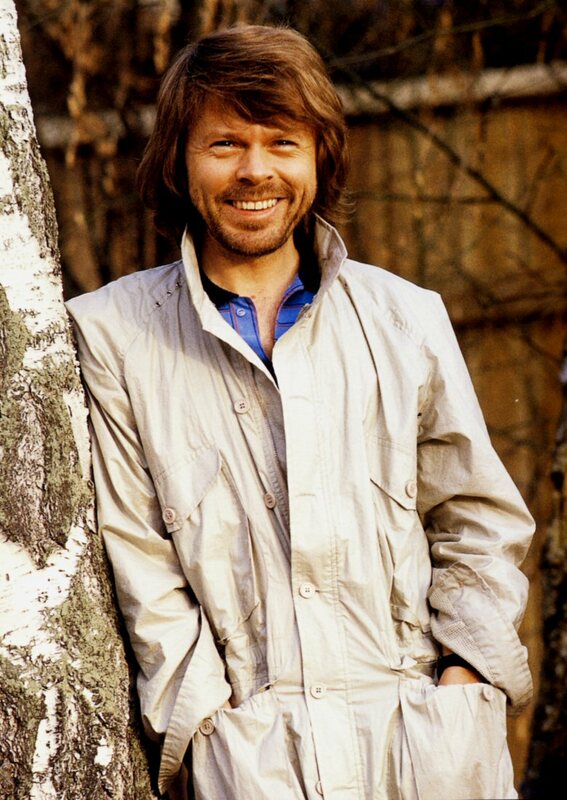 Björn and Benny started new recording sessions. 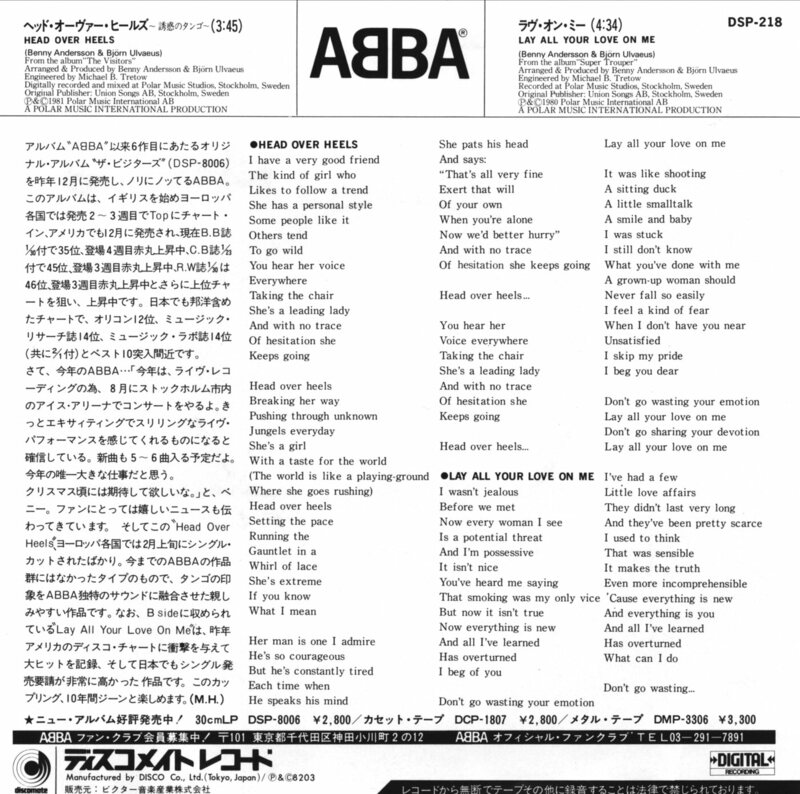 This time it was extremely hard to create something new. 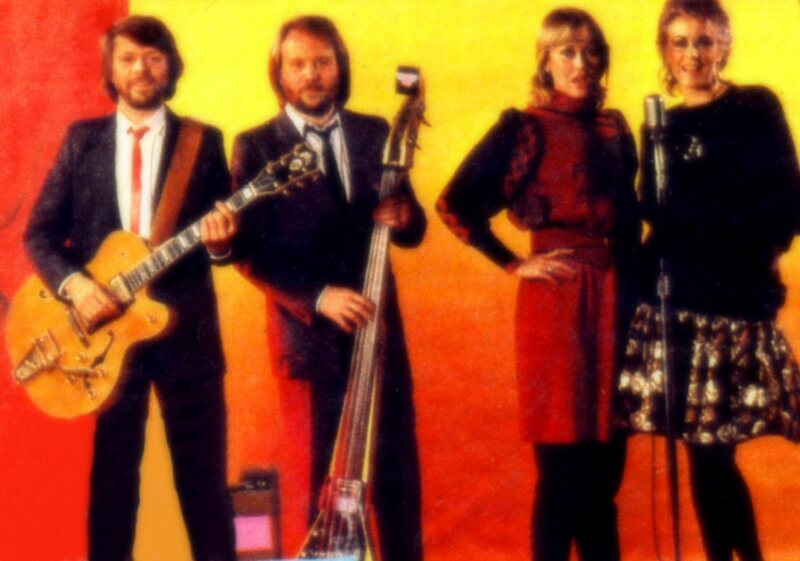 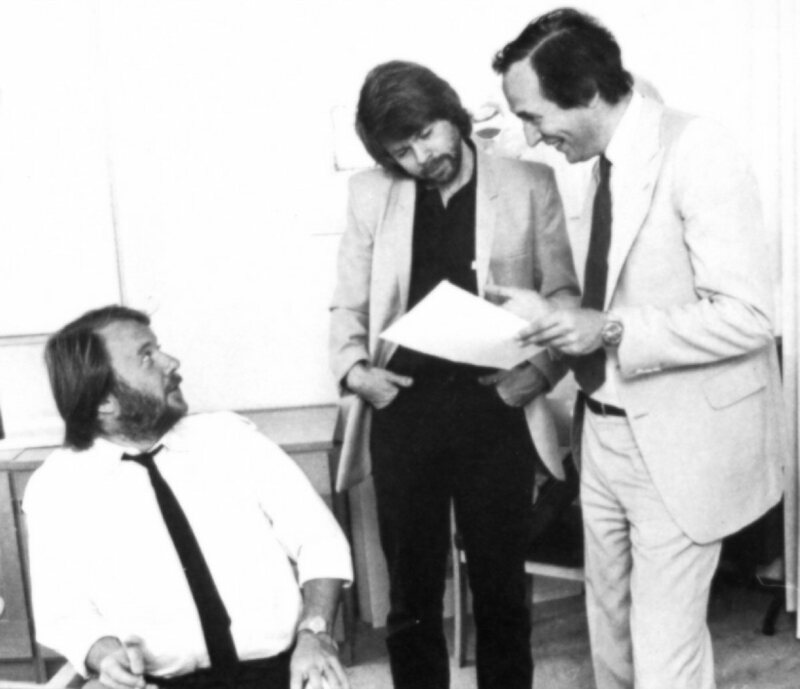 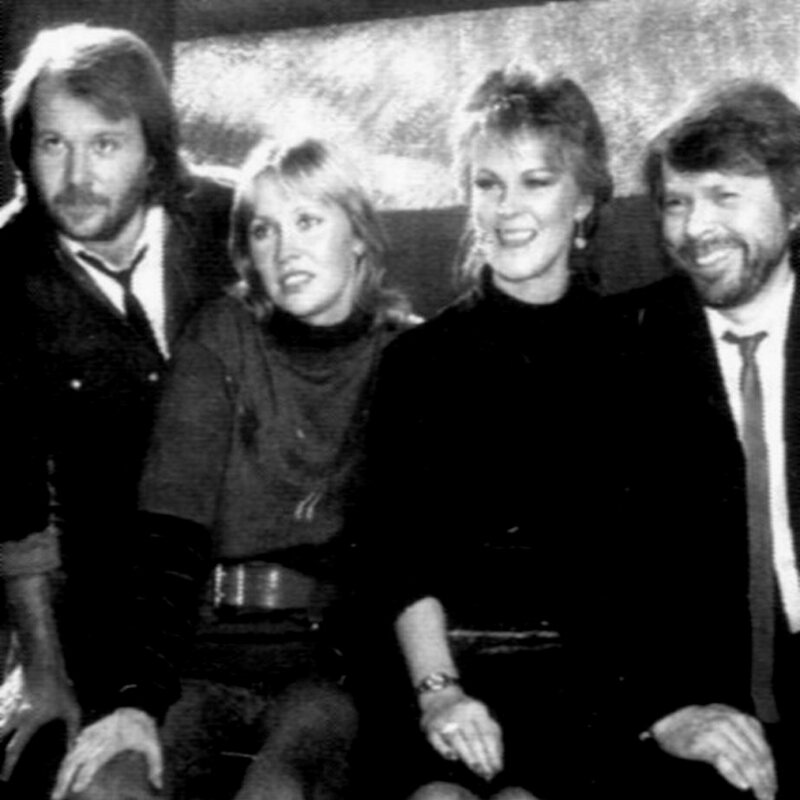 The first songs recorded were mostly weak compositions: "You Owe Me One", "Just Like That" (unreleased) and "I Am The City" (released for the first time in 1993 on "More ABBA Gold"). 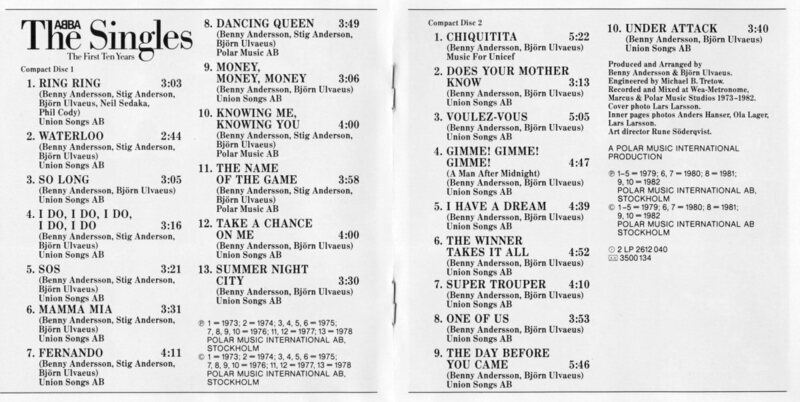 Generally the songs were not good at all according to Björn and Benny. 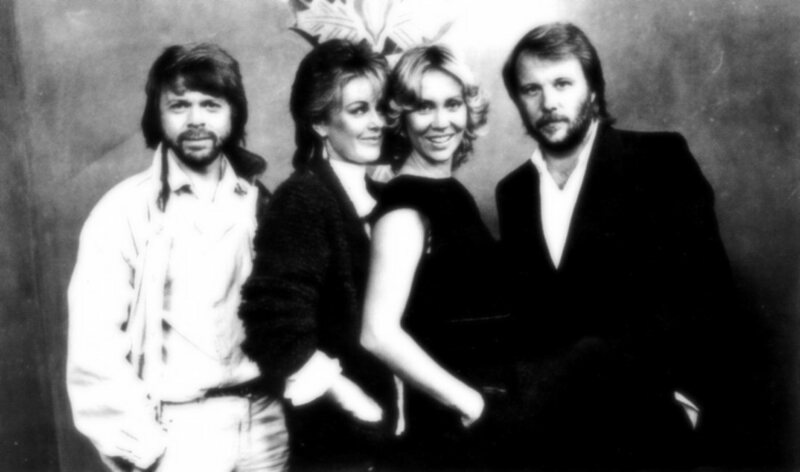 The last ABBA recording sessions took place in August when the group recorded "Under Attack", "Cassandra" and finally the brilliant song "The Day Before You Came". 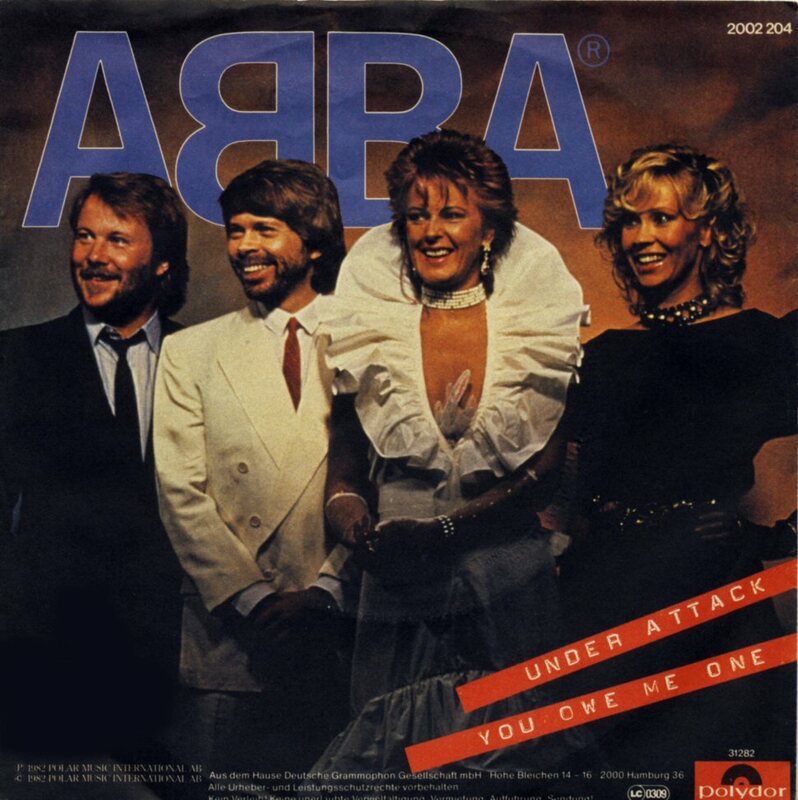 On 13 August 1982 the British record company Epic released a cassette single with four songs: Super Trouper, The Winner Takes It All, One of Us and Lay All Your Love On Me. 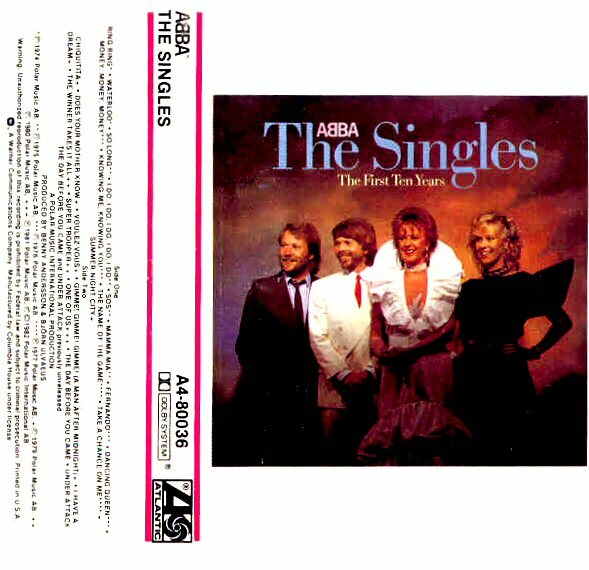 This strange release had to do with launching a new format - cassette single but it never became successful in Great Britain and this attempt was soon forgoten. 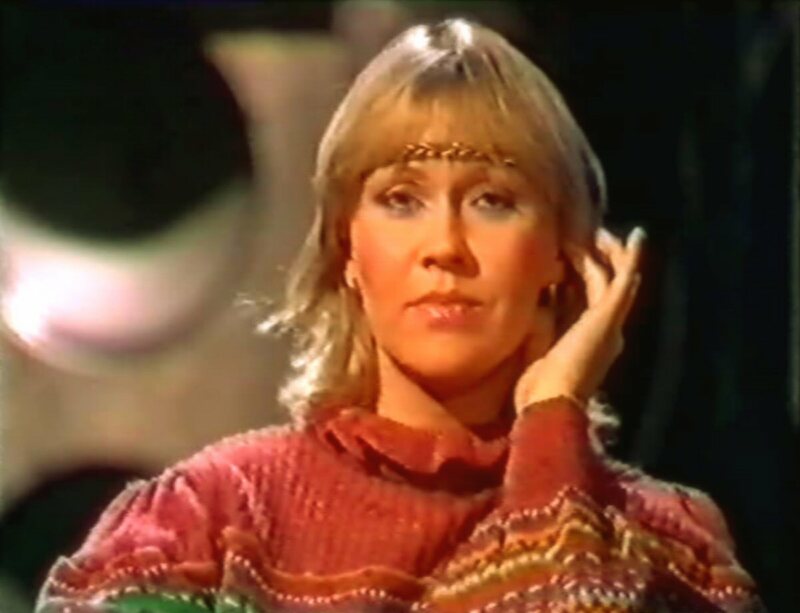 It was time for Agnetha to do some solo projects as well. 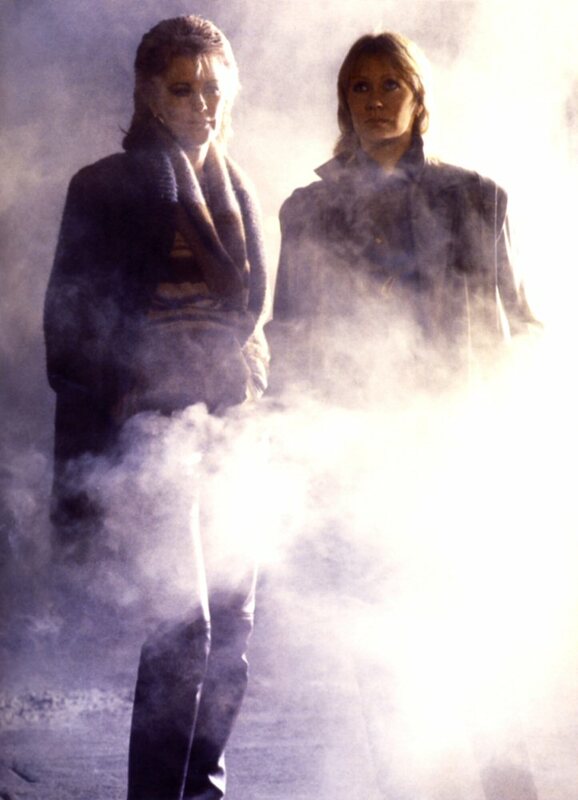 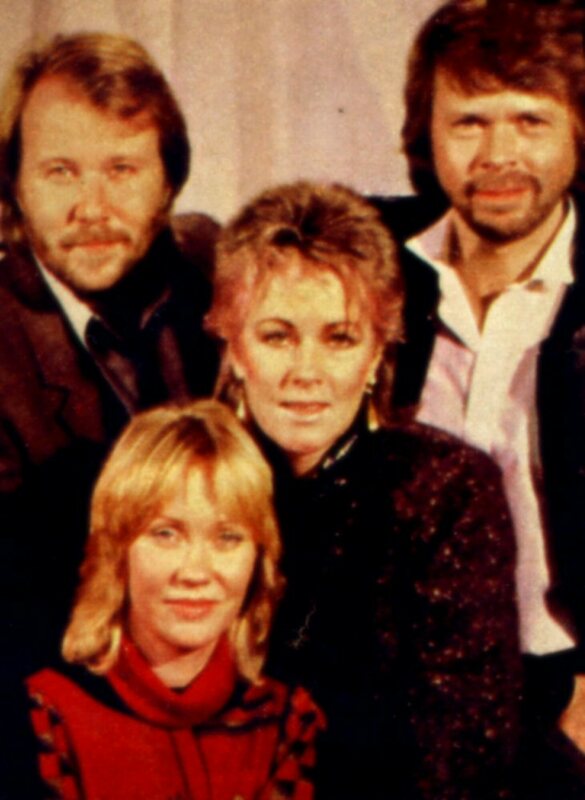 The first one was a duet with Tomas Ledin "Never Again" and the second one was a big role in a Swedish film "Raskenstam" directed by Gunnar Hellström. 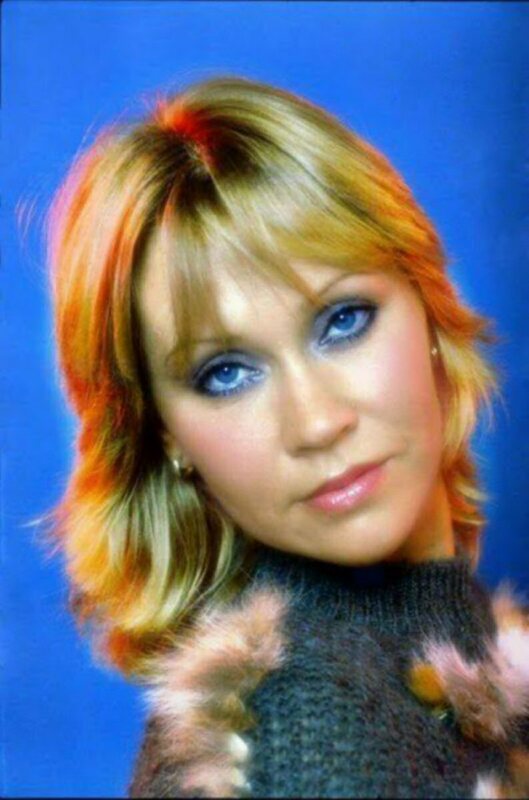 go.to/Agnetha Never Again or Raskenstam for more info. 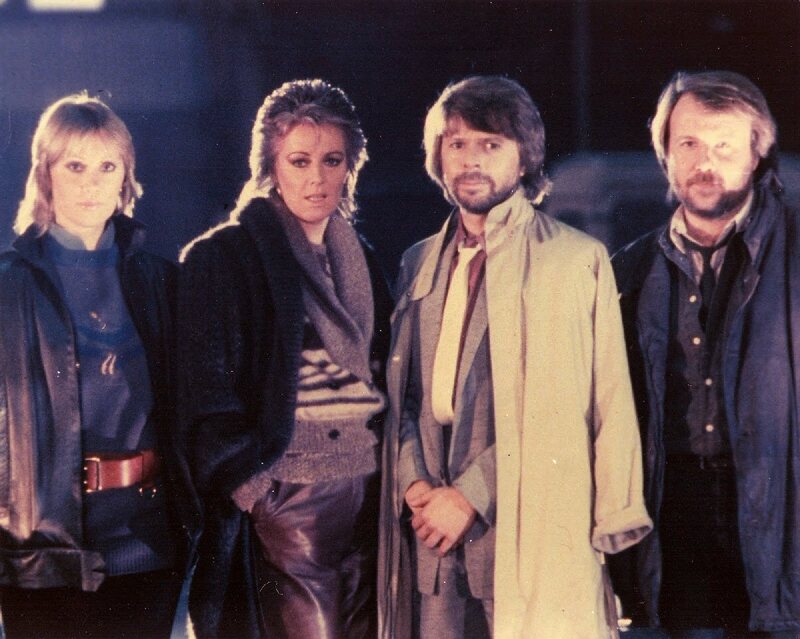 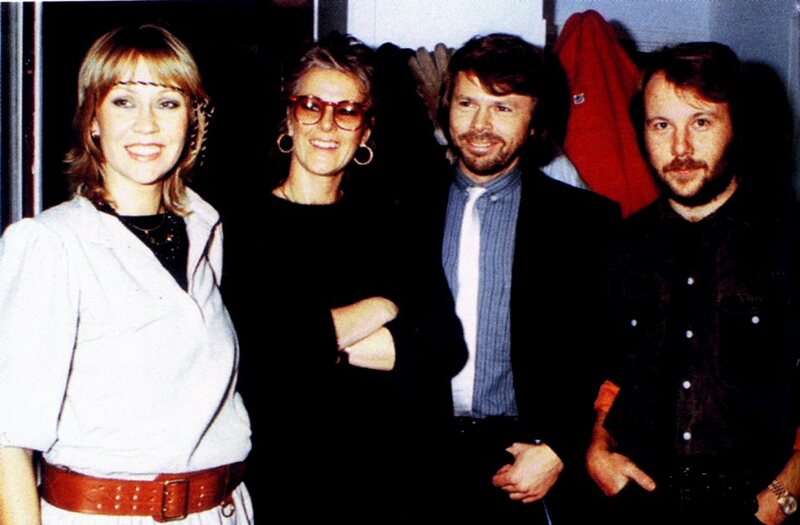 In the summer the US TV team came to Stockholm and recorded interviews with Agnetha, Frida, Benny and Stikkan for the forthcoming special "Freeze frame". 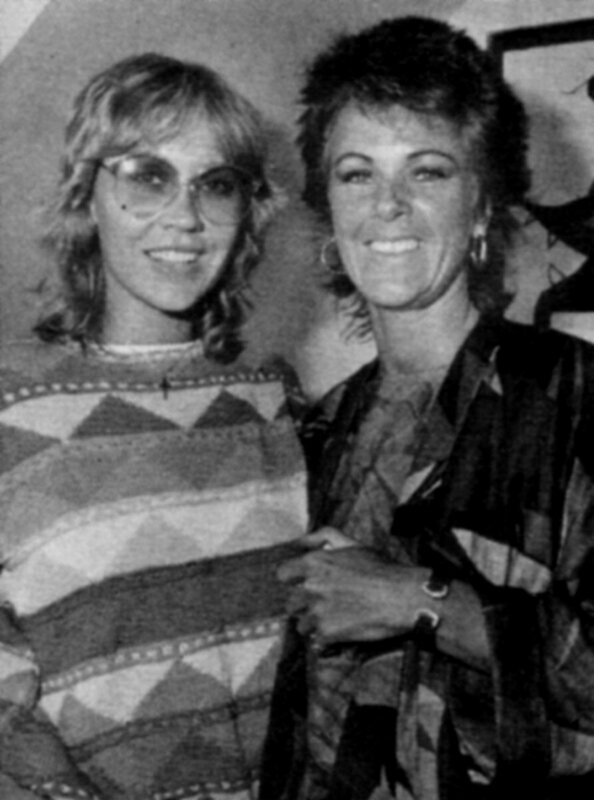 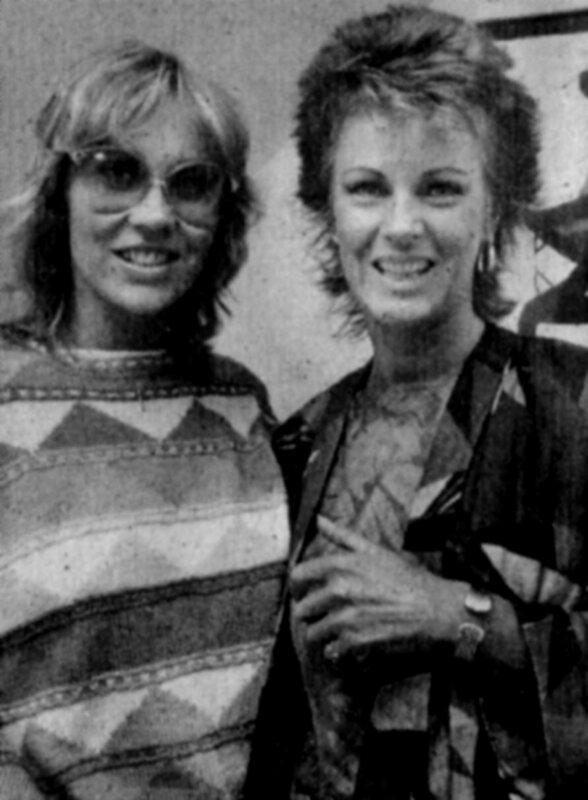 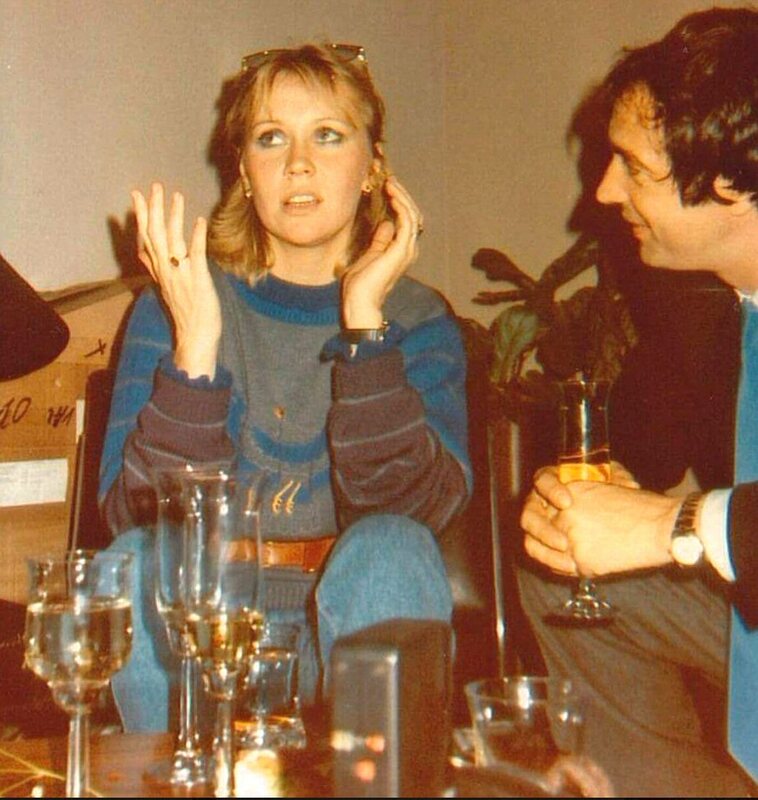 Both Agnetha and Frida were talking about their solo projects, Stikkan about ABBA and Benny about music. 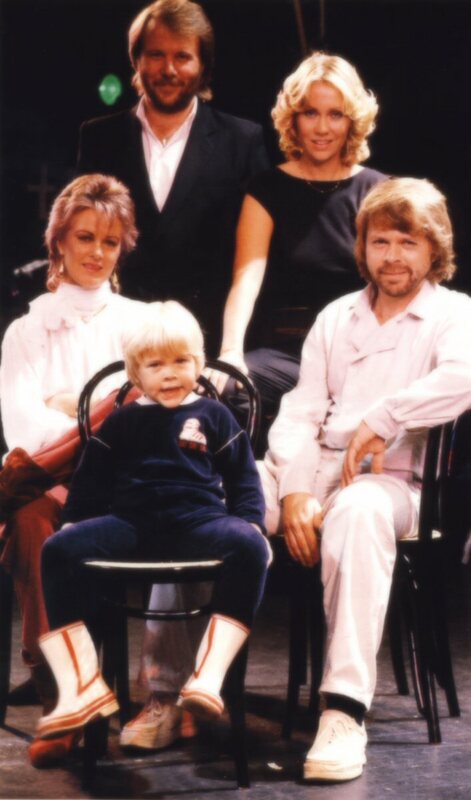 Björn did not appear in the show. 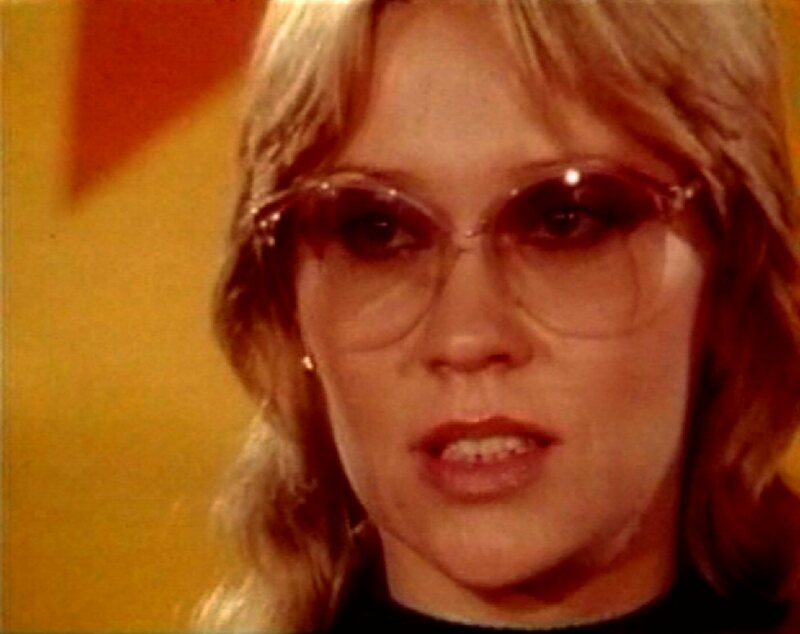 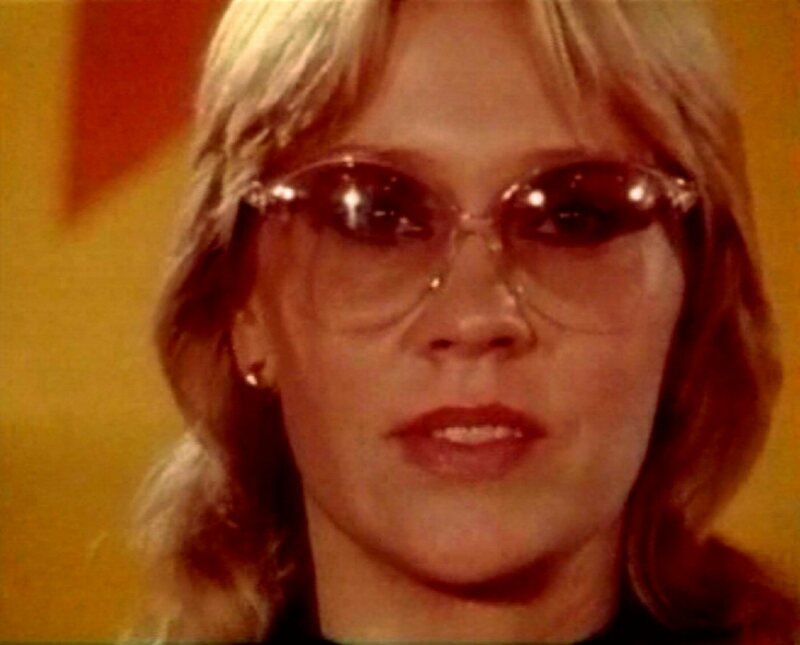 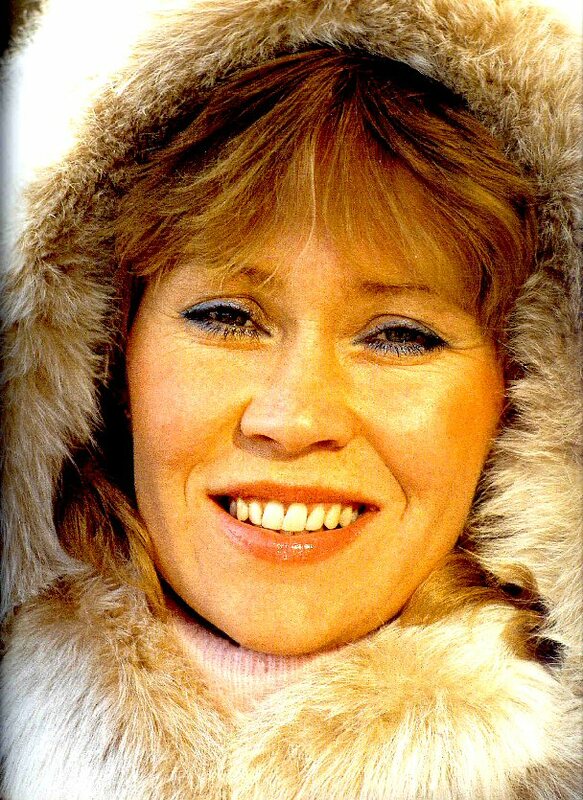 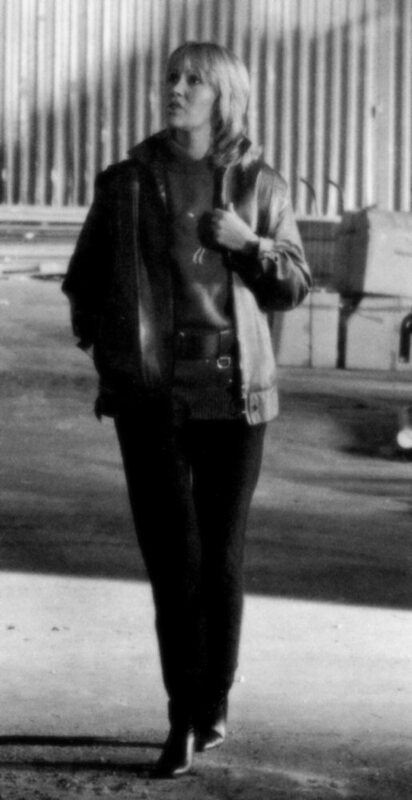 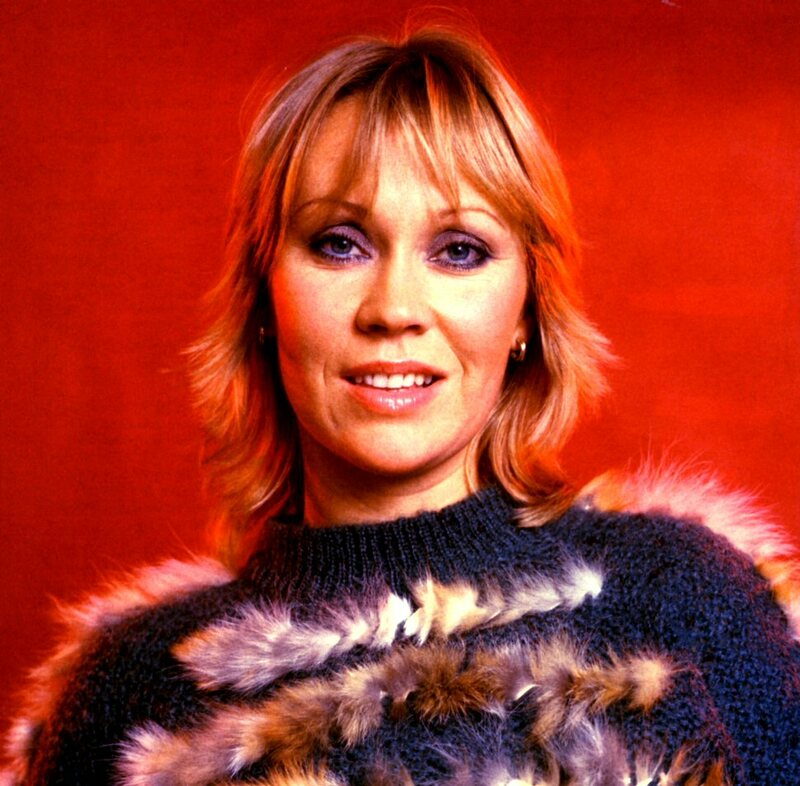 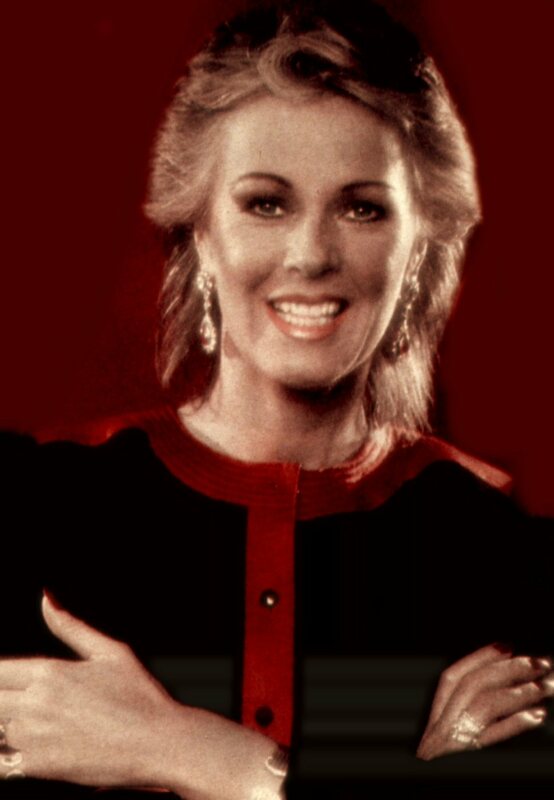 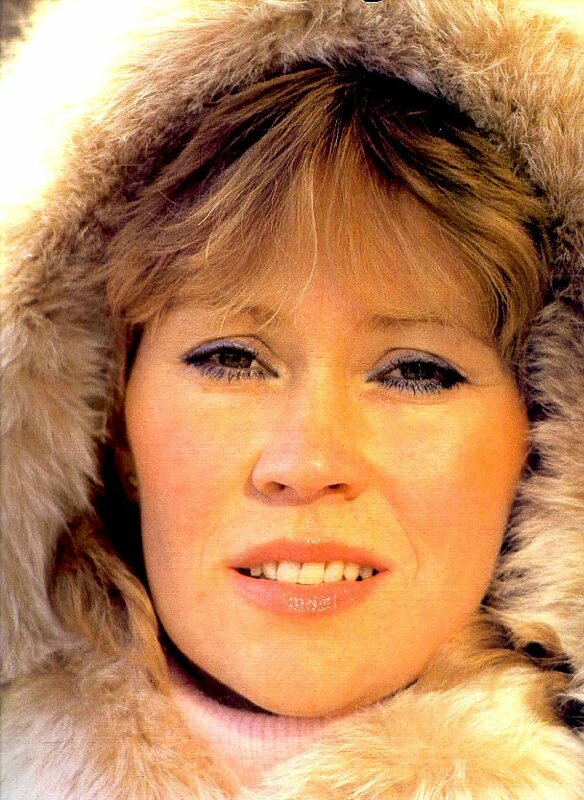 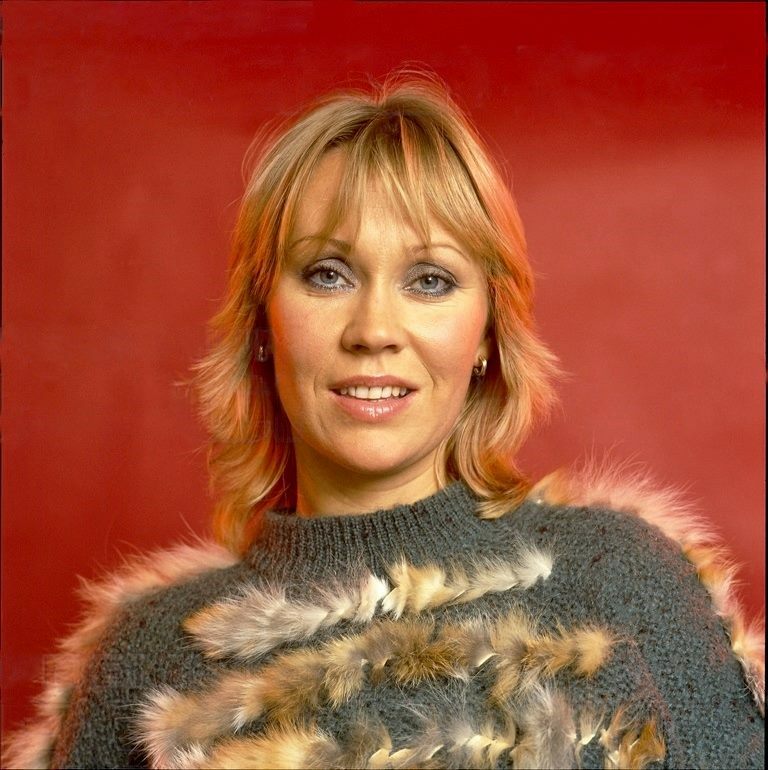 Agnetha was interviewed in Stockholm on the island Skeppsbron, Frida in the city center in Kungsträdgården, Stikkan at the office in Hamngatan 11 and Benny in the Polar Studios. 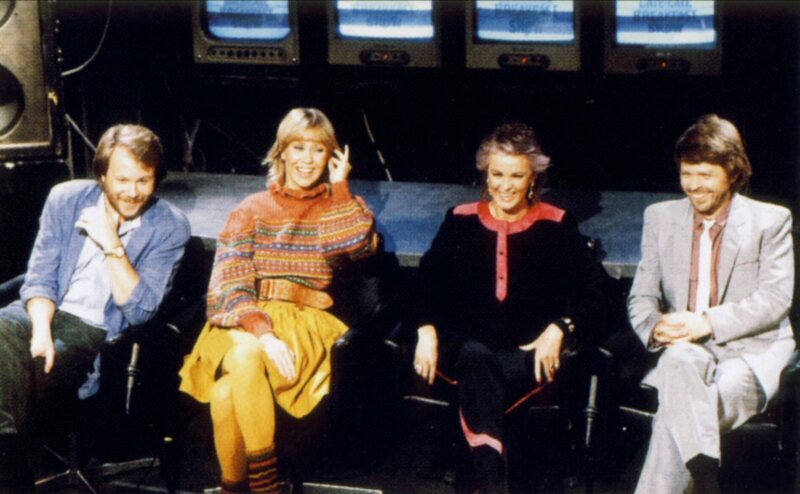 The show was aired in 1983. 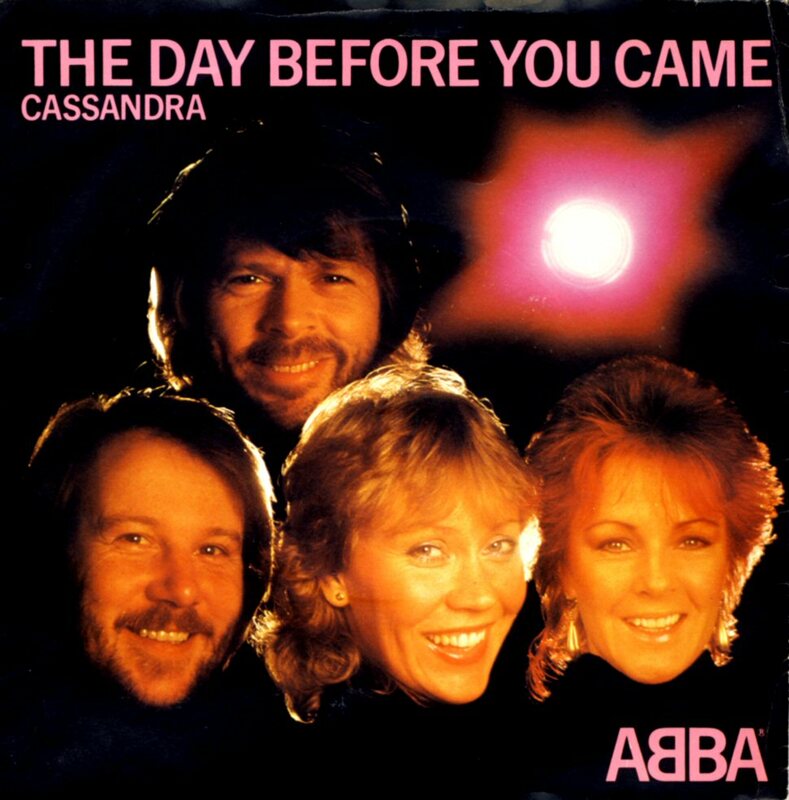 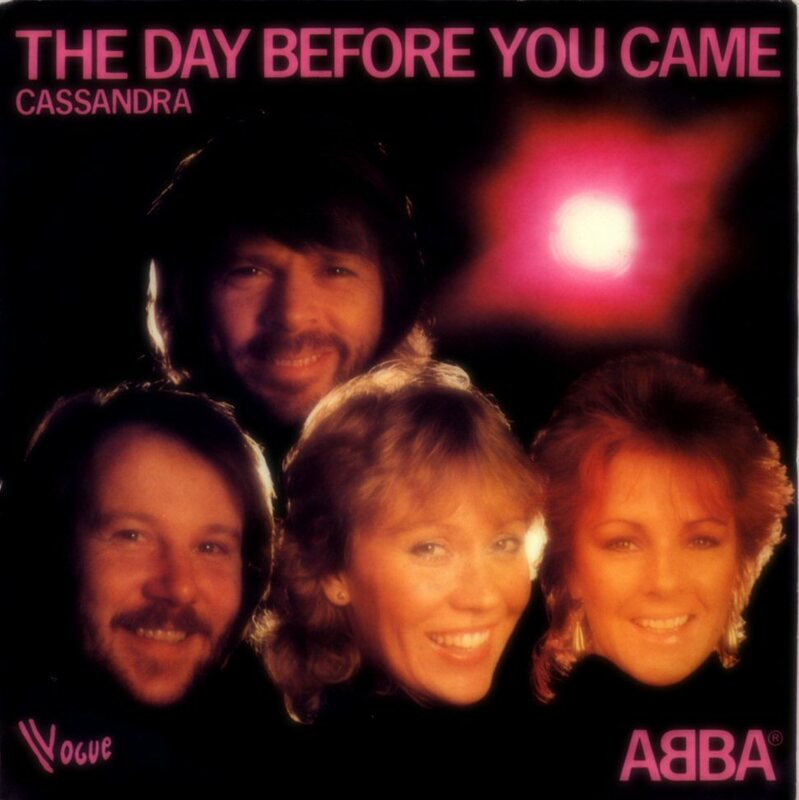 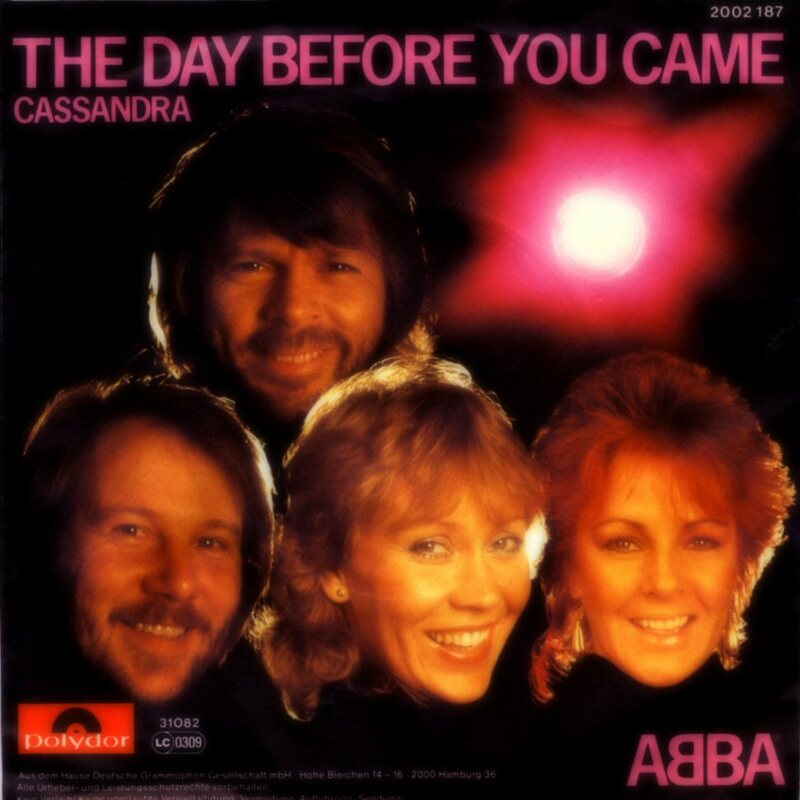 The single "The Day Before You Came" b/w "Cassandra" was released on 8 October 1982. 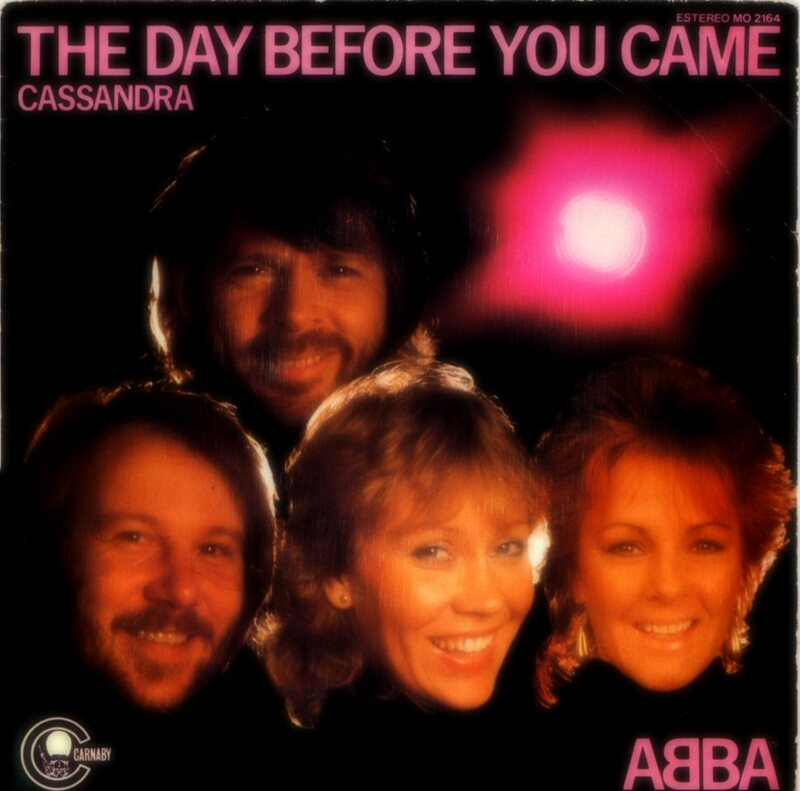 The release of "The Day Before You Came" was a big surprise for ABBA fans by that time. 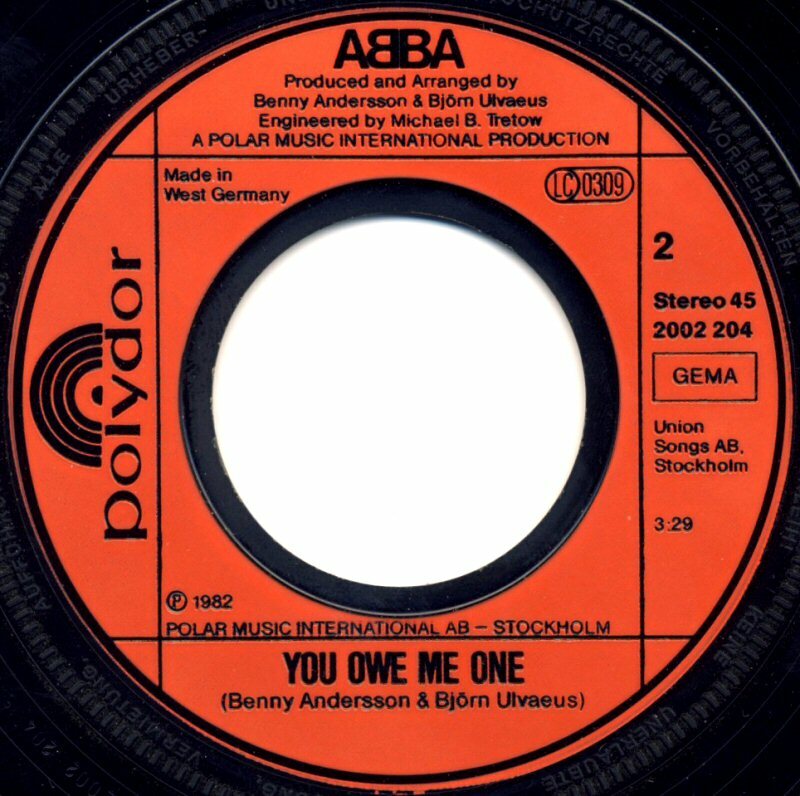 Completely different tune to the previous ABBA singles full of melancholy, sounding a bit computer-mechanically with Agnetha's sad voice and Frida in background vocals far away. 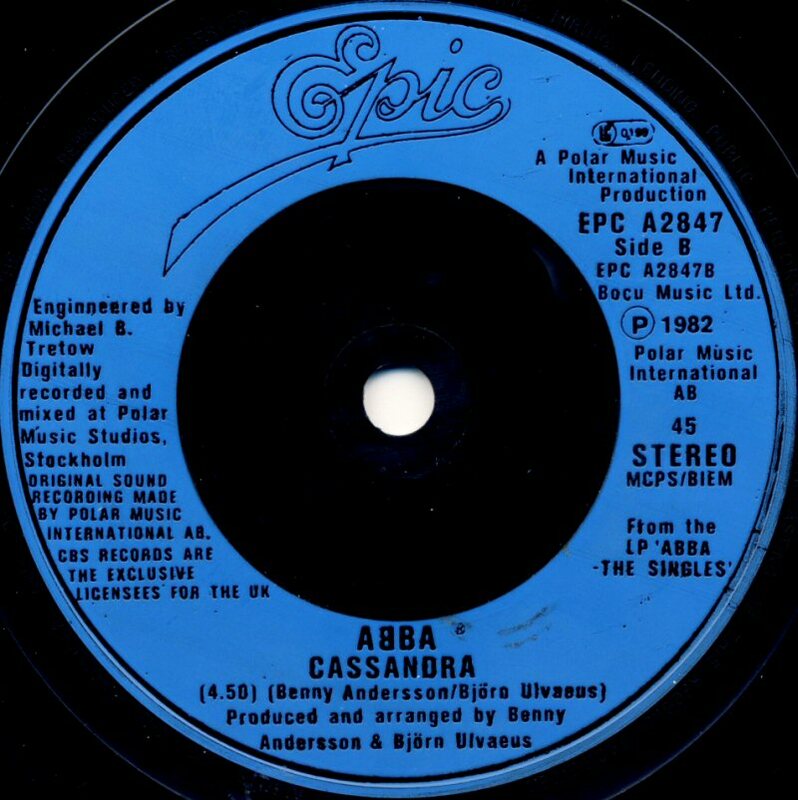 Completely surprising and different even because of its length of 5.50 - only 1 second shorter than ABBA's longest song ever recorded "Eagle" (5.51). 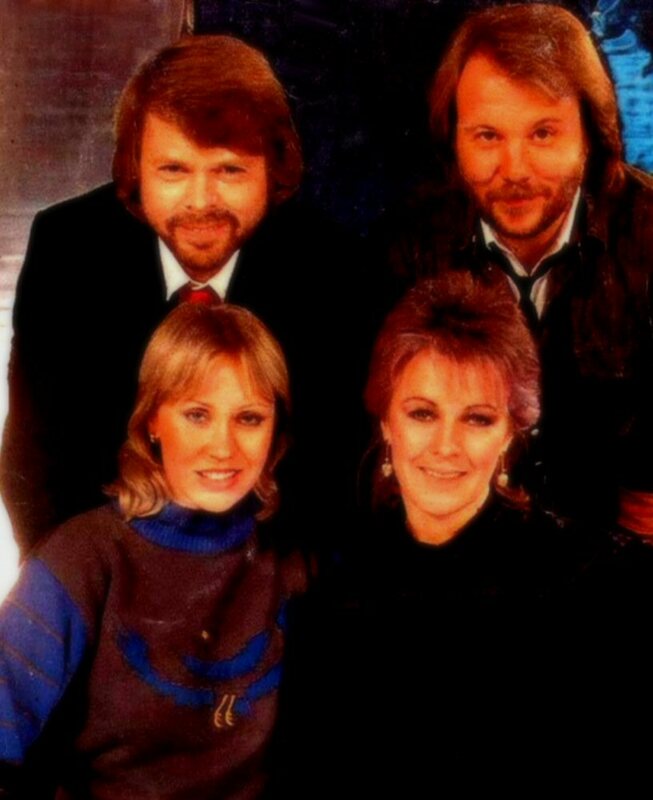 After the first hearing of the song everybody thought that it was not the same ABBA who performed "Dancing Queen" or "Voulez-Vous" or "Head Over Heals" only 10 months earlier - it was ABBA who tried to say good-bye to their fans even if all four members denied it strongly in the UK TV show "The Late Late Breakfast Show" one month later. 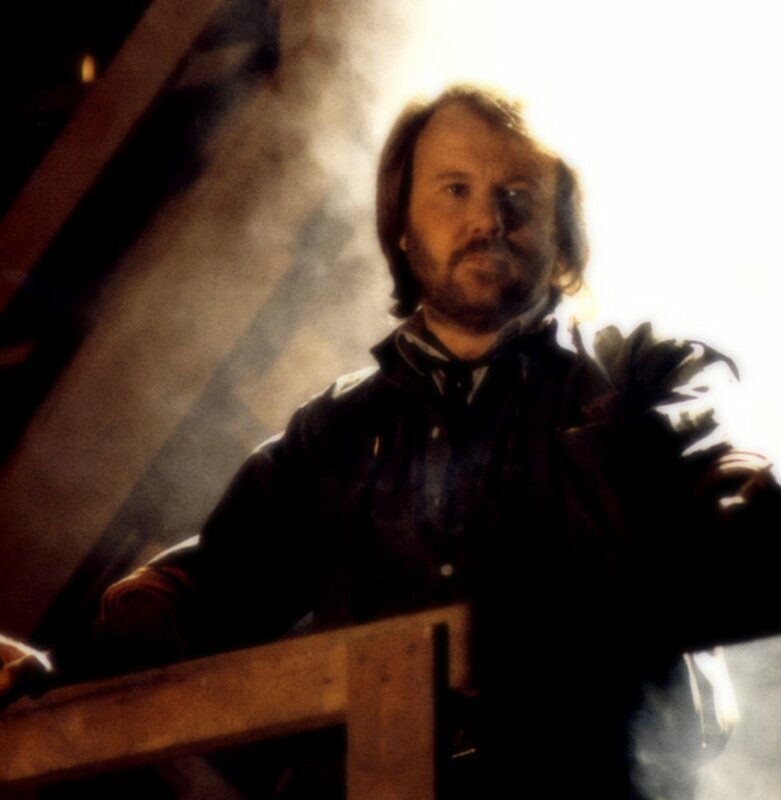 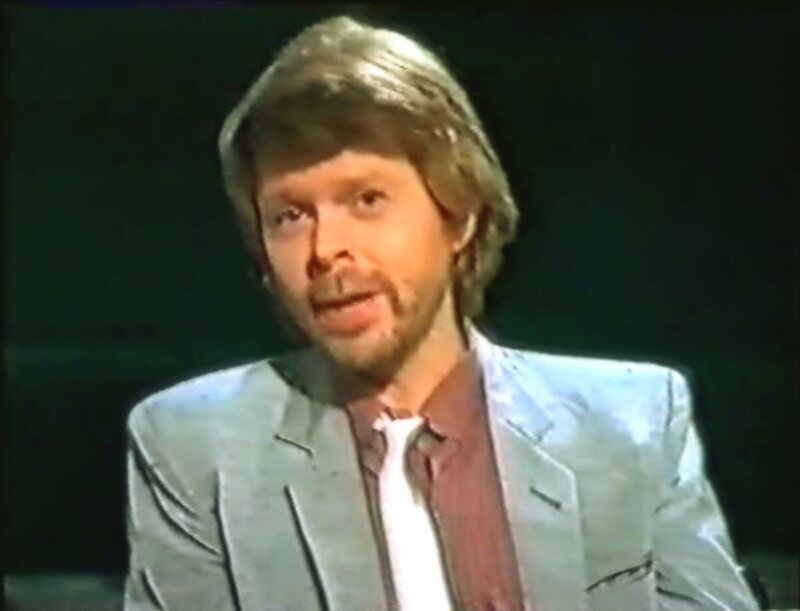 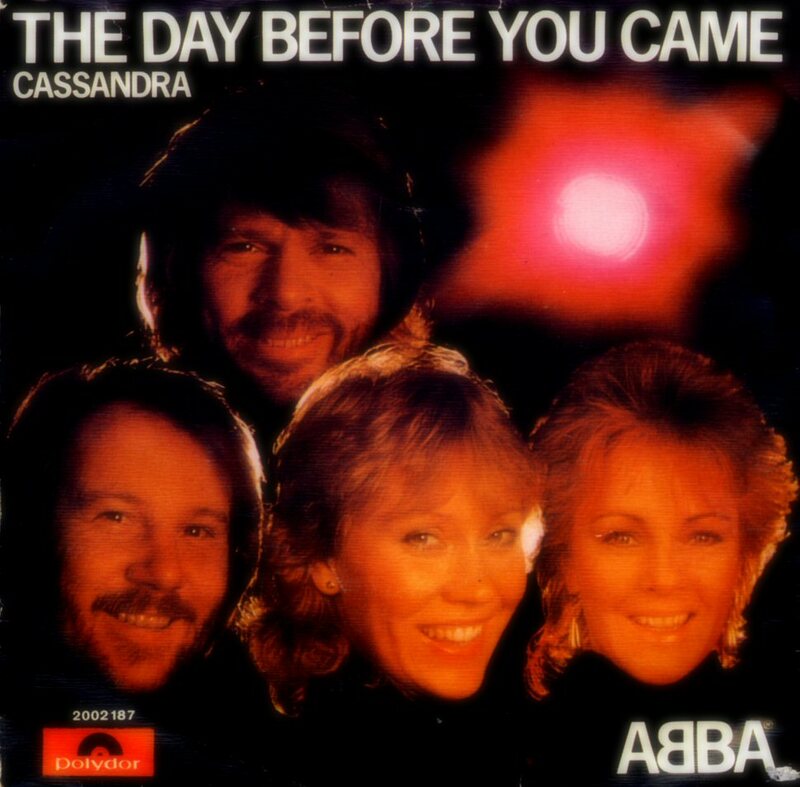 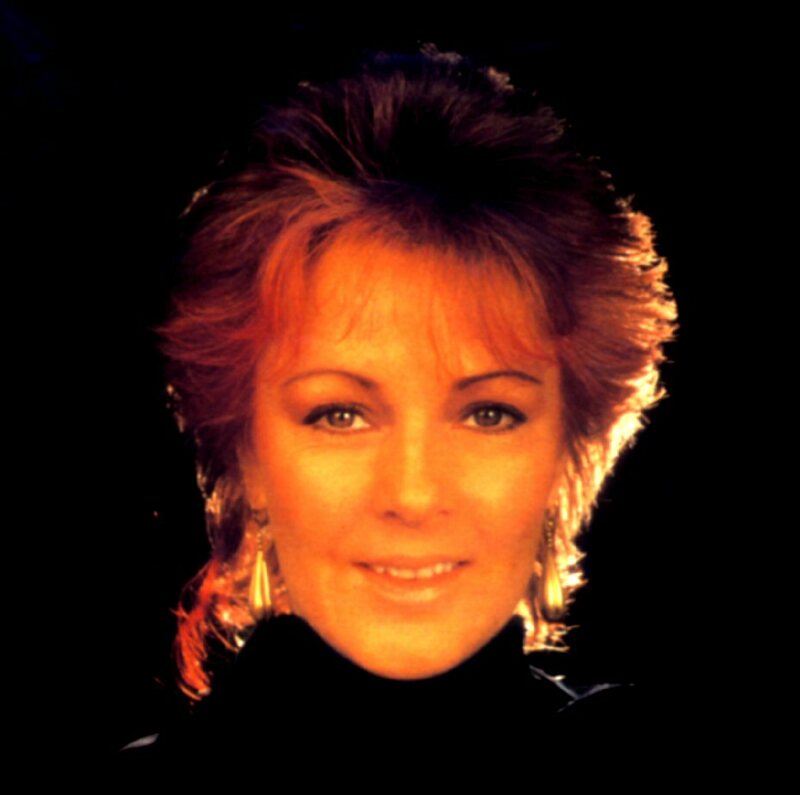 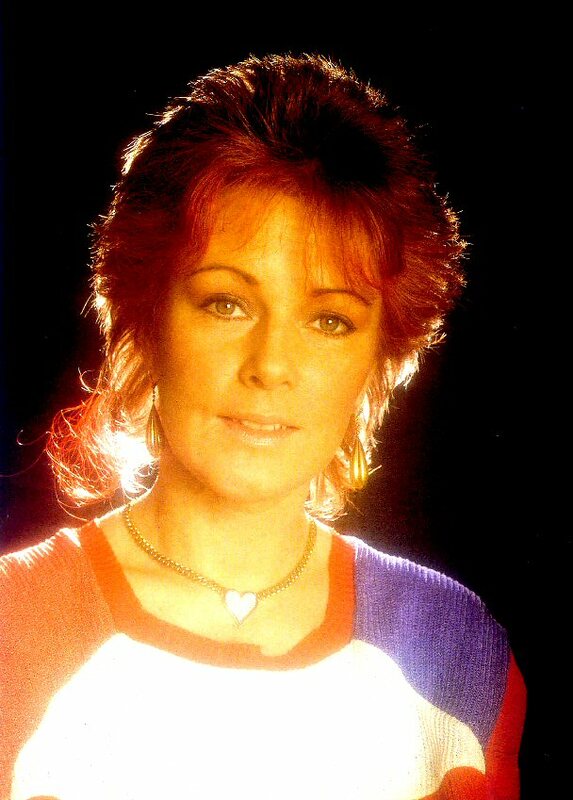 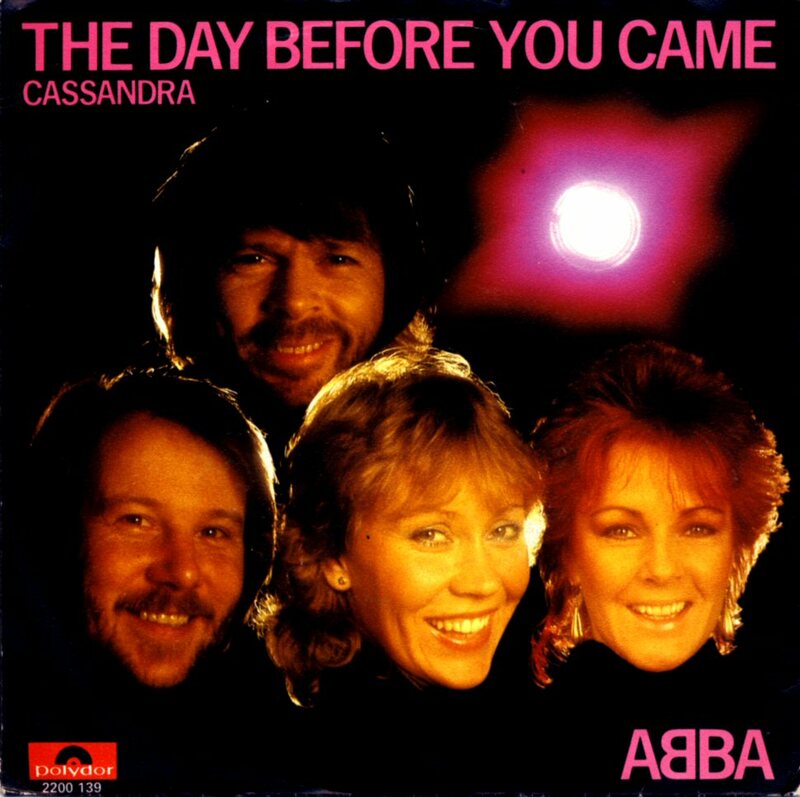 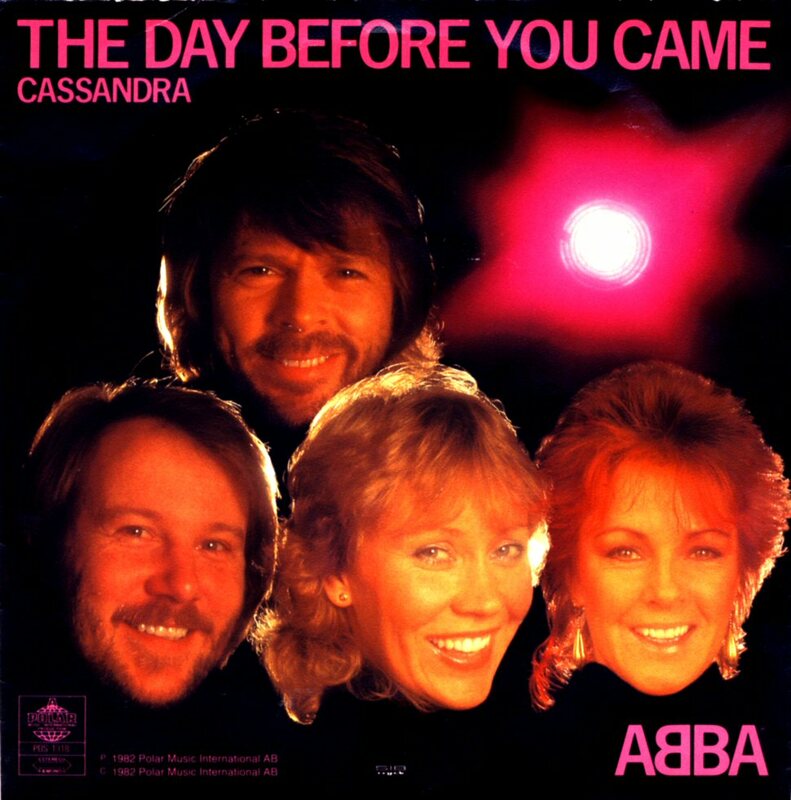 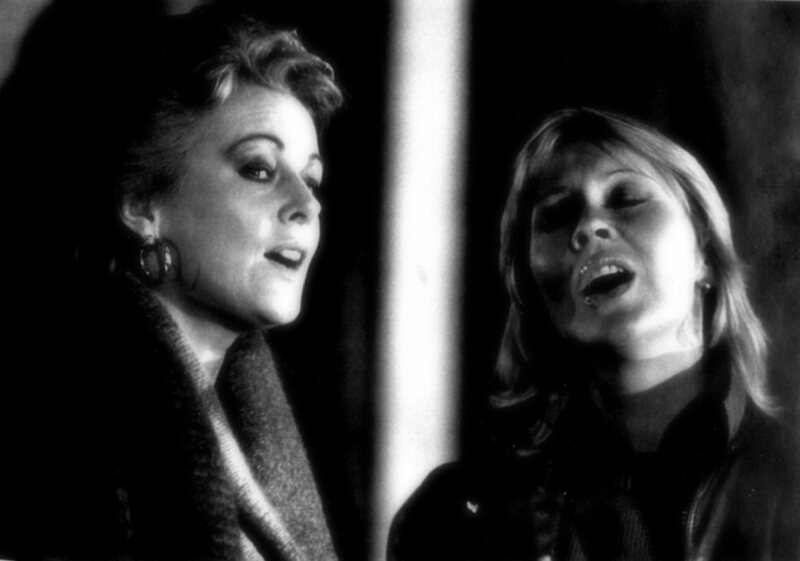 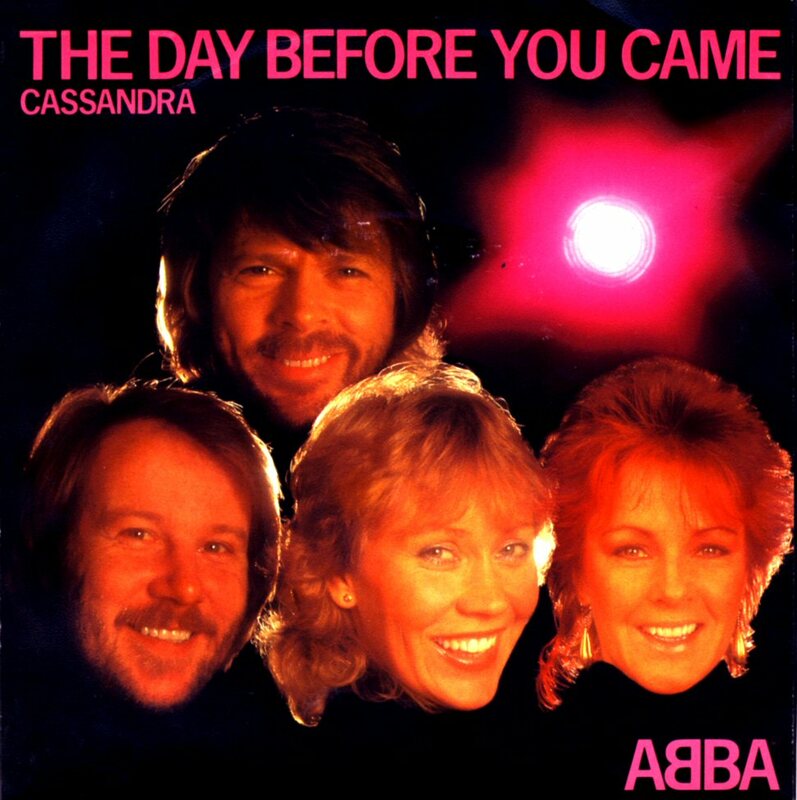 The autumn 1982 was dark and rainy and hearing "The Day Before You Came" on the radio chart was a very special moment which many old ABBA fans still remember. 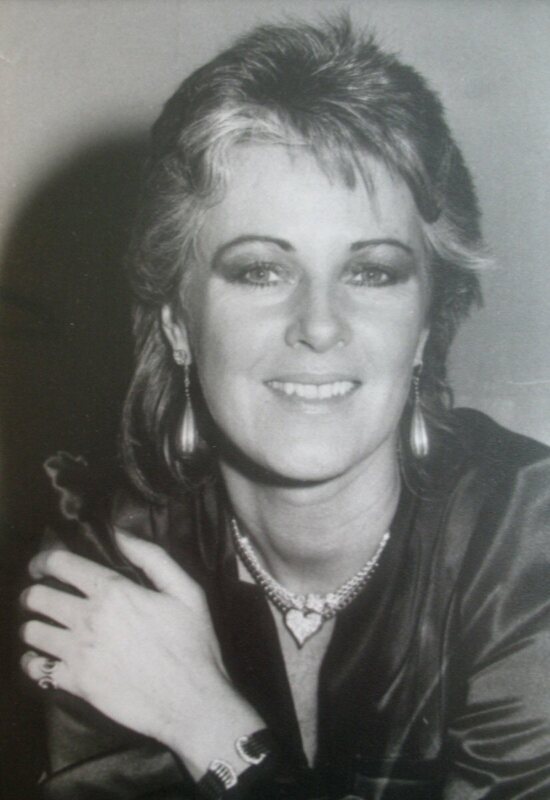 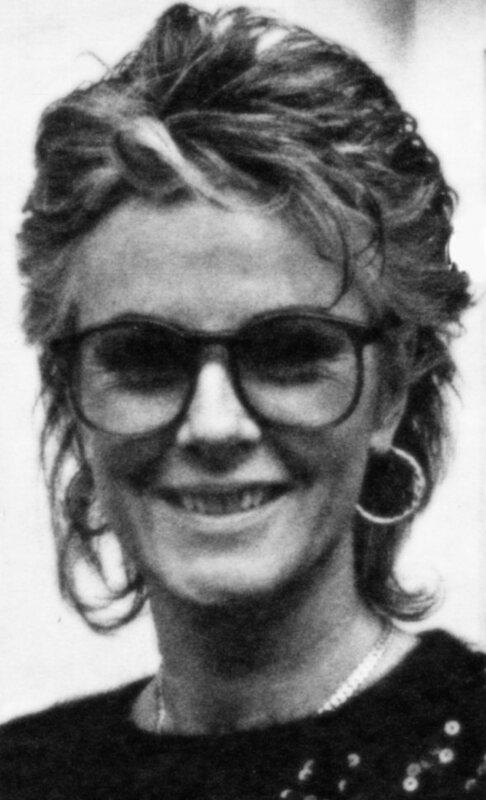 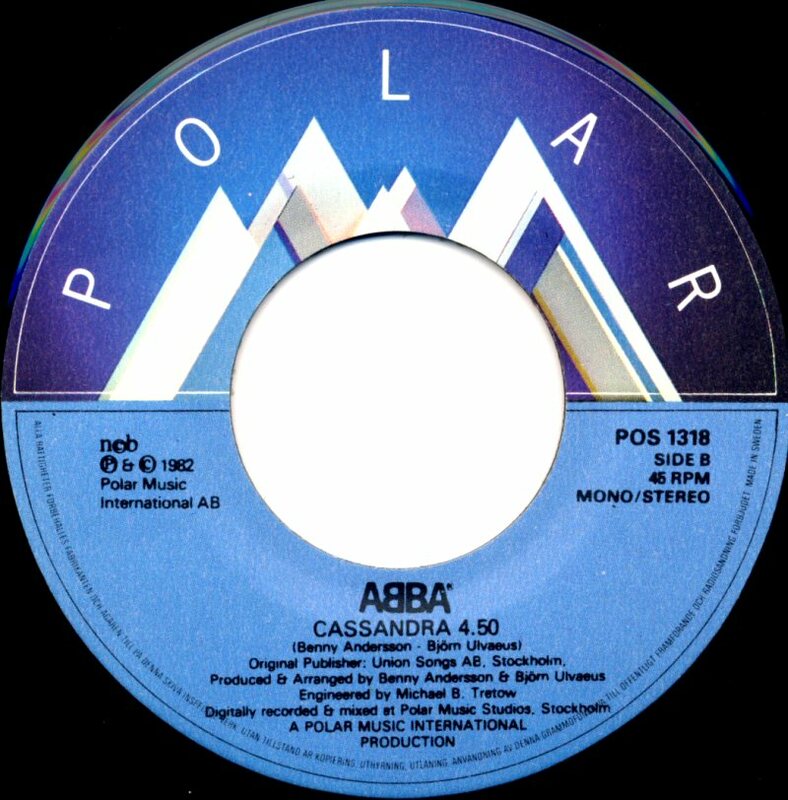 The B-side song "Cassandra" featuring Frida in lead-vocals was much more typical ABBA song in the same style as "Fernando" and "Chiquitita". 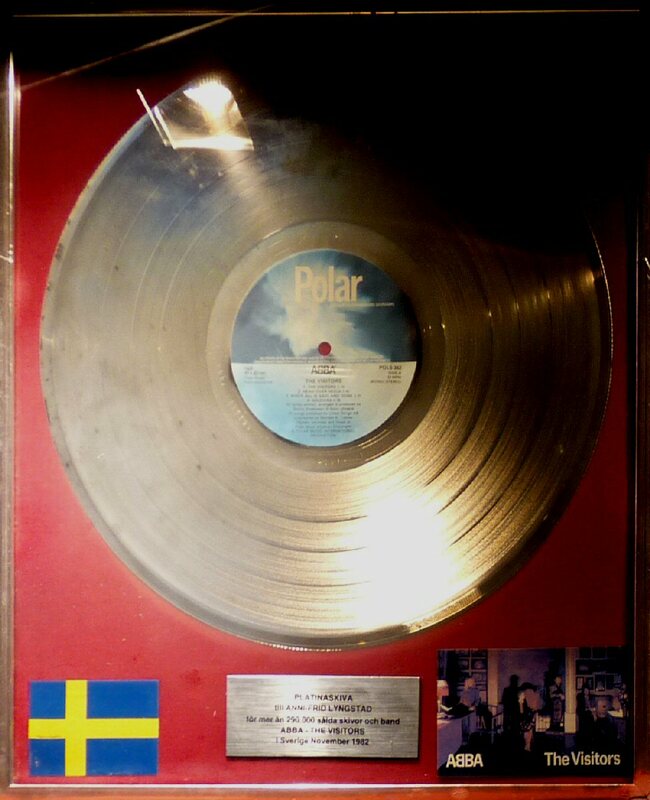 The single entered the Swedish chart first on 9 November 1982 and stayed there for 10 weeks peaking at #3. 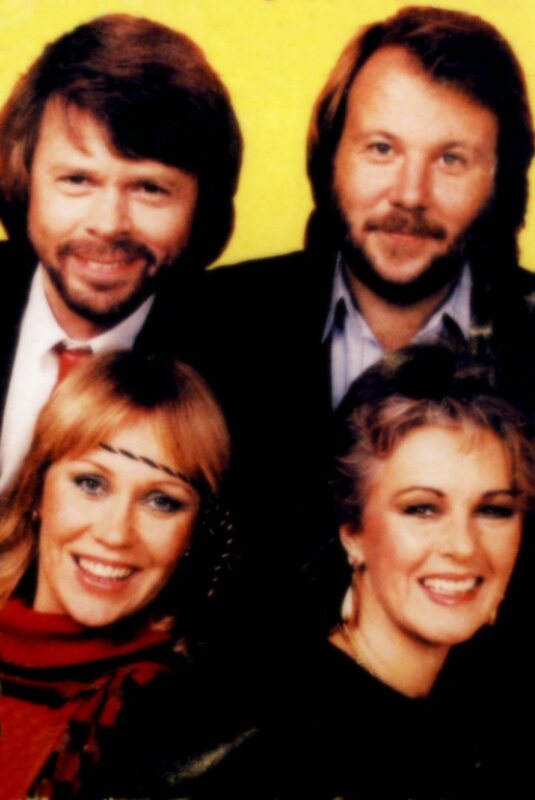 The chart life in Norway was 5 weeks peaking at #5 and in Finland #2. 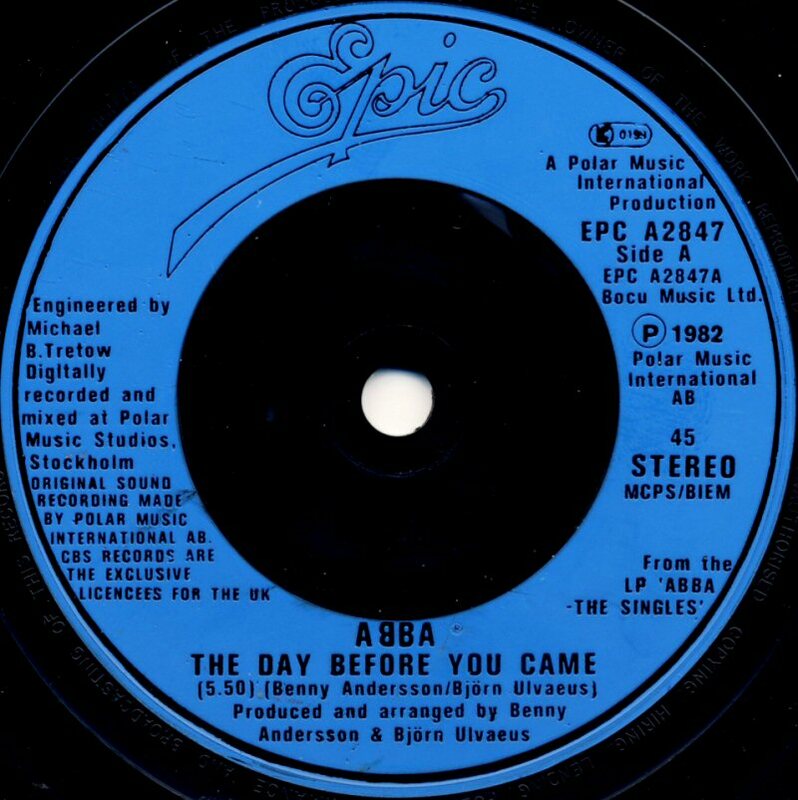 In Great Britain "The Day Before You Came" entered the chart on 23 October where it stayed for 6 weeks reaching #32. 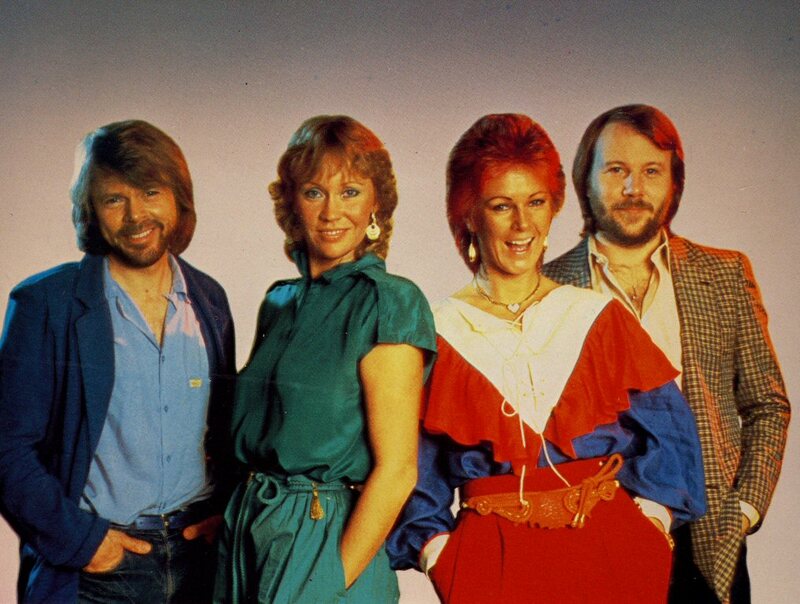 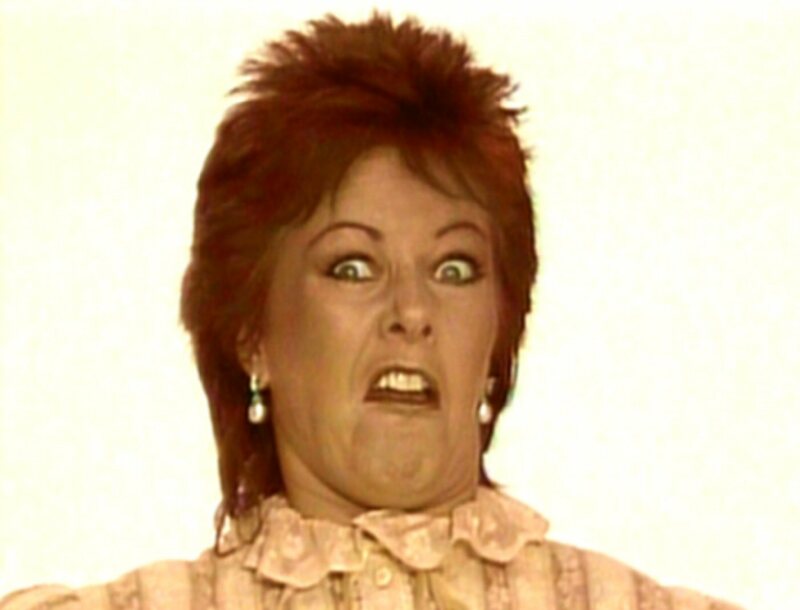 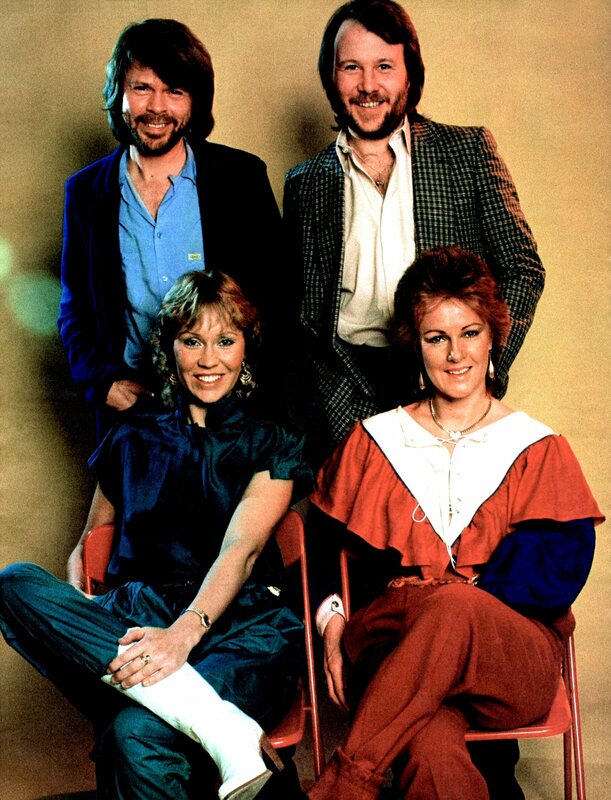 It was the lowest ABBA chart position in the UK since the 1975 single "I Do I Do I Do I Do I Do". 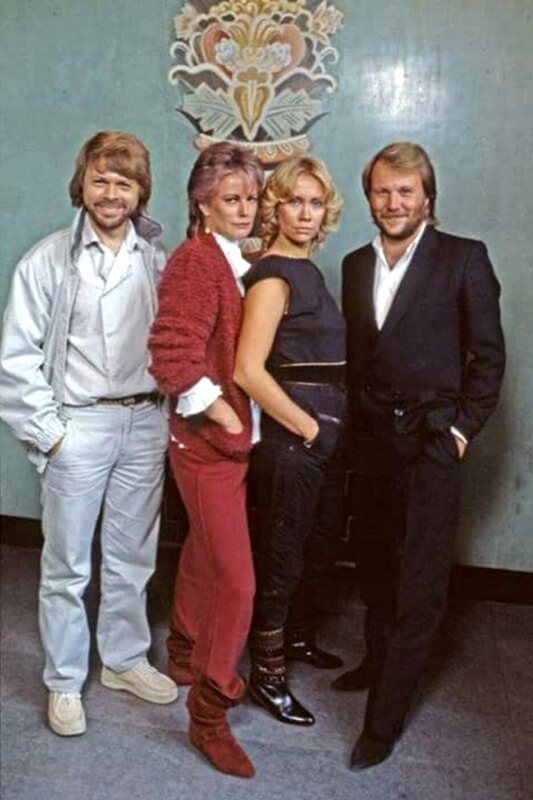 It even confirmed that ABBA were not hot in the UK by that time. 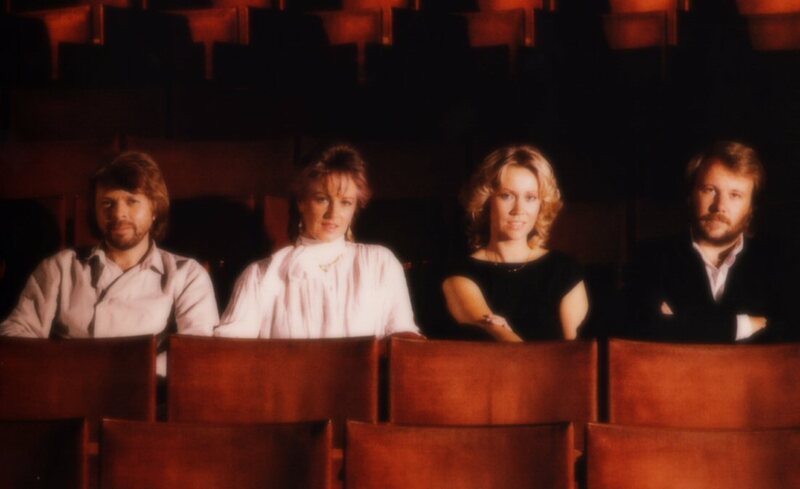 The chart life in the UK (Top 50): 30 Oct: #32, 6 Nov: #35, 13 Nov: #35, 20 Nov: #37. 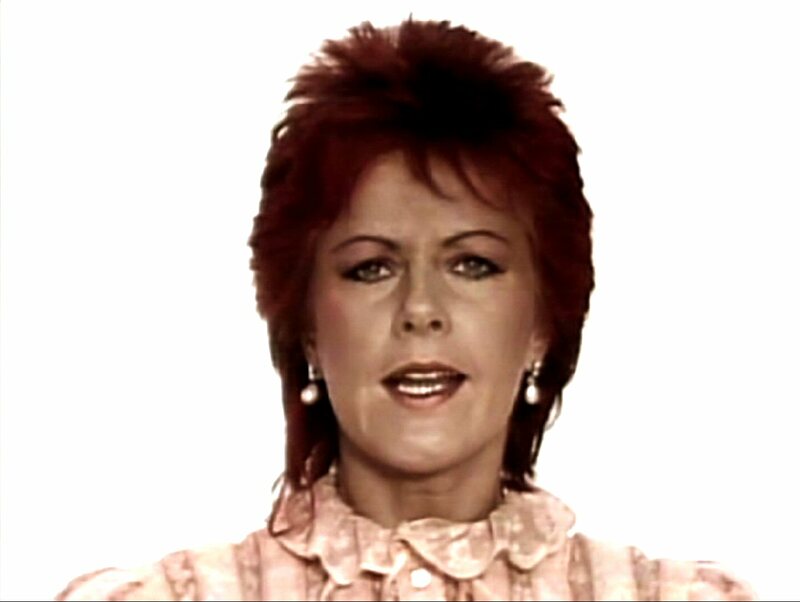 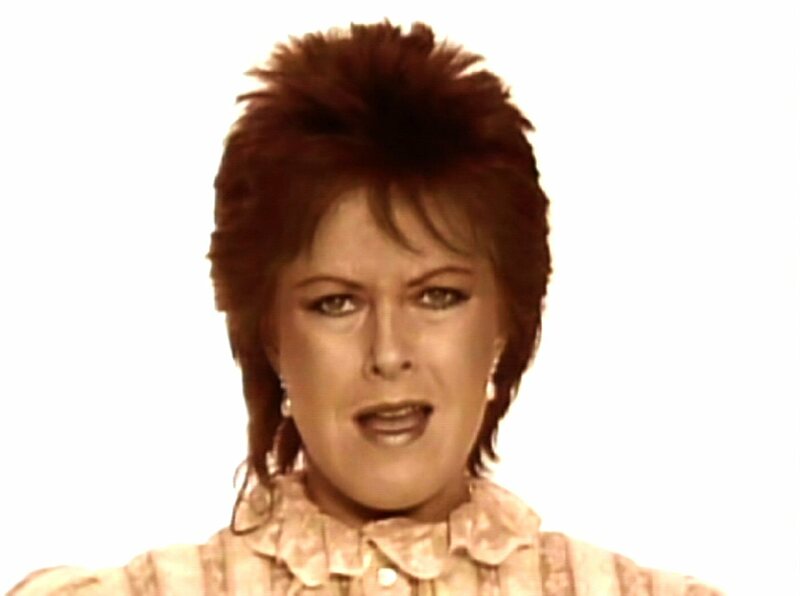 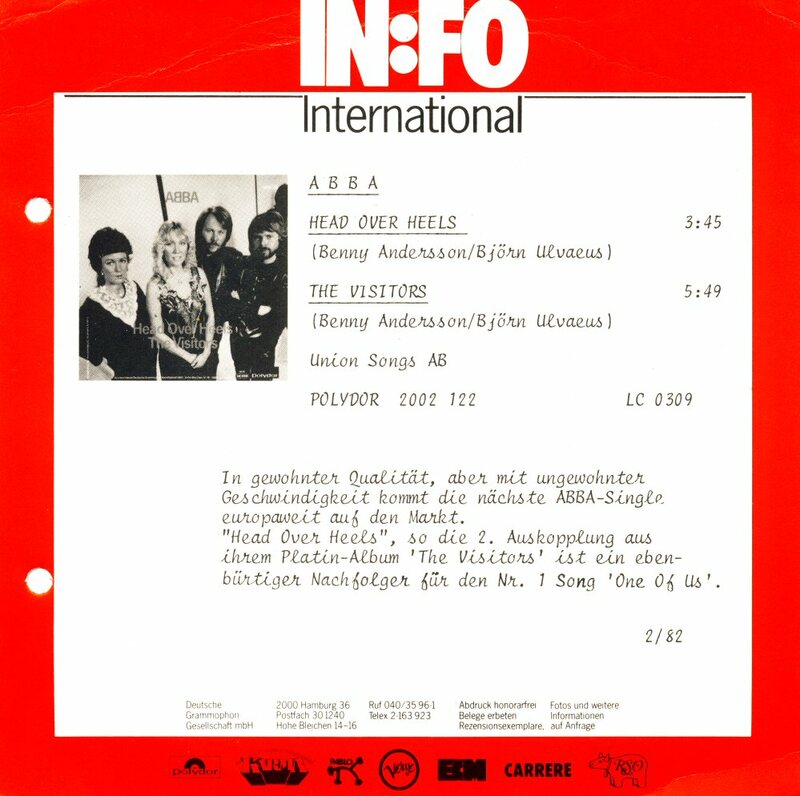 The single was more successful in West Germany where it reached #5 and stayed on the single chart for 15 weeks (the chart entrance on 1 November 1982). 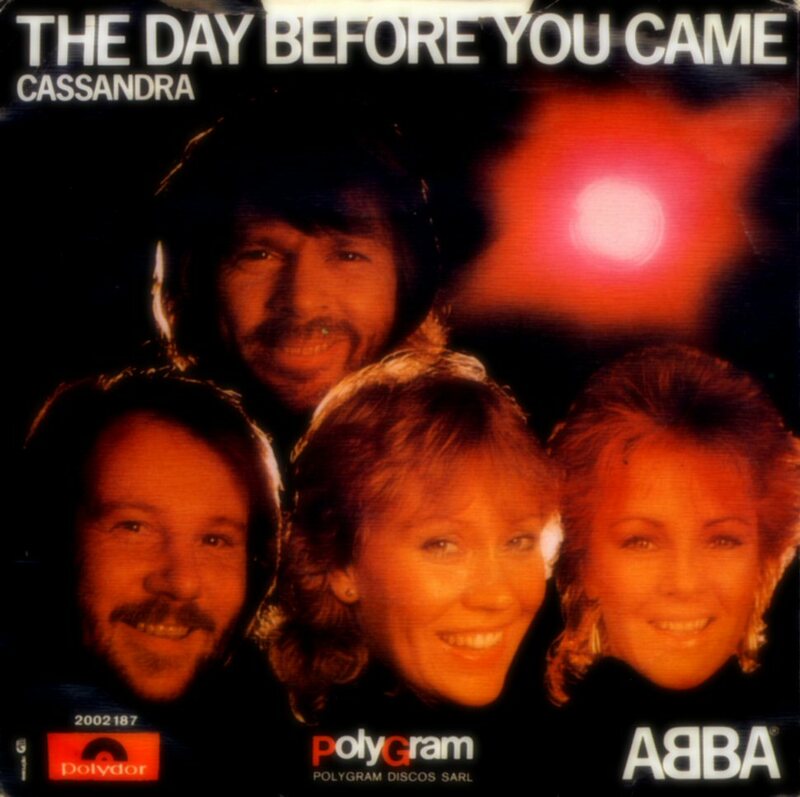 Polydor in West Germany released maxi single with "The Day Before You Came"/"Cassandra". 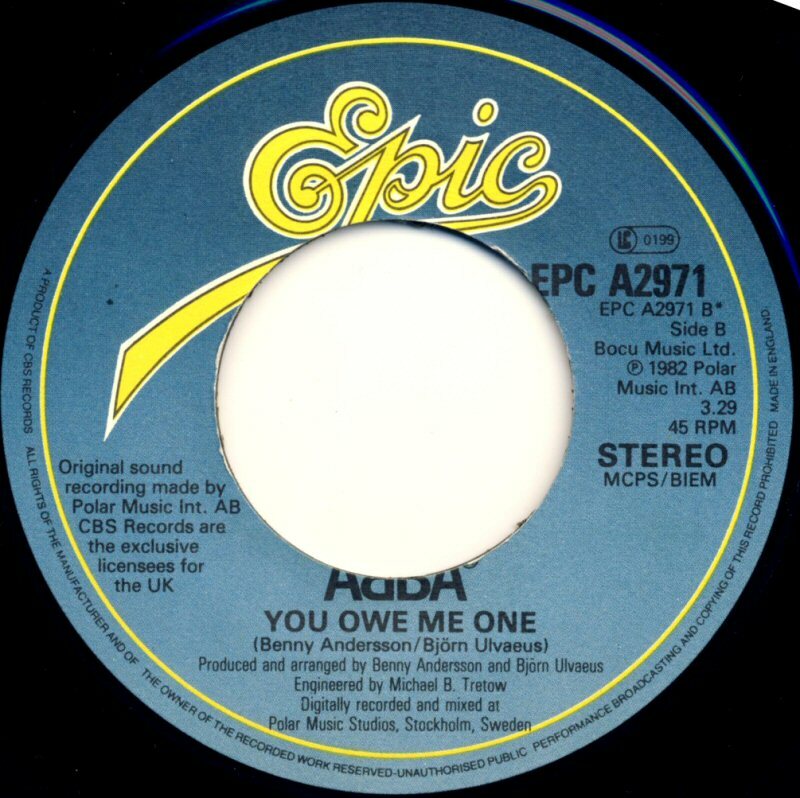 The price was DM 8,90. 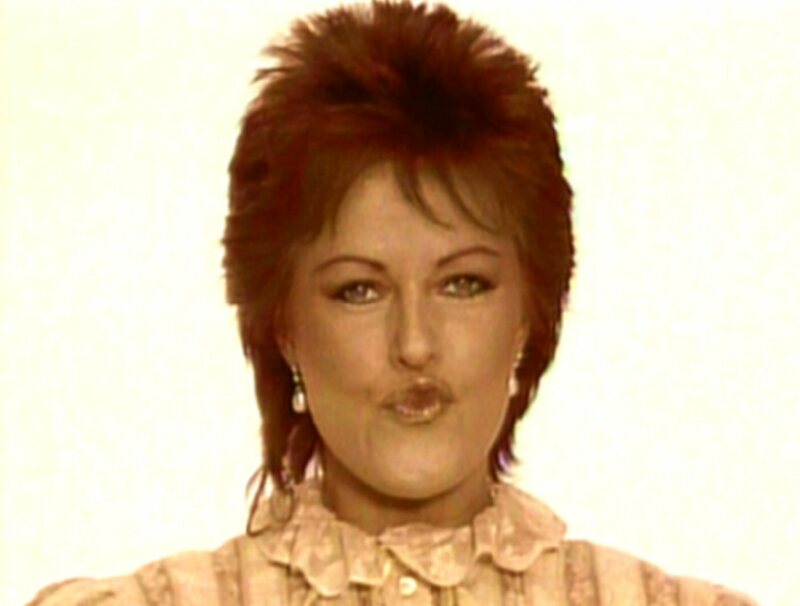 The single peaked at #4 in Switzerland and at #16 in Austria. 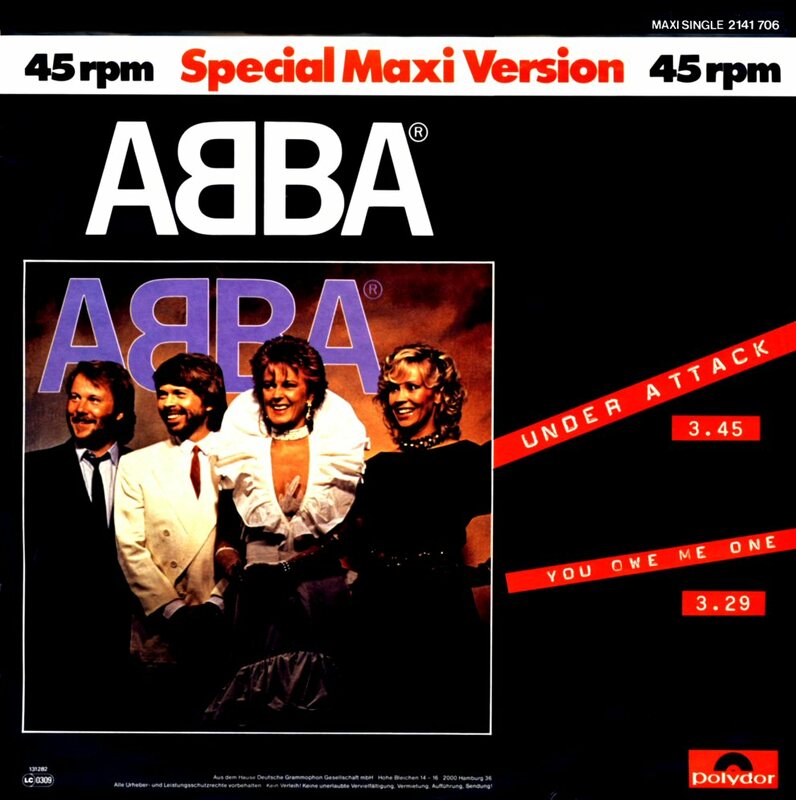 The single became #3 in Holland and it stayed on the Dutch chart totally for 7 weeks (the chart entrance: 30 October 1982). 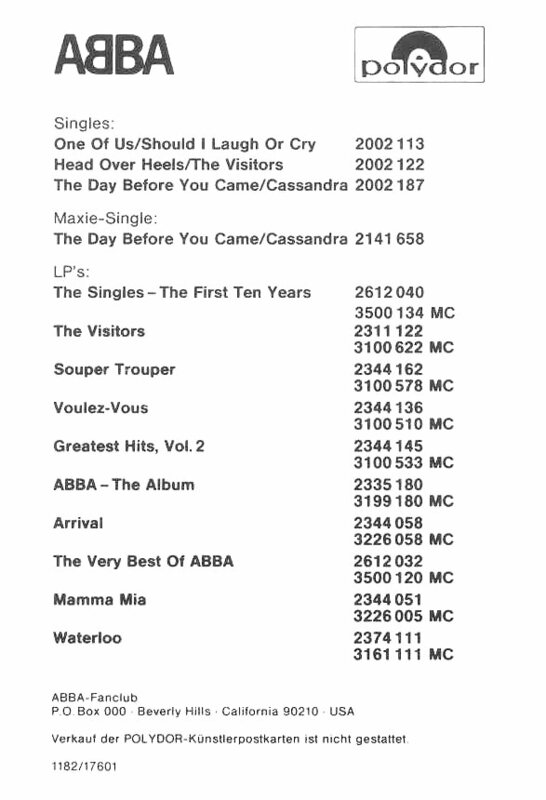 In Belgium it reached #3 and in Ireland #12. 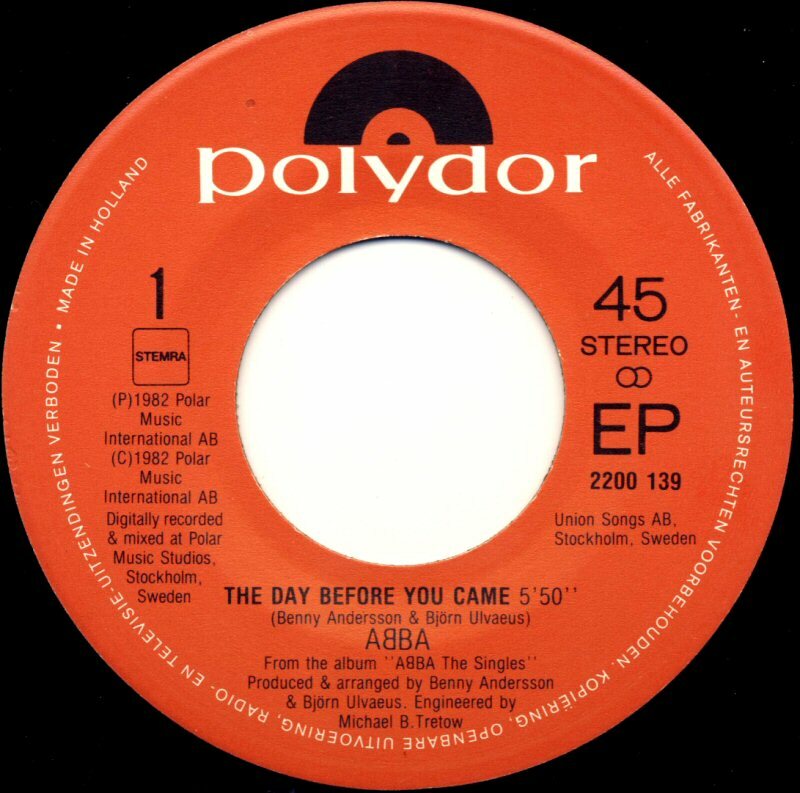 "The Day Before You Came" was released as a limited edition maxi single in Holland, France & West Germany. 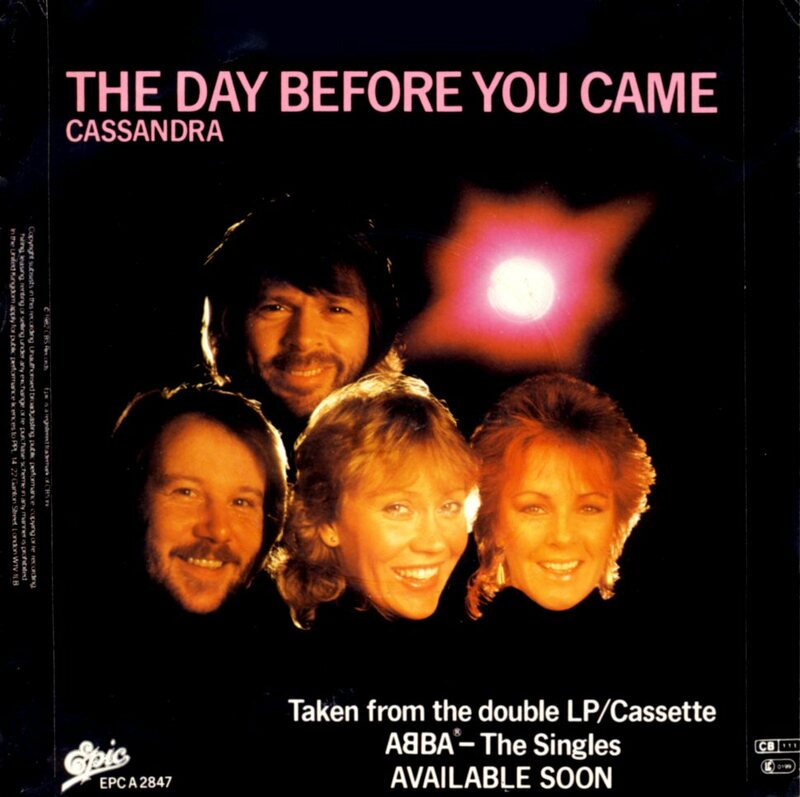 The 12" featured full-length version of "The Day Before You Came" b/w "Cassandra". 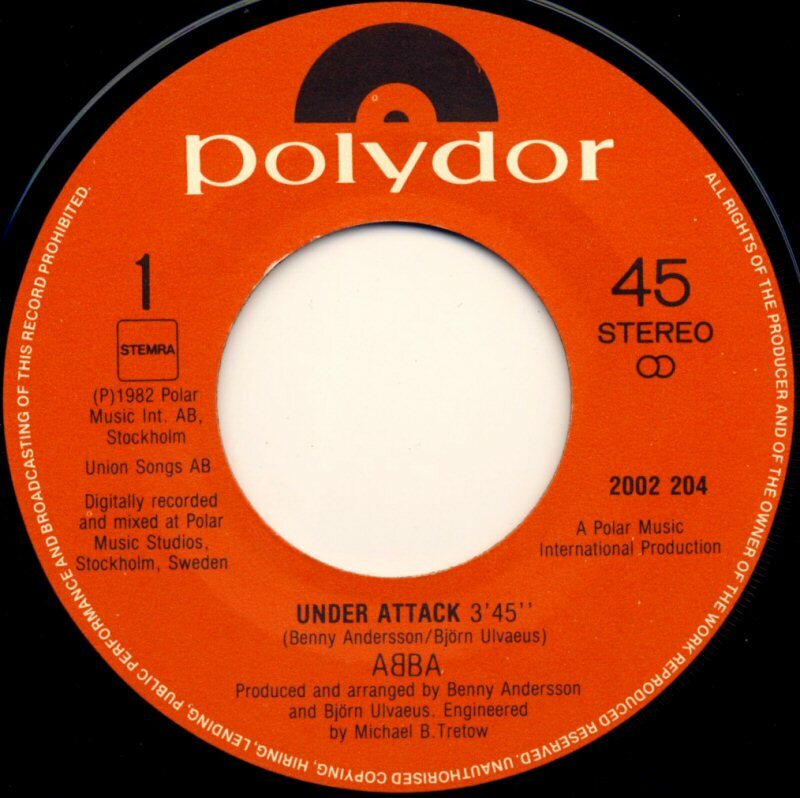 In France the single stayed on the chart for 6 weeks reaching #38. 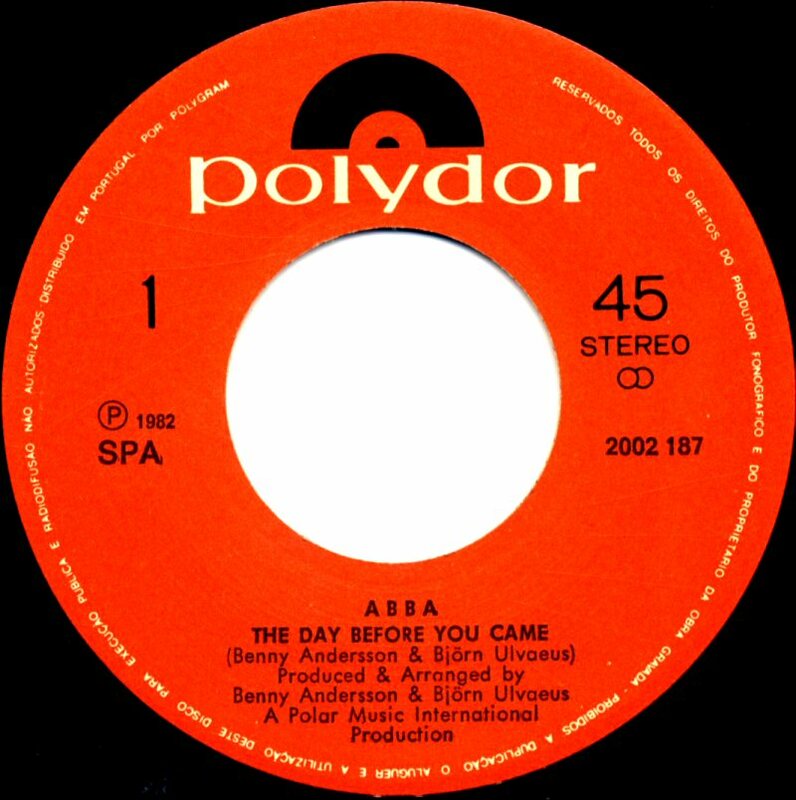 In Poland "The Day Before You Came" entered the Power Play chart on 6 November 1982 and stayed there for 6 weeks reaching #4. 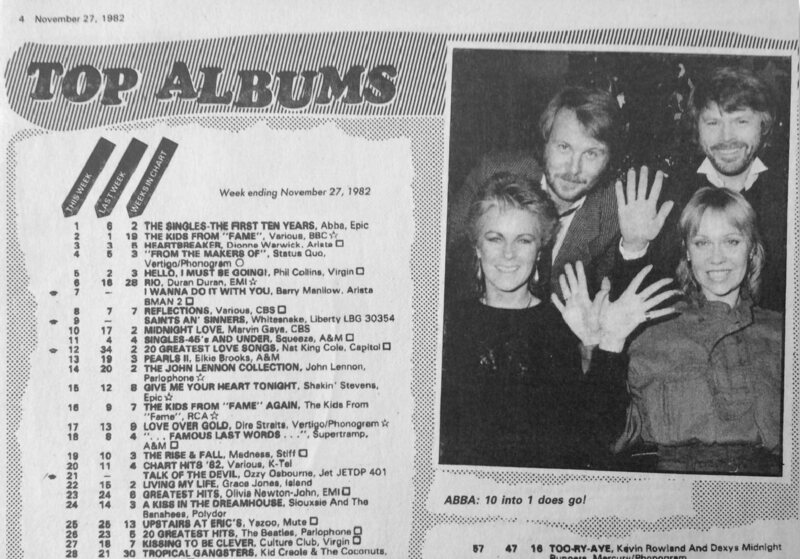 Chart life in Poland: 6 Nov: #14, 13 Nov: #9, 20 Nov: #5, 27 Nov: #4, 4 Dec: #6, 11 Dec: #6, 18 Dec: #15. 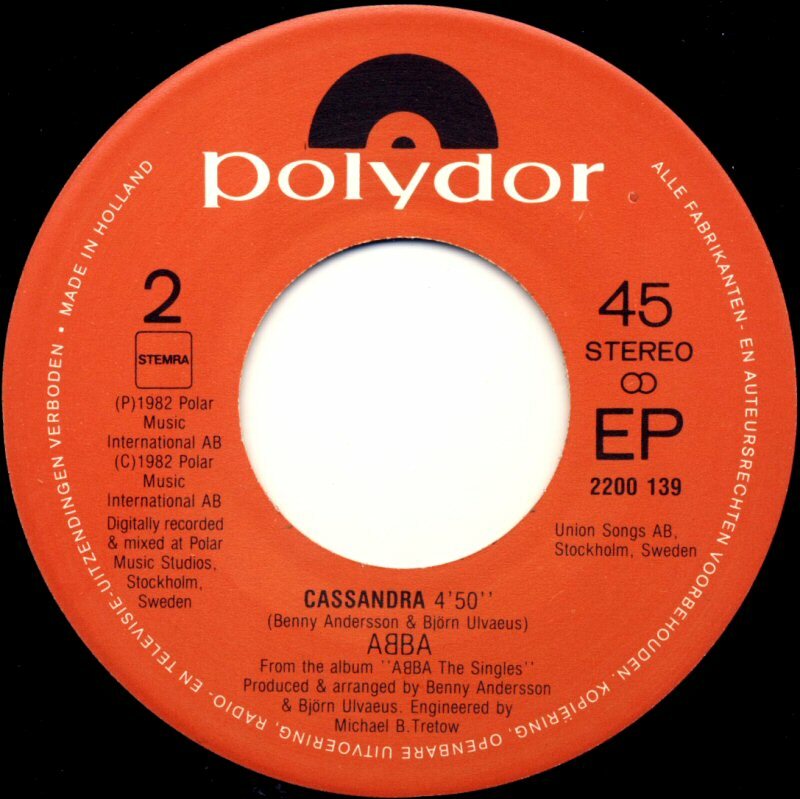 Even "Cassandra" entered the Polish Power Play chart on 8 January 1983 and it stayed there for 2 weeks (#27, #29). 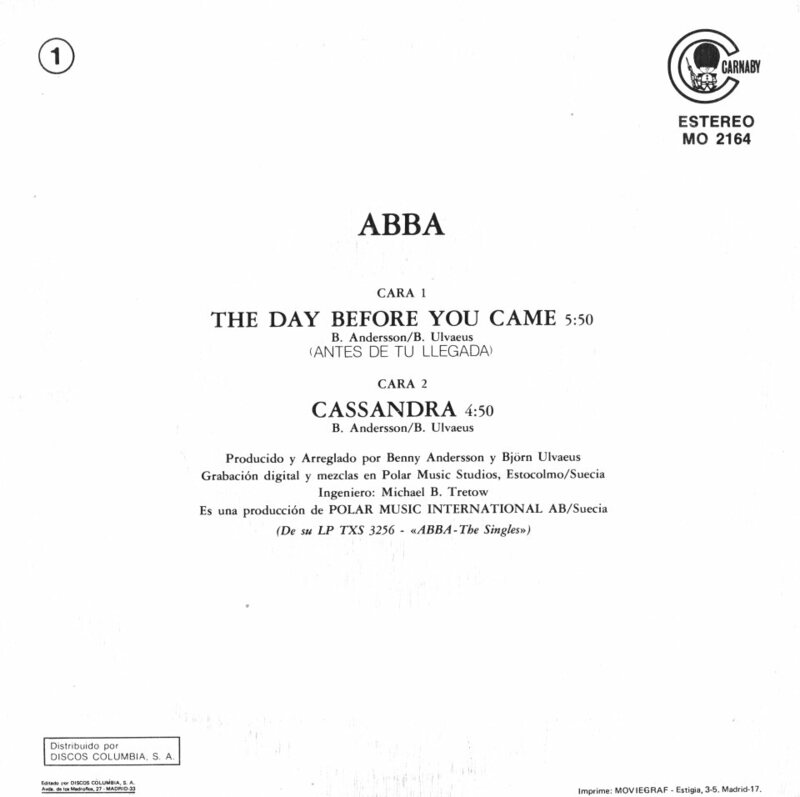 The single was not very successful in Spain where it stayed and the radio chart for 2 weeks reaching #29. 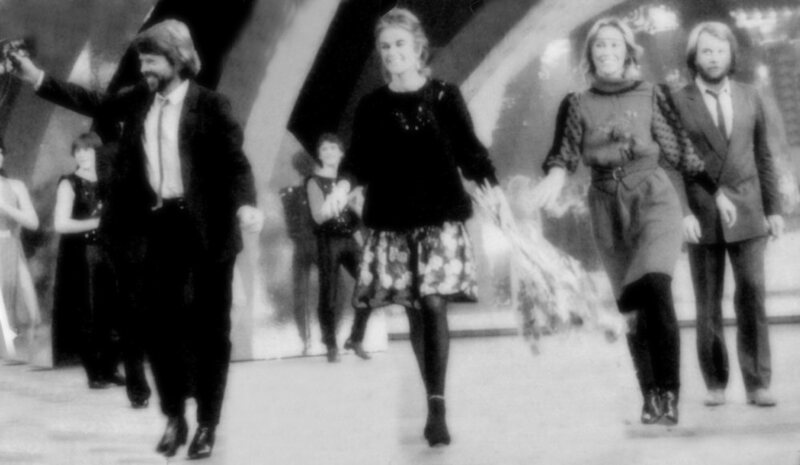 The single flopped even in Portugal. 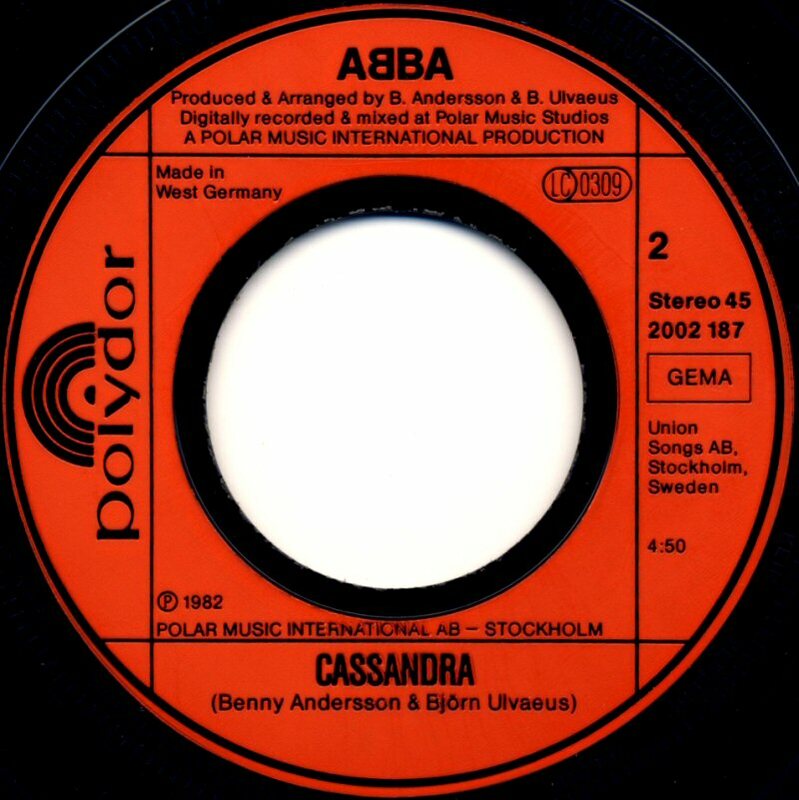 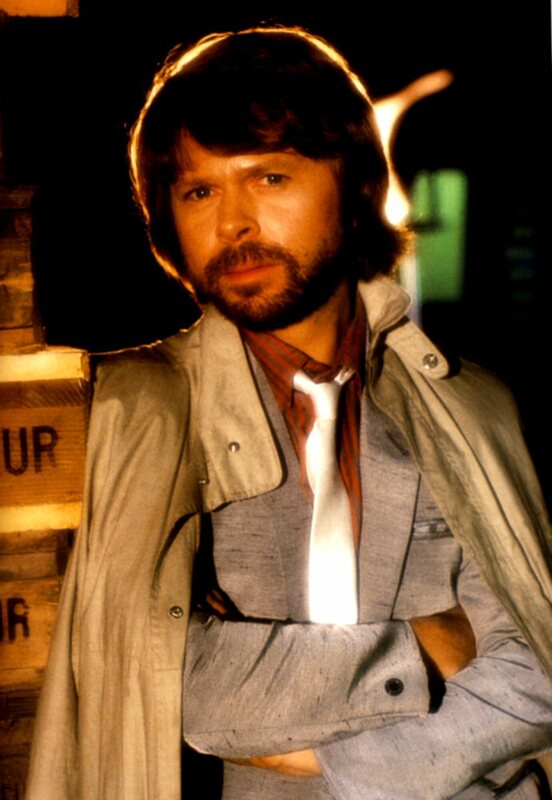 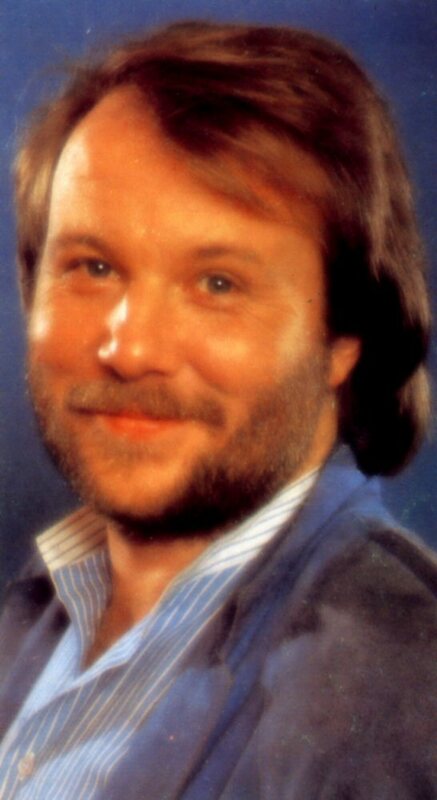 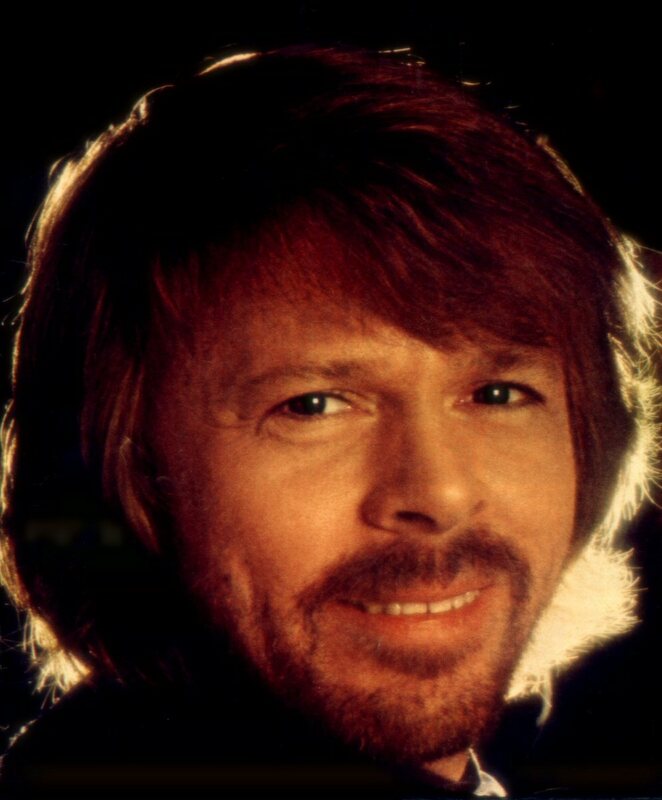 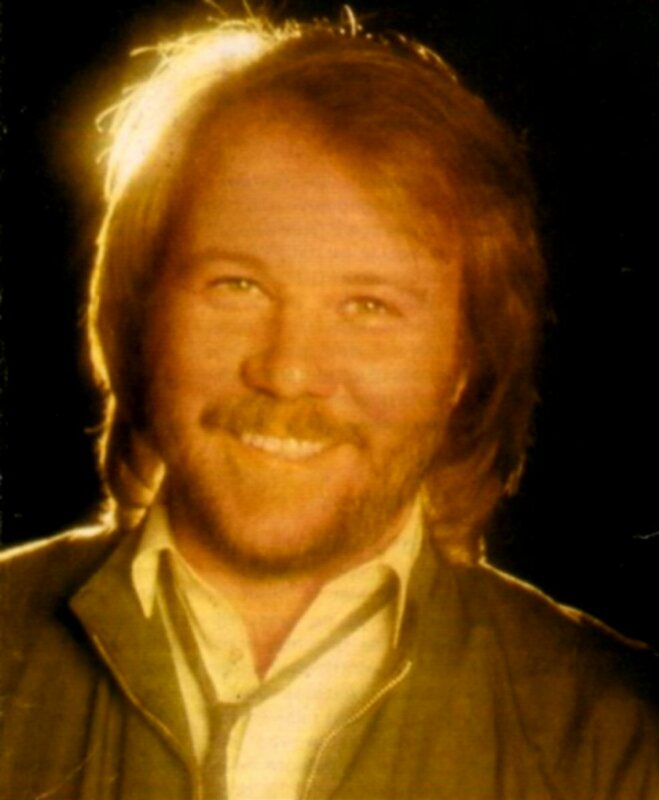 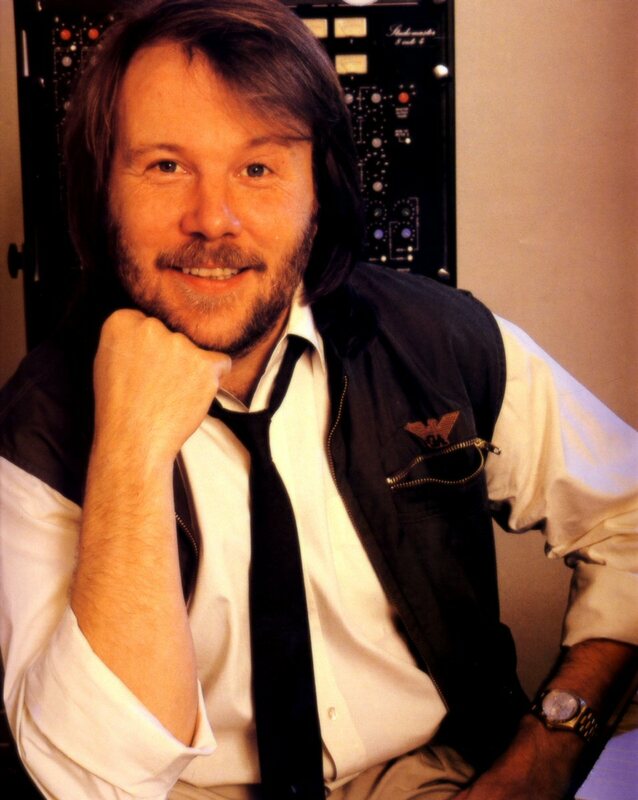 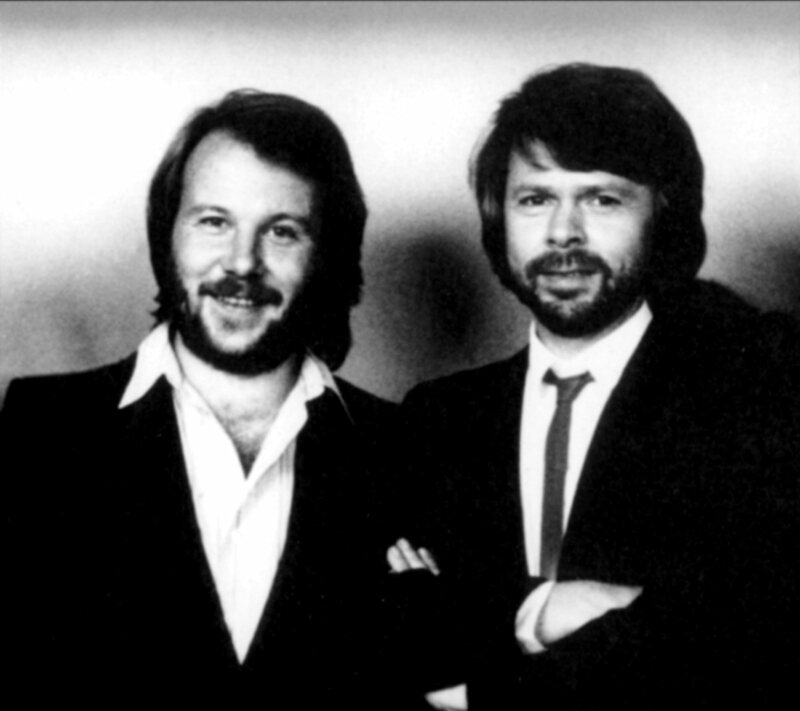 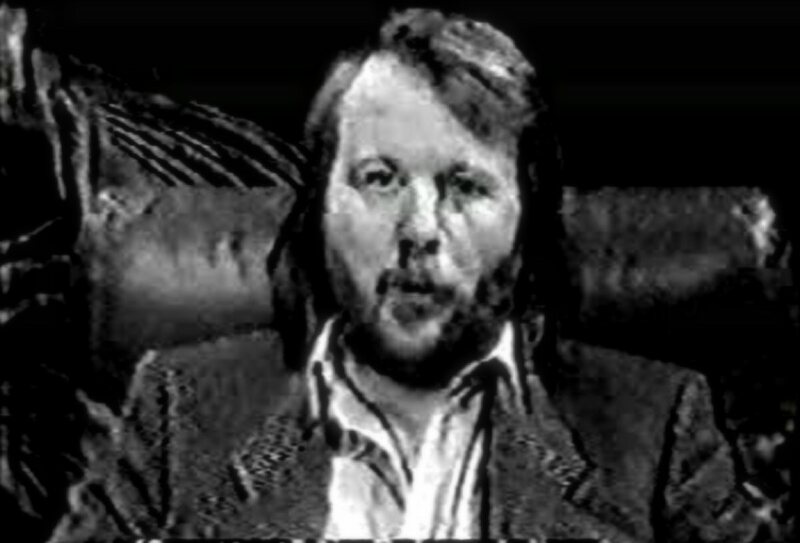 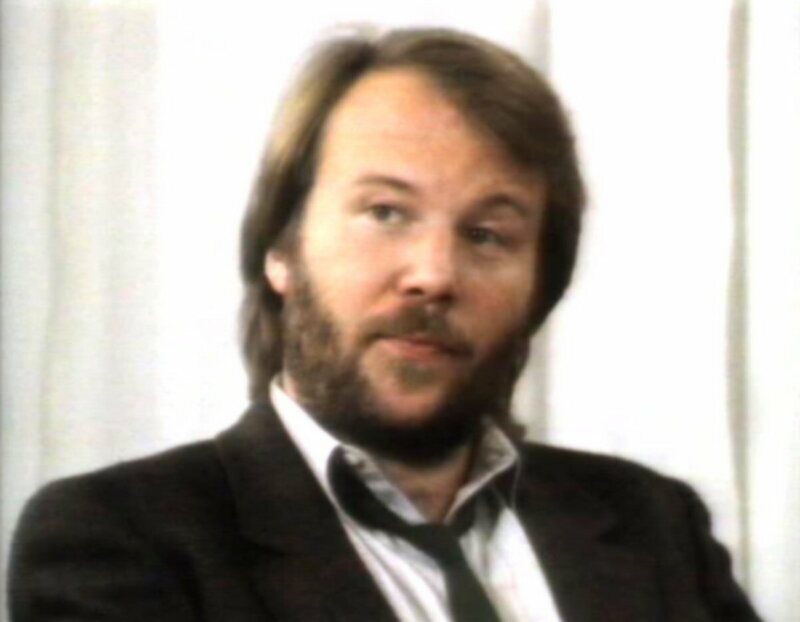 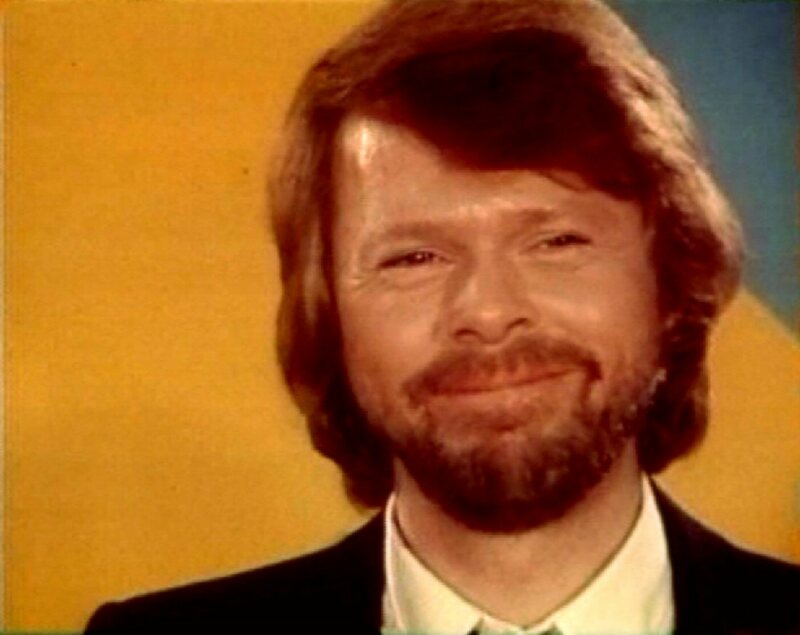 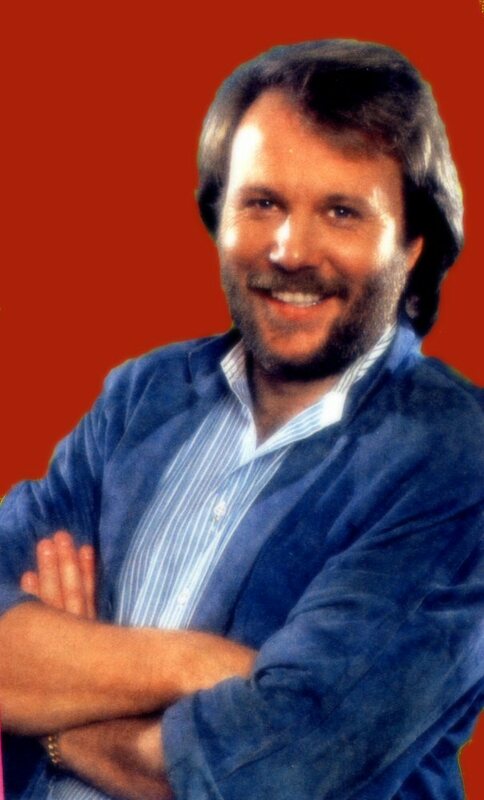 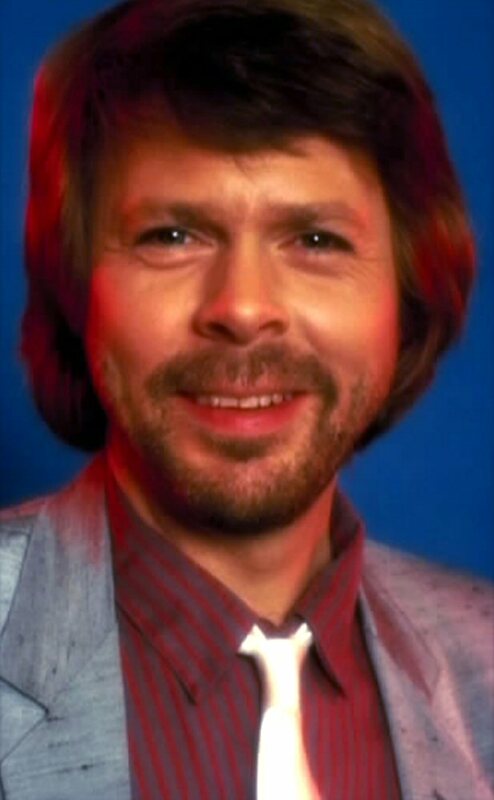 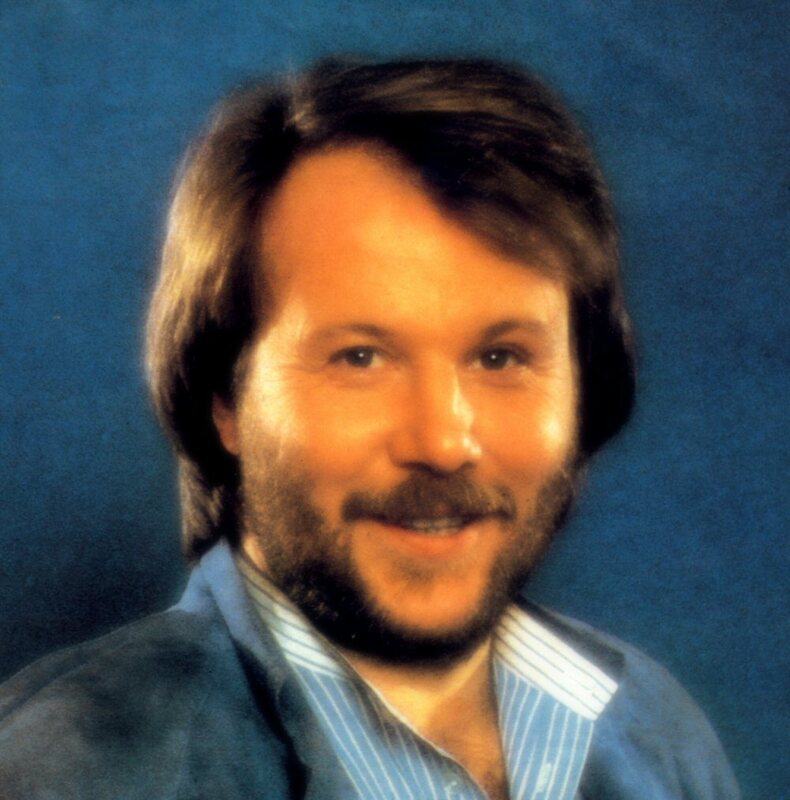 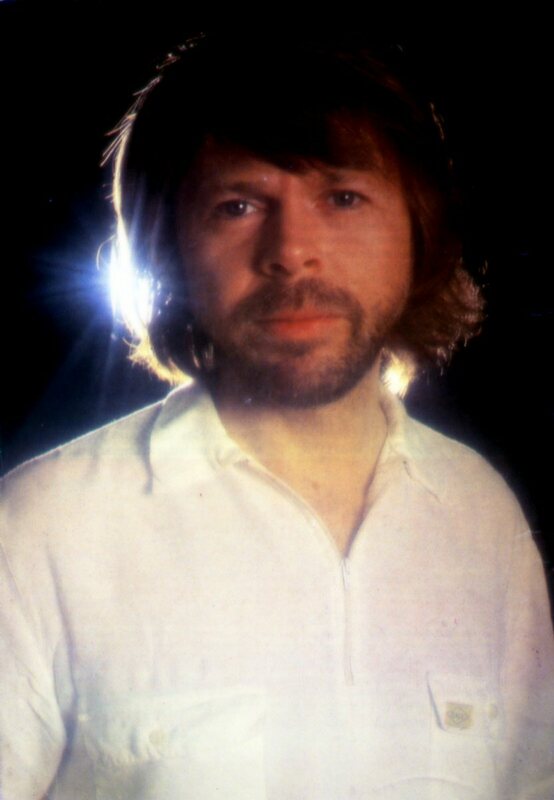 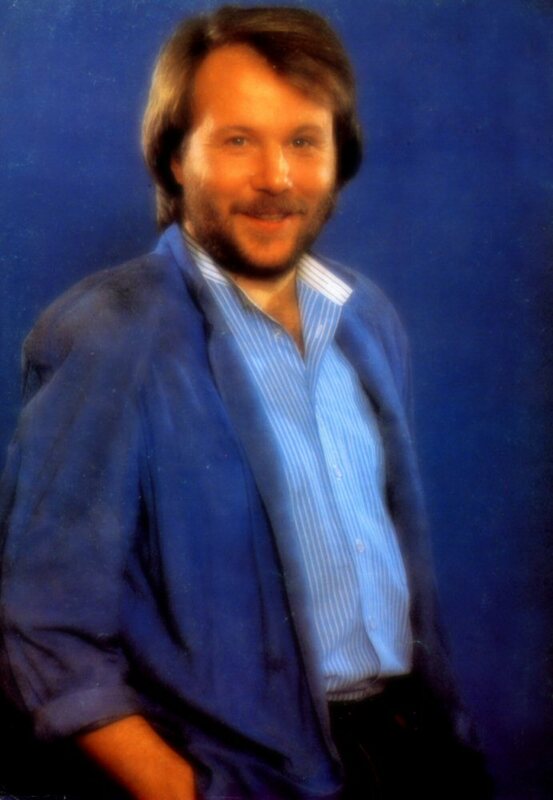 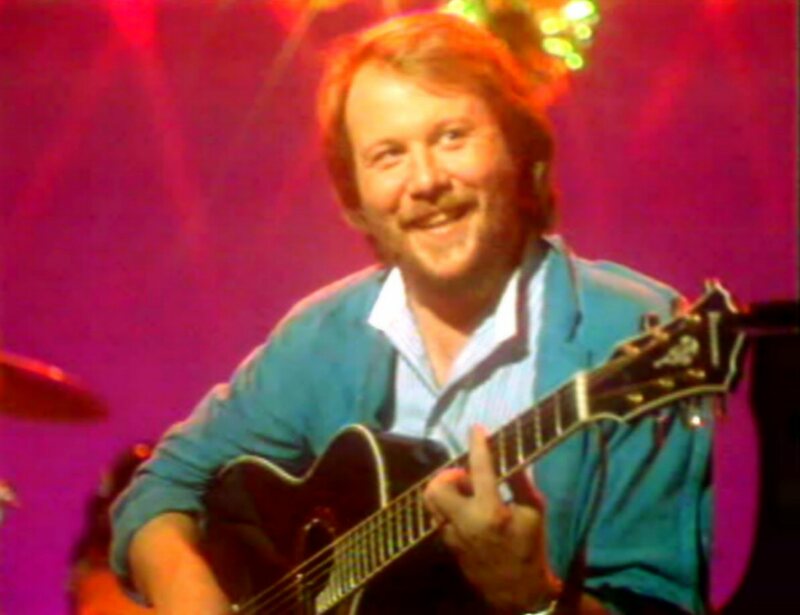 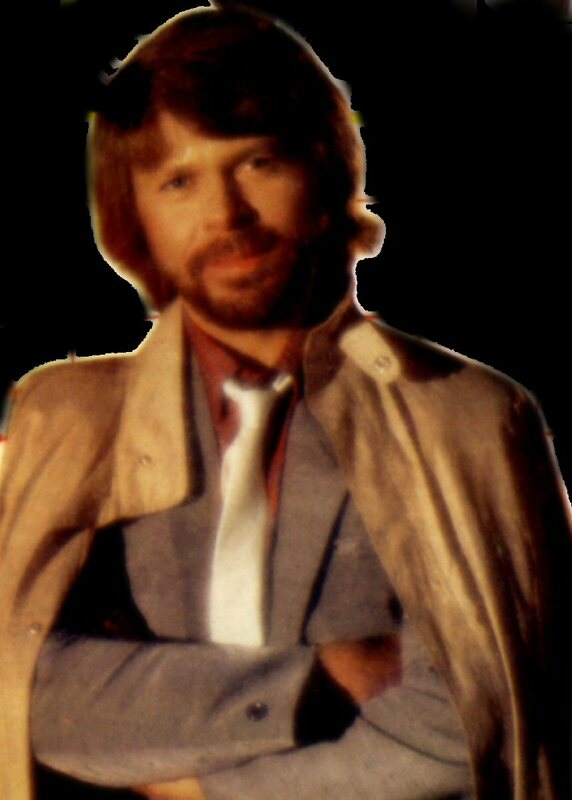 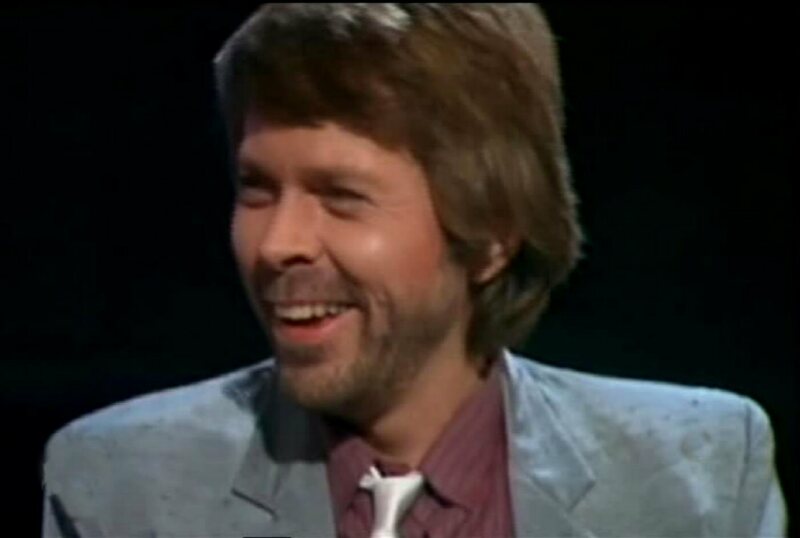 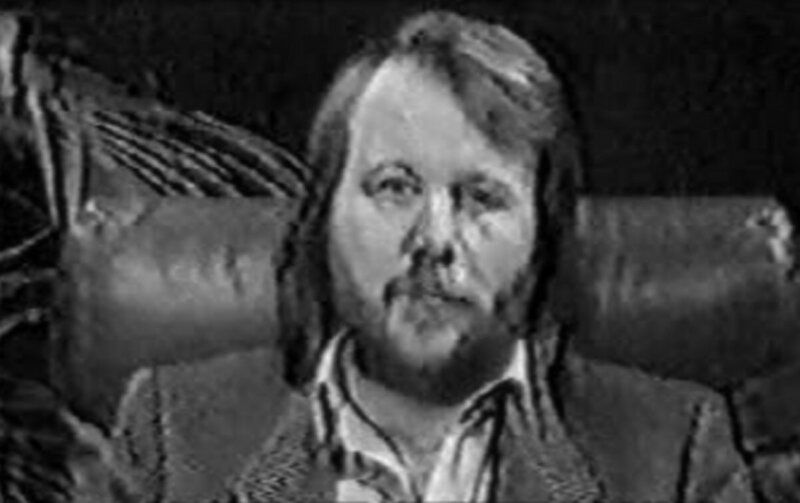 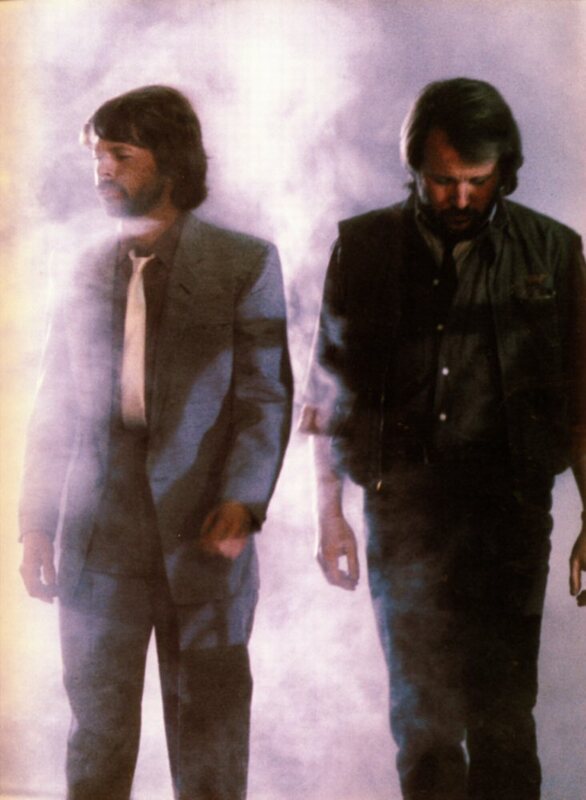 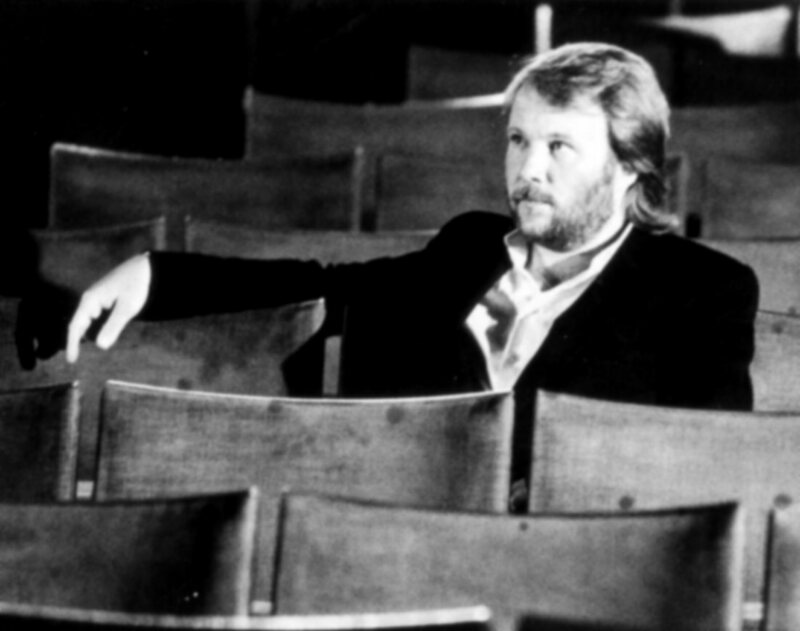 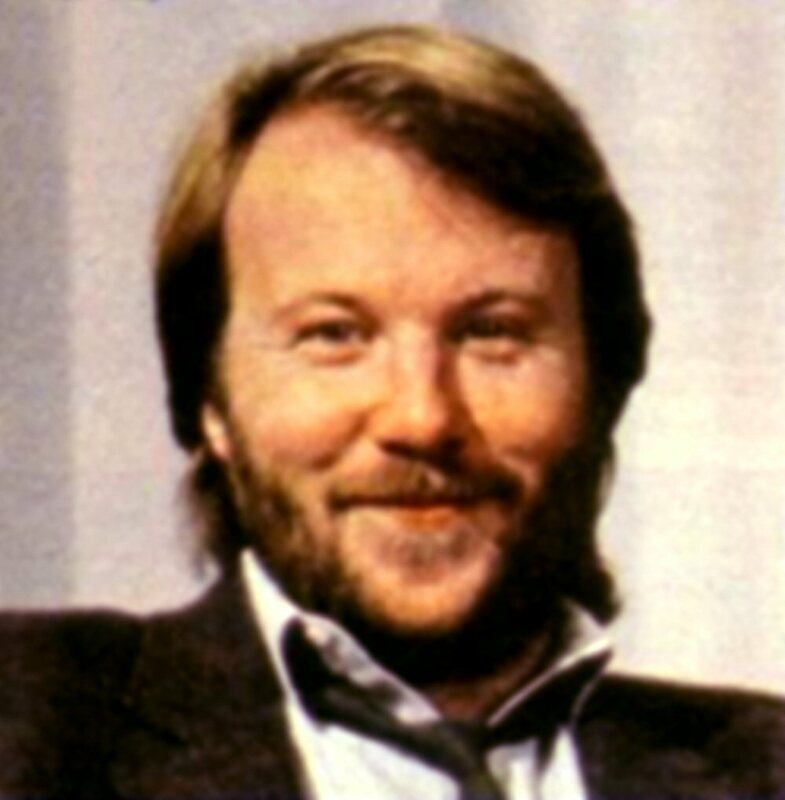 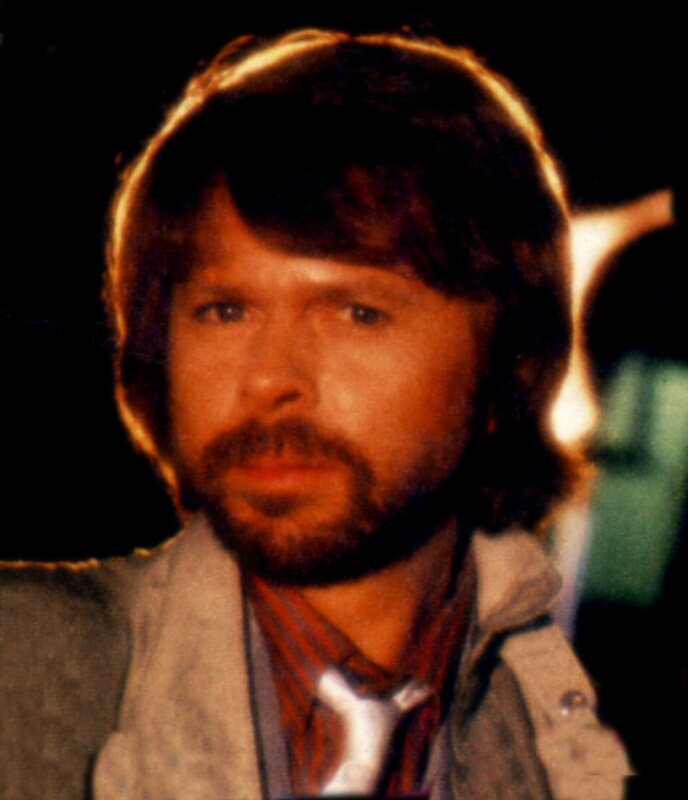 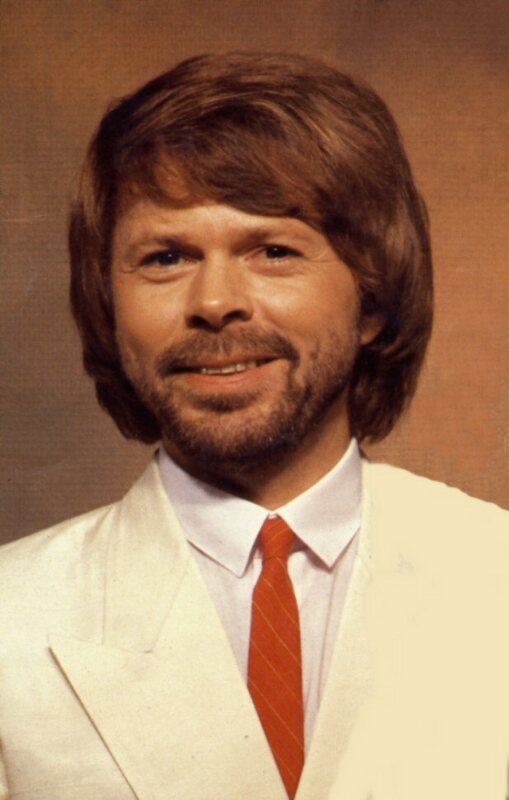 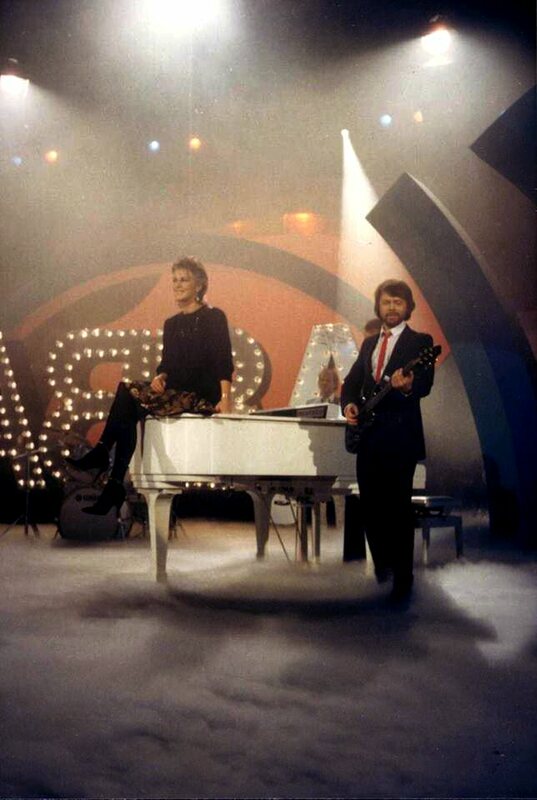 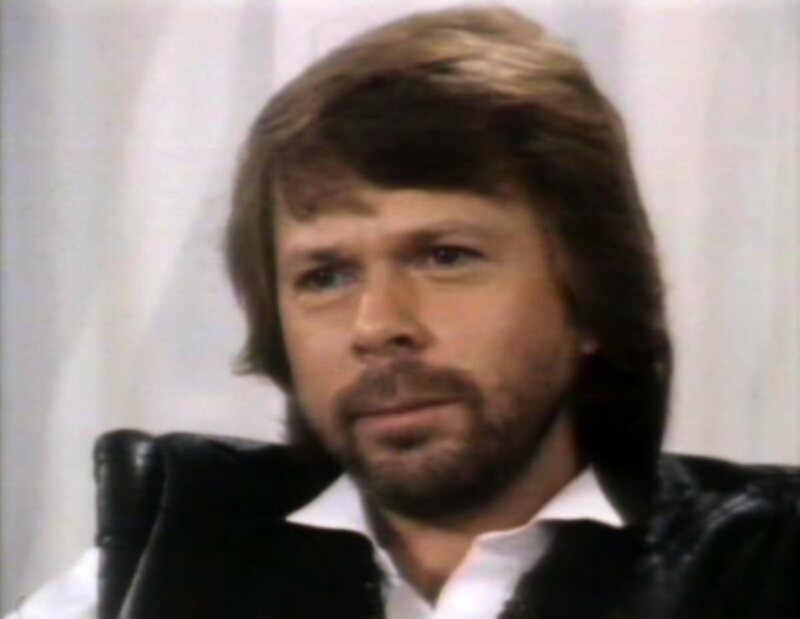 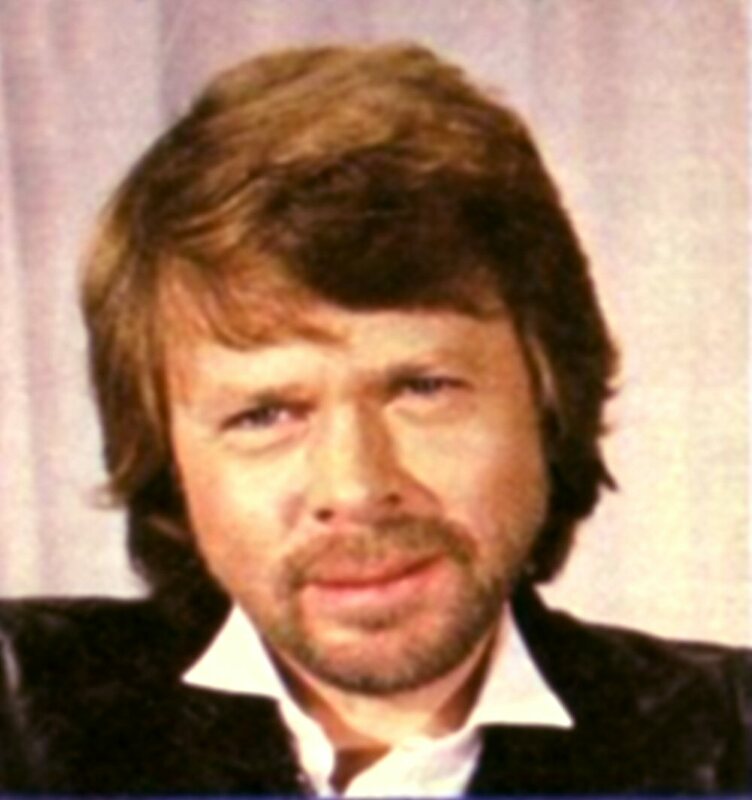 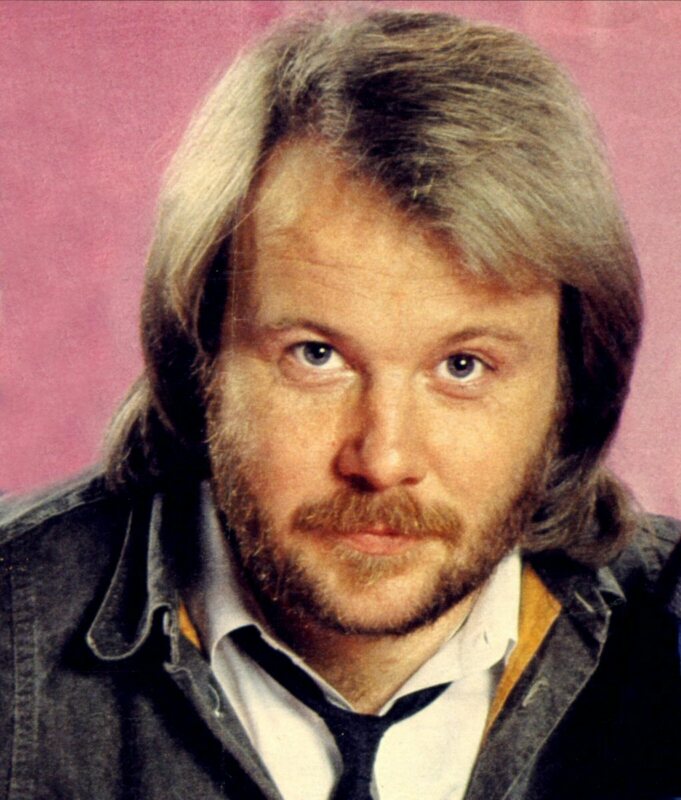 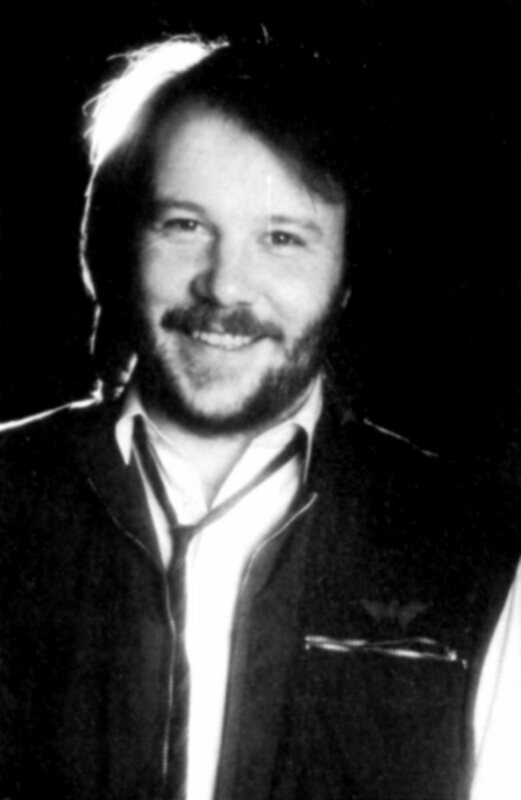 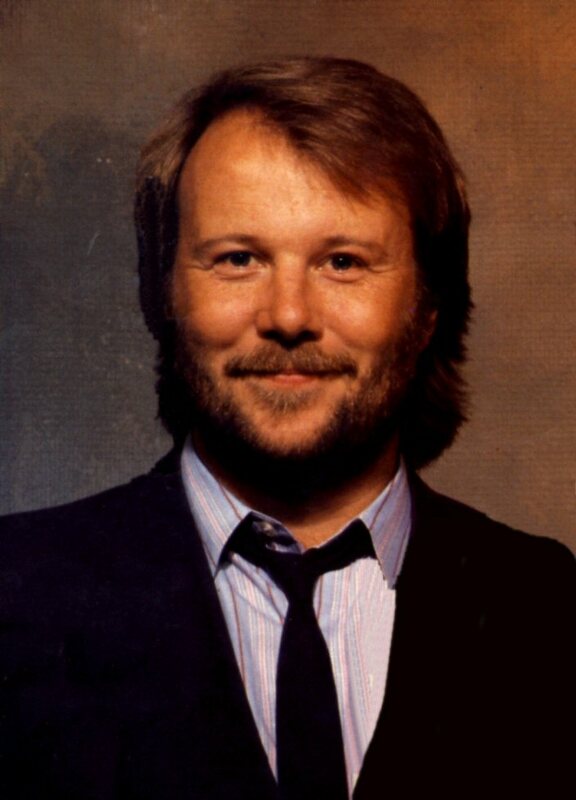 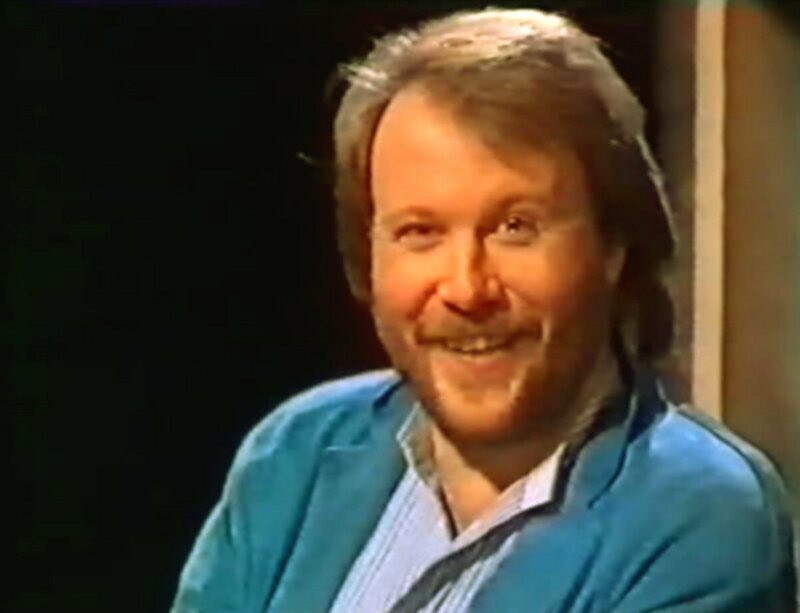 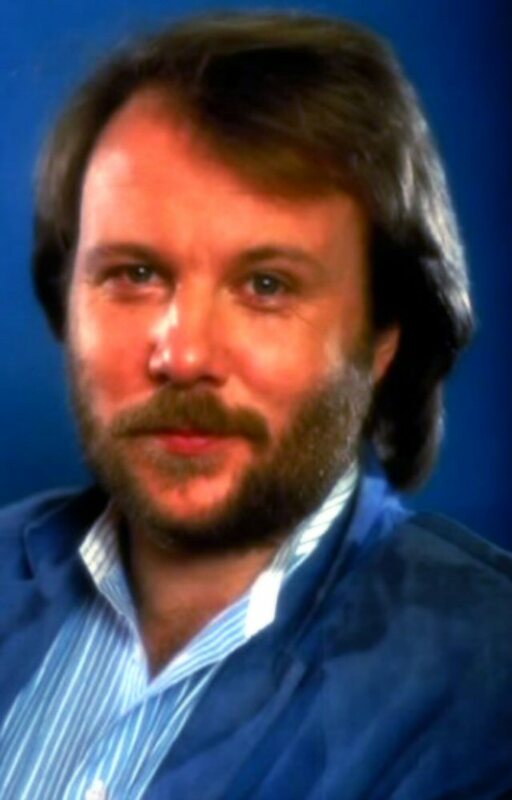 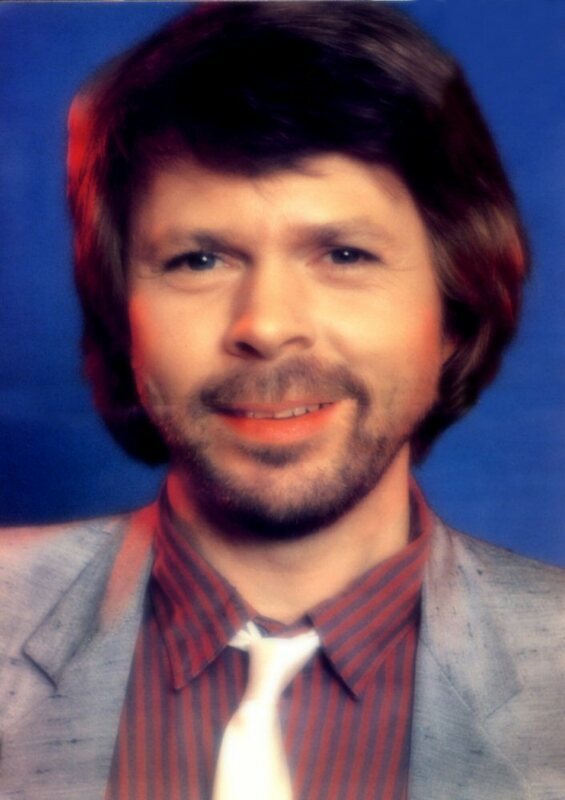 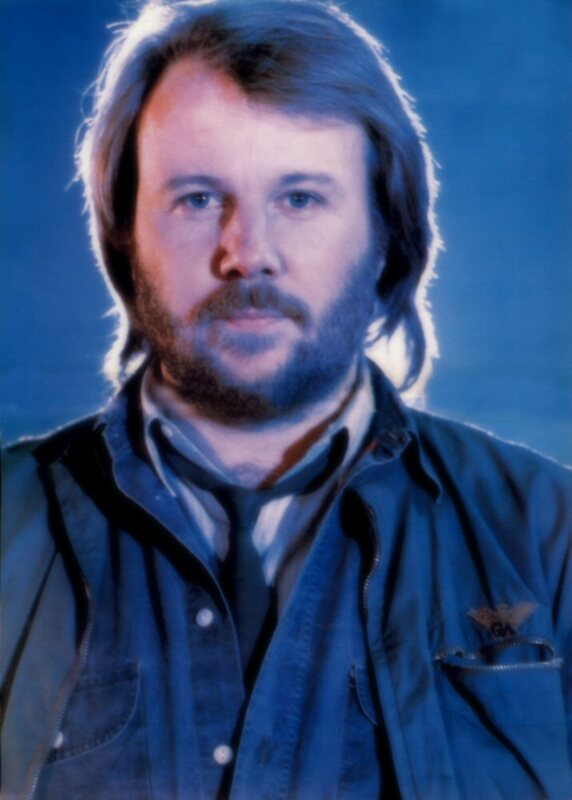 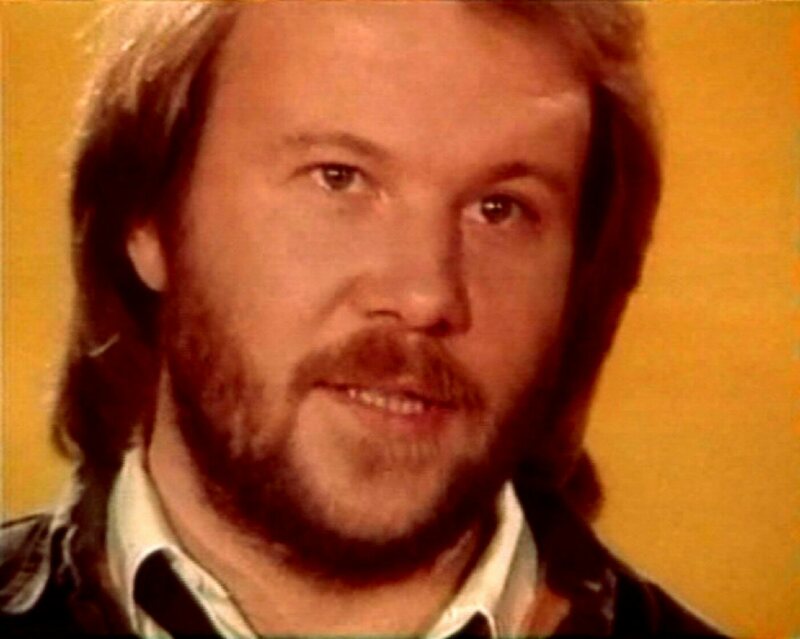 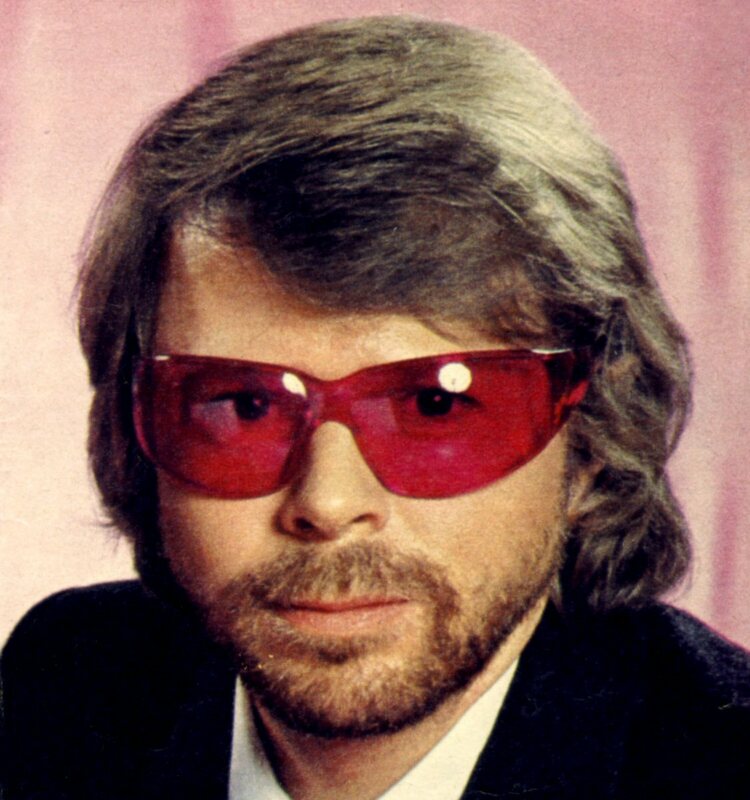 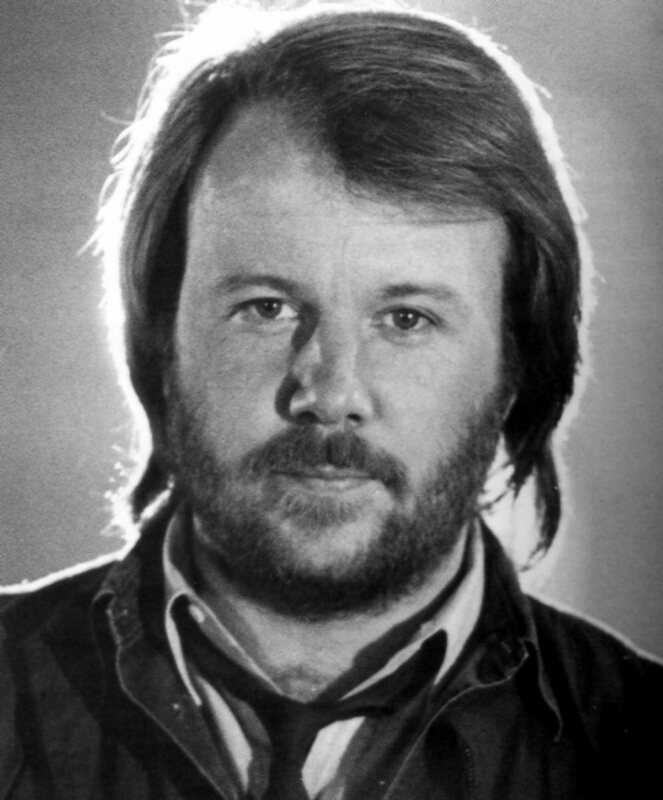 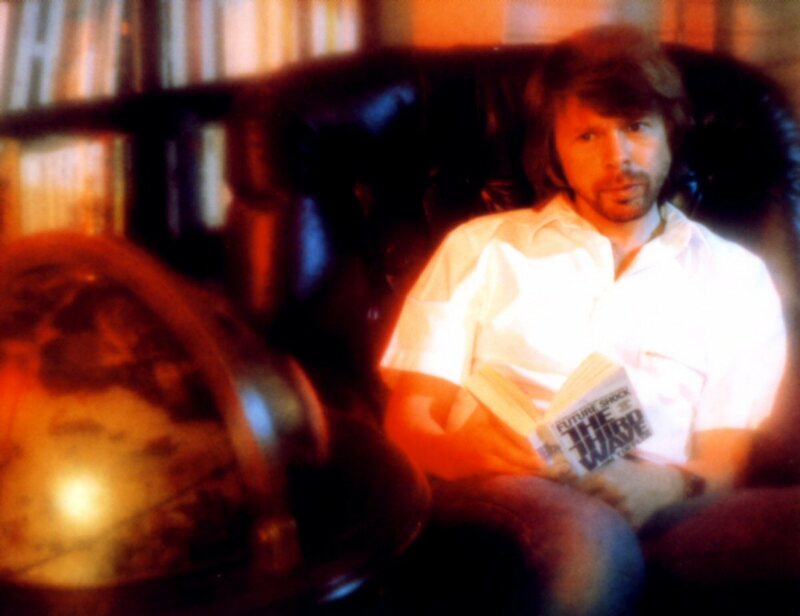 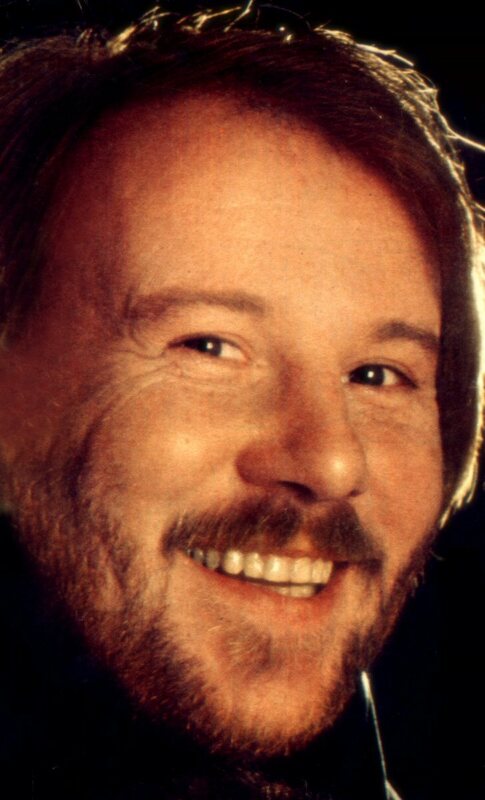 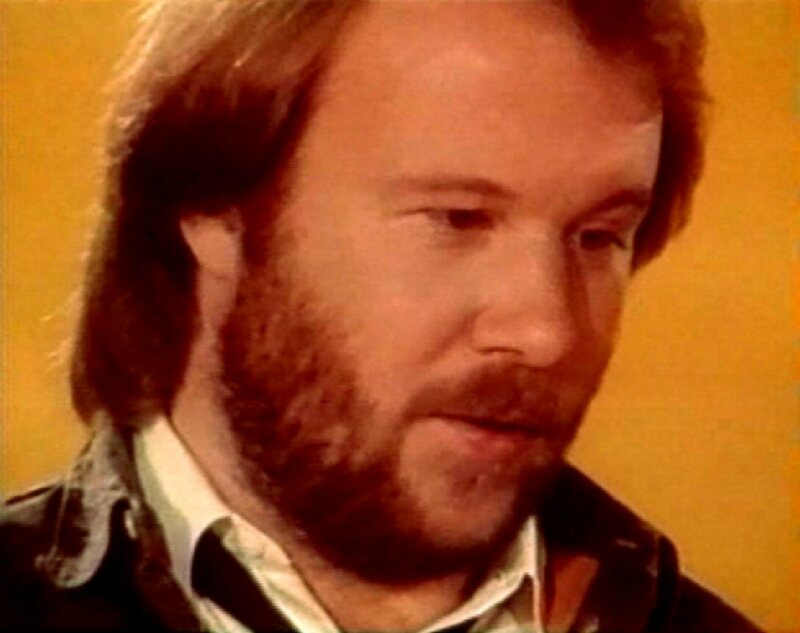 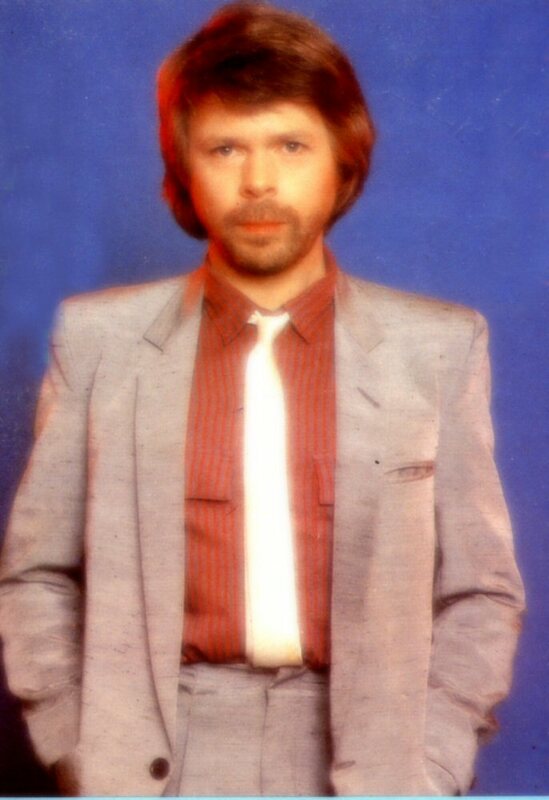 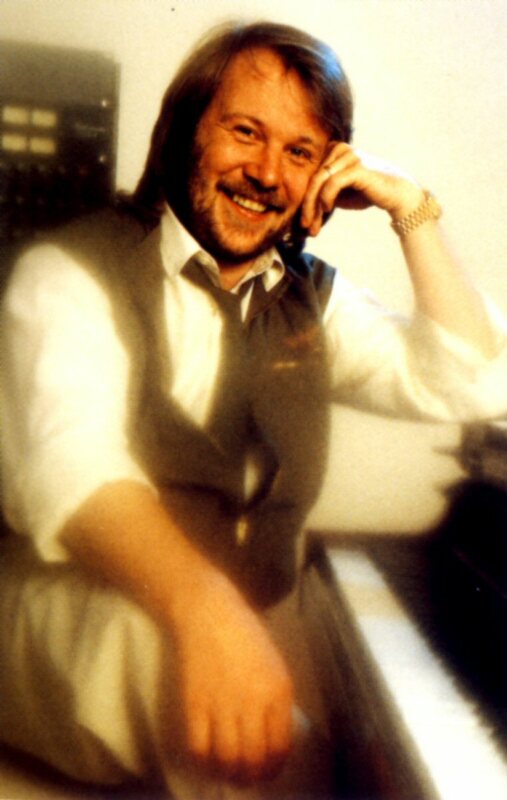 On the Portugese single "Cassandra" was credited only to Benny Andersson. 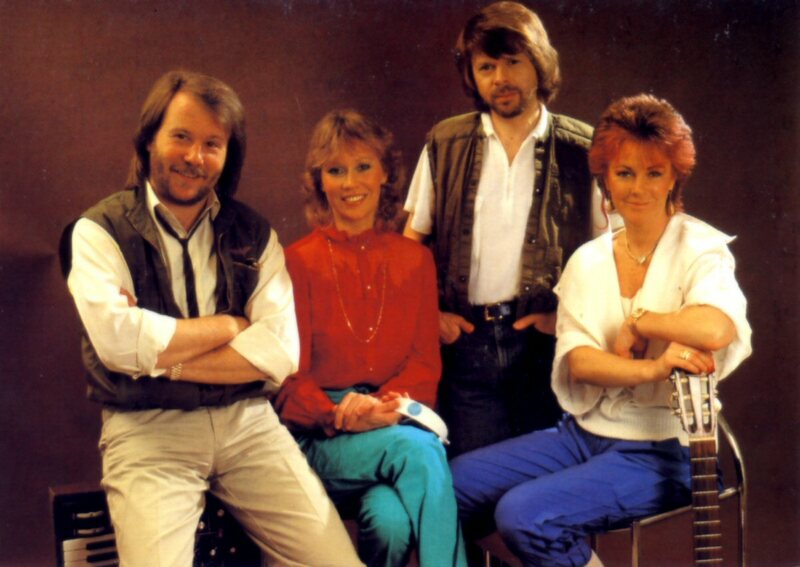 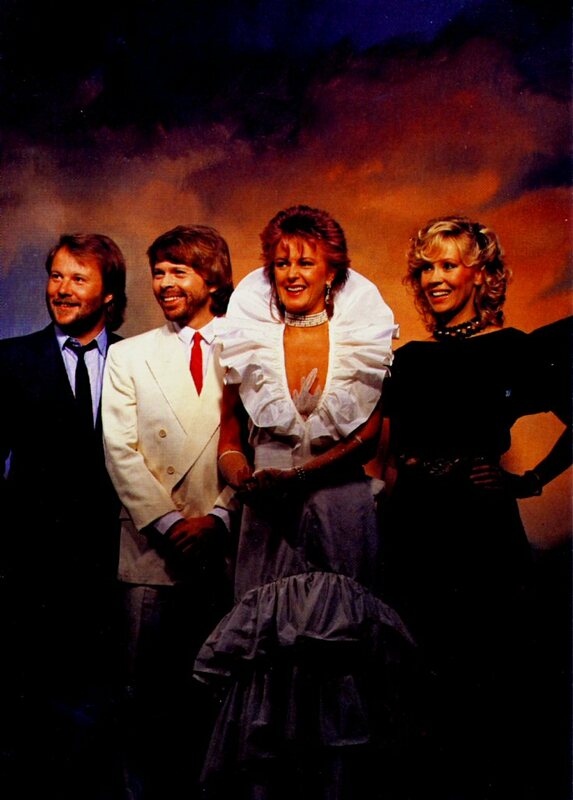 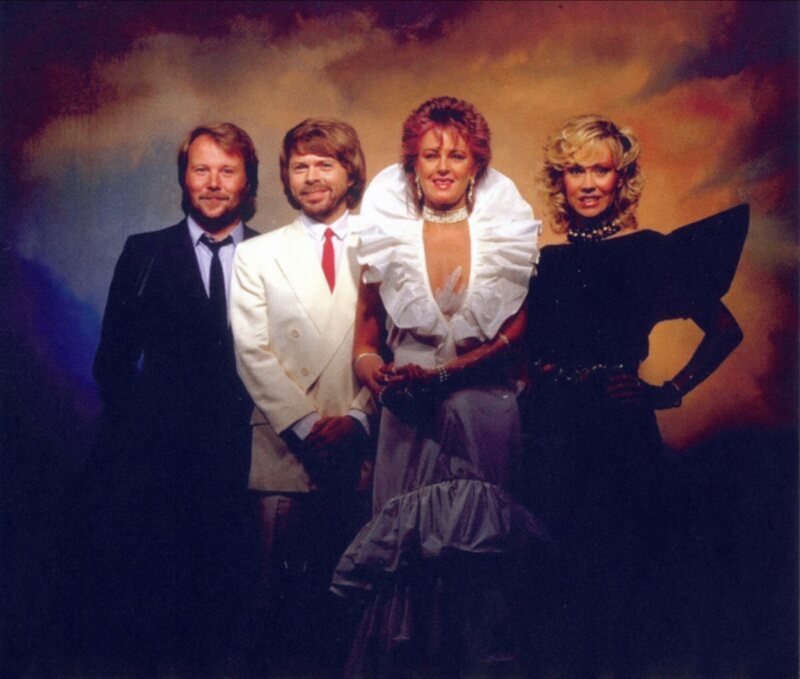 At the end of 1982 a promotional LP "ABBA - A Collection of Hits" saw its release in USA on Atlantic. 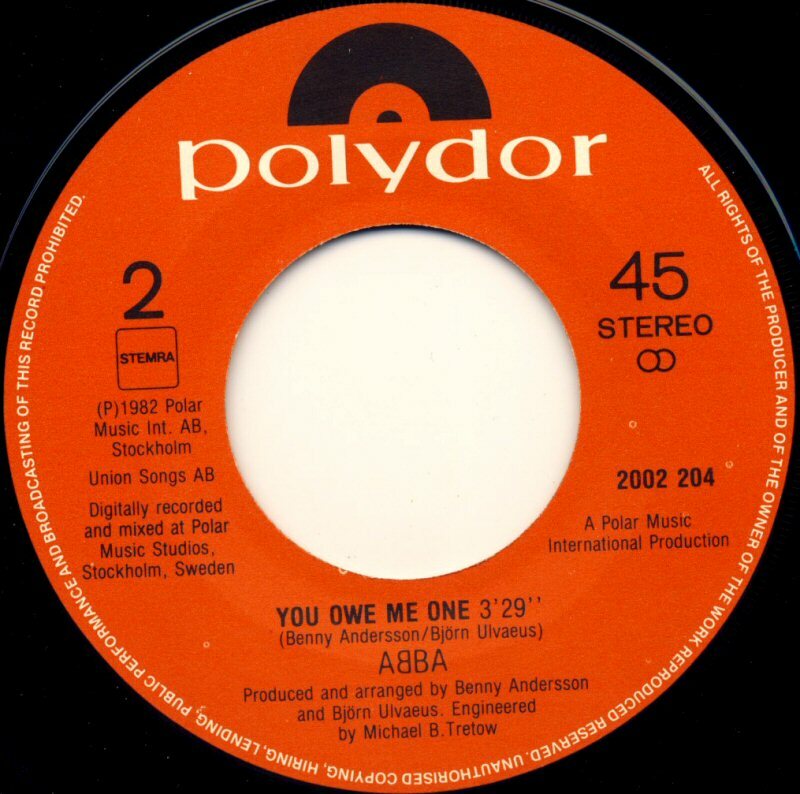 This compilation featured 15 ABBA hits partly edited and remixed. 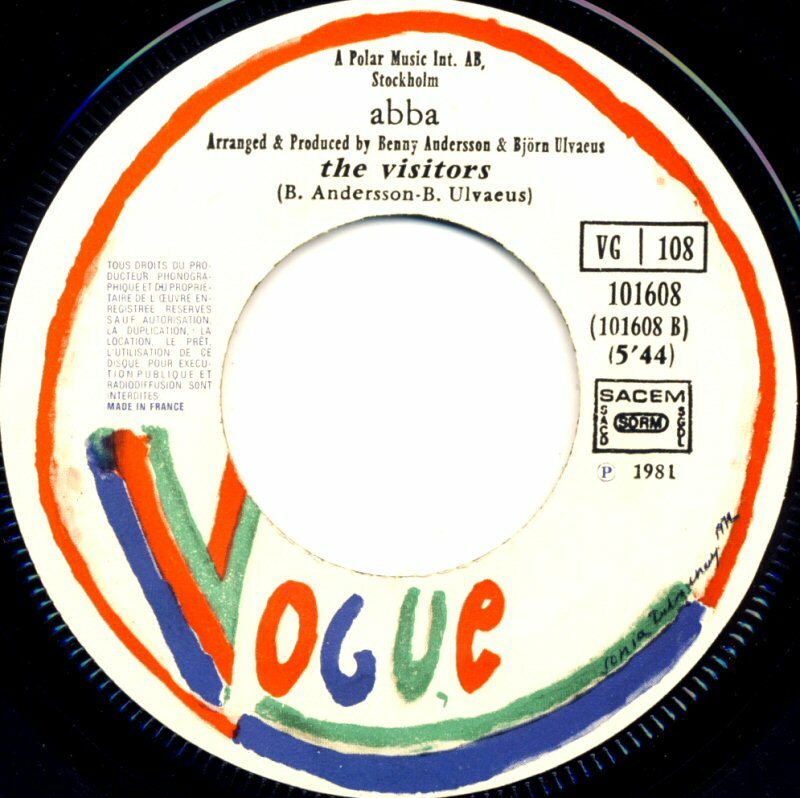 Among the edited songs there was a 3.40 version of "Voulez-Vous", a 4.38 version of "Chiquitita" and a 4.22 version of "The Visitors". 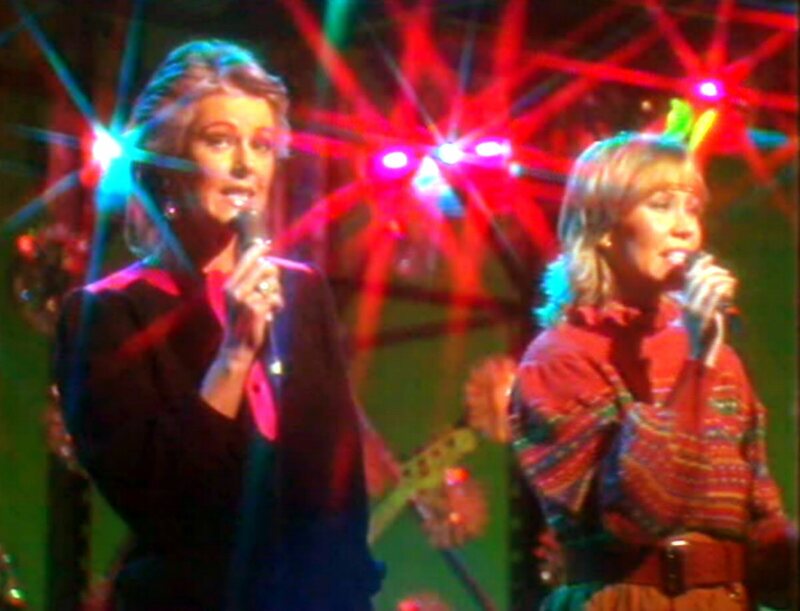 Even "The Winner Takes It All" appeared in a partly shortened version. 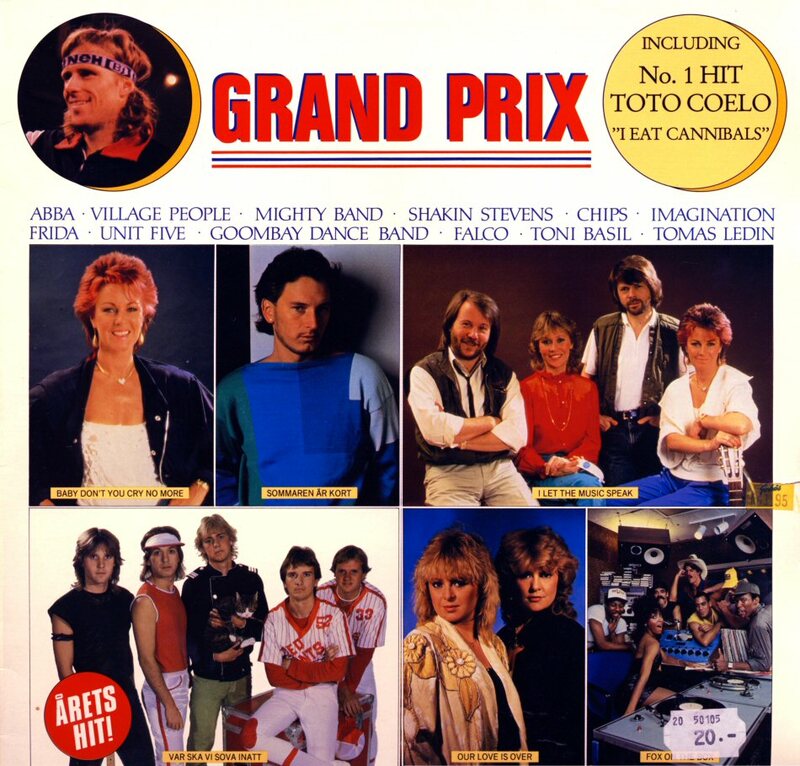 The Swedish record company Marianne released a compilation album "Grand Prix" in 1982. 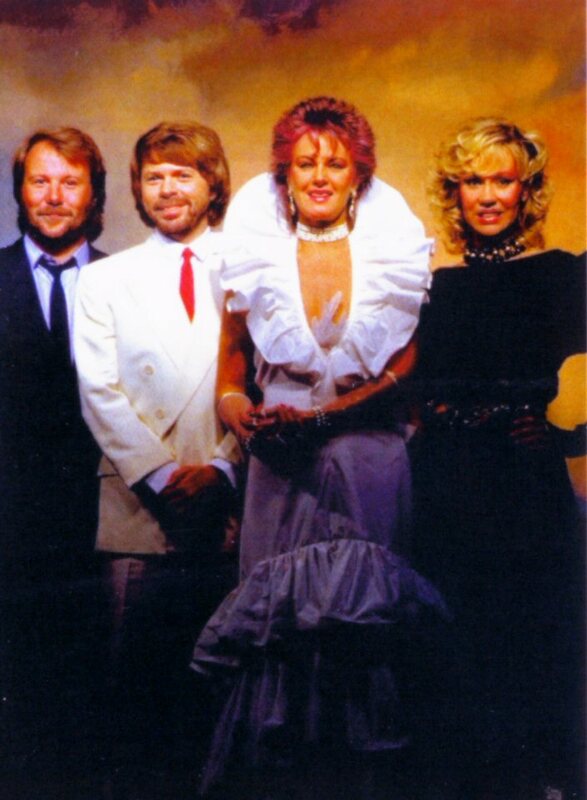 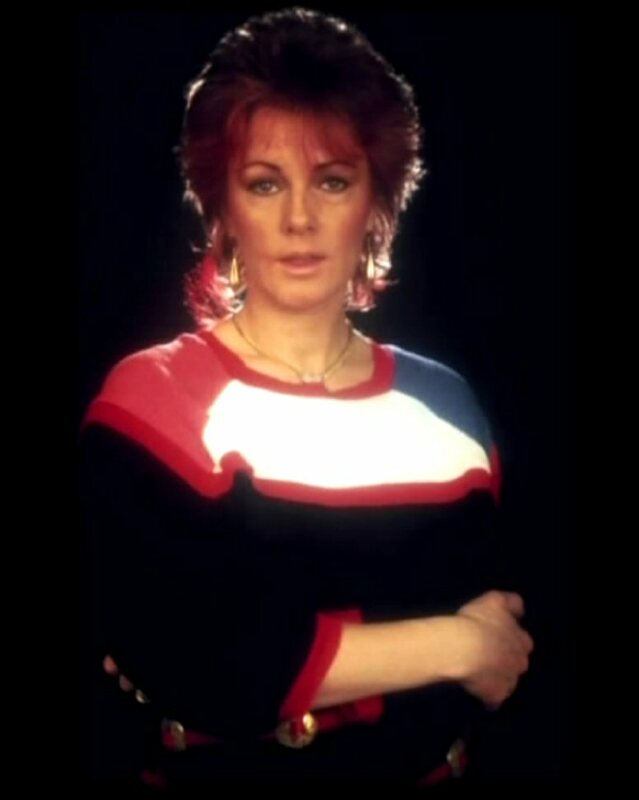 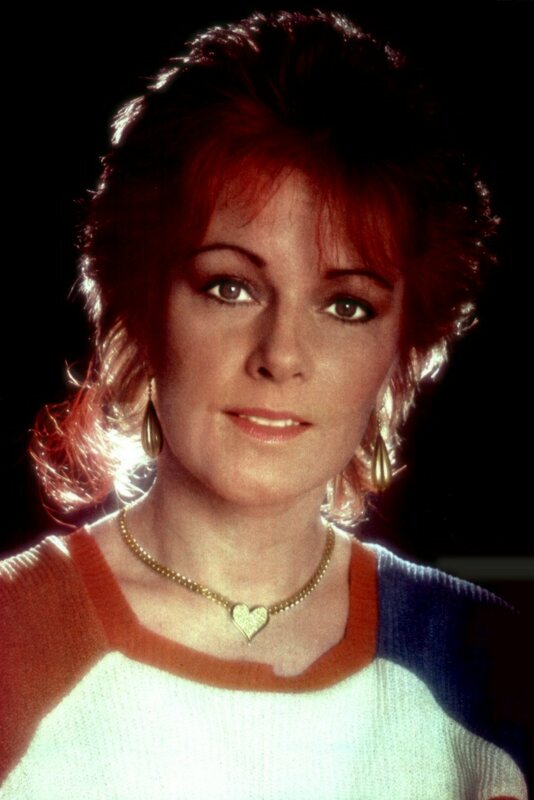 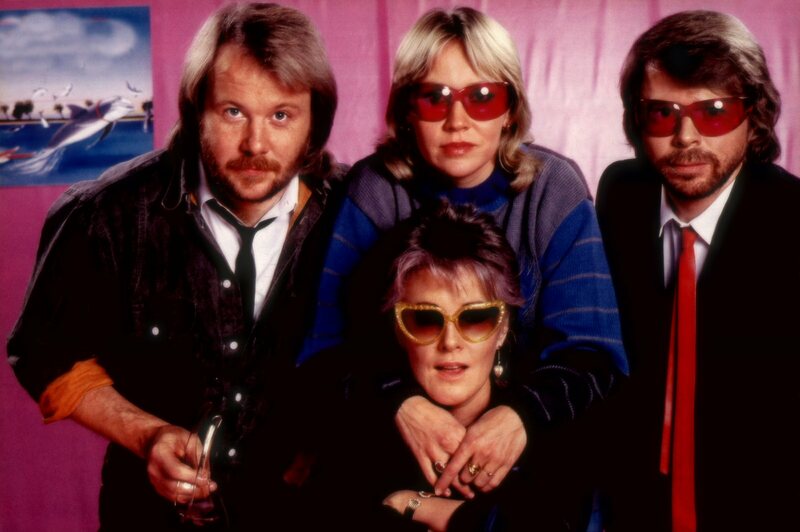 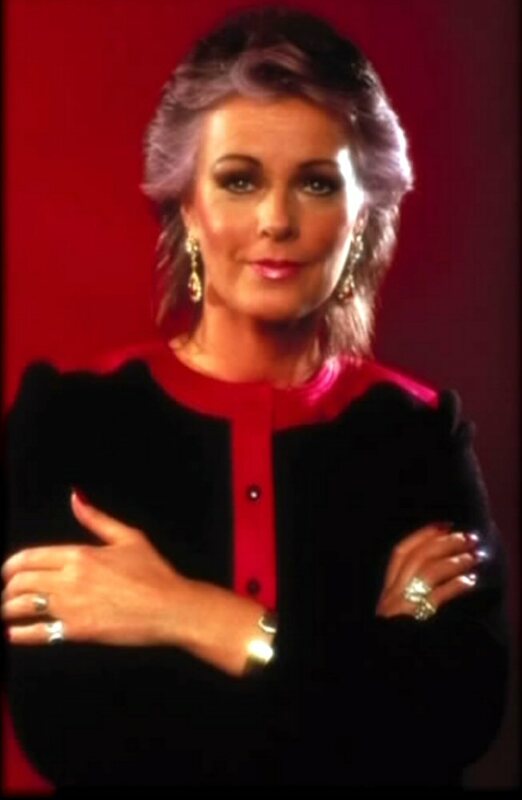 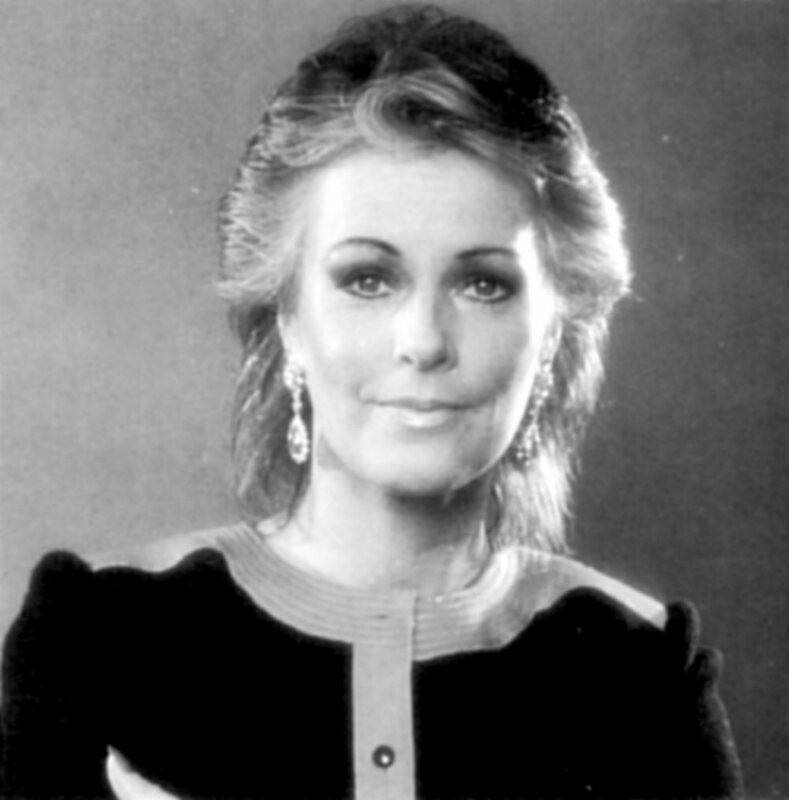 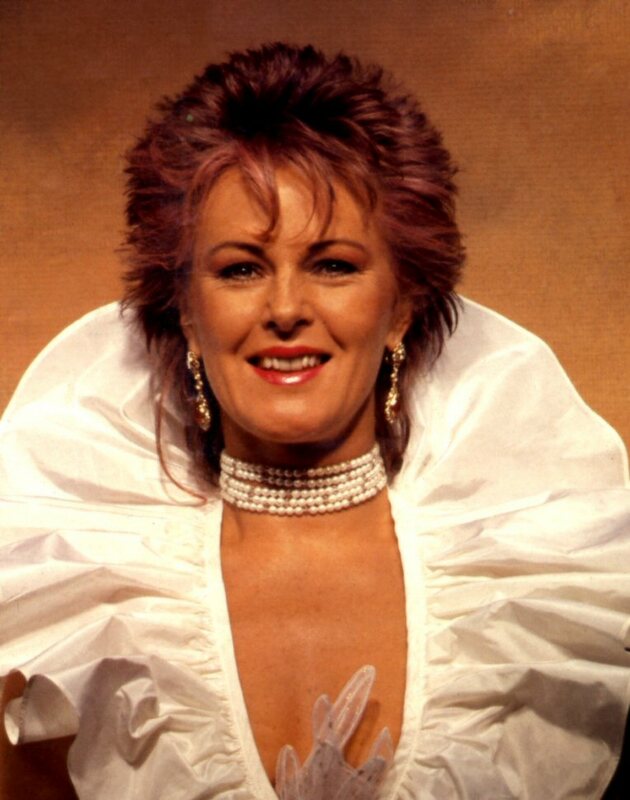 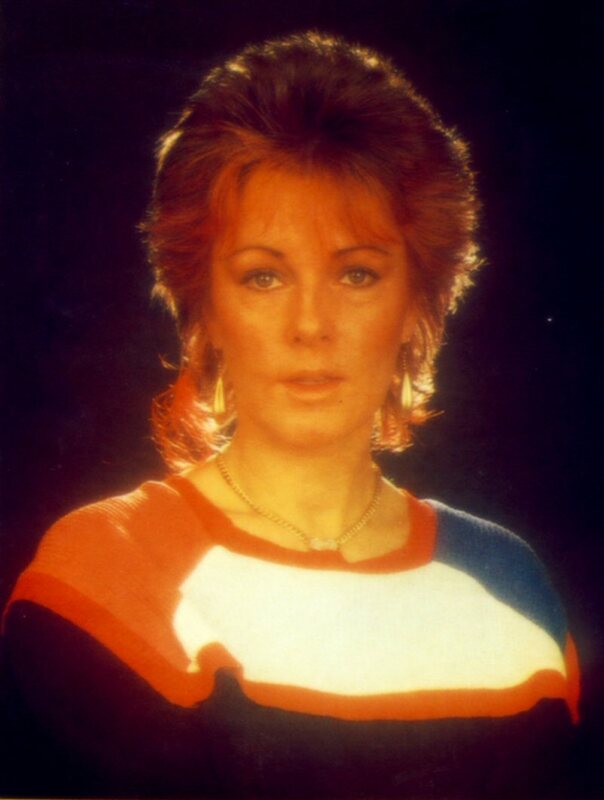 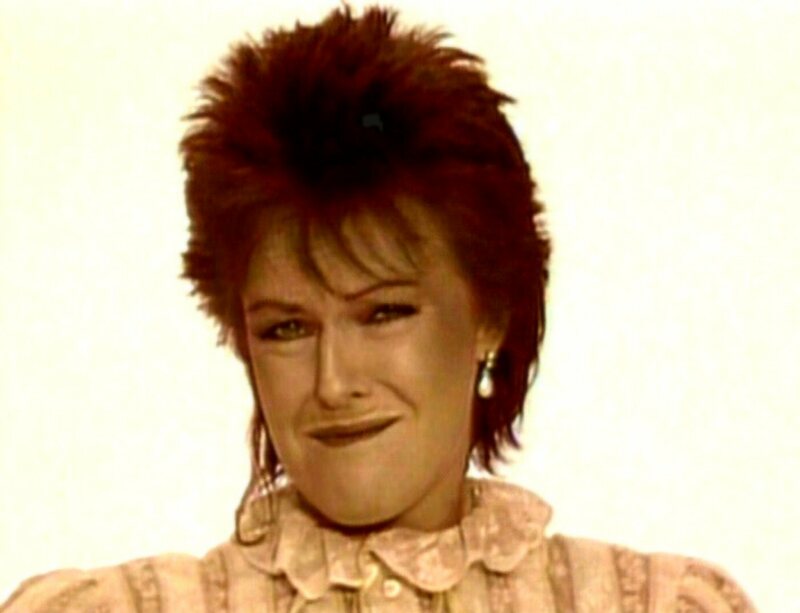 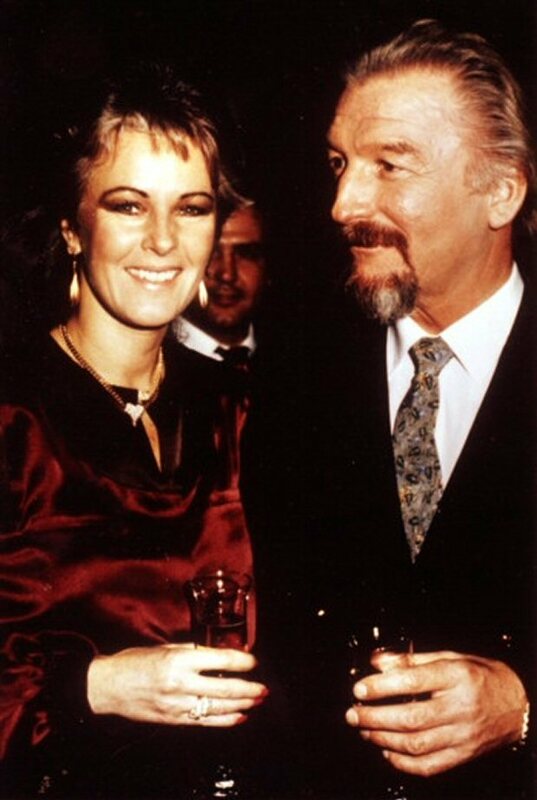 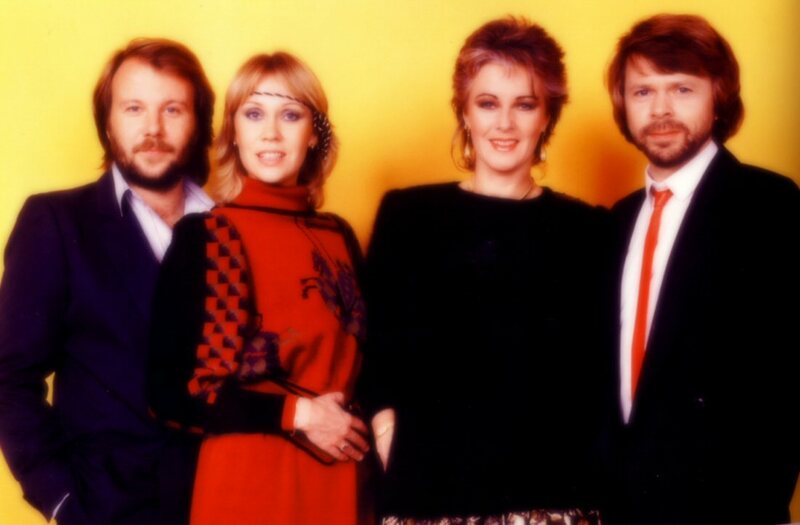 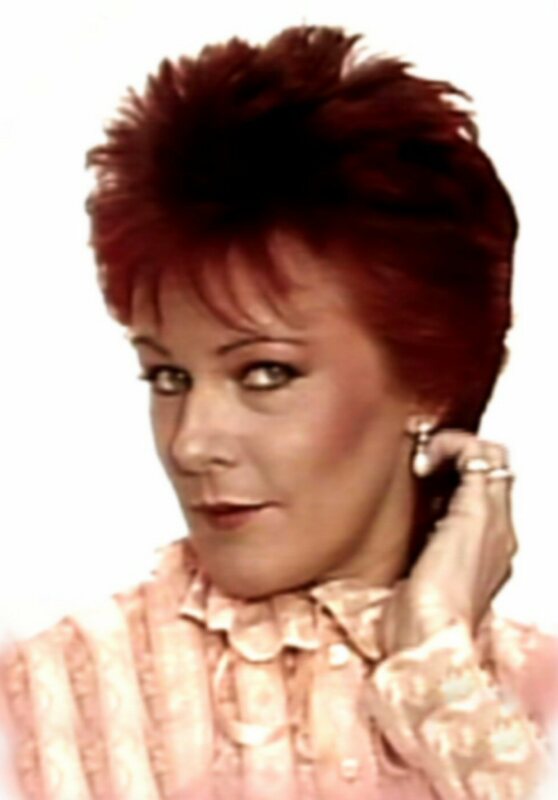 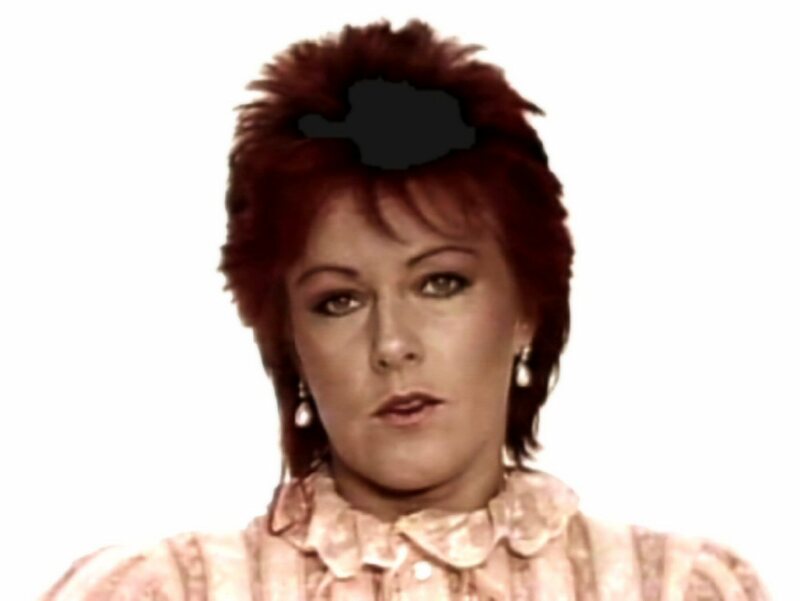 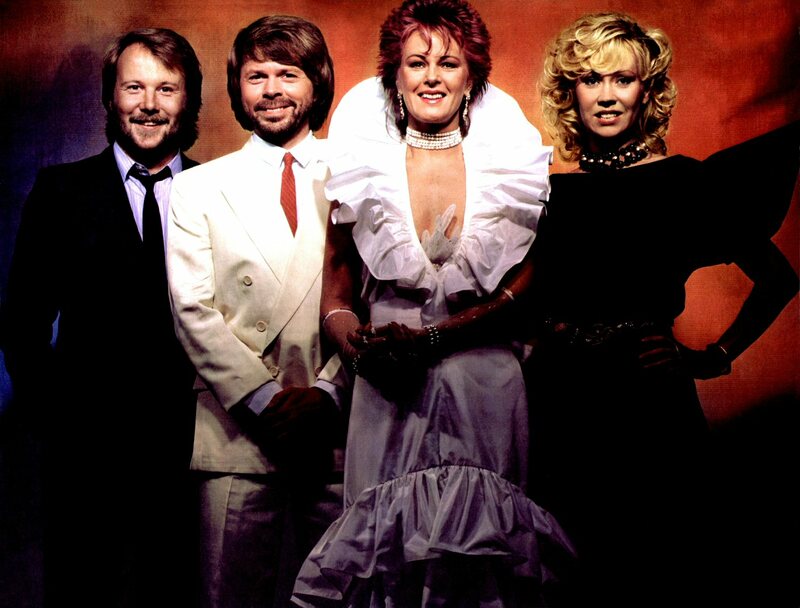 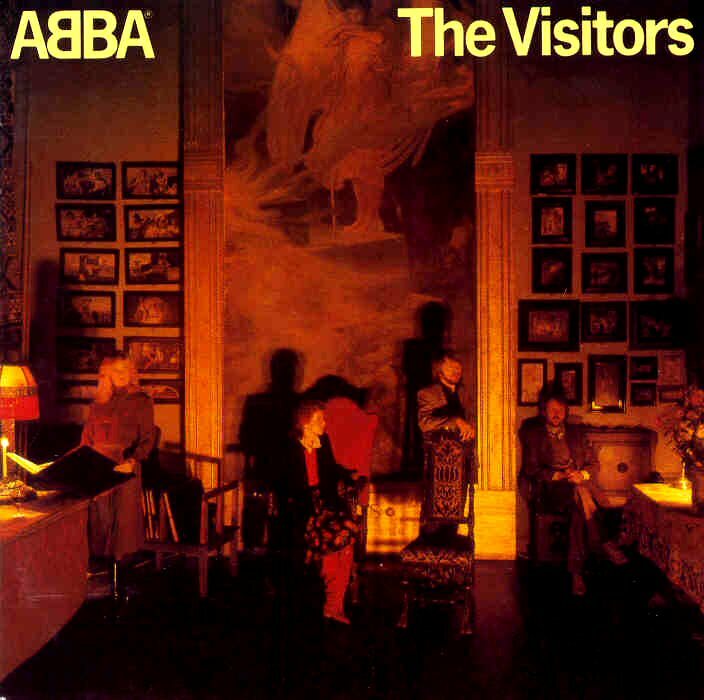 The album's opening track was Frida's "Baby Don't You Cry No More" and ABBA was represented by "I Let The Music Speak" from the 1981 album "The Visitors". 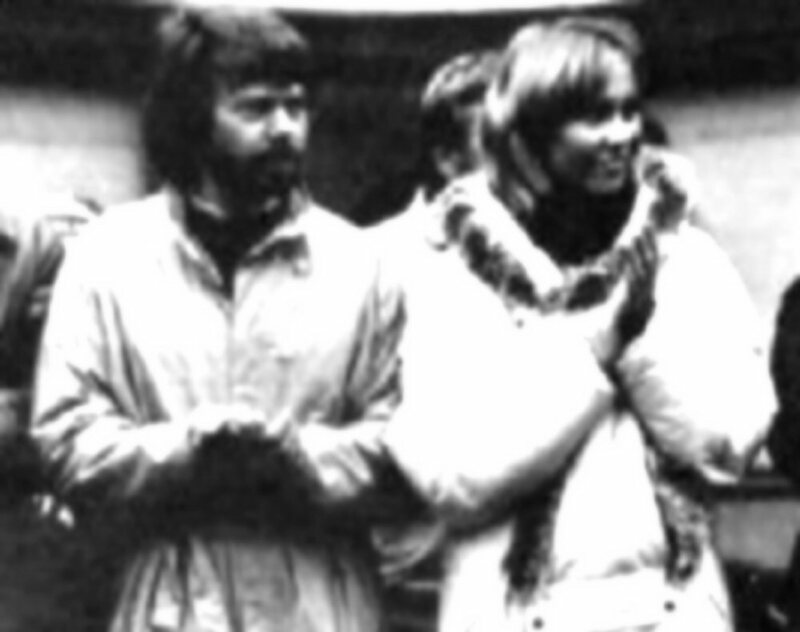 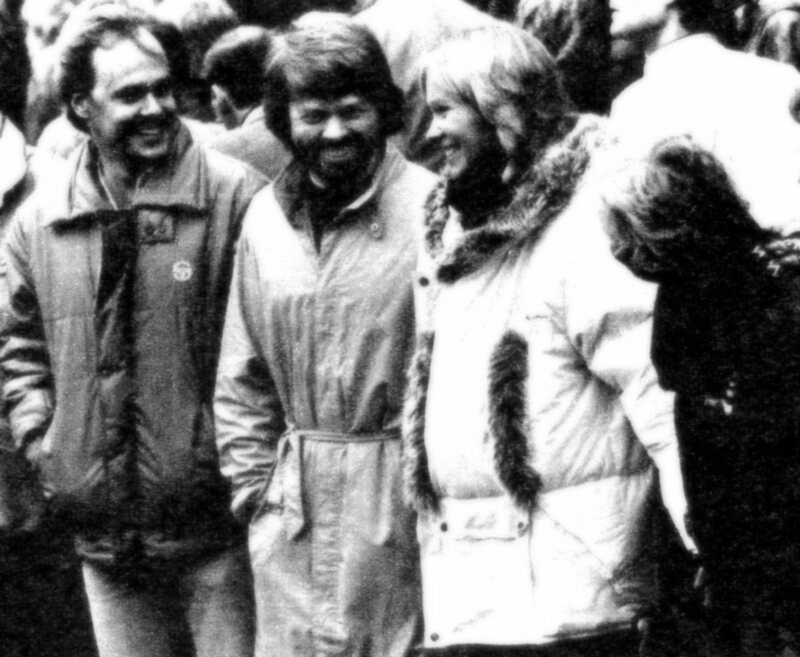 Agnetha and Björn participated in the peace manifestation in Stockholm on October 24th, 1982 (the United Nations day). 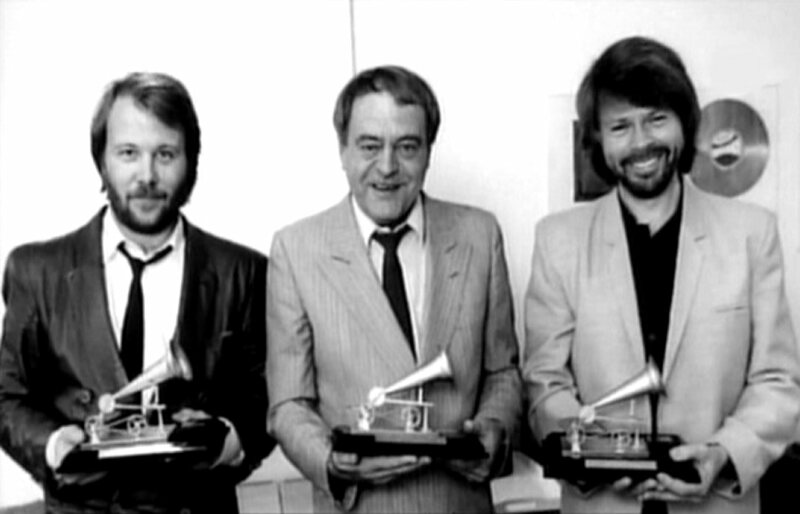 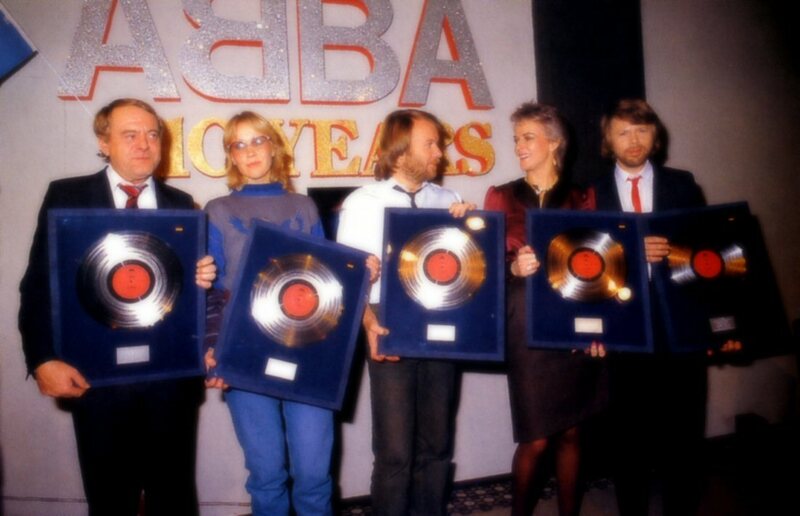 In 1982 ABBA were honoured with the prestigious "Golden Gramophone Award" for their success as Polydor's top selling act in 1981. 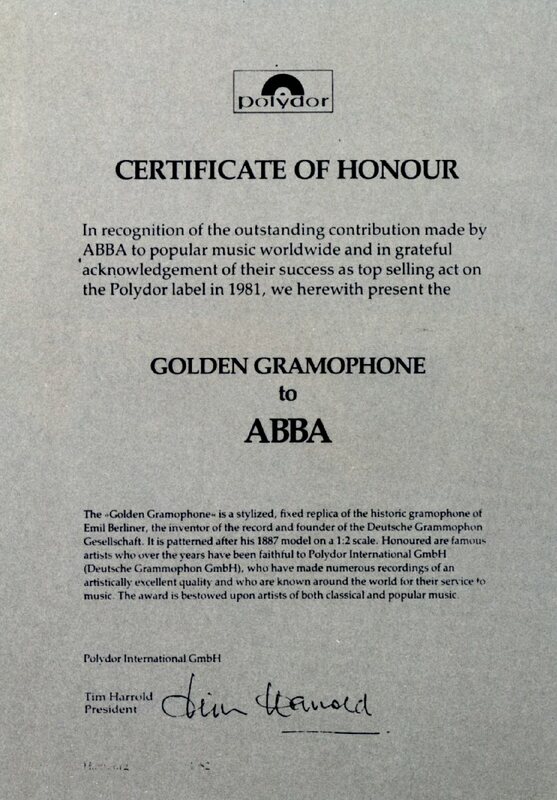 The Golden Gramophone went mainly to classical artists in Germany. 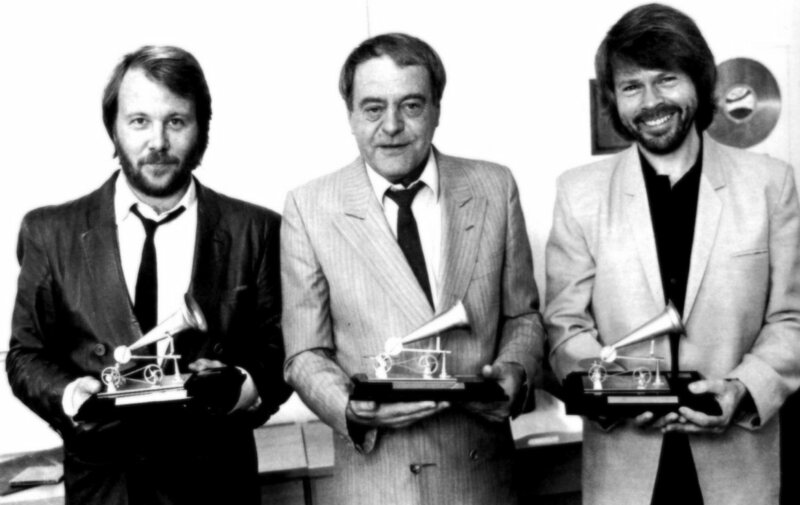 This was the first time five of the gramophone replicas went to an act outside Germany. 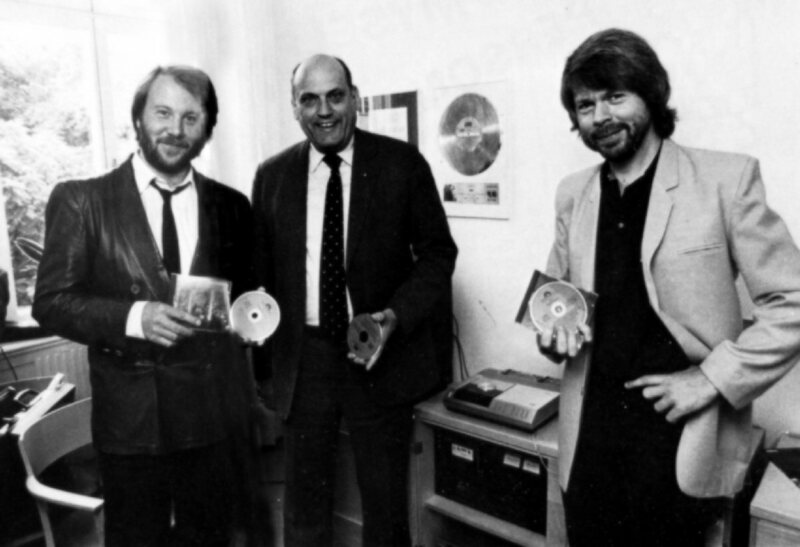 Björn and Benny were invited to listen to a new record played called Compact Disc Digital Audio System. 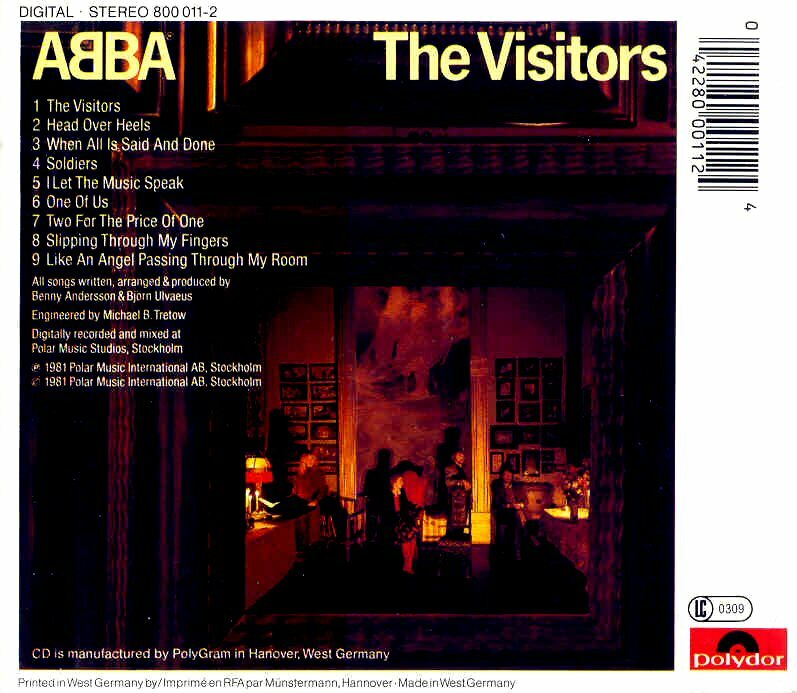 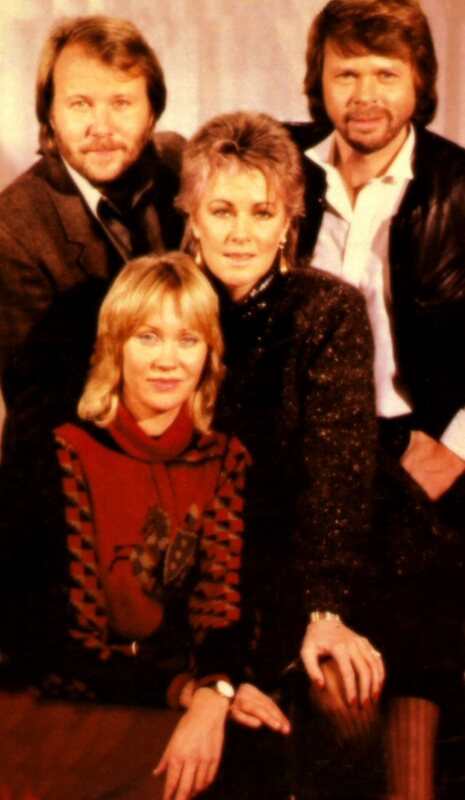 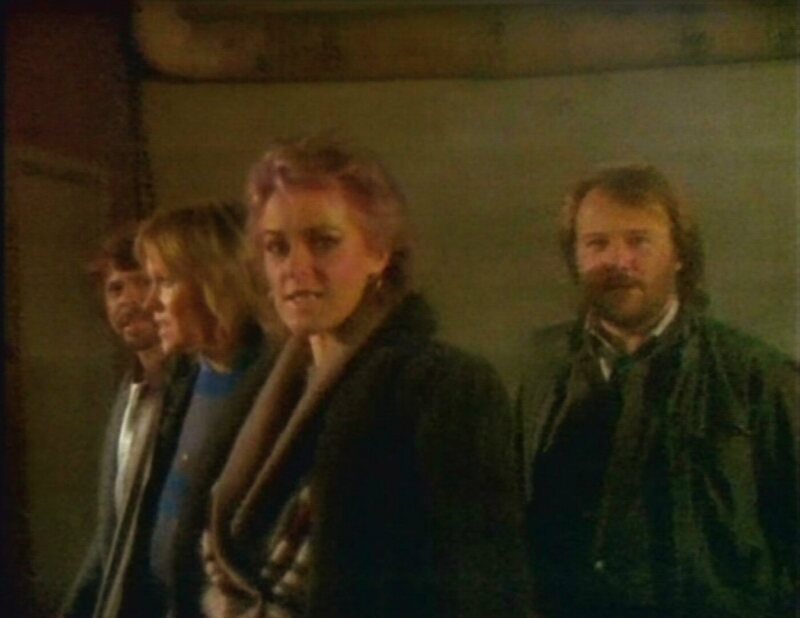 "The Visitors" was the first ABBA album which was issued on CD by Polydor in West Germany in the autumn of 1982. 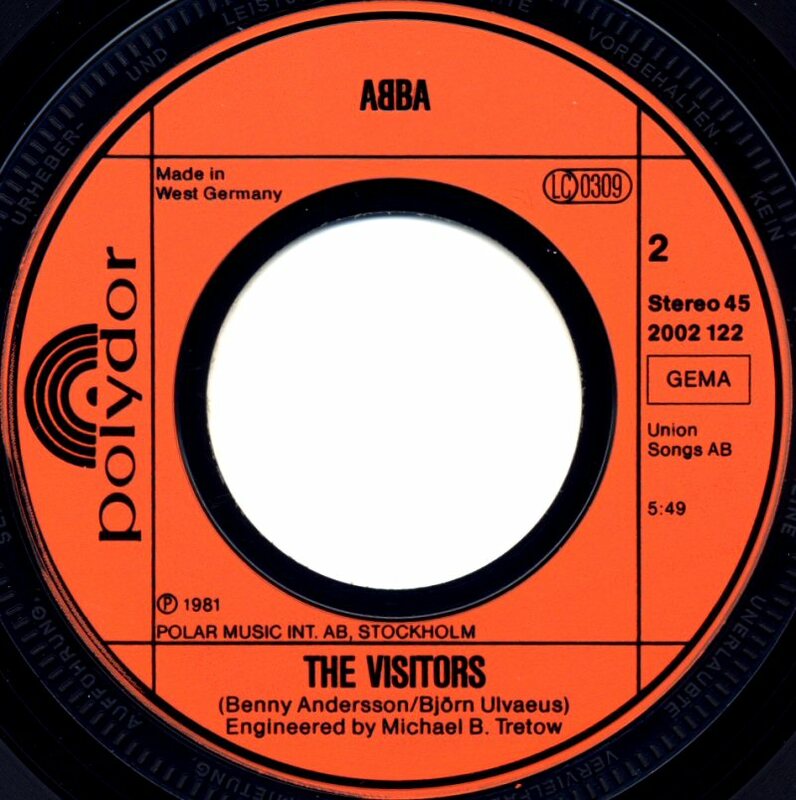 In Great Britain the CD release of "The Visitors" had to wait until March 1983. 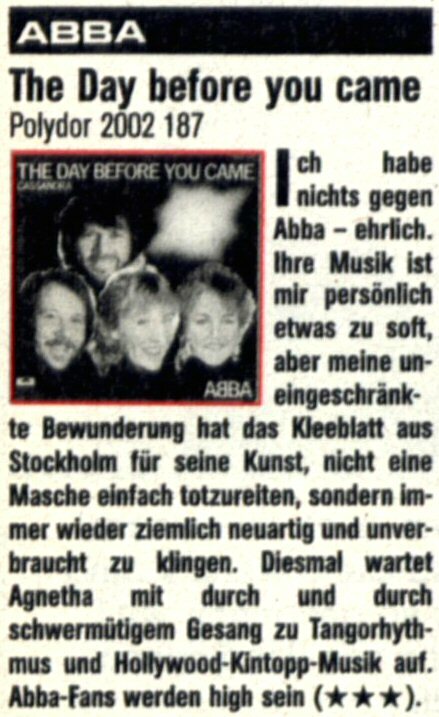 While they were listening to the album they heard a fault in one of the tracks (unknown which one) which they thought was a fault on the disc. 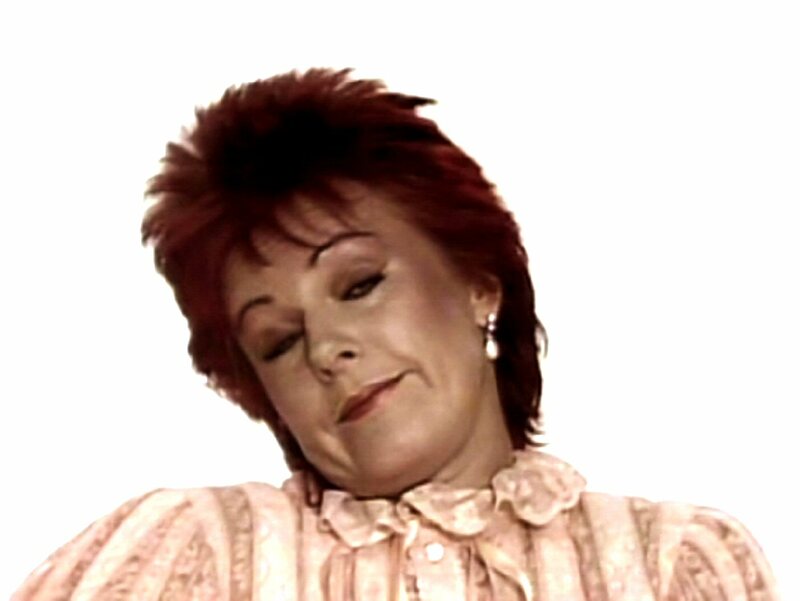 But not - the fault was in the recording! 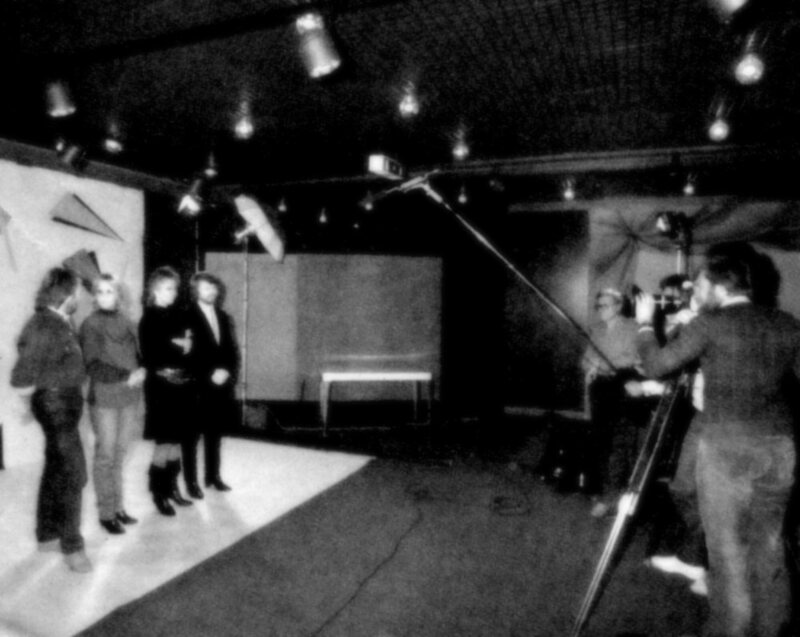 The engineers explained that that section had been mastered conventionally without the use of digital gear. 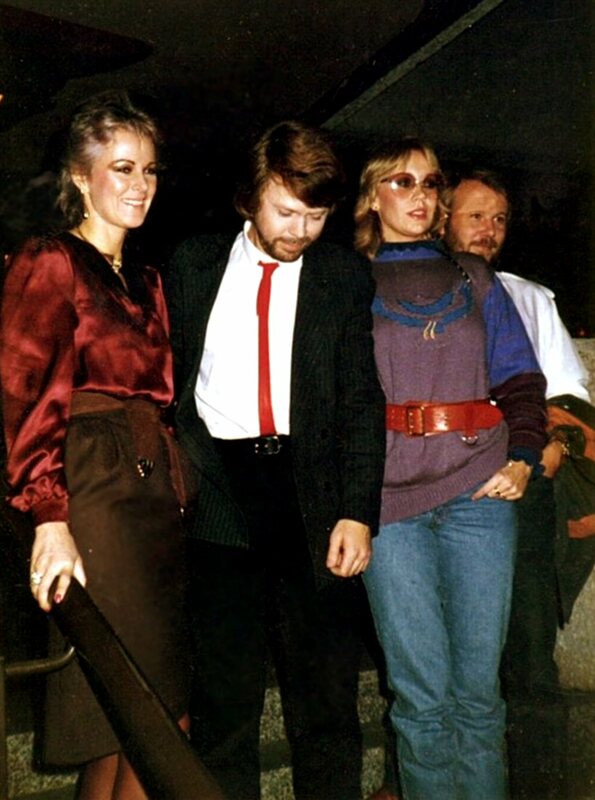 ABBA went to Great Britain to celebrate their 10 years' anniversary and promote the album "The Singles - The First Ten Years". 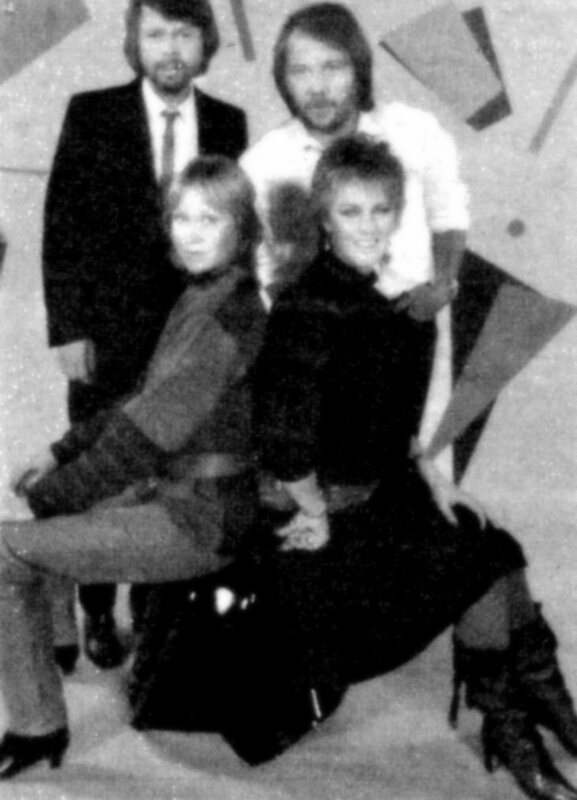 They gave interviews, participated in TV shows "Saturday Superstore" and "The Late Late Breakfast Show". 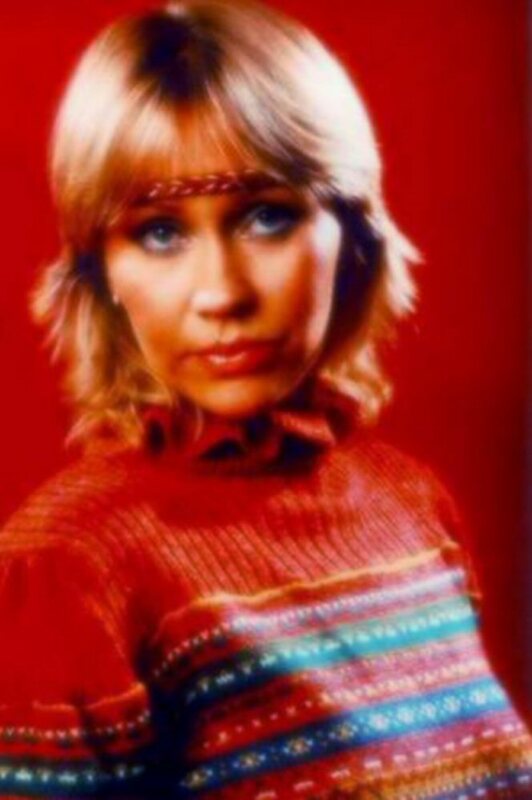 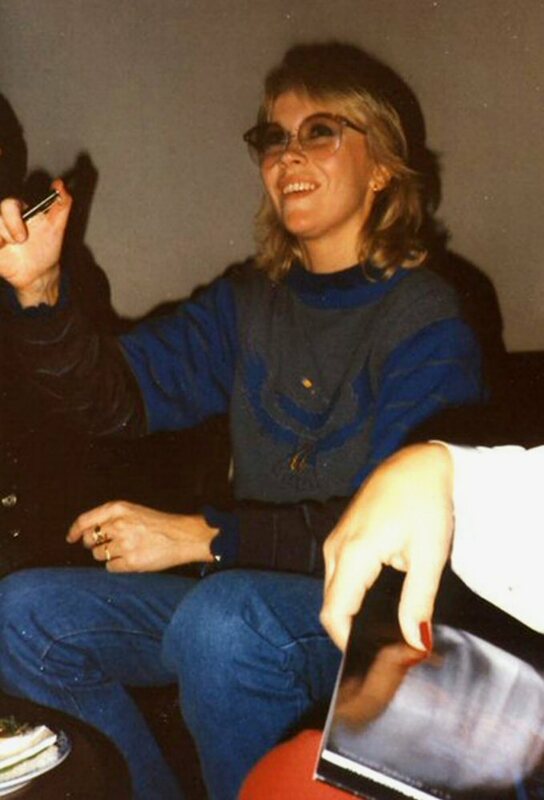 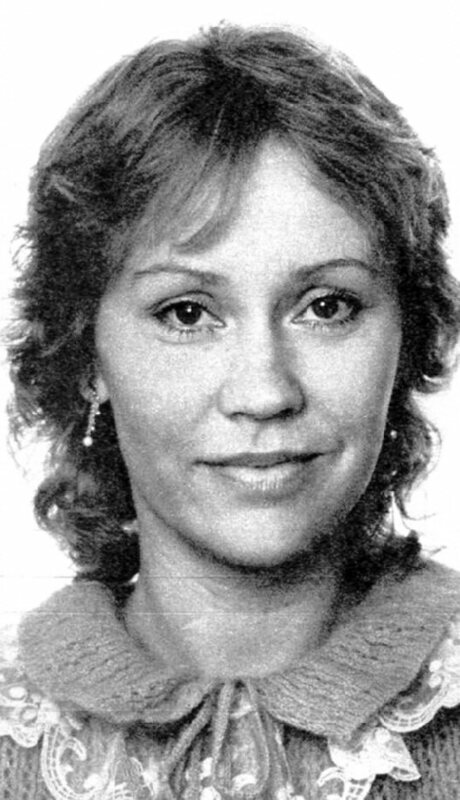 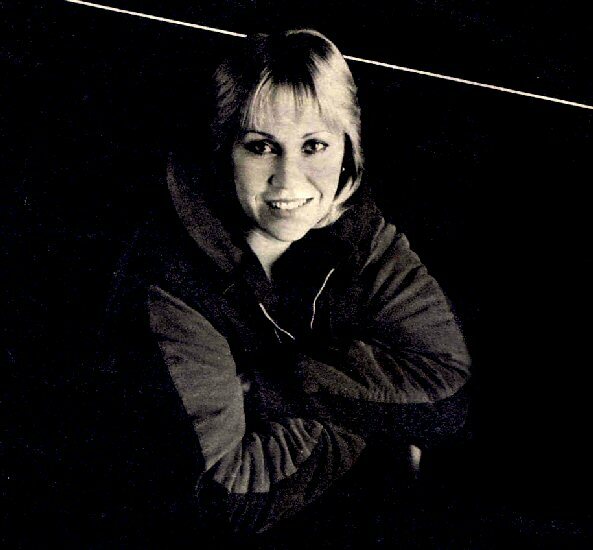 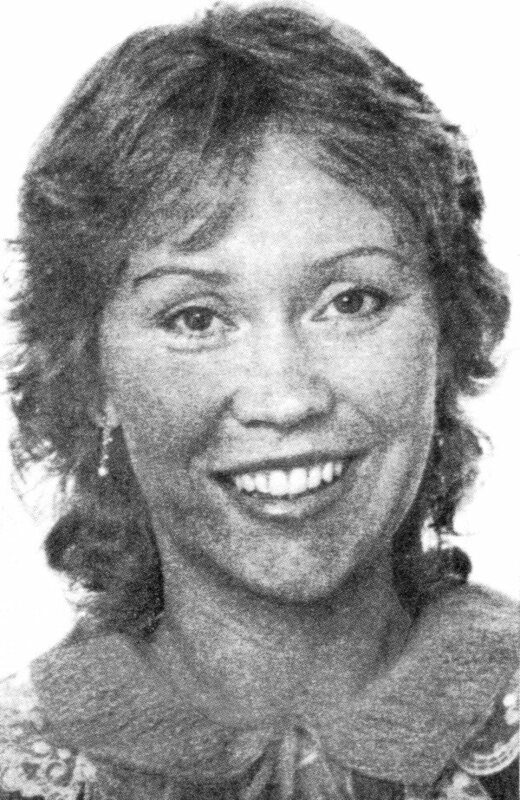 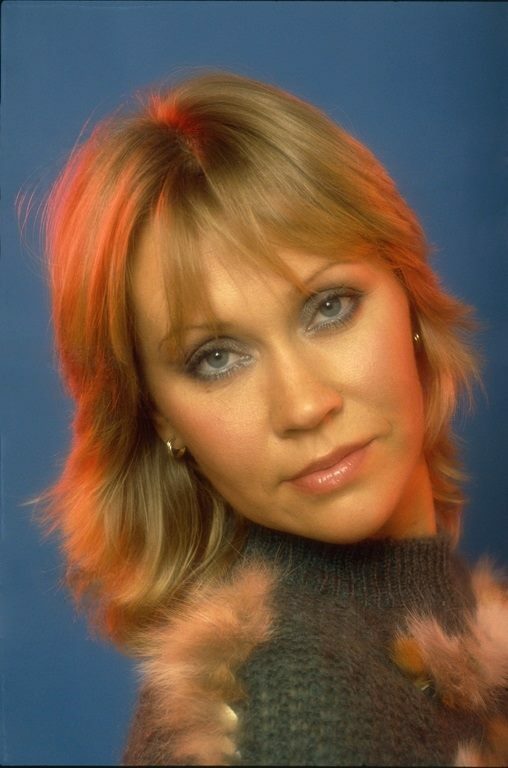 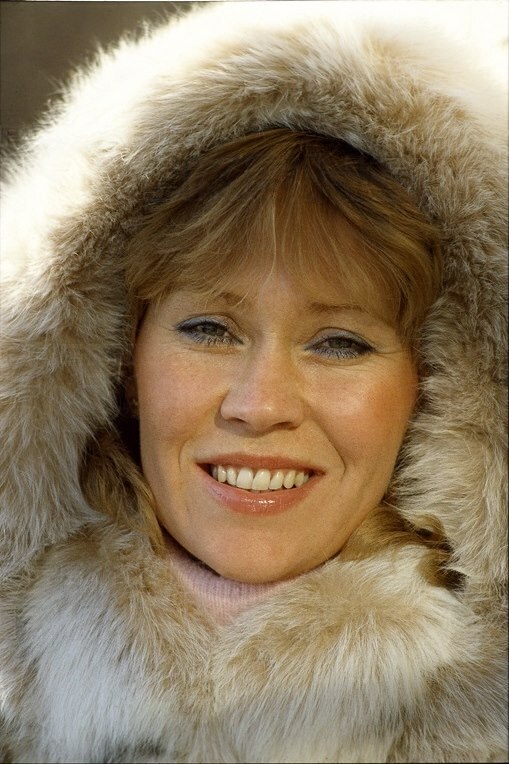 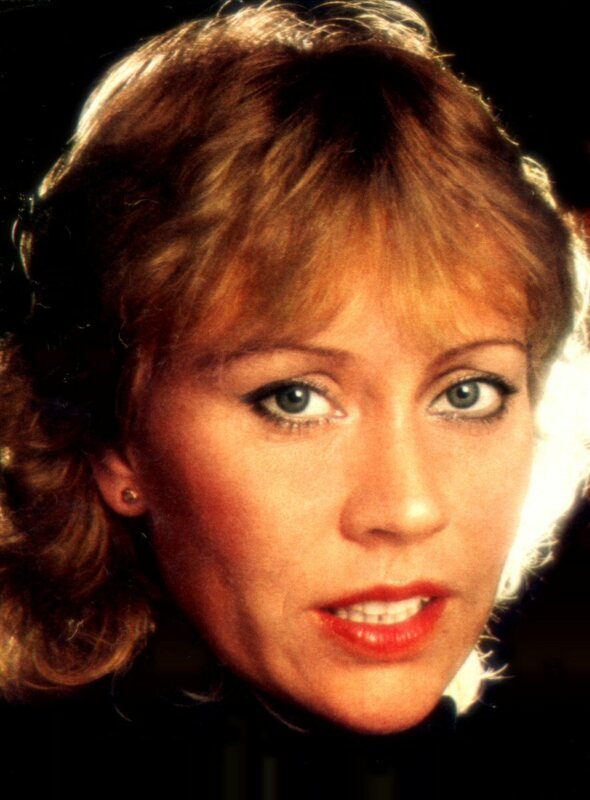 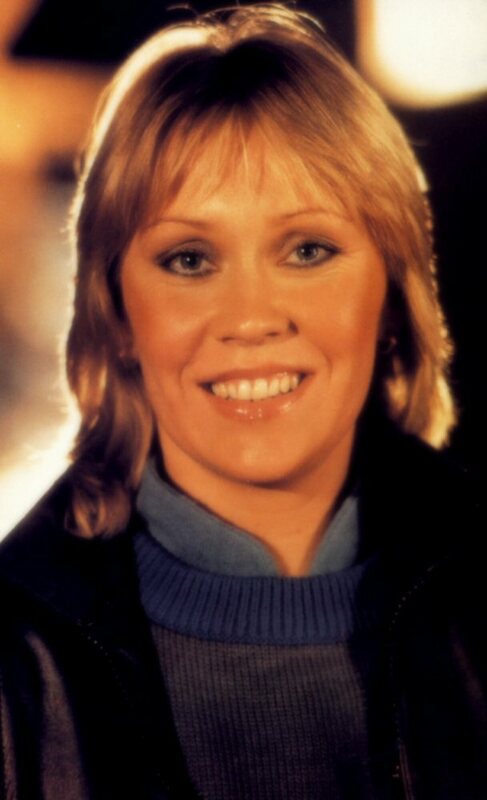 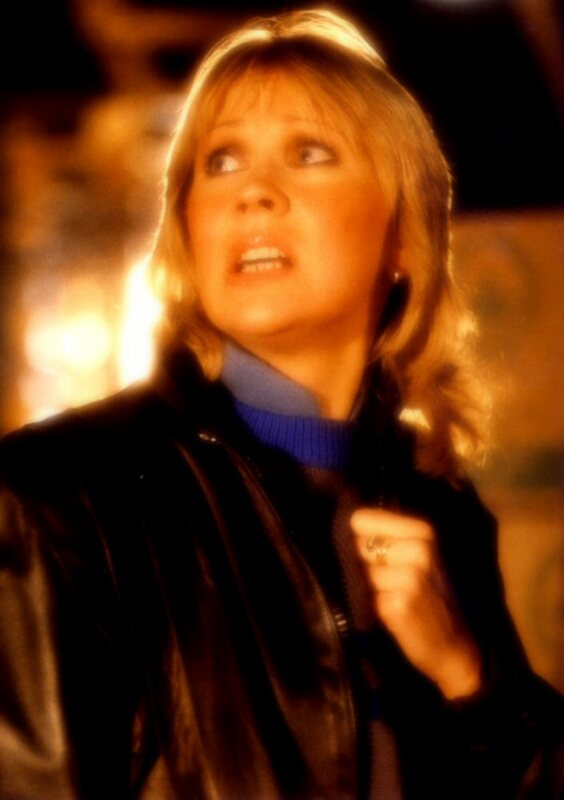 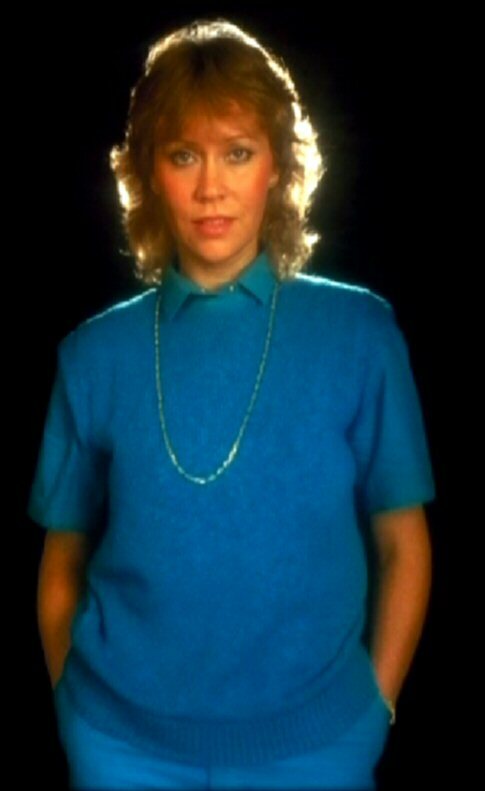 Photographer Eric Watson took several photos of Agnetha for the interview with the singer preparing for issue in the Swedish weekly "Veckorevyn" on March 9, 1983. The double compilation album "The Singles - The First Ten Years" saw its release on November 8, 1982 in Sweden. 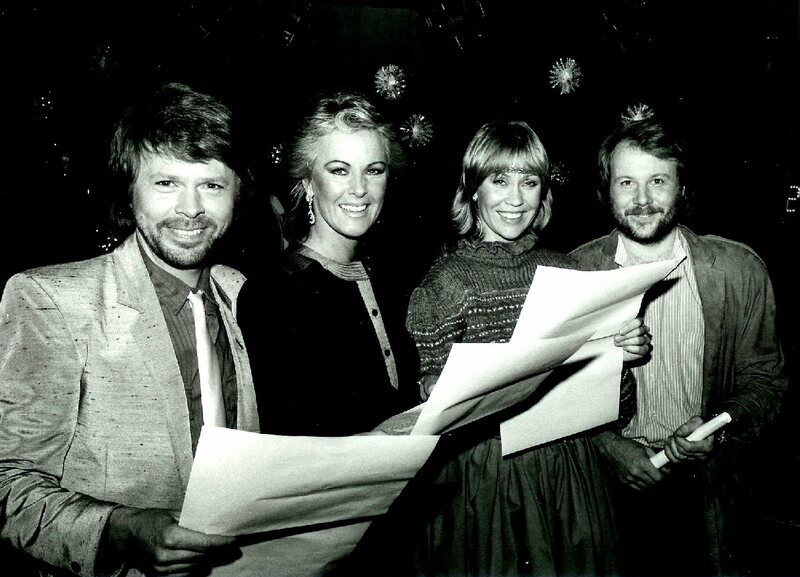 It was the very last ABBA album containing new studio recordings (The Day Before You Came and Under Attack). 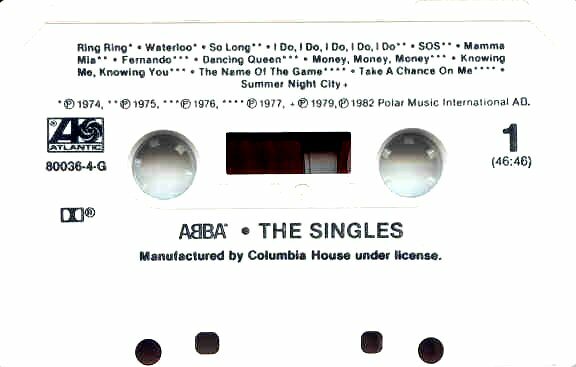 Totally "The Singles" contained 23 single hits from Ring Ring to One Of Us. 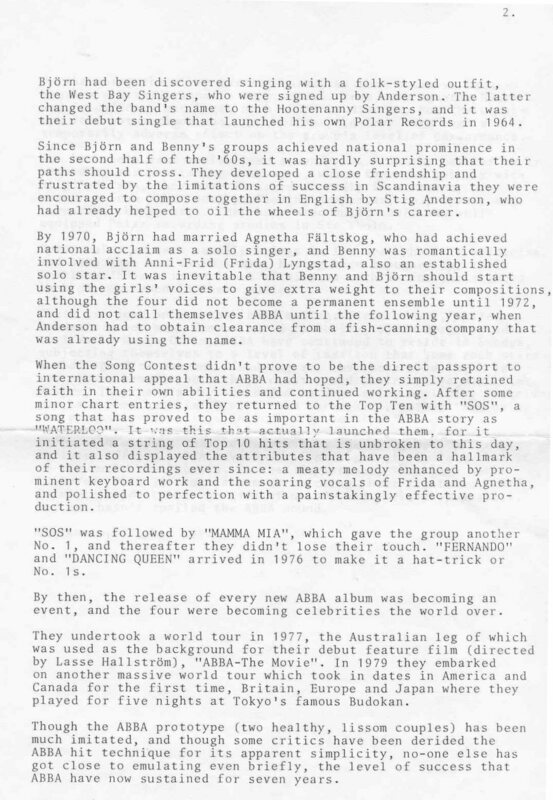 The album did not contain any special booklet with the story of the group or any other summary of ABBA's first ten years only four pictures from different periods of the group's career on the innersleeves. 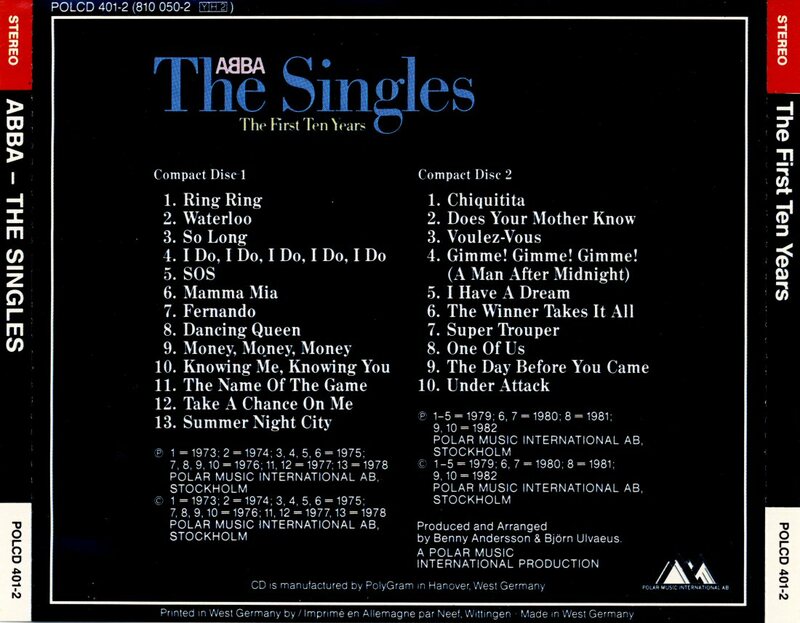 Several single hits were surprisingly not included on "The Singles" - songs as Head Over Heels, Lay All Your Love On Me, Angeleyes, Honey Honey are only some examples. 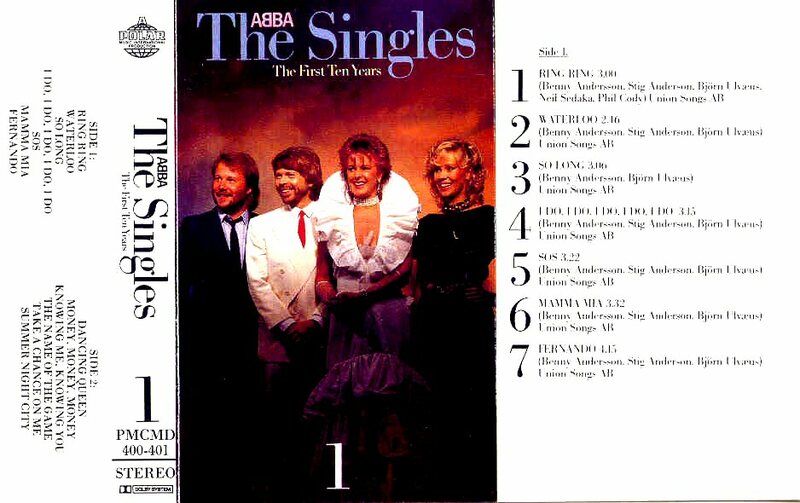 "The Singles - The First Ten Years" entered the Swedish LP chart on December 7, 1982 and it stayed there for only 6 weeks peaking at #19. 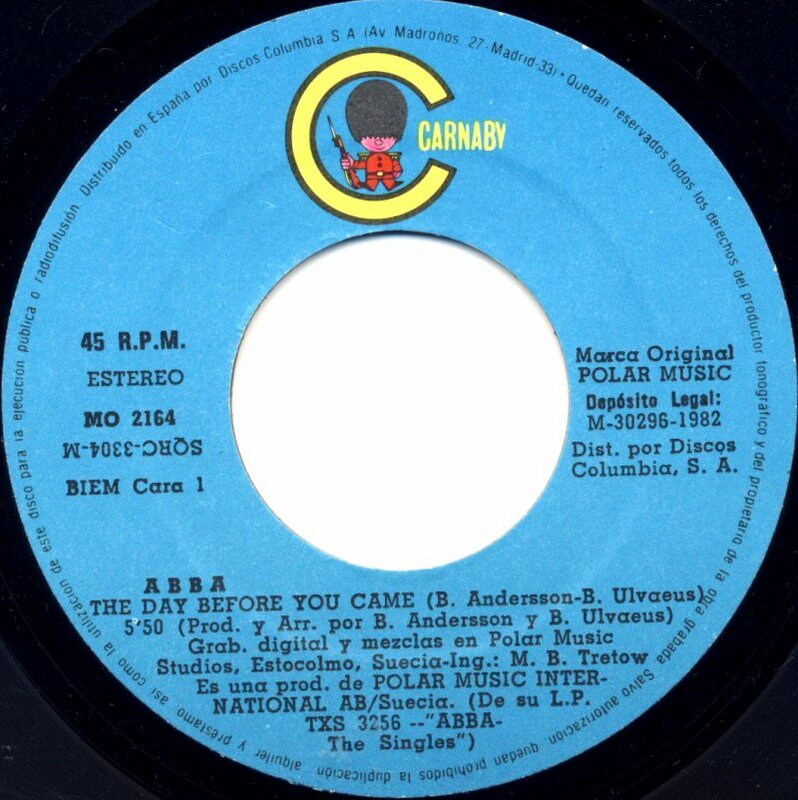 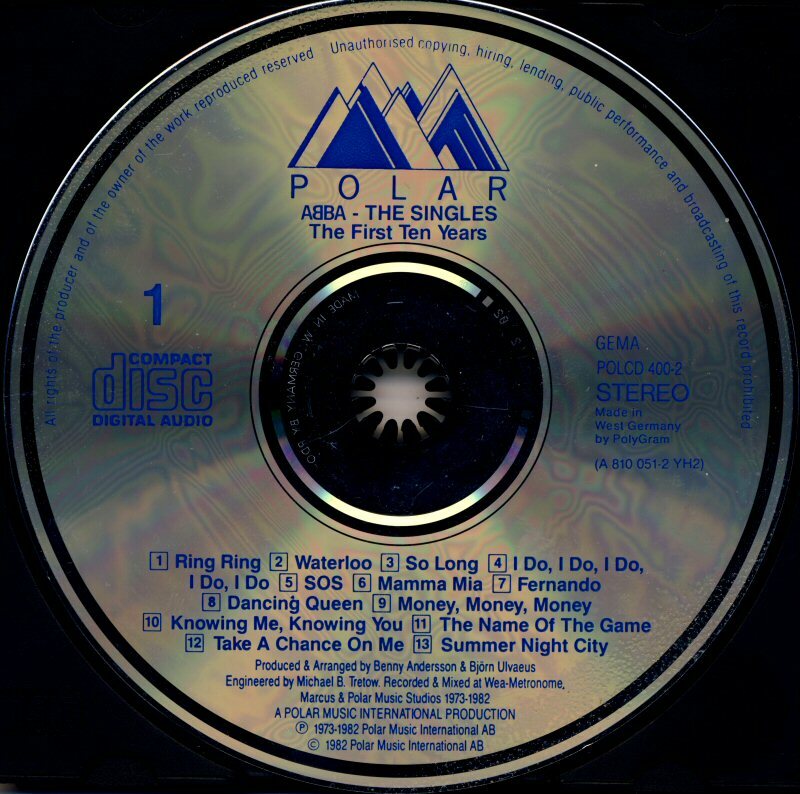 Some Polar issues of "The Singles" featured a misprint version on the backcover. 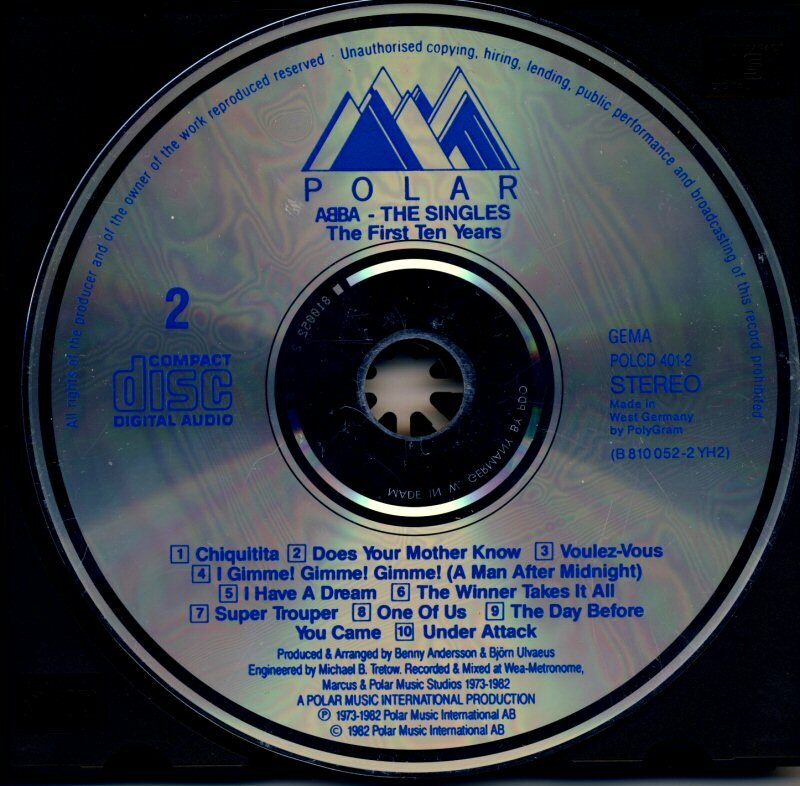 In 1988 Polar Music rereleased "The Singles - The First Ten Years" in the same cover and with the same contents as in 1982 but with different back cover. 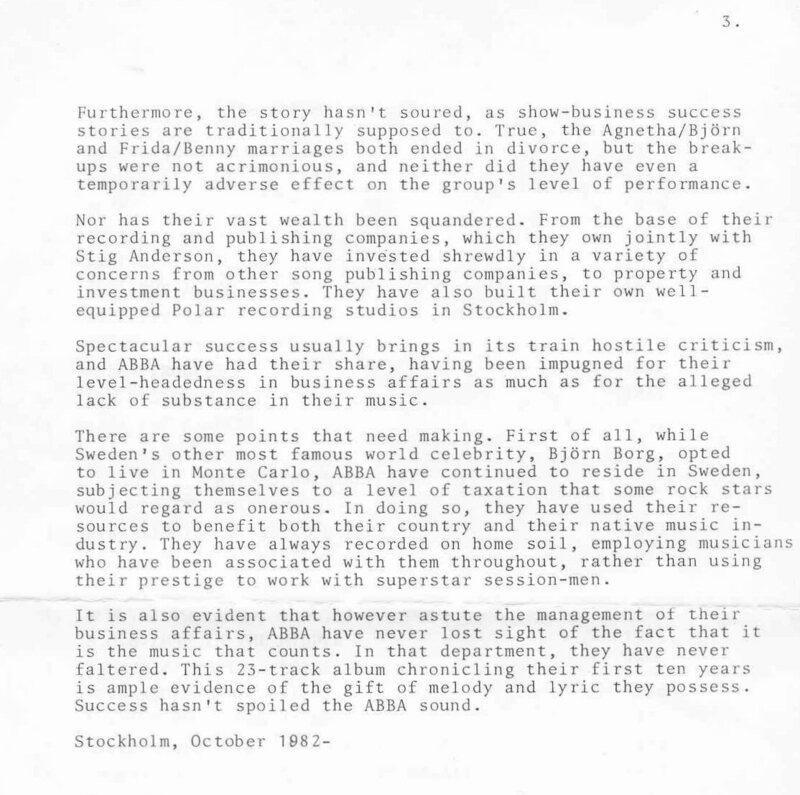 The back cover featured a text written by Stikkan about the tenth anniversary of Polar's leasing company "Infina" which had been started in 1978. 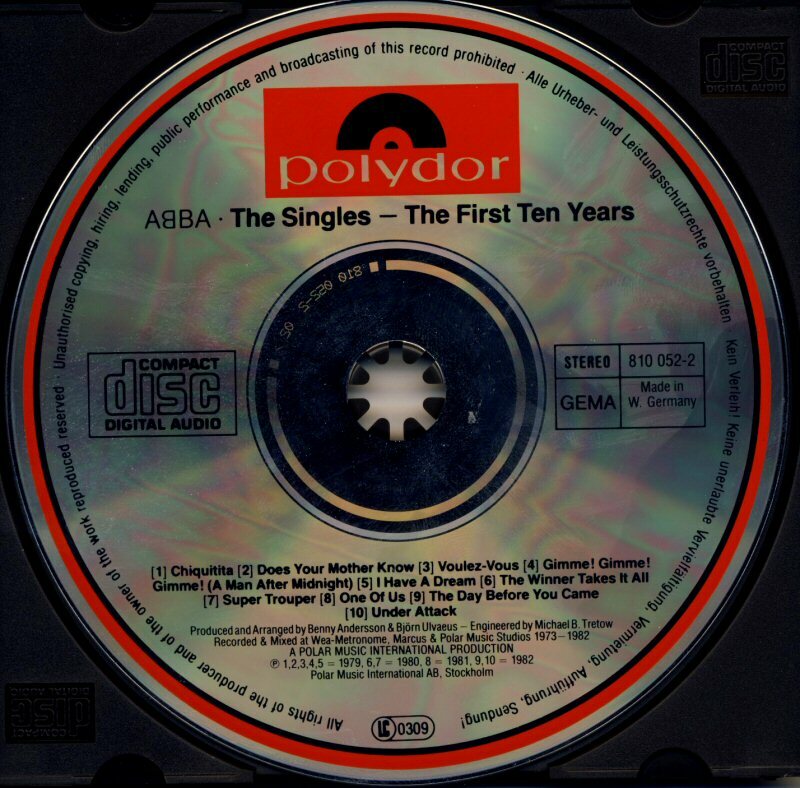 The release of "The Singles - The First Ten Years" was much more celebrated by the faithful British fans. The album "The Singles - The First Ten Years" saw its release in the UK on November 5th, 1982 and it entered the UK LP chart on November 20, 1982 where it stayed for 22 weeks peaking at #1. 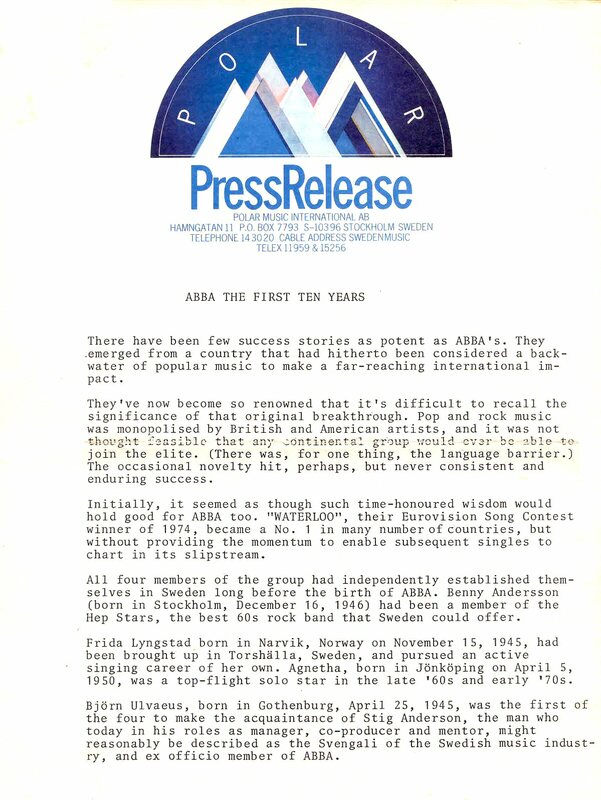 Even the record company Epic celebrated the first ten years by releasing the album even as a special limited edition commemorative set which contained booklet with the ABBA story and pictures, a copy of the ticket to Eurovision Song Contest 1974, poster and two picture discs with 23 hits. 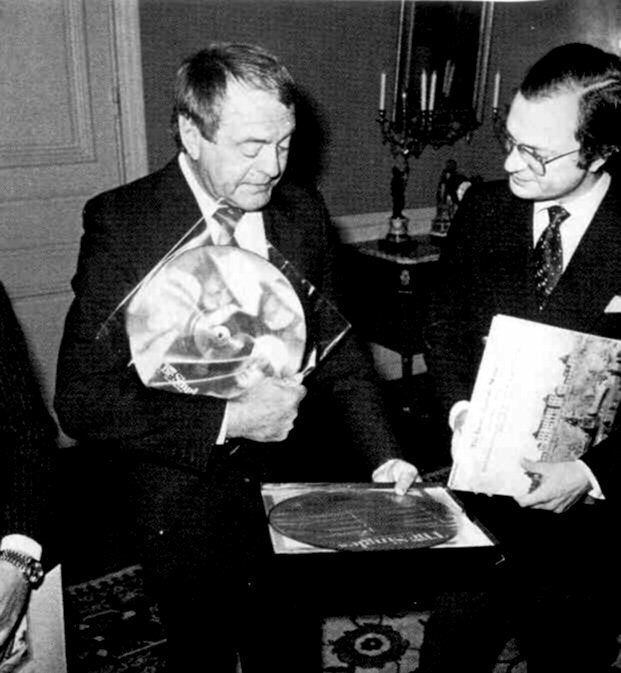 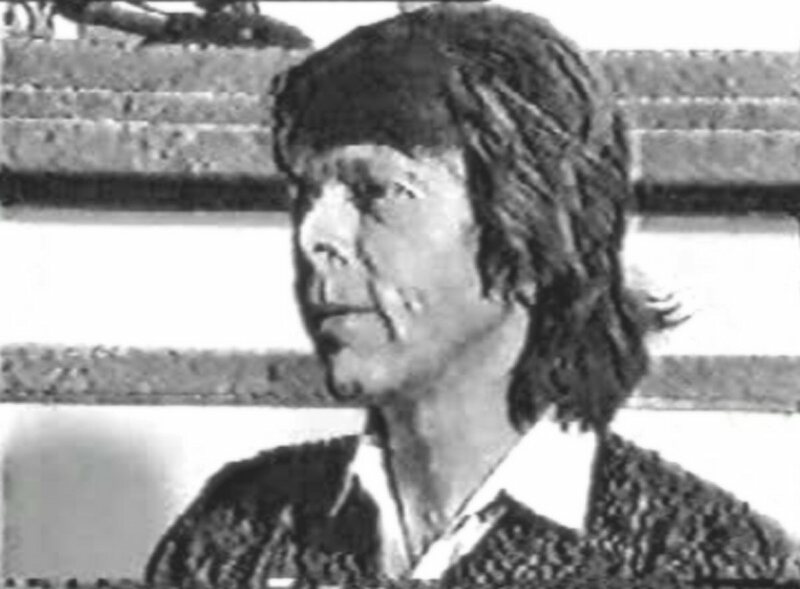 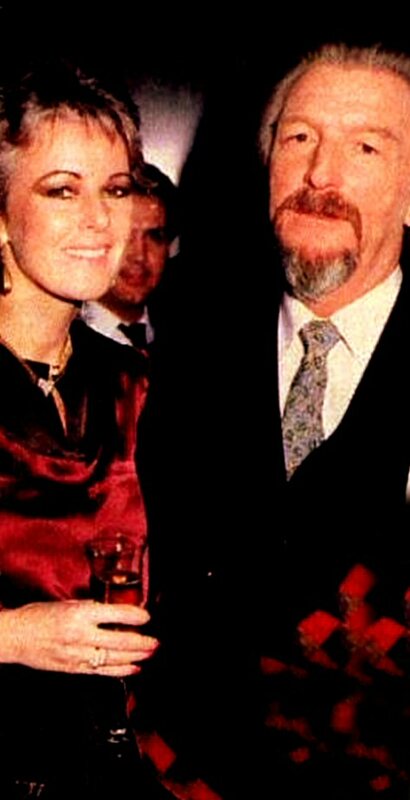 ABBA's manager Stikkan Anderson presented the box for the Swedish King at the beginning of 1983. 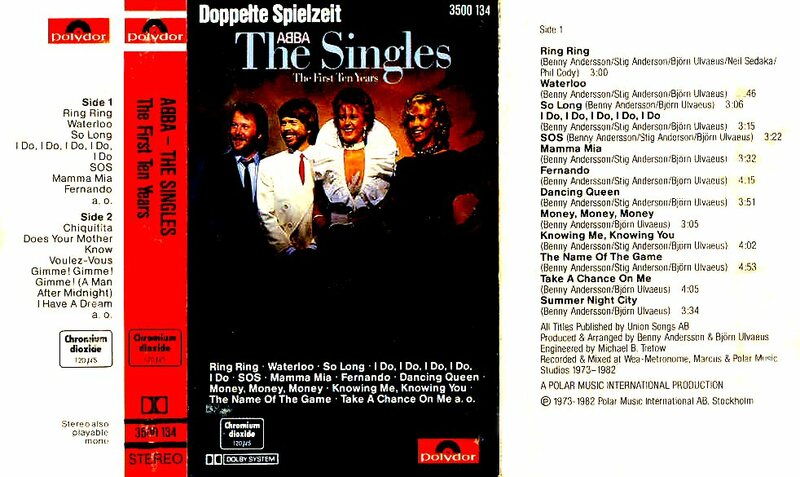 In West Germany "The Singles" album was released at the end of November 1982. 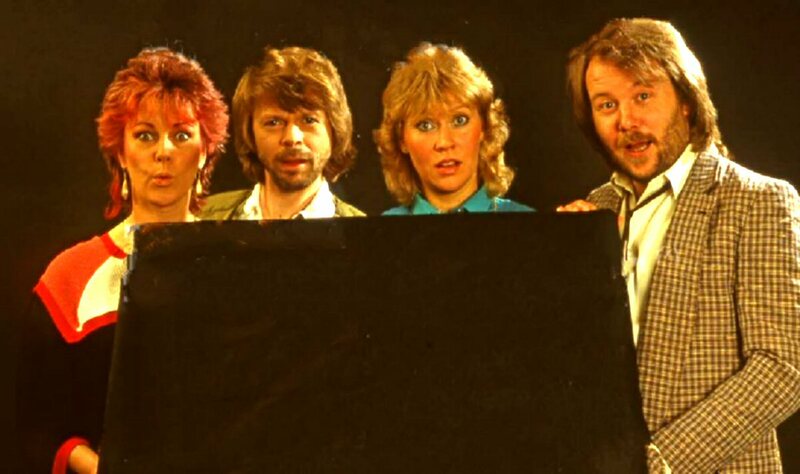 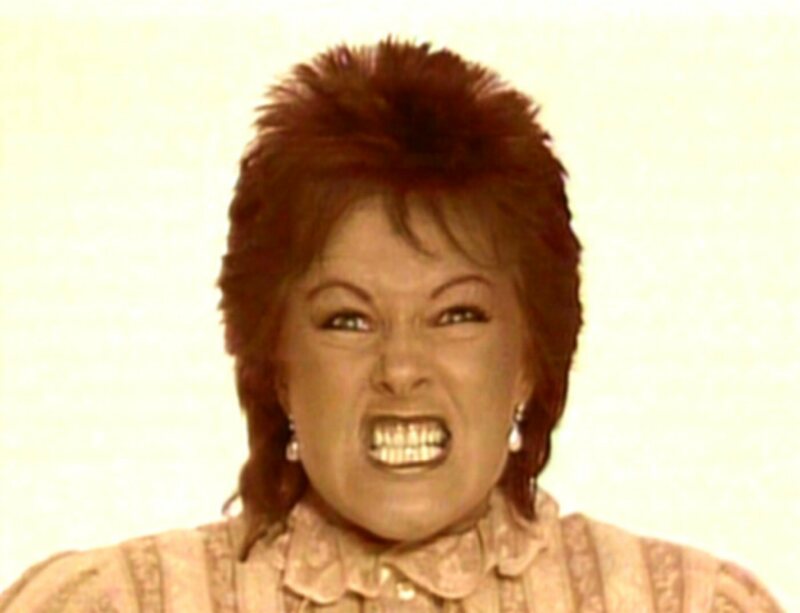 It stayed on the West German LP chart for 18 weeks peaking at #5. 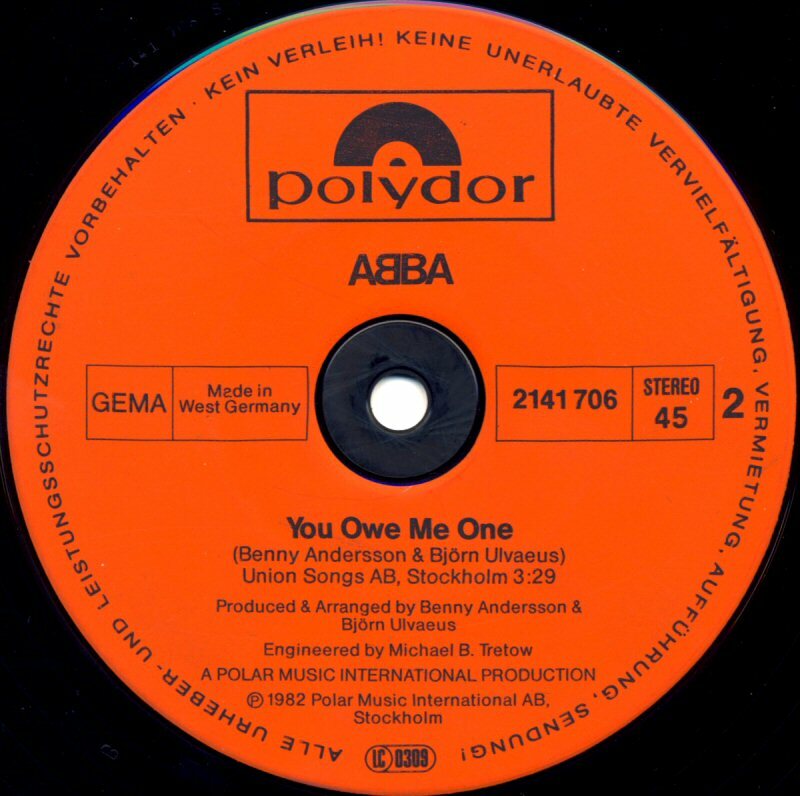 The Dutch version of the album featured partly different cover. 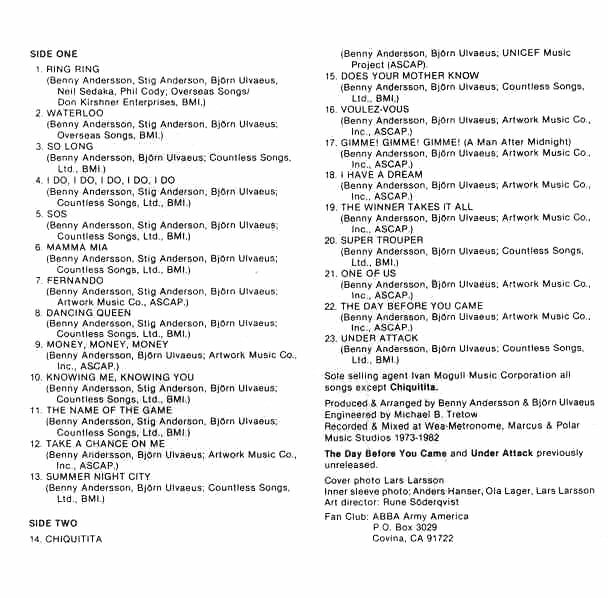 All the song titles were even printed on the back cover of the album. 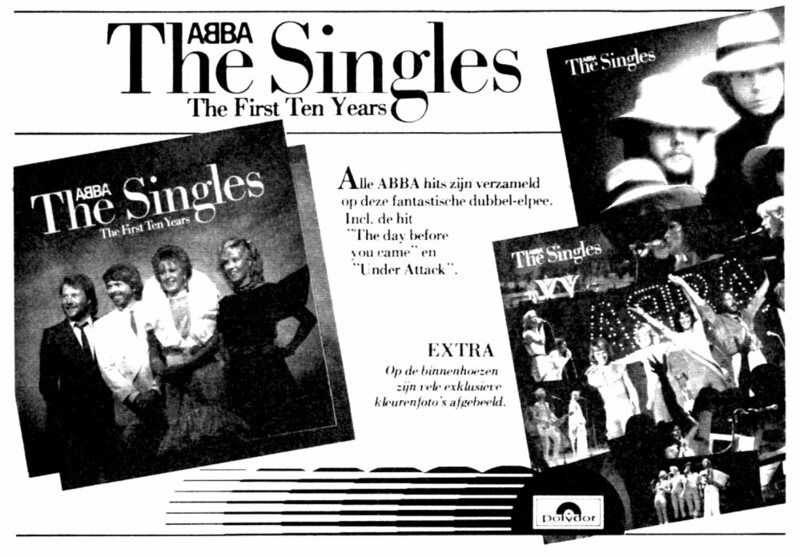 "The Singles" entered the Dutch LP chart on November 20, 1982 and stayed there for 15 weeks reaching #4. 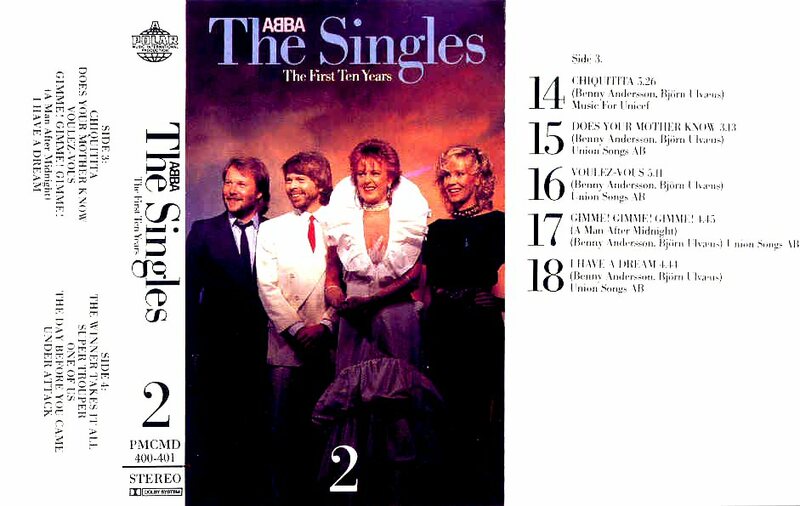 The Spanish edition of "The Singles" featured ABBA hits performed both in English and in Spanish. 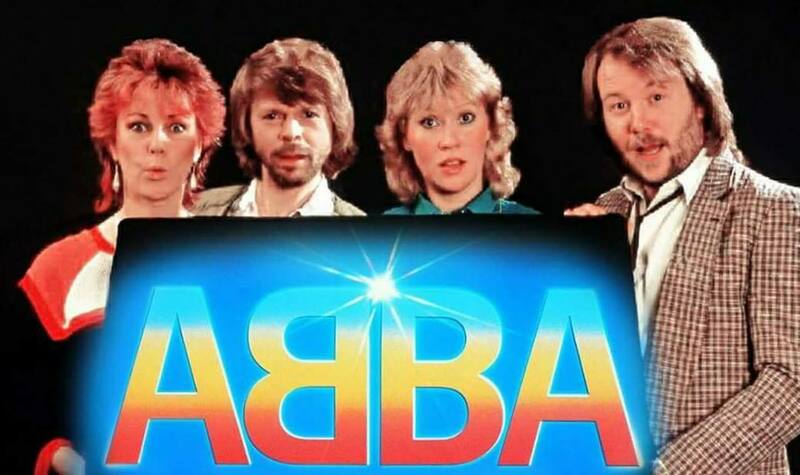 Following songs were performed in Spanish: Mamma Mia, Fernando, Dancing Queen (Reina Danzante), Knowing Me Knowing You (Conociendome Conociendote), Chiquitita, Gimme Gimme Gimme (Dame Dame Dame) and "I Have a Dream" (Estoy Sonando). 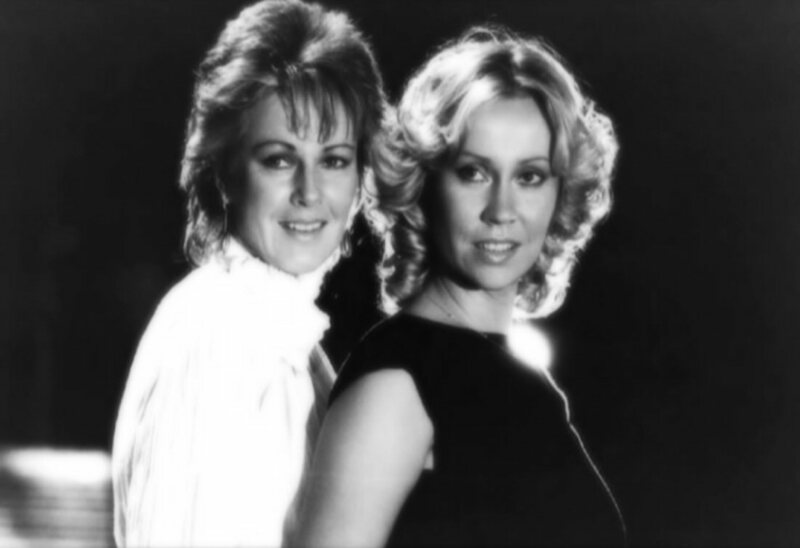 All the Spanish versions had been originally released in 1980 on the album "Gracias por la musica". 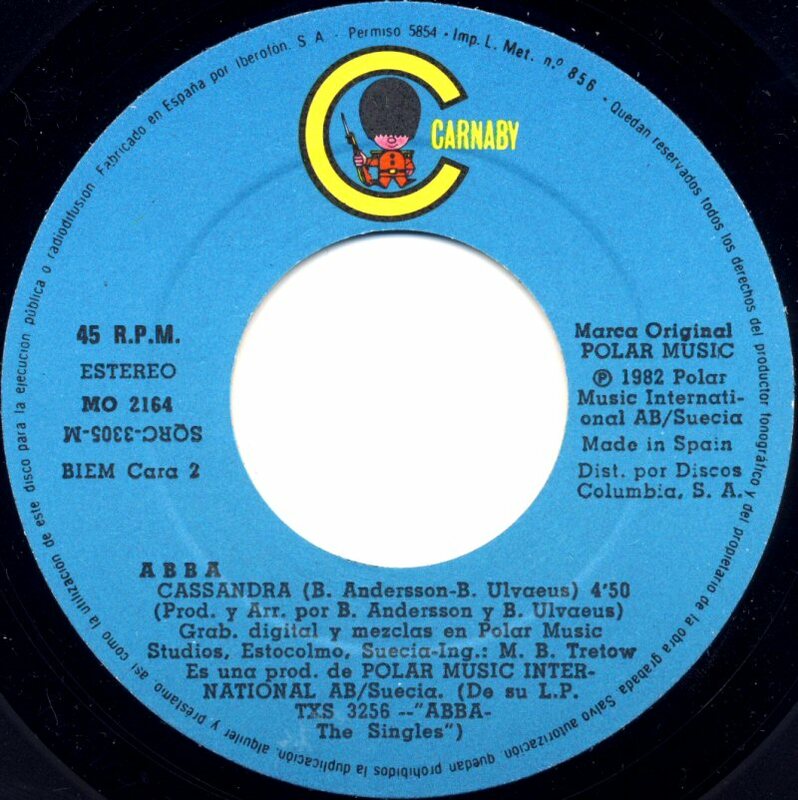 The album entered the Spanish LP chart in March 1983 and stayed there for 10 weeks peaking at #13. 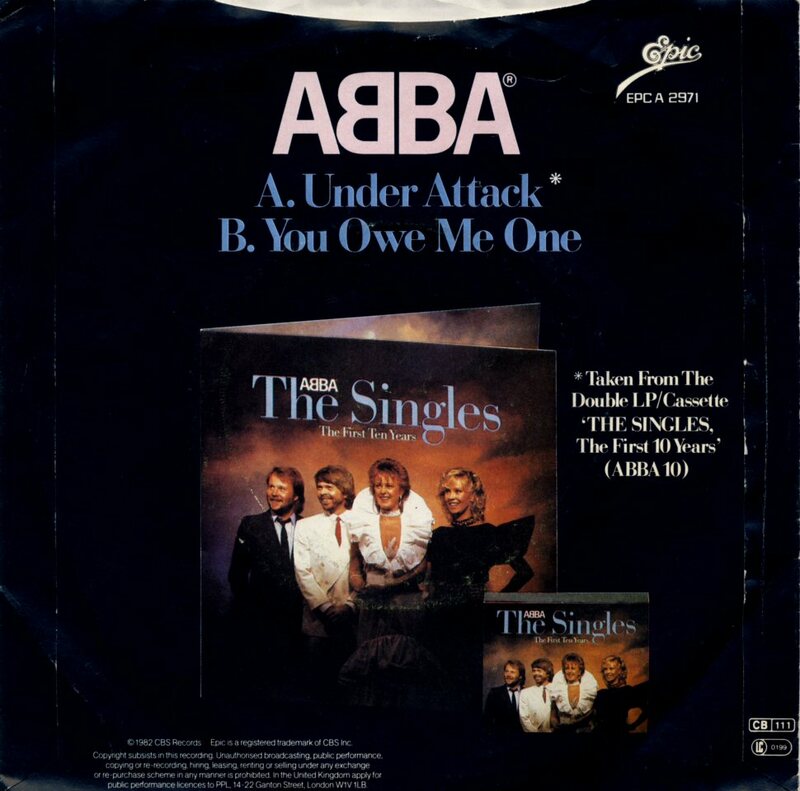 In USA "The Singles" entered the chart in December 1982 and stayed there for 18 weeks peaking at #62. In Canada the album entered the chart at the end of January 1983 and stayed there for only two weeks reaching #31. 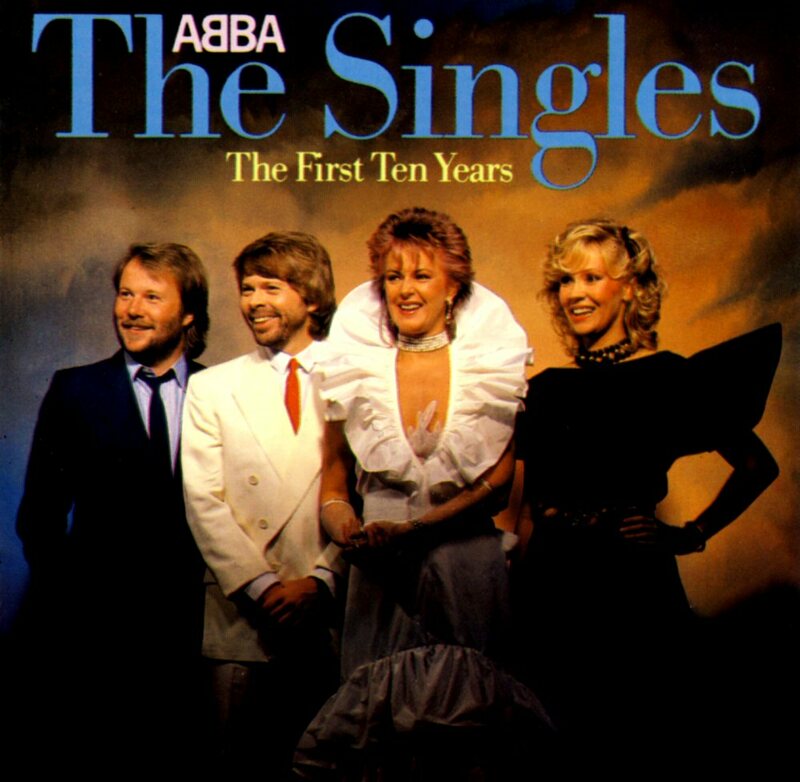 The double album "The Singles - The First Ten Years" saw its release in South Africa at the beginning of December 1982. 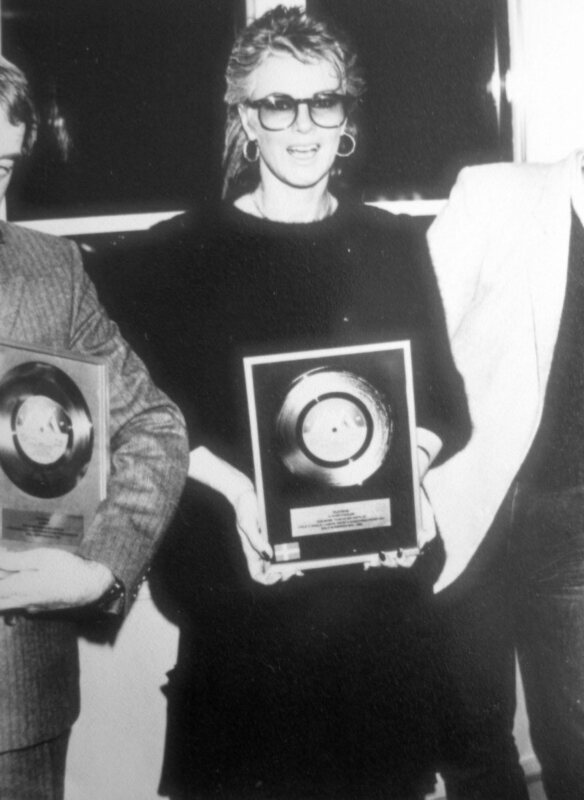 It stayed on the chart for 18 weeks reaching #1. 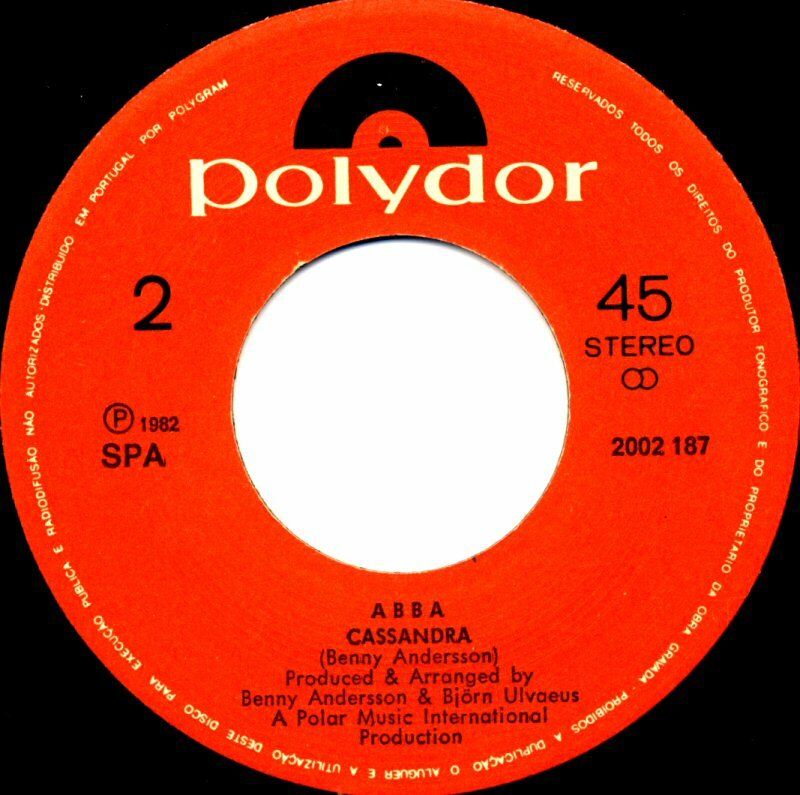 The Polish edition of the album featured different cover was entitled "The best of ABBA". 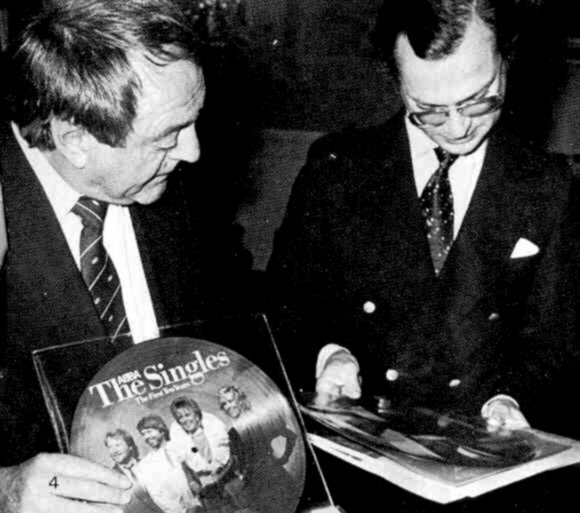 The Polish edition of "The Singles" saw its release in 1987. 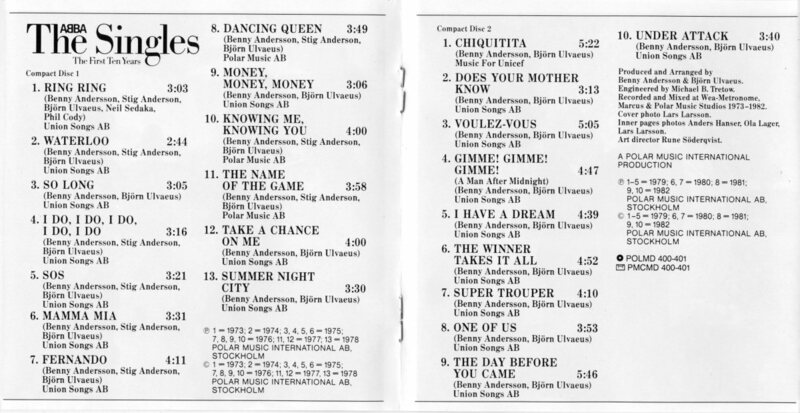 Polar Music released two music cassettes: "The Singles 1" and "The Singles 2". 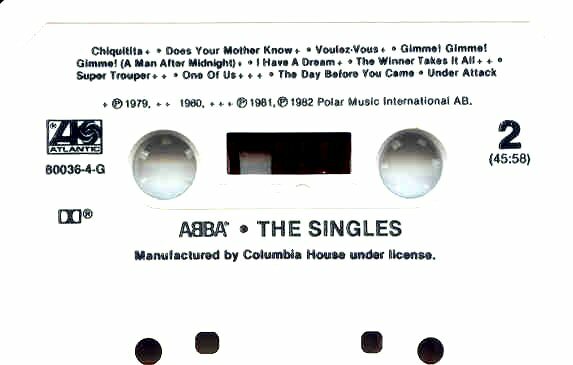 Polydor and Atlantic chose another option and released one cassette with double length. 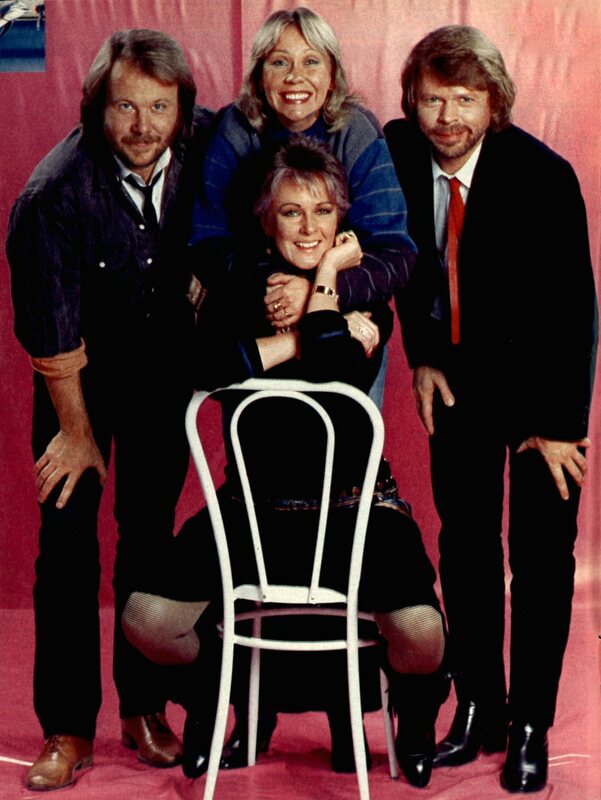 Alternative shots from the photo session for the cover of the album. 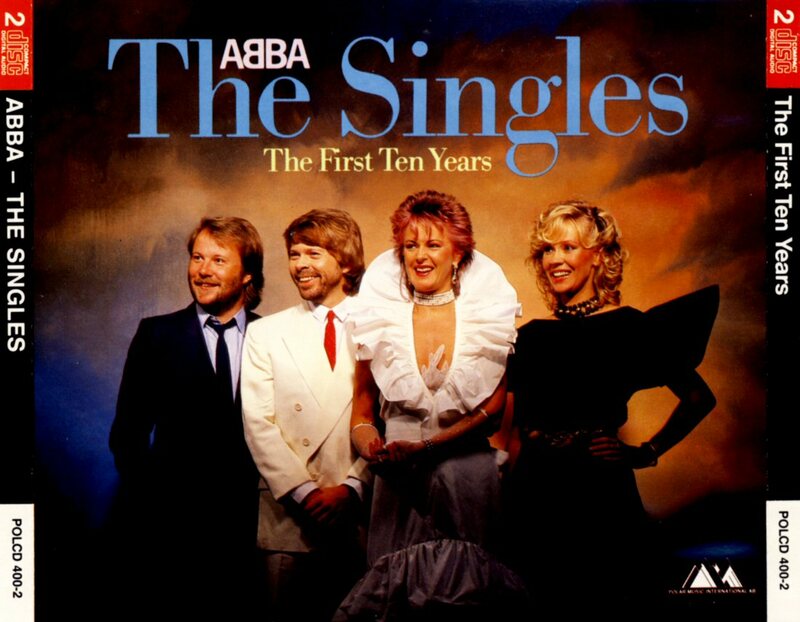 "The Singles - The First Ten Years" was released even on CD. 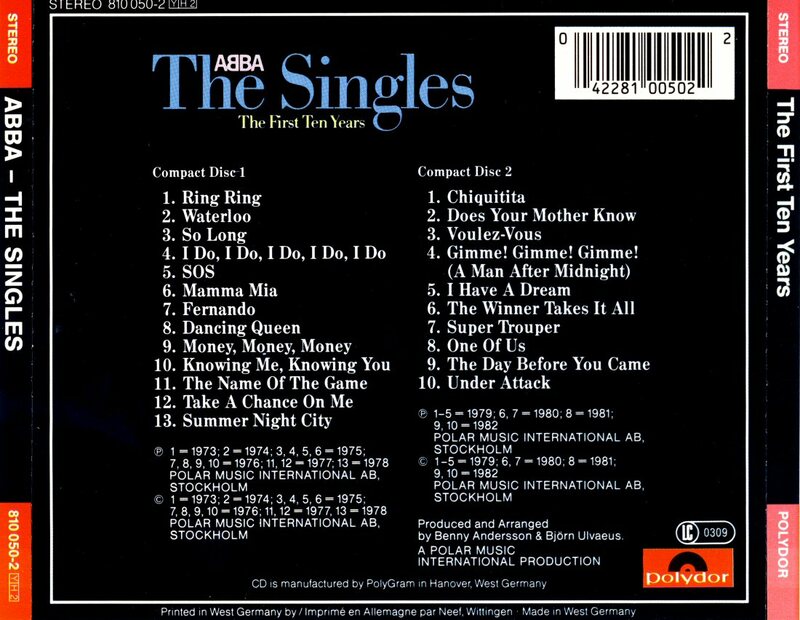 The box contained two CDs as the compilation was about 10 minutes too long for one CD. 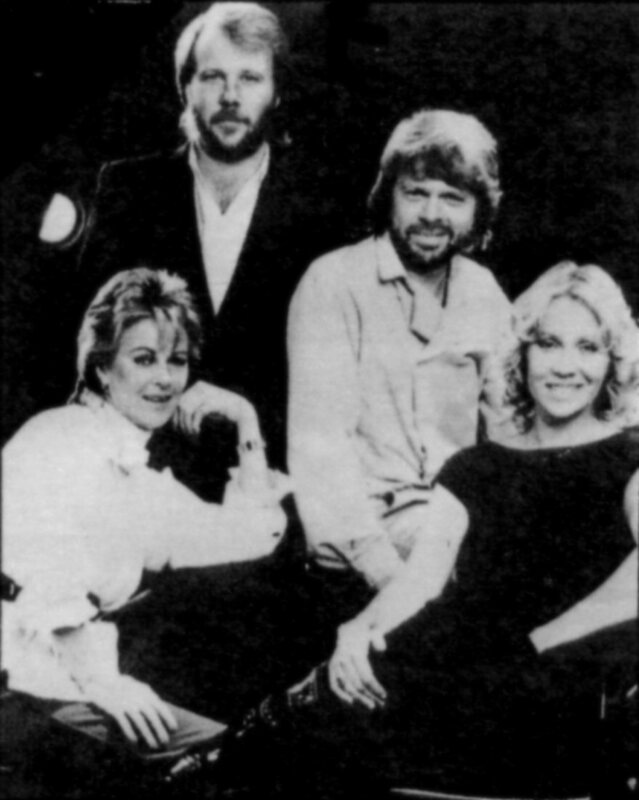 ABBA were in West Germany on November 8 and 11 to participate in the "Show Express" show which would be group's very last TV show there. 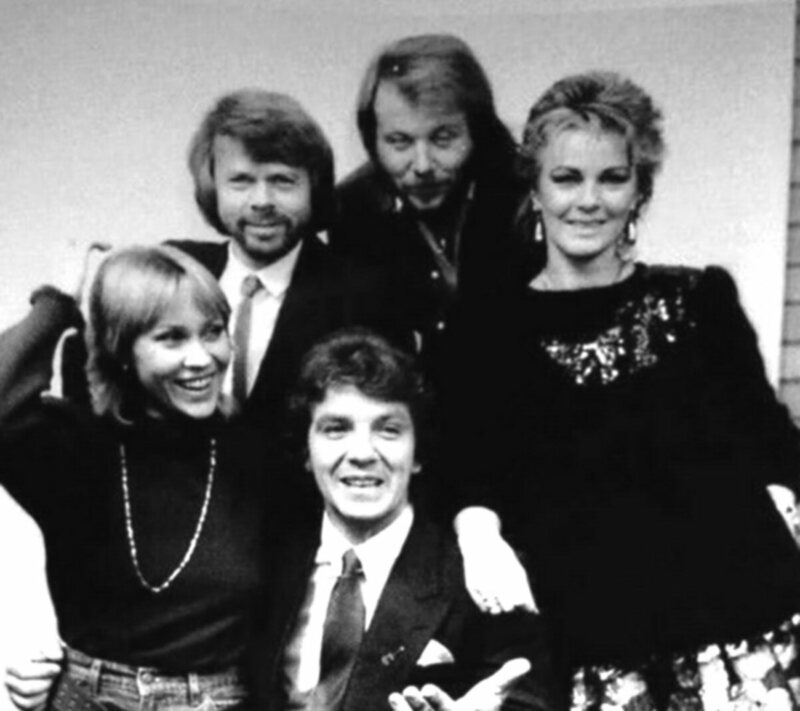 The Foursome seemed to be very happy and relaxed on stage and made probably one of their best TV shows ever. 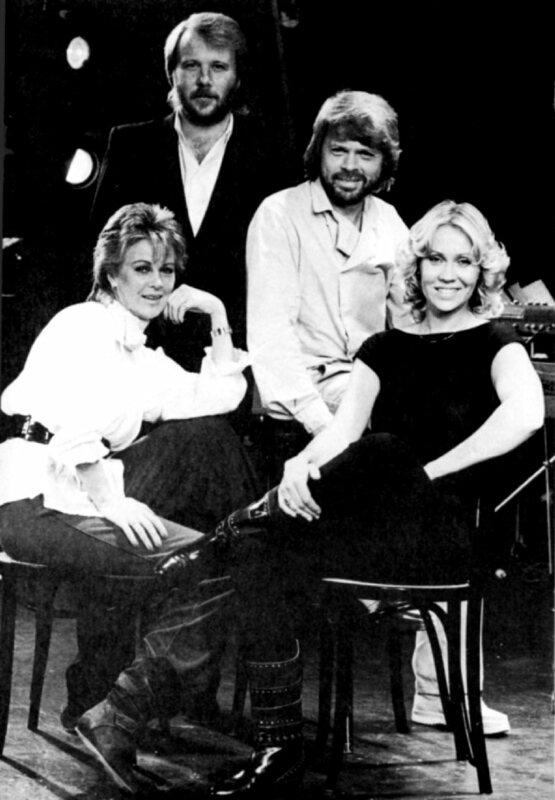 Top German TV personality Thomas Gottschalk interviewed ABBA in his special "Tommy's pop show". 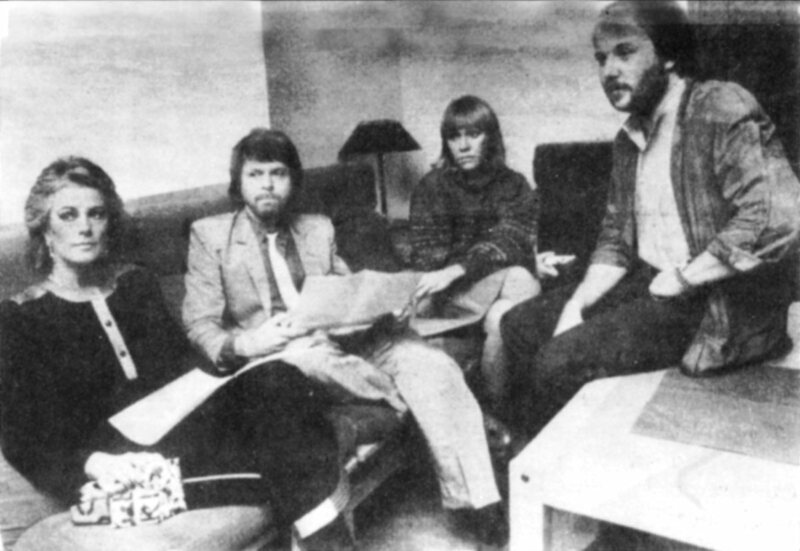 The atmosphere was quite relaxed and the band members answered several questions. 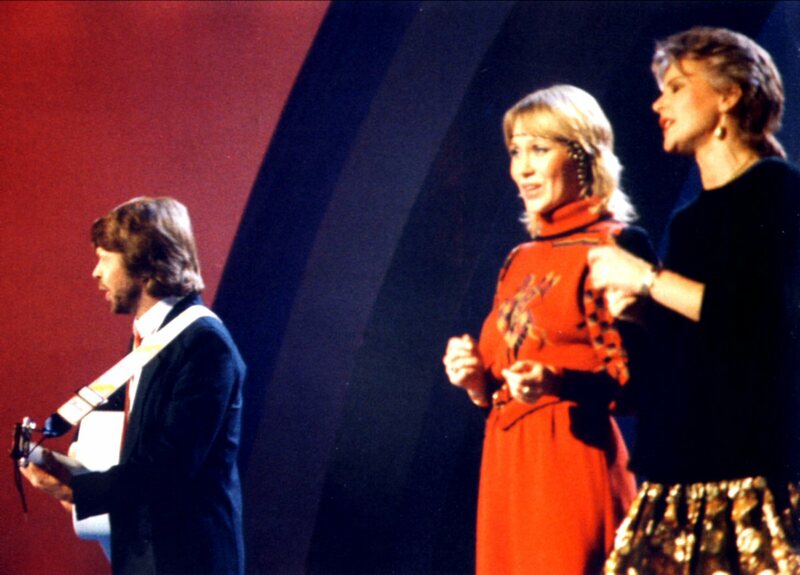 ABBA performed 3 new songs: The Day Before You Came, Cassandra and Under Attack. 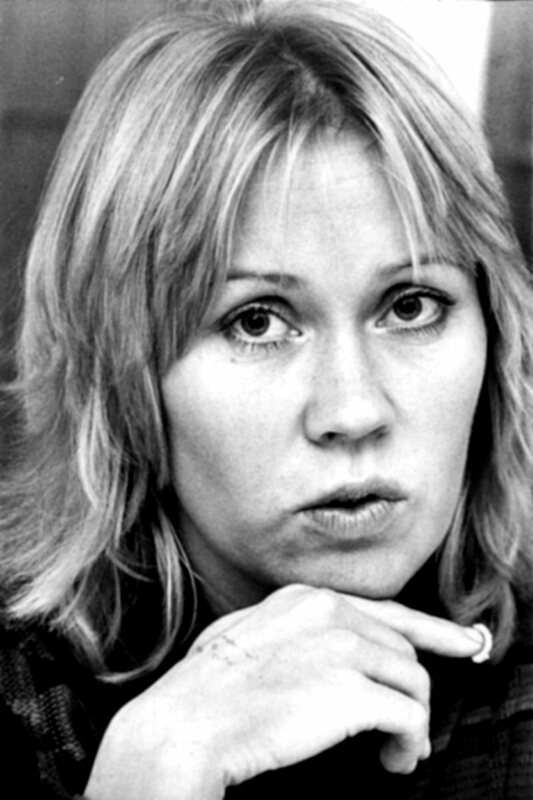 Agnetha had two lead vocals but this time Frida was "the queen of the show". 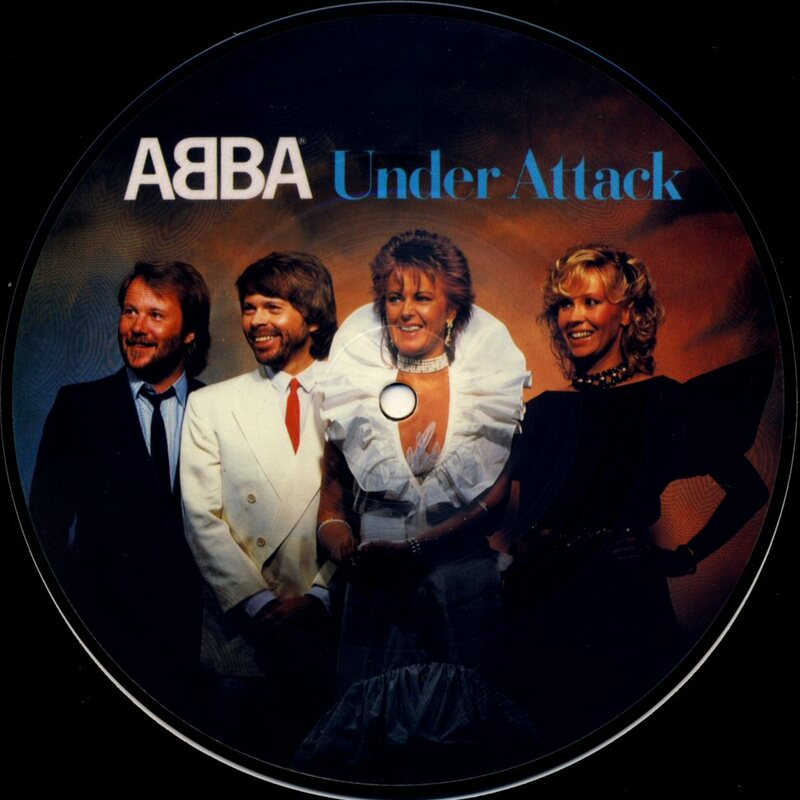 The best and funniest performance of Under Attack was made here in Saarbrücken. 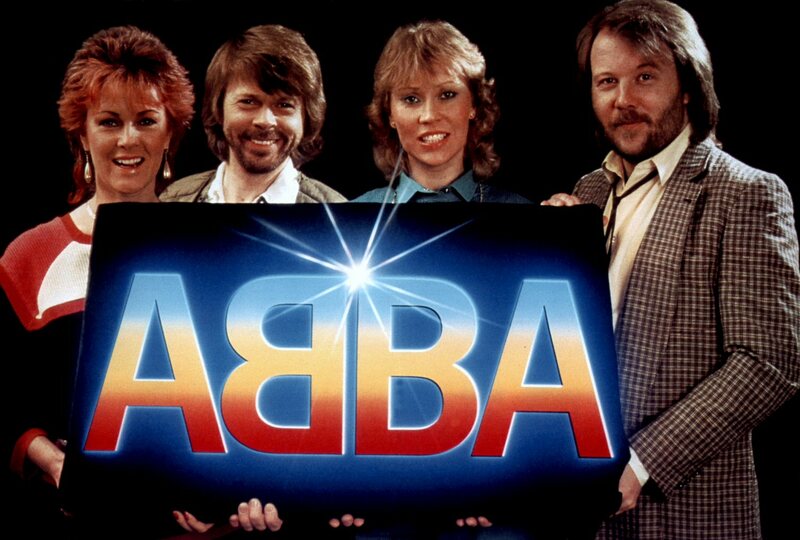 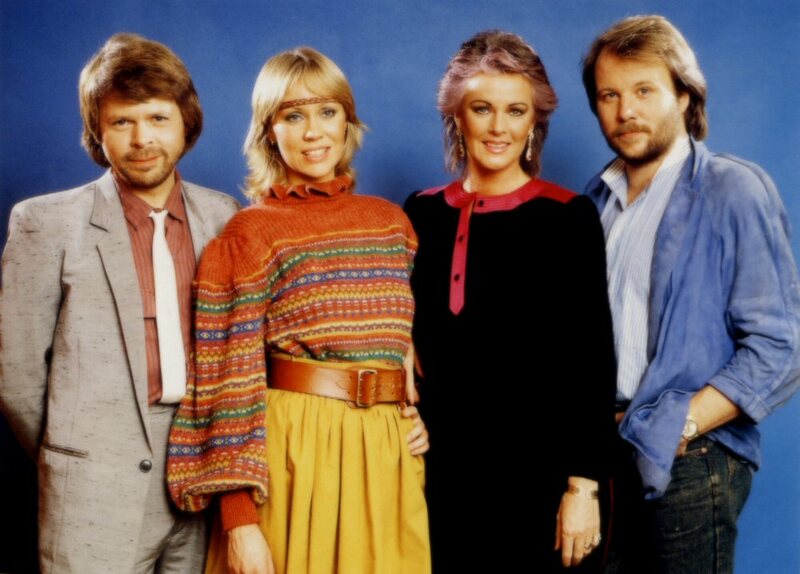 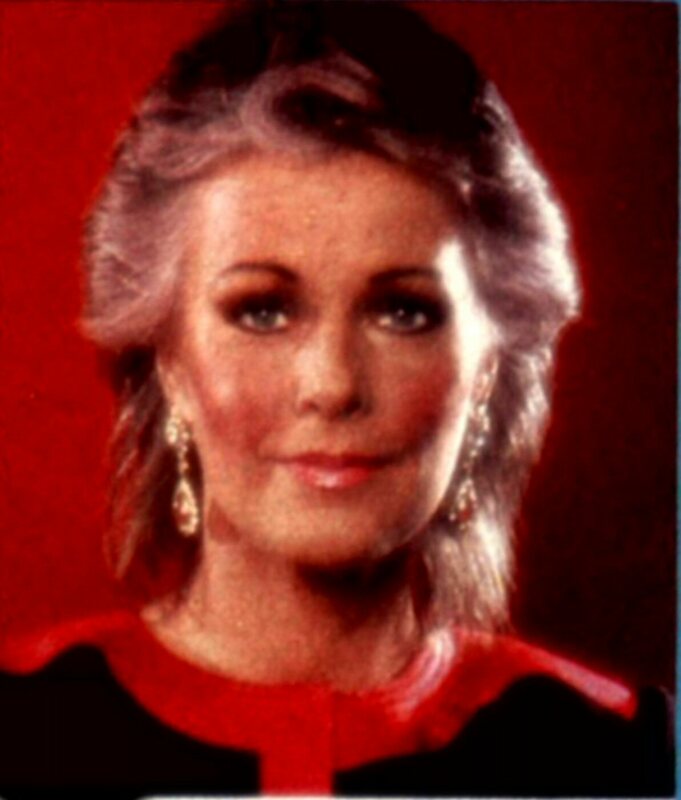 Nobody thought watching this show that soon it would be the end of the ABBA story. 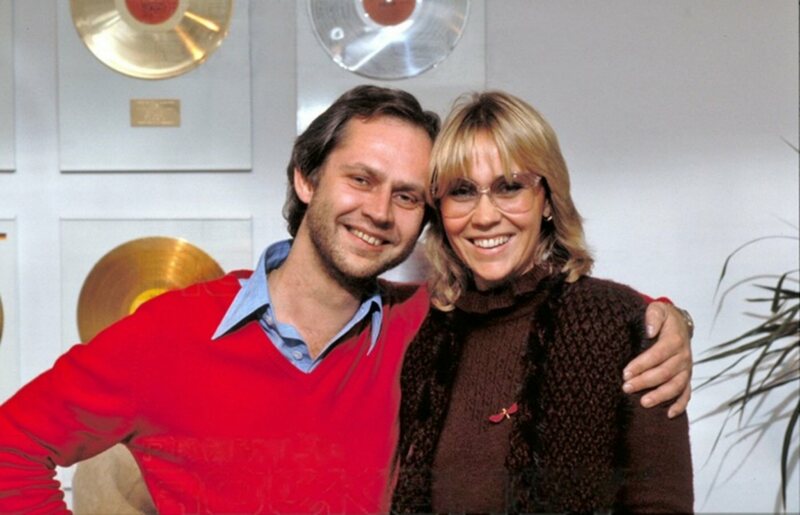 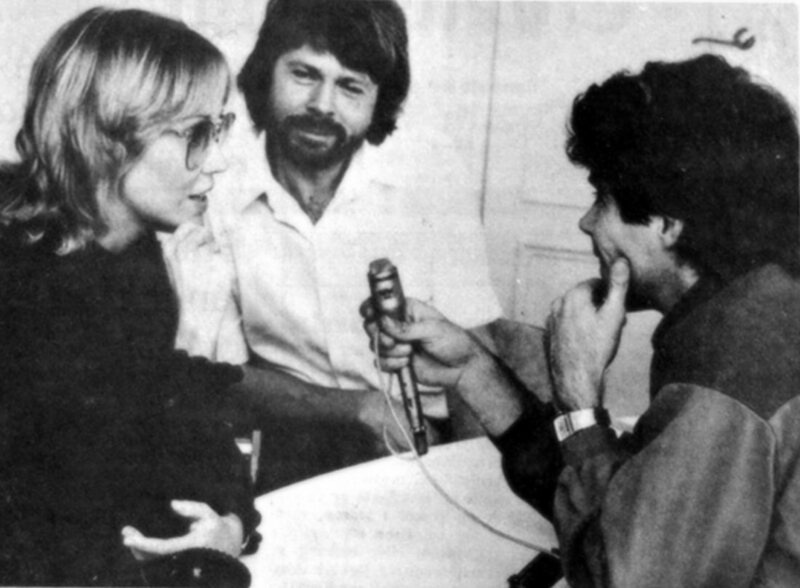 In Stockholm Agnetha and Björn gave an exclusive interview for journalist Terje Myklebost from Norwegian Radio NRK. 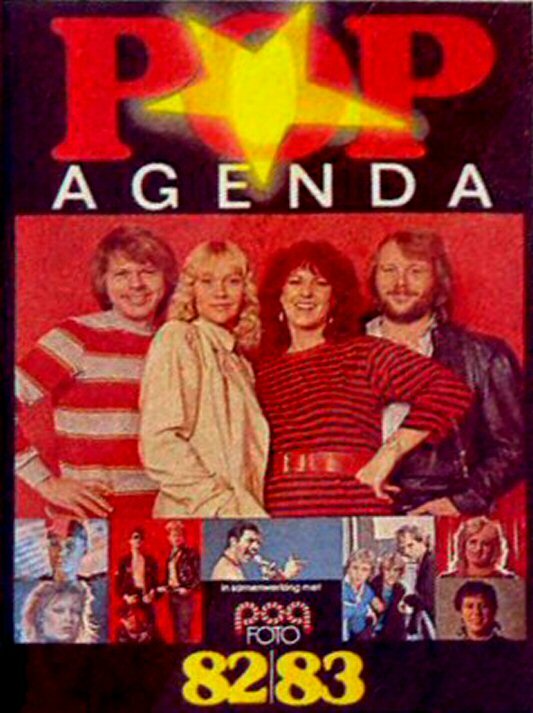 The interview would be a part of the radio special in P2 in Norway about the ABBA phenomenon. 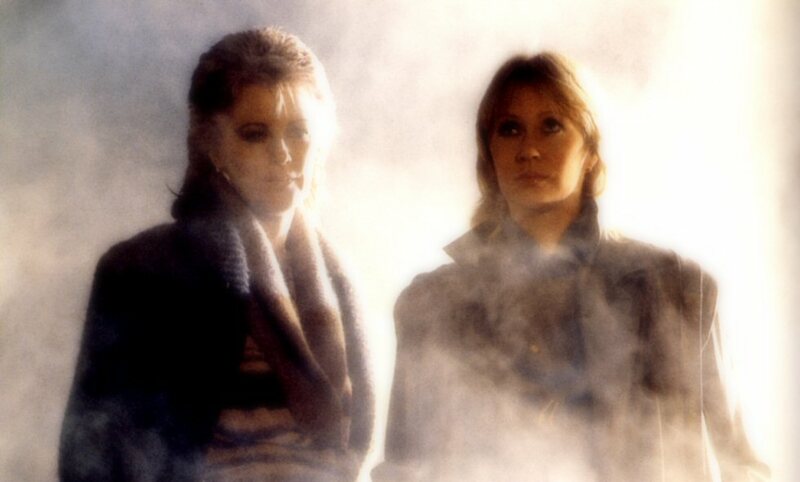 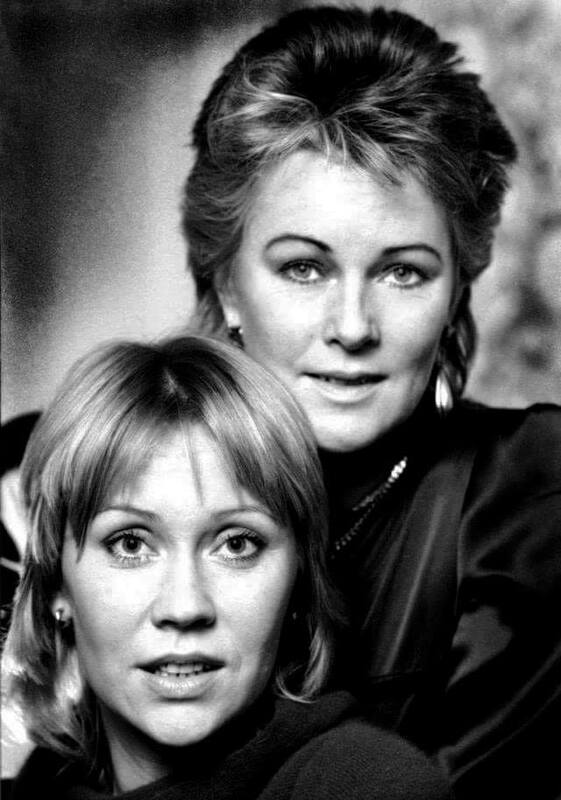 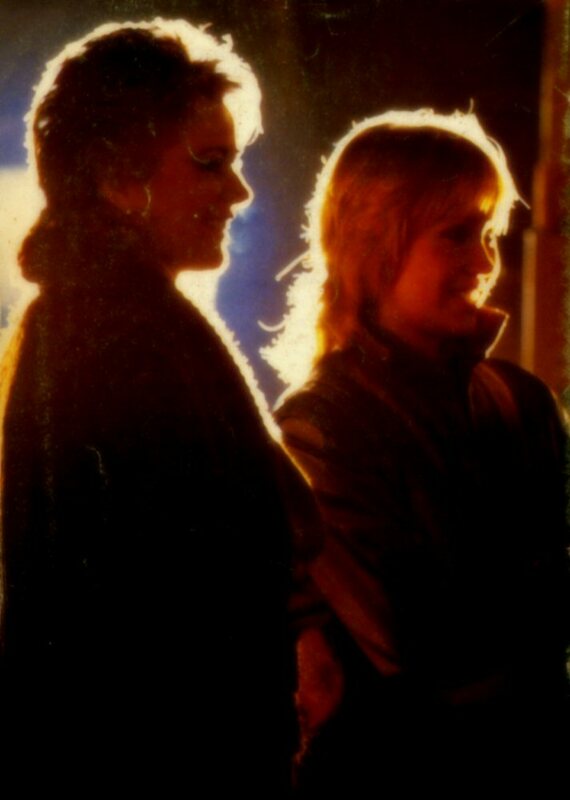 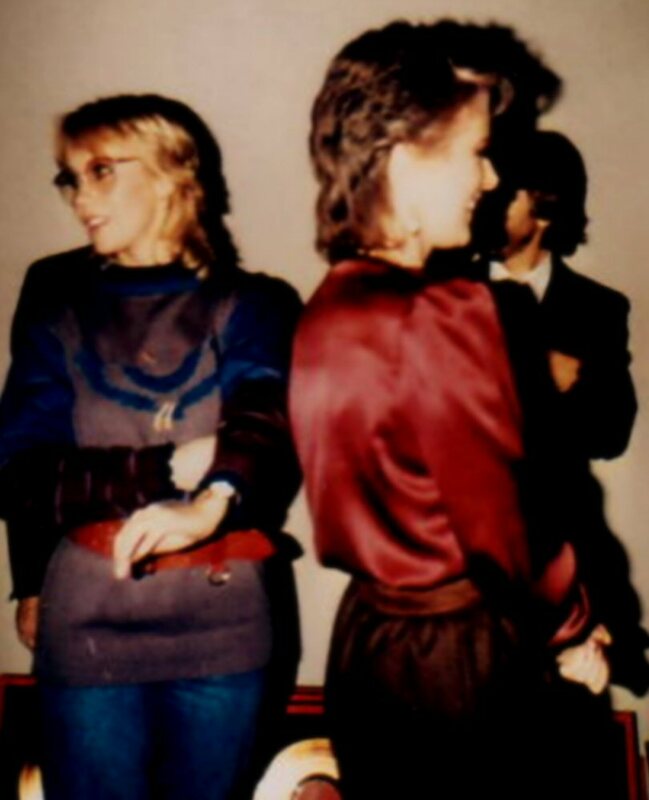 Agnetha and Frida caught by a photographer at the Polar office late in 1982. 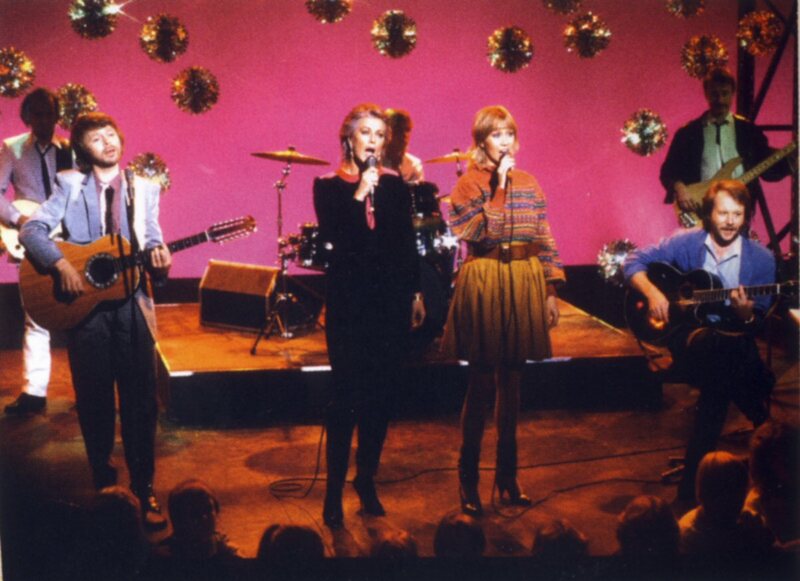 This TV special was recorded in November in Stockholm for Dutch TV channel "Veronica". 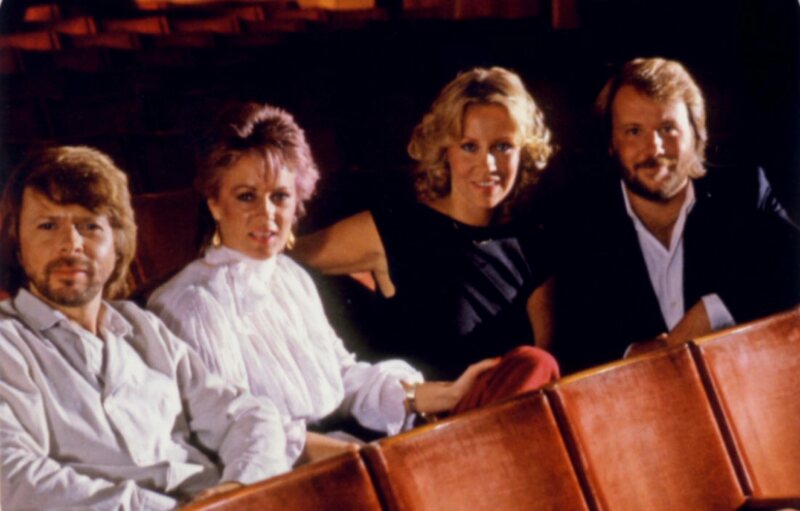 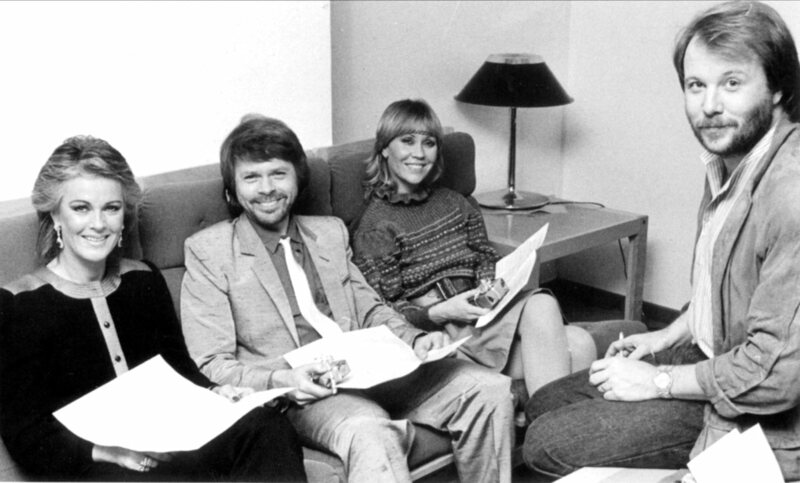 Björn, Benny, Agnetha and Frida were talking about their lives as musicians and how everything started. 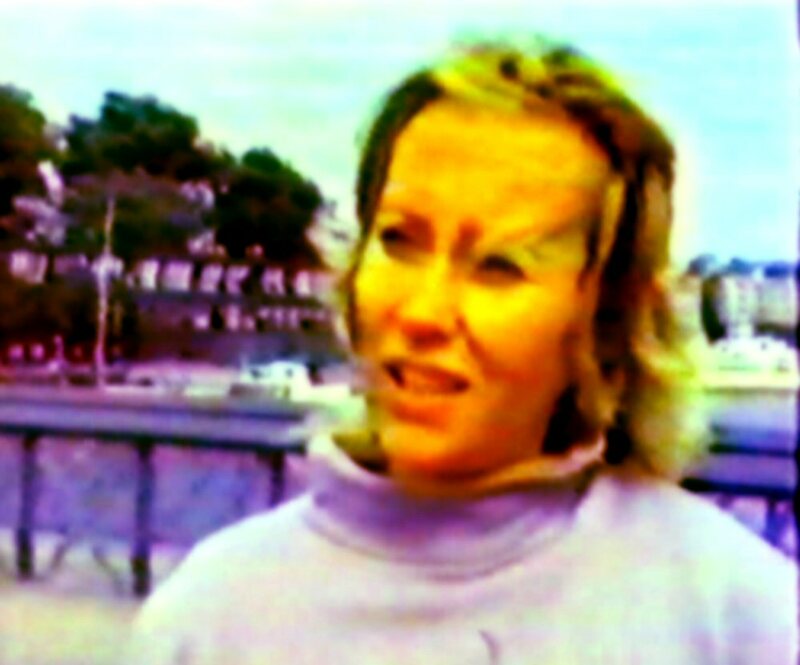 Even Stikkan Anderson was interviewed. 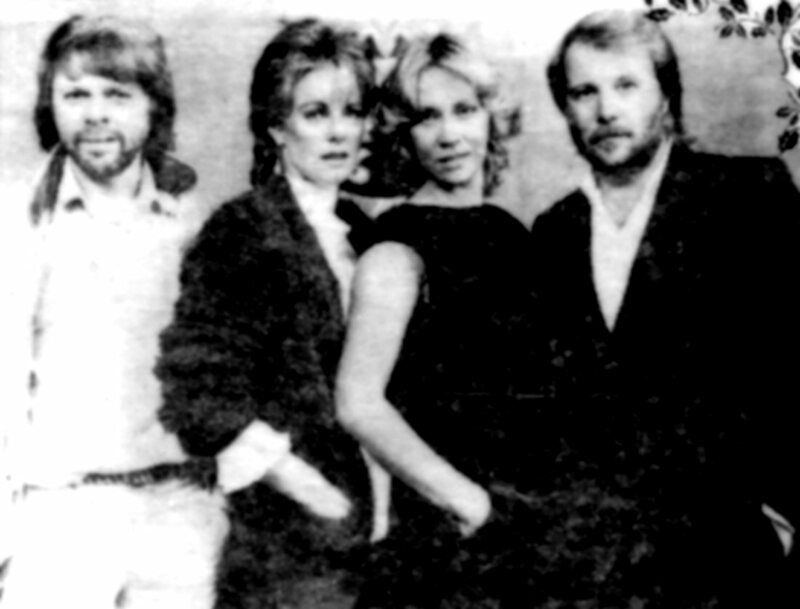 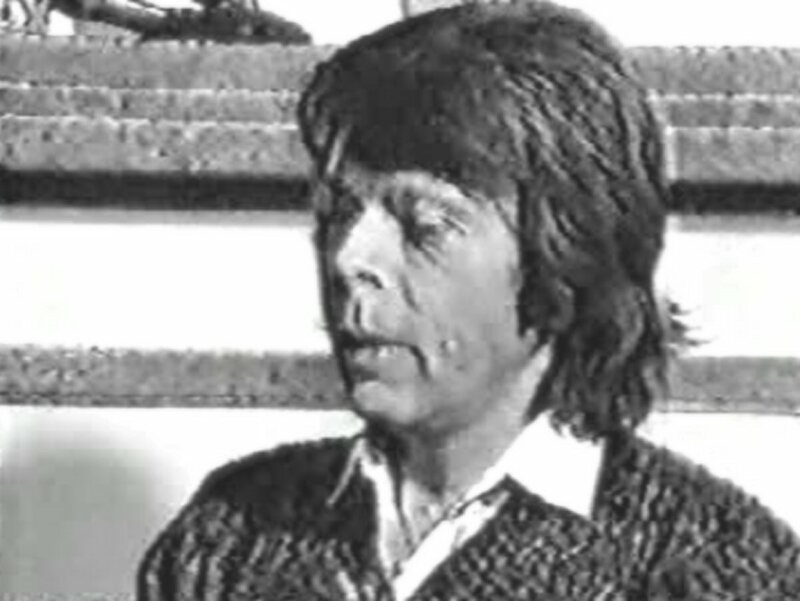 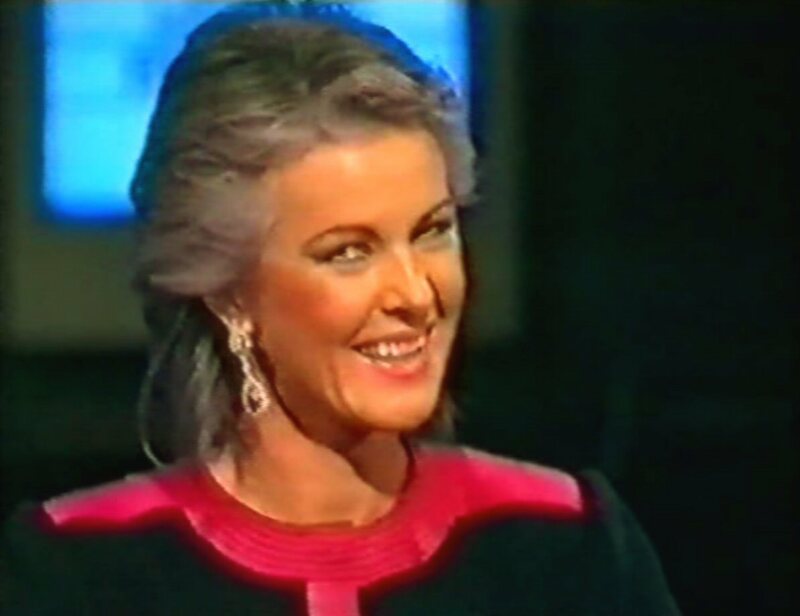 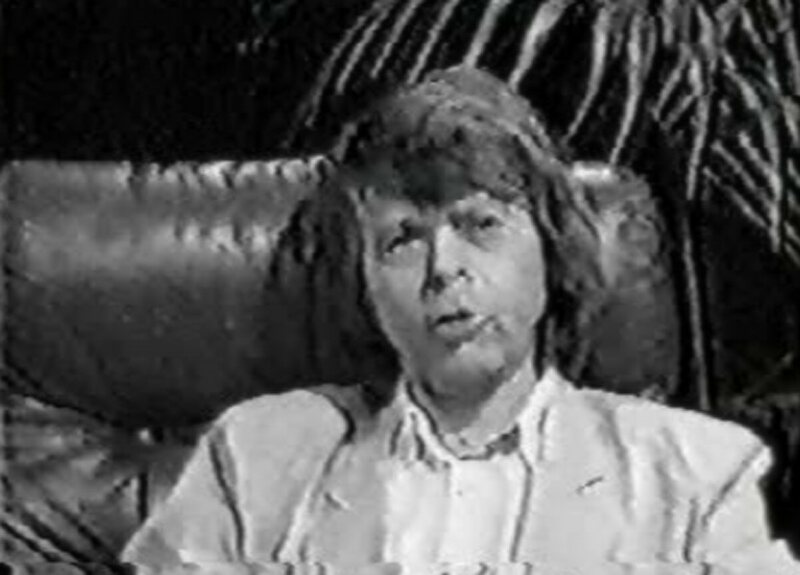 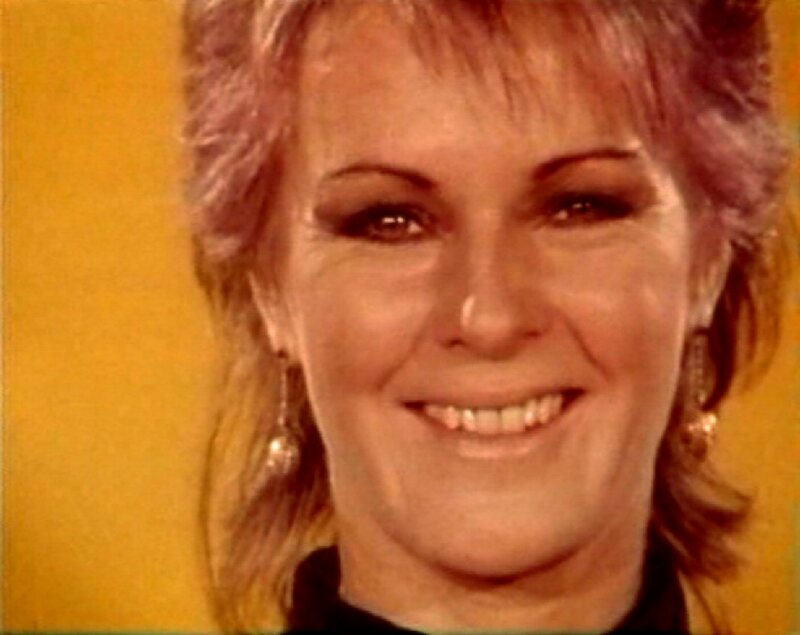 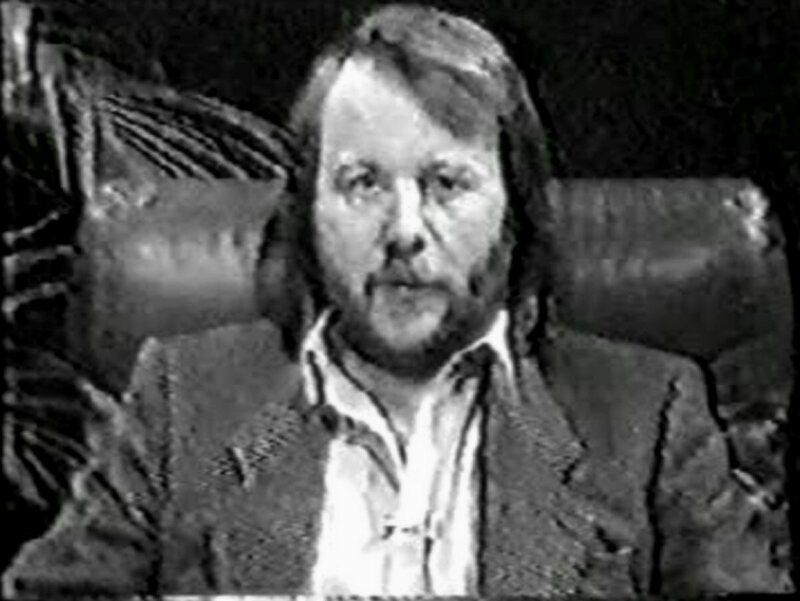 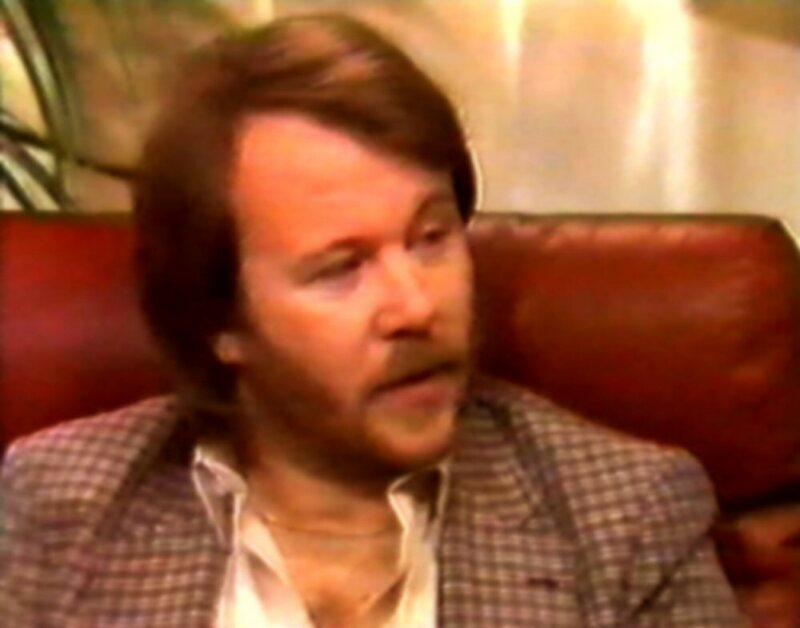 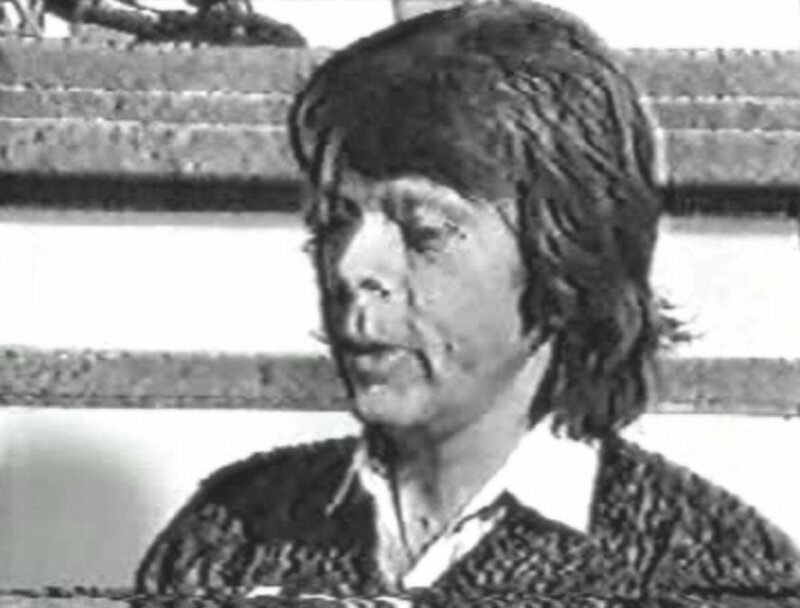 The interview was mixed with videos from different periods as well as excerpts from ABBA's concerts in 1977 and 1979. 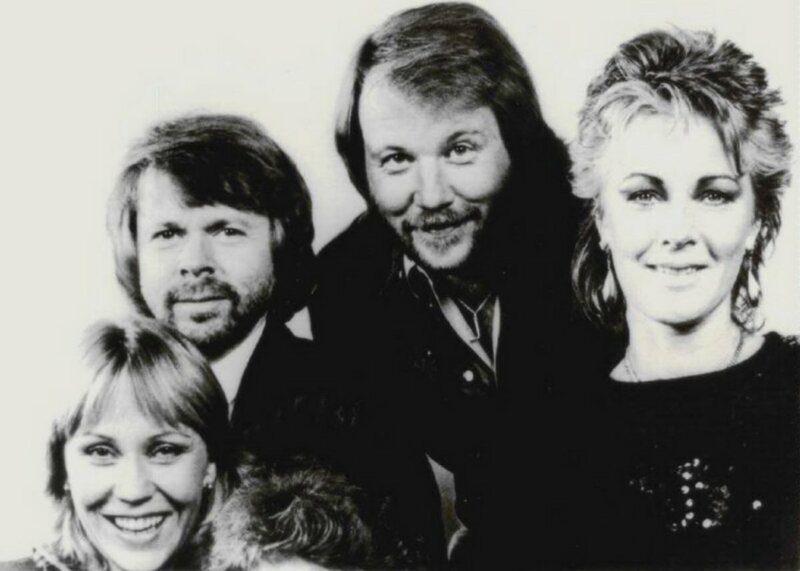 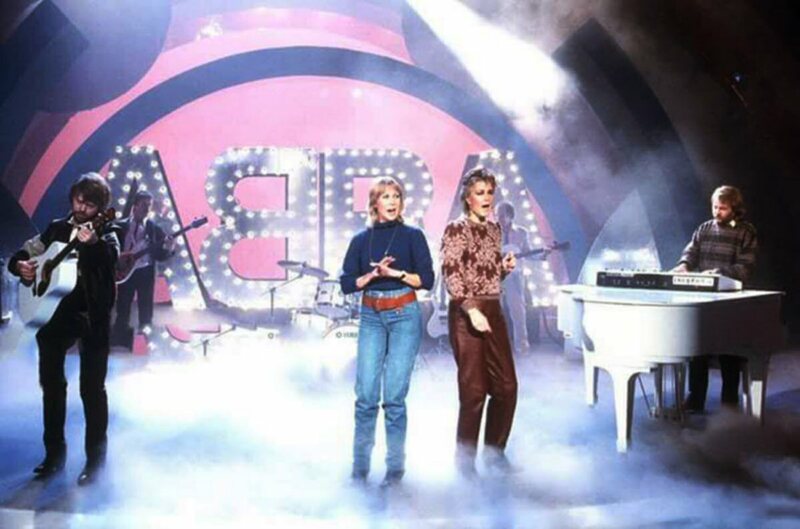 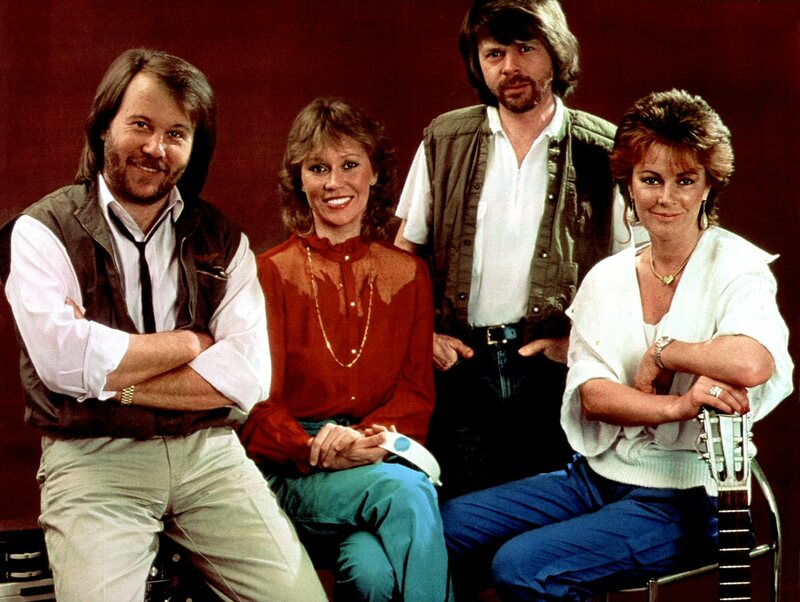 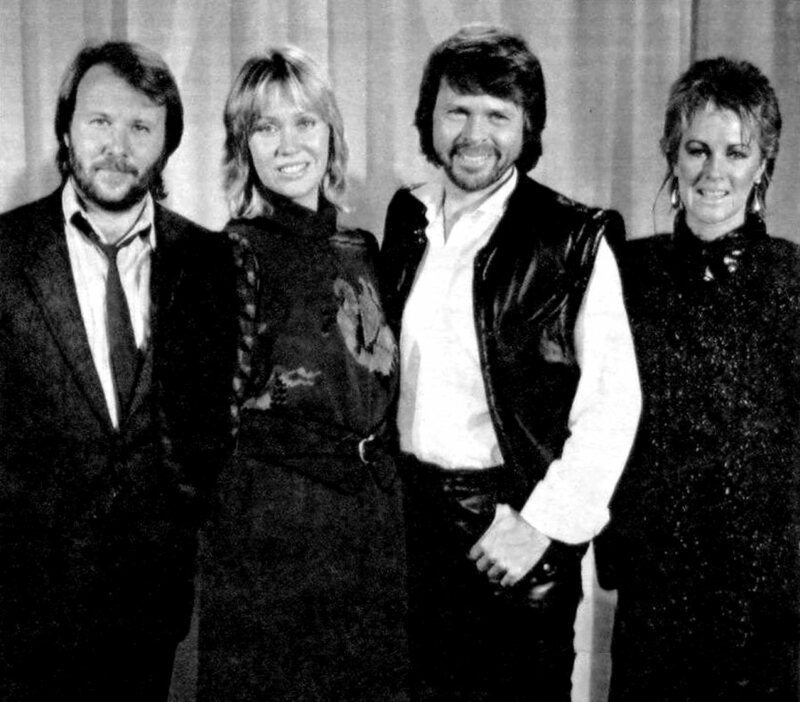 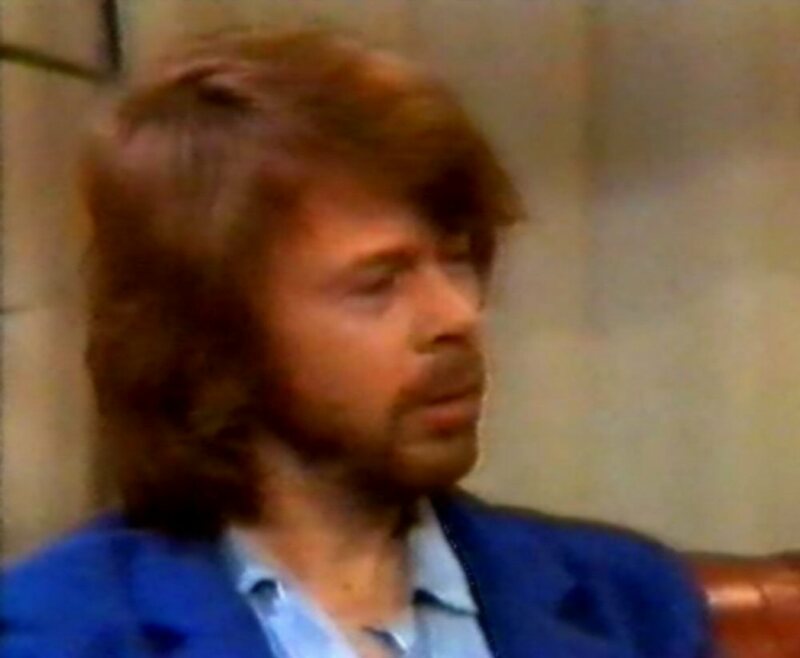 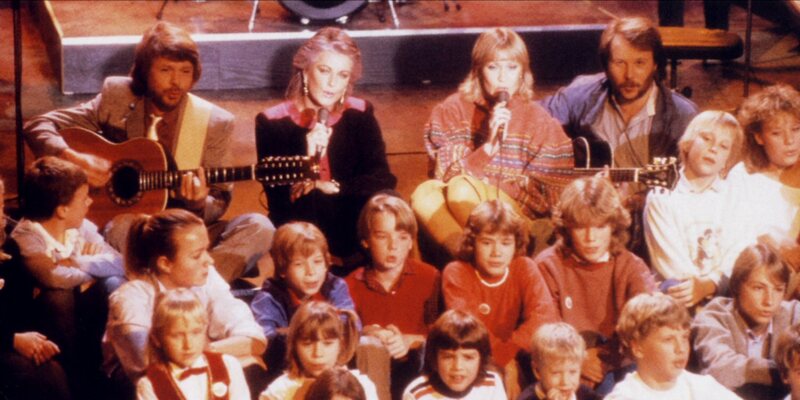 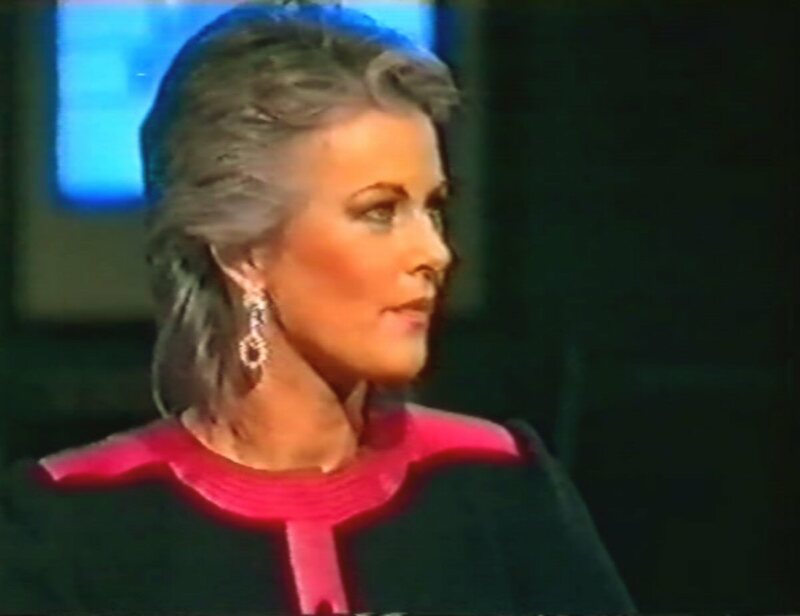 In Sweden ABBA appeared on the TV special "Nöjesmaskinen" on 19 November 1982 where they were interviewed by two well-known Swedish journalists Sven Mellander & Stina Dabrowski. 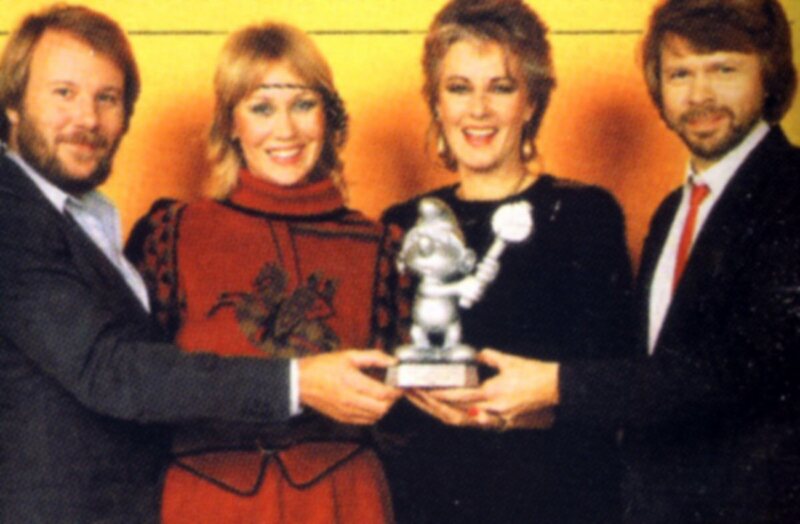 At the end of November 1982 the Polar family celebrated the successful year 1982 with a little award ceremony. 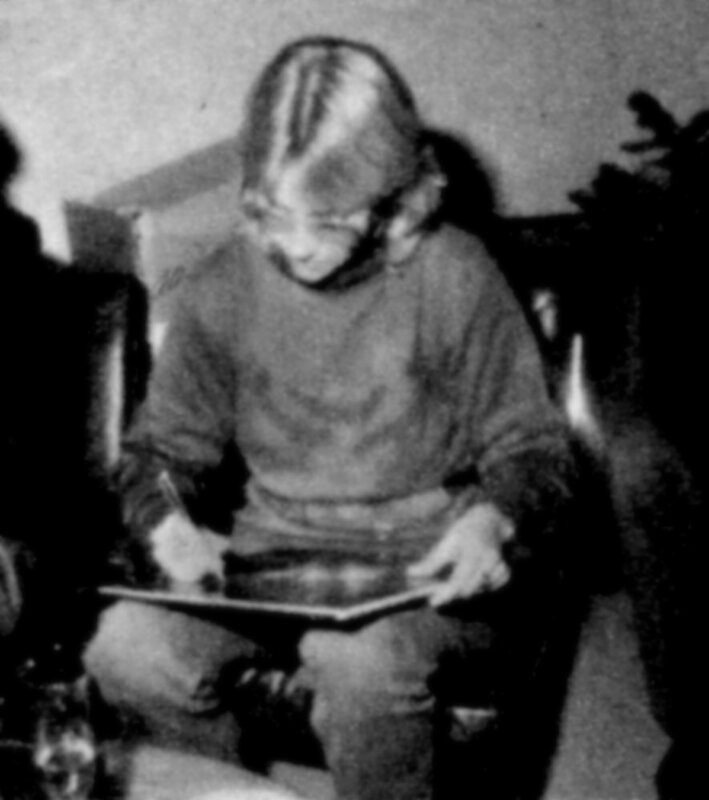 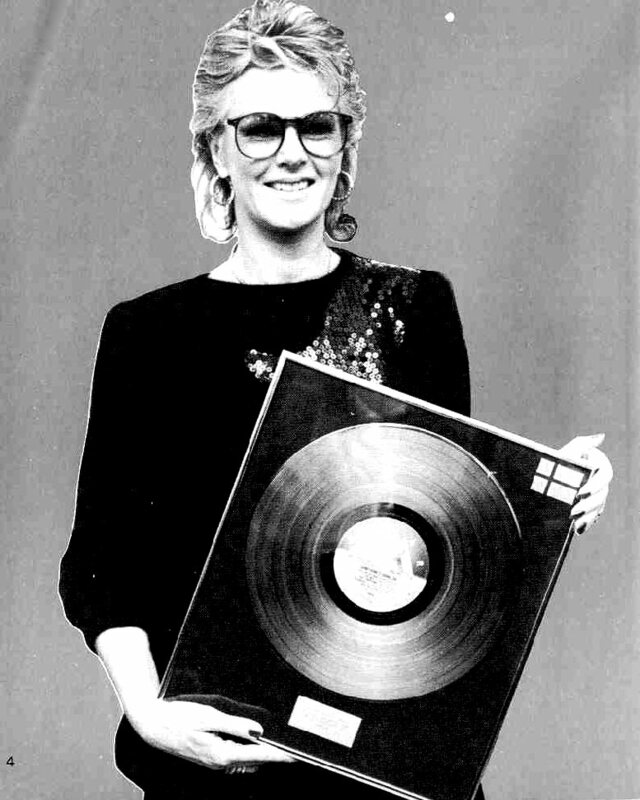 Frida received gold LP for "Something's Going On" and gold SP for "I Know There's Something Going On". 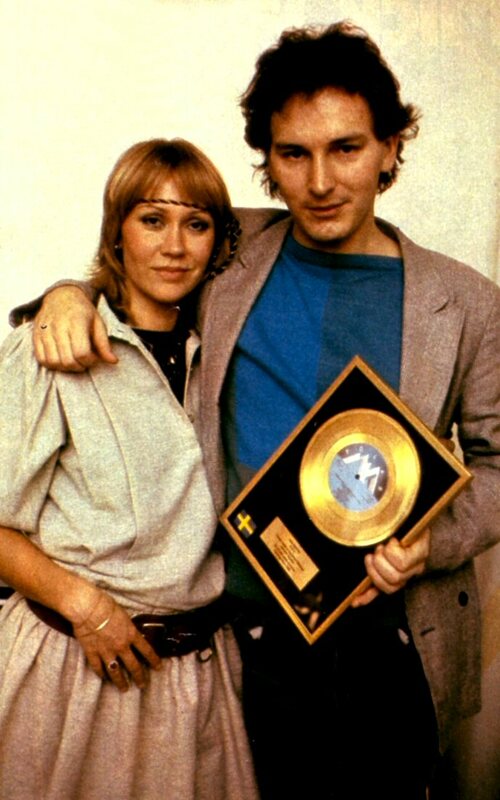 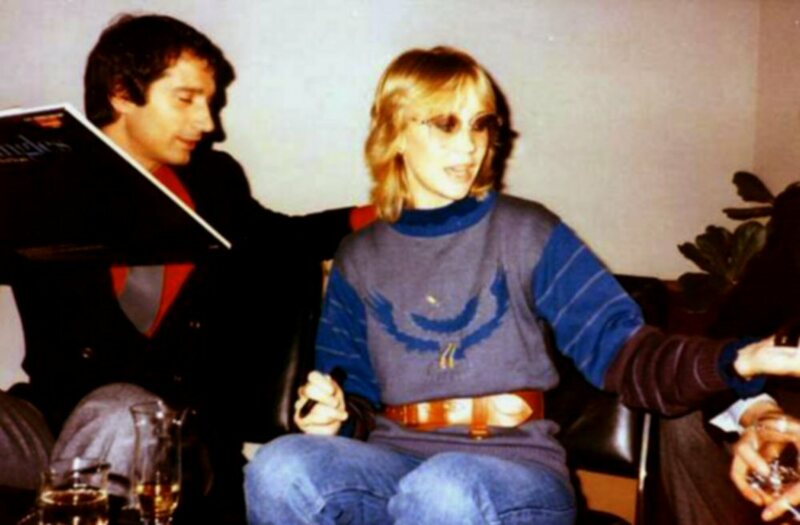 Agnetha & Tomas Ledin received gold single for their hit "Never Again". 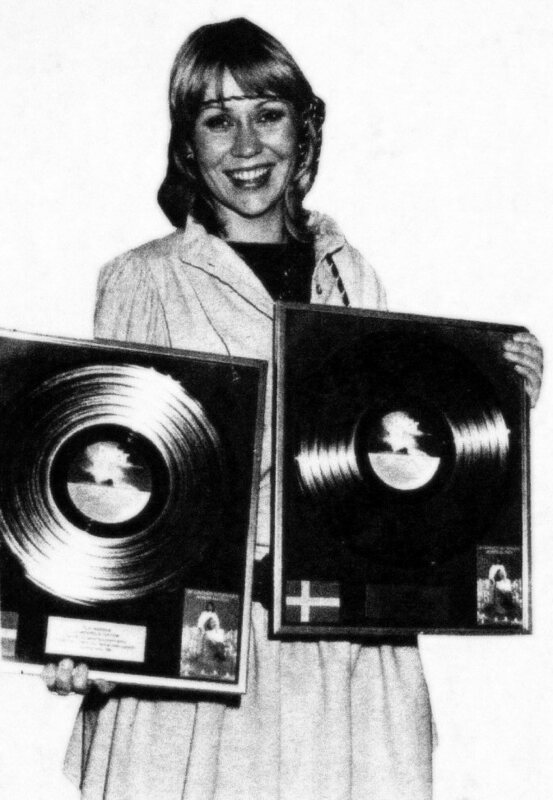 Agnetha received gold LP for her Christmas album recorded together with her daughter Linda "Nu tändas tusen juleljus". 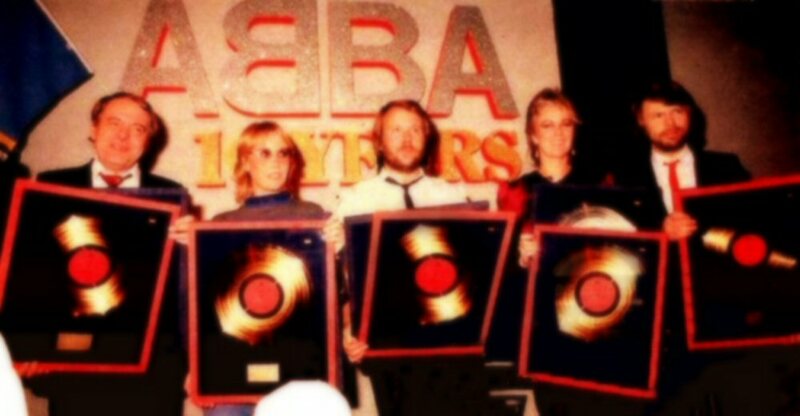 Finally the group ABBA received gold disc for their latest (and last) studio album "The Visitors" released at the end of 1981. 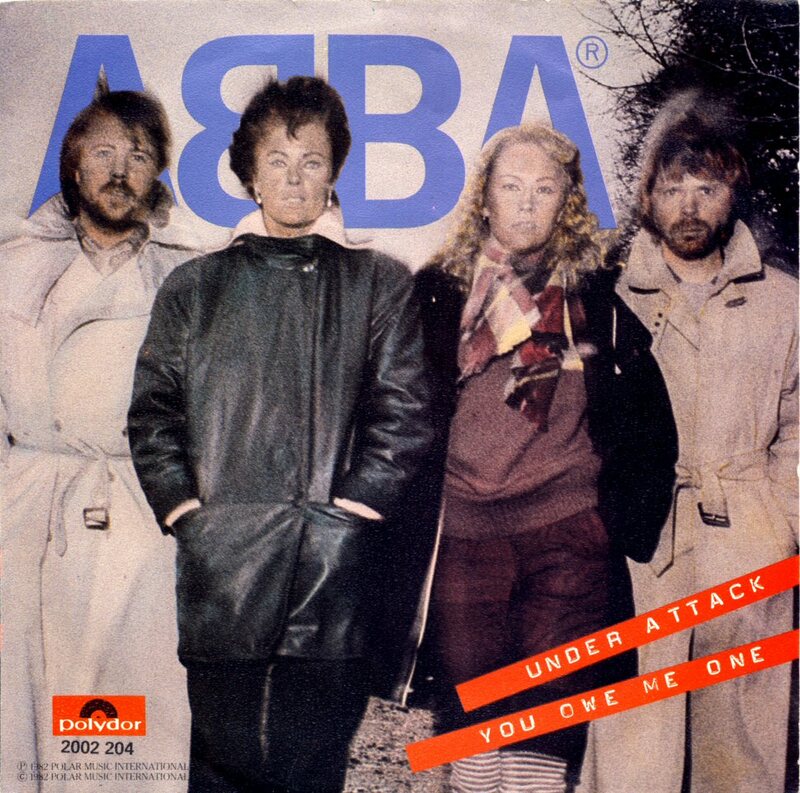 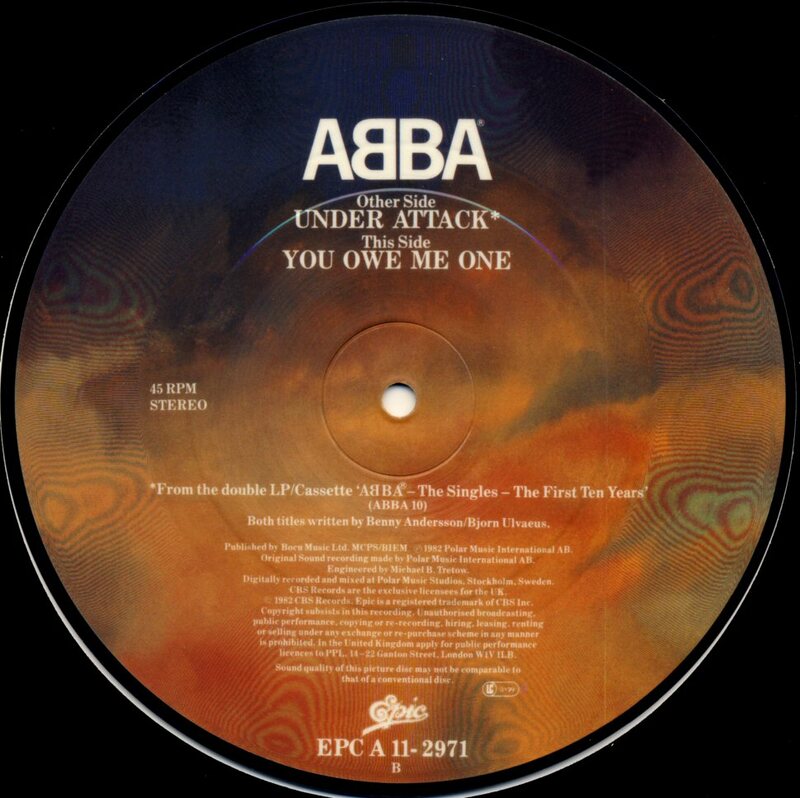 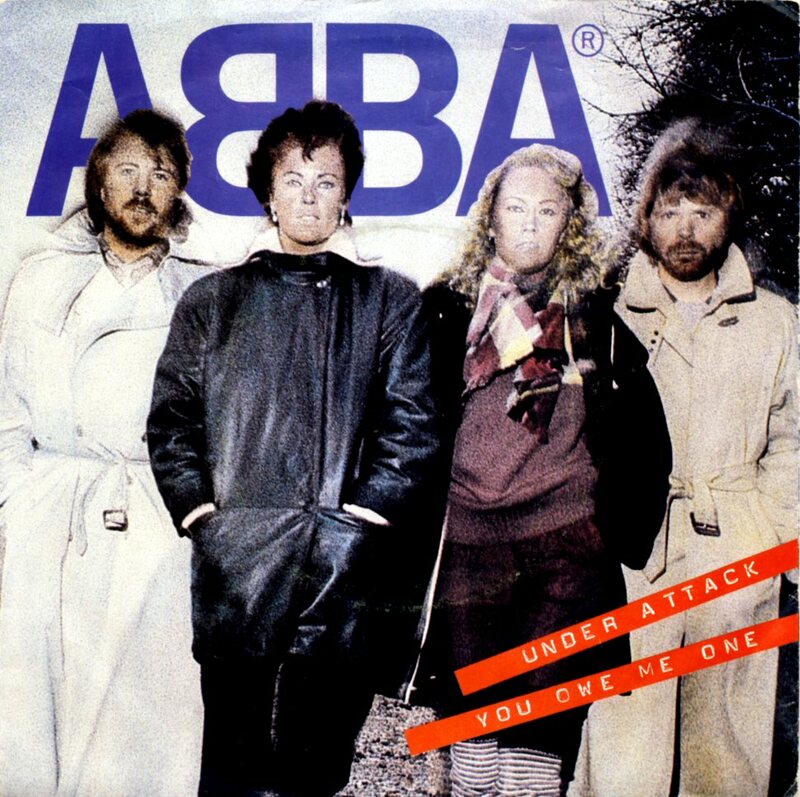 The last single released by ABBA was "Under Attack" b/w "You Owe Me One". 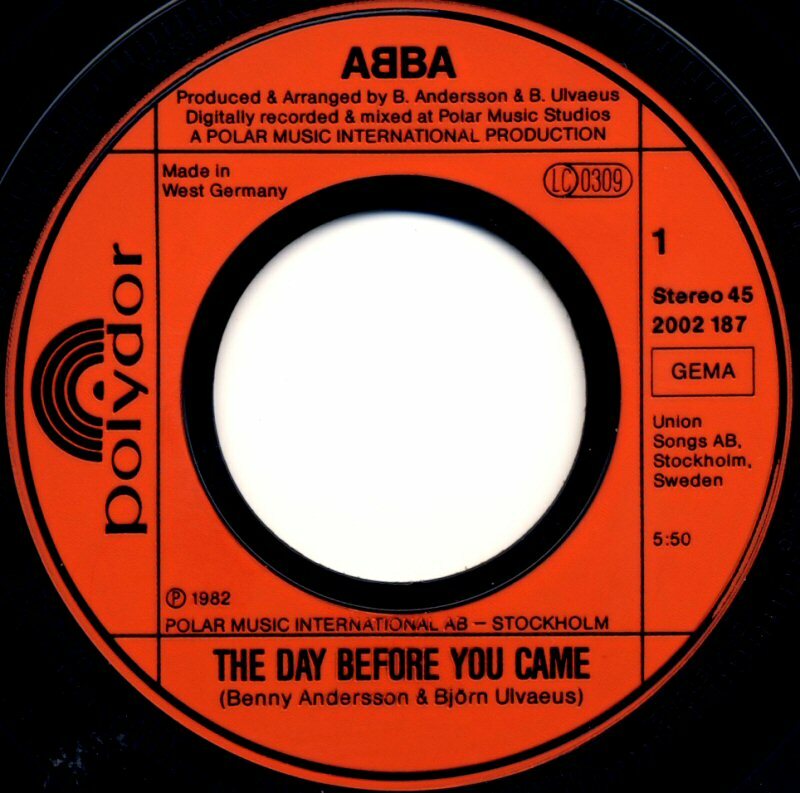 The both songs sounded very modern and seemed to be the first try to create a totally new sound based and dominated by Benny's synthesizers. 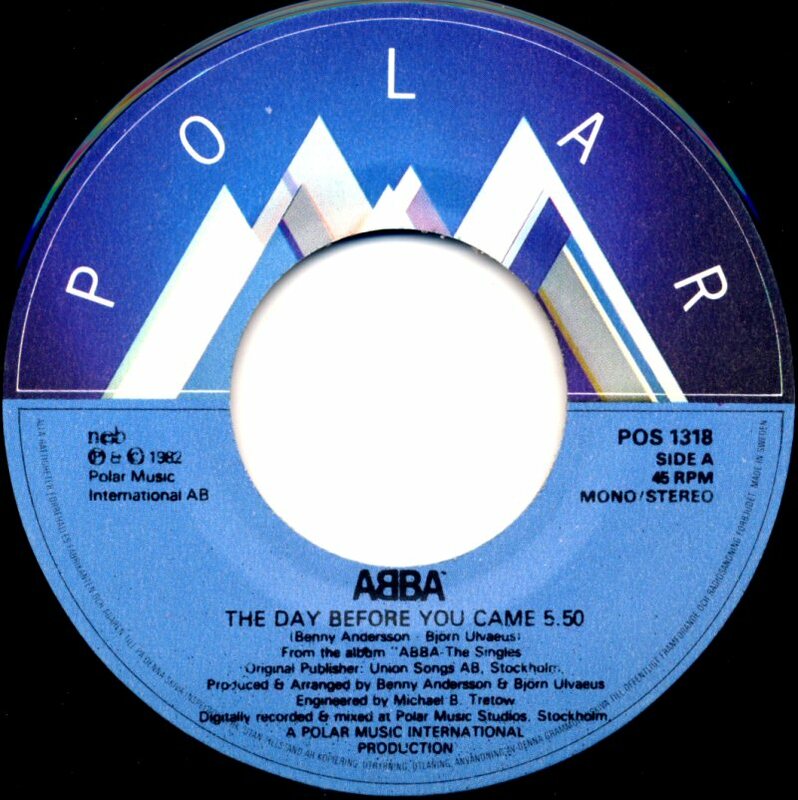 This new sound was not appreciated by the fans in Great Britain where the single reached only #26. It entered the UK chart on December 11, 1982 and stayed there for 8 weeks. 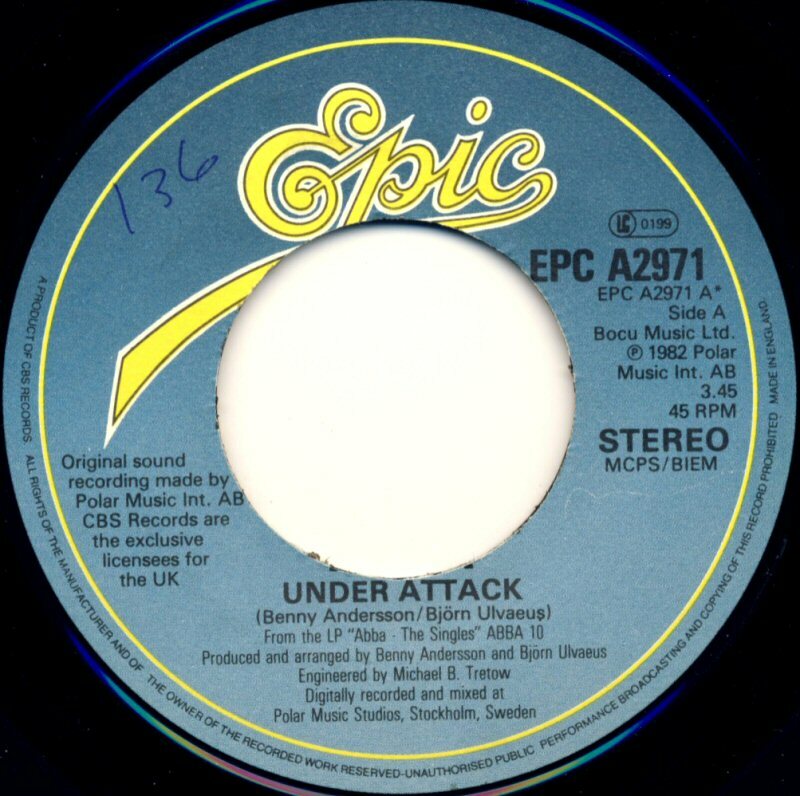 "Under Attack" was released in the UK both as a 7" and as a picture disc. 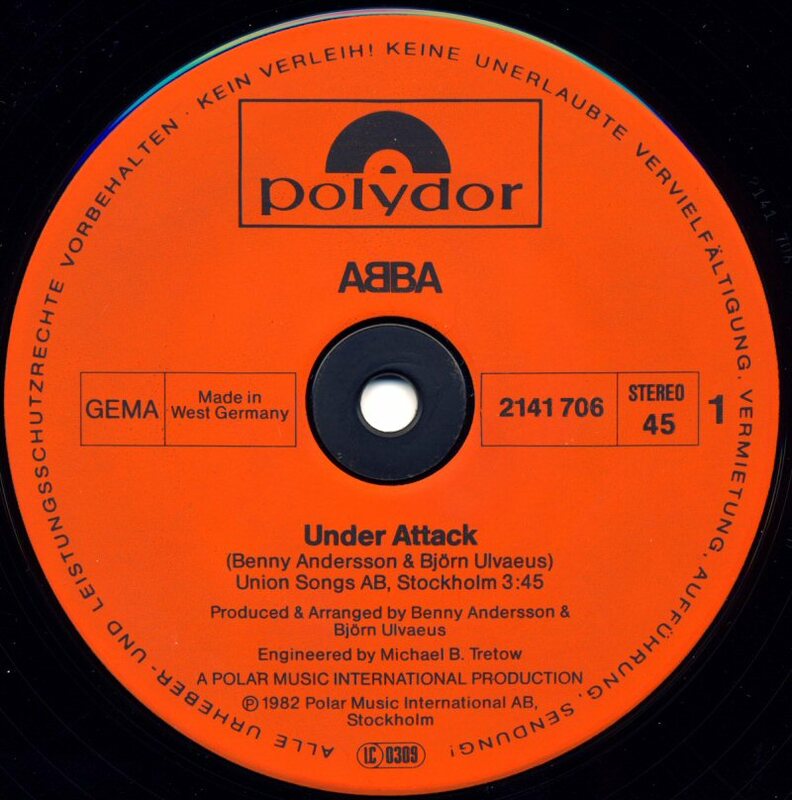 In West Germany "Under Attack" entered the hit chart on December 27th, 1982. 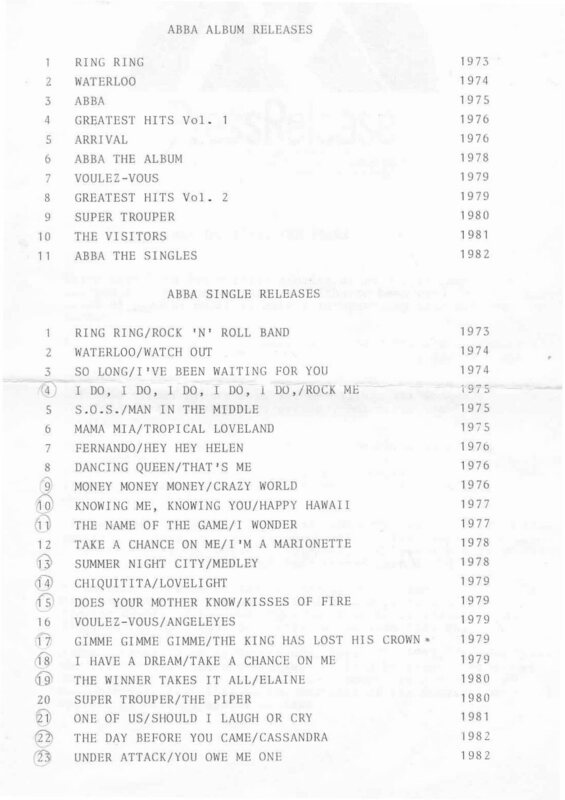 It stayed there for 9 weeks peaking at #22. 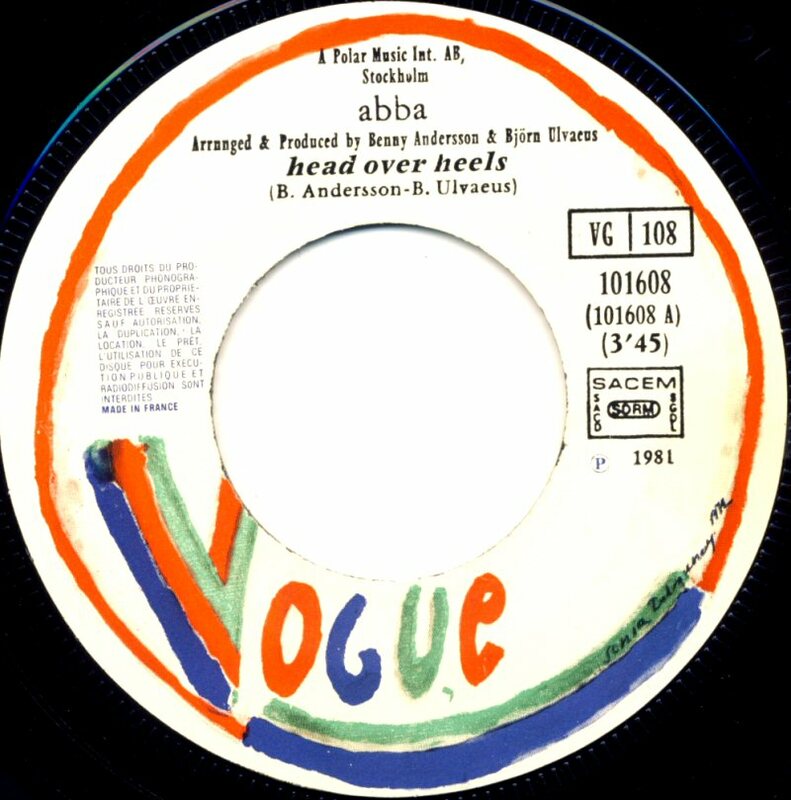 The single was released in two versions - as 7" and as maxi single 12". 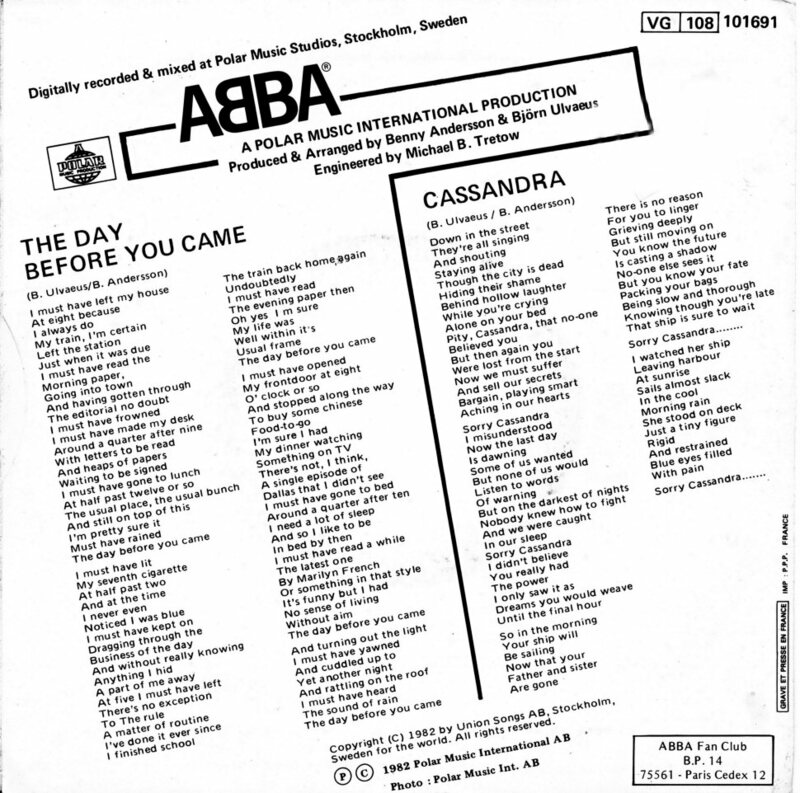 There were two versions of the single cover in different countries. 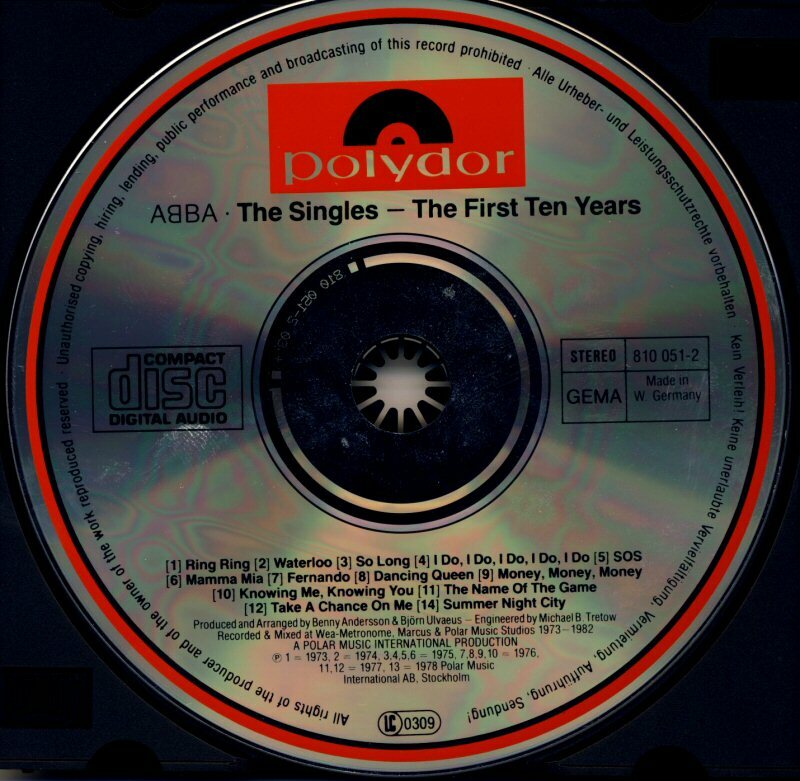 Most of the record companies chose the picture from the inner sleeve from the album "The Singles - the first ten years". 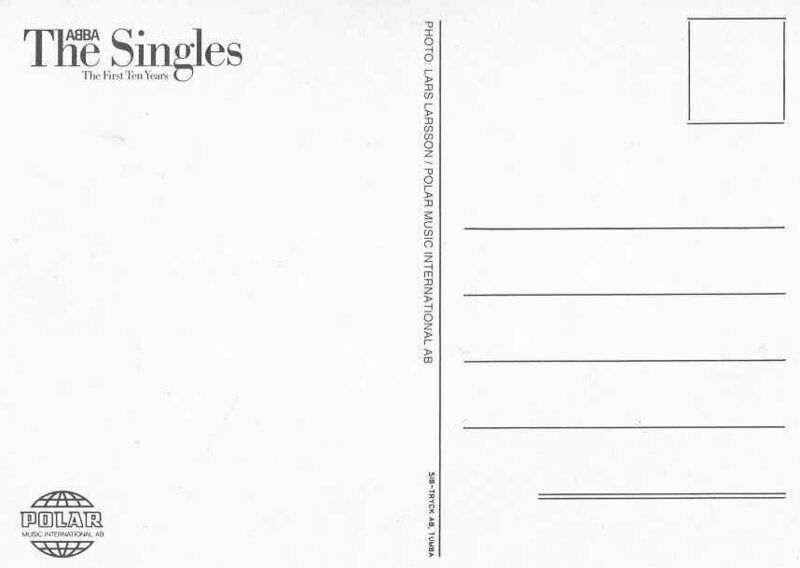 Polydor in W. Germany, Vogue in France and some other companies decided to use the cover pictures from the "The Singles" album. 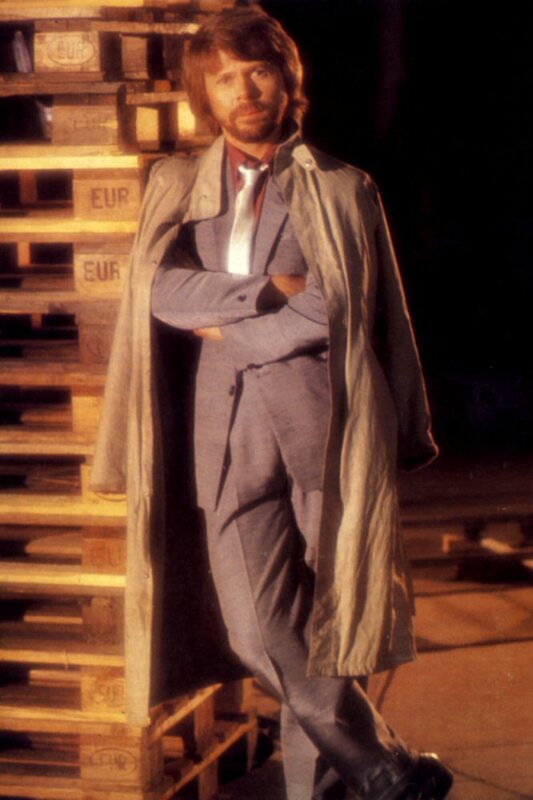 "Under Attack" became much bigger hit in Belgium (where it peaked at #3) and Holland where it entered the chart on December 11th, 1982 and stayed there for 6 weeks reaching #5. 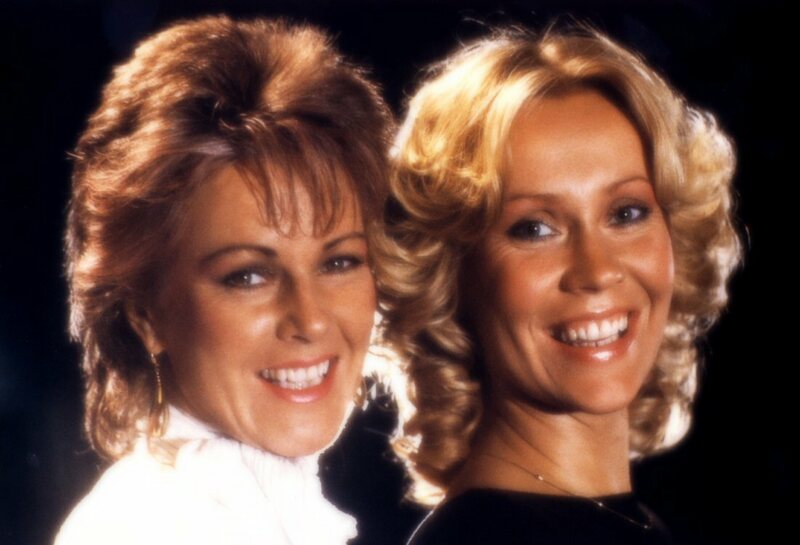 In Finland became #16, in Irland #13 and in Australia #96. 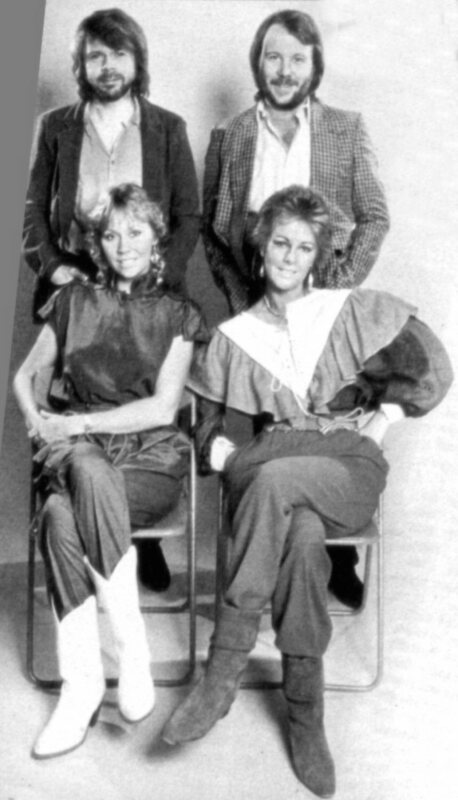 In Spain there was released a compilation album entitled "Antologia" at the end of 1982. 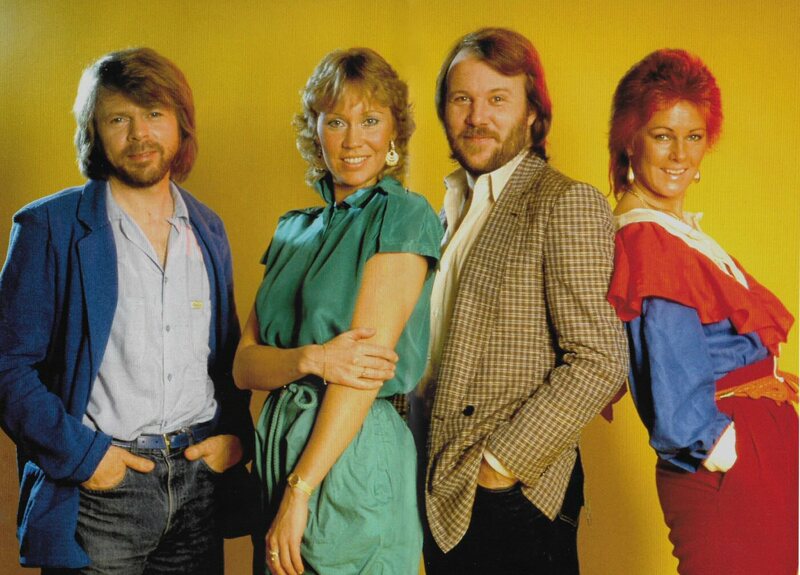 The compilation featured ABBA's 11 greatest hits from the period 1974 - 1979. 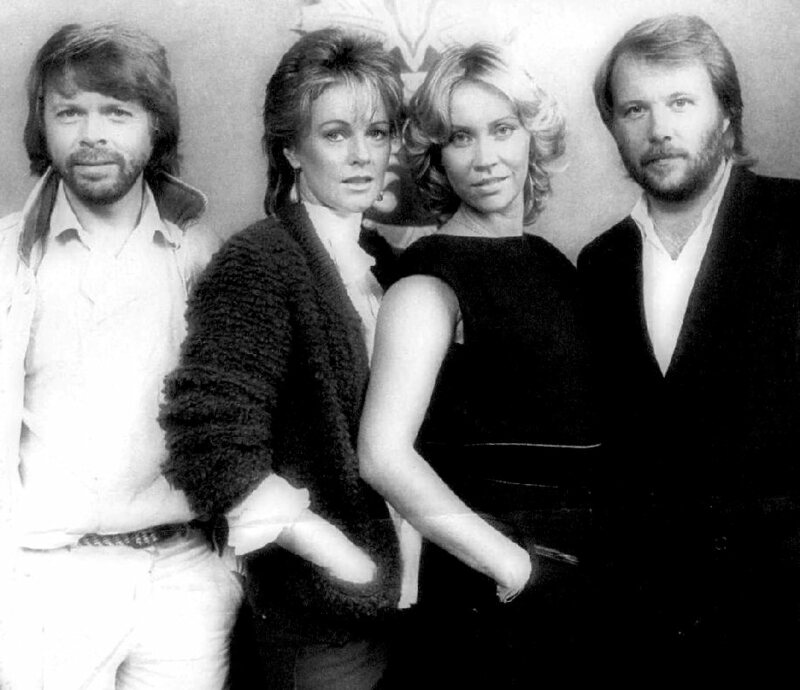 ABBA appeared together for the last time as a group on December 11, 1982. 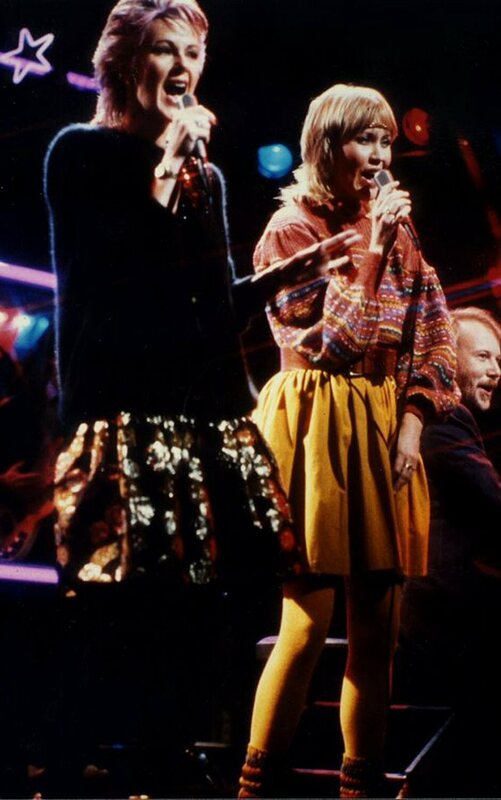 They performed "I Have a Dream" and "Under Attack" in the TV studio in Stockholm. 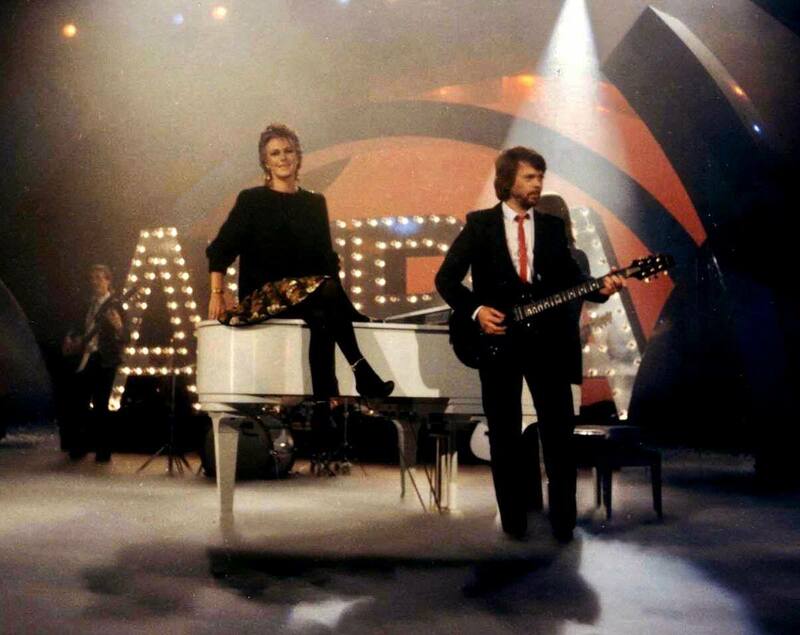 The performance was broadcasted by satellite directly to London and shown in "The Late Late Breakfast Show". 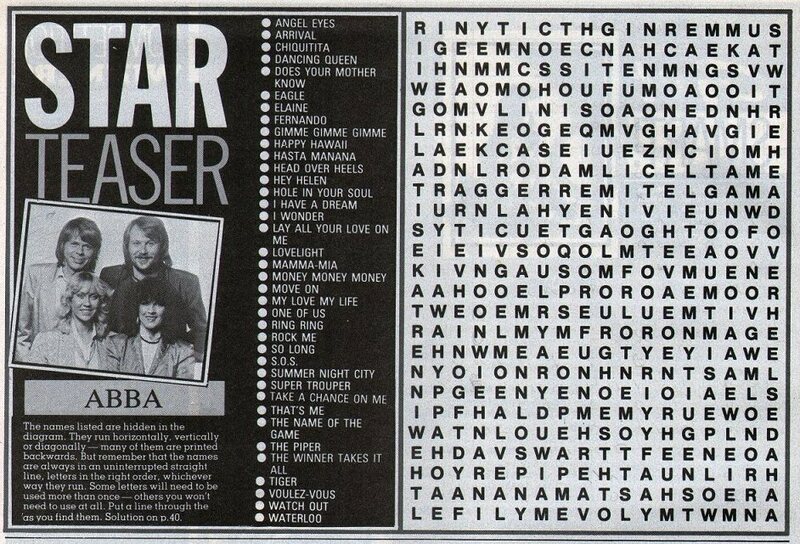 Between the song performances the group answered some silly questions in a funny way. 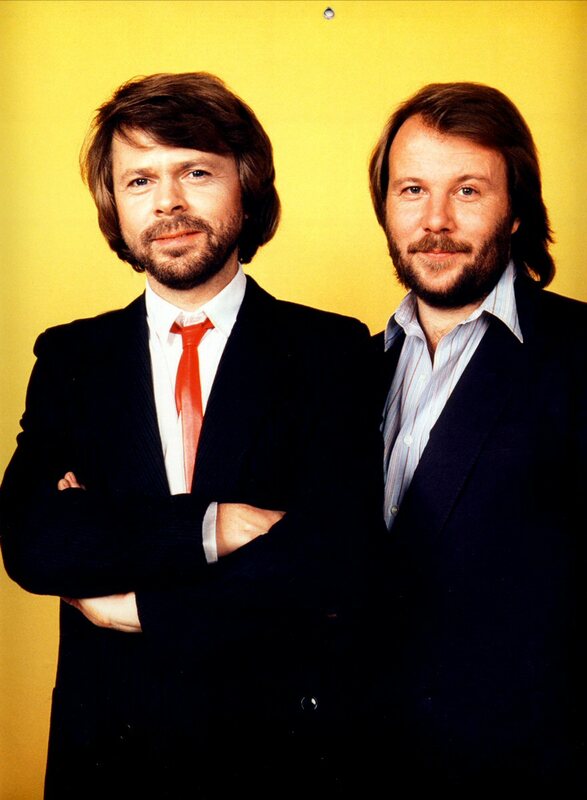 Björn and Benny had definitely funniest answers. 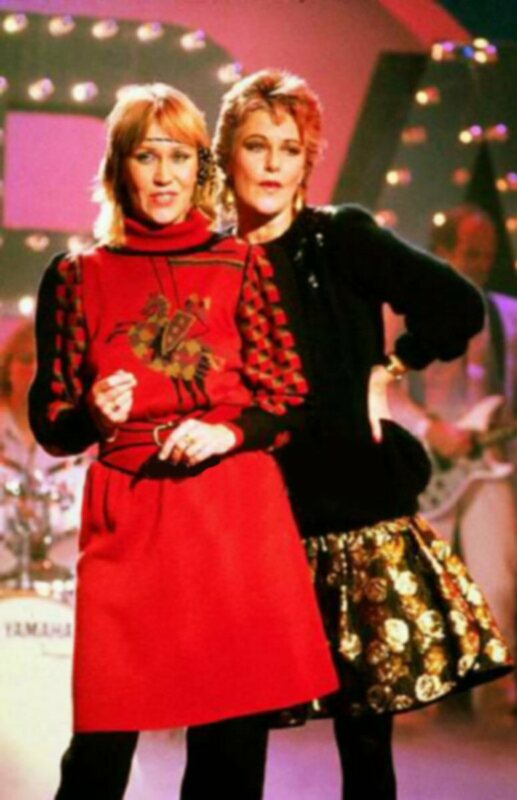 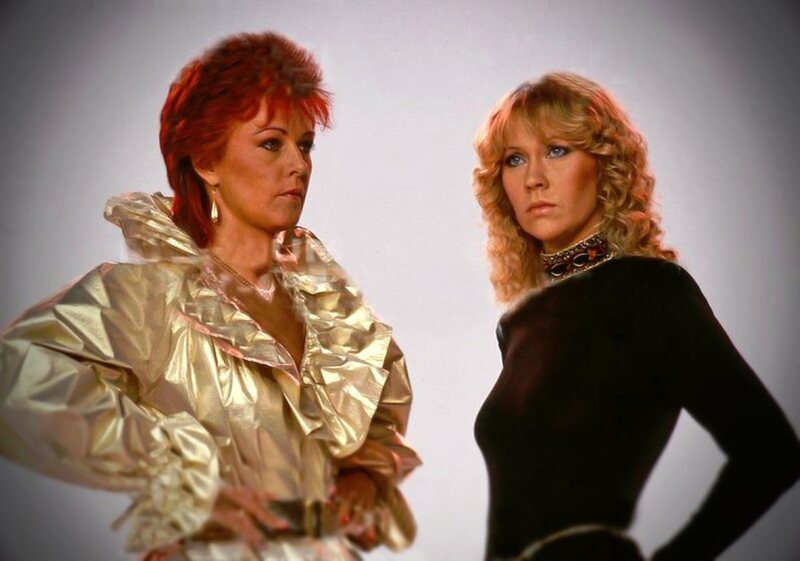 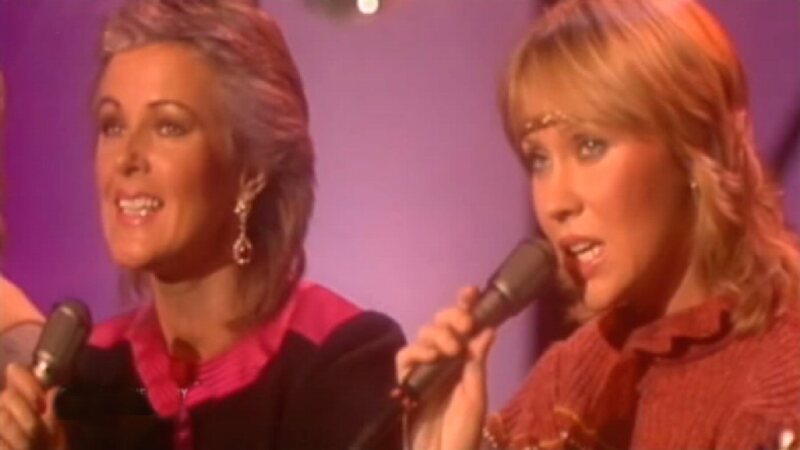 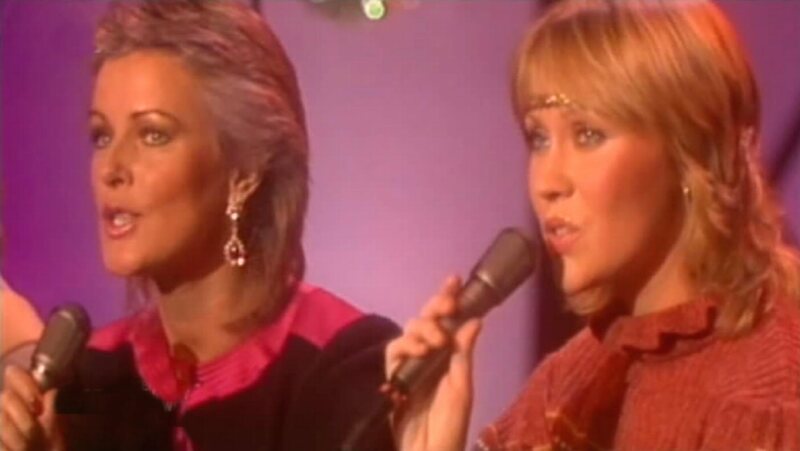 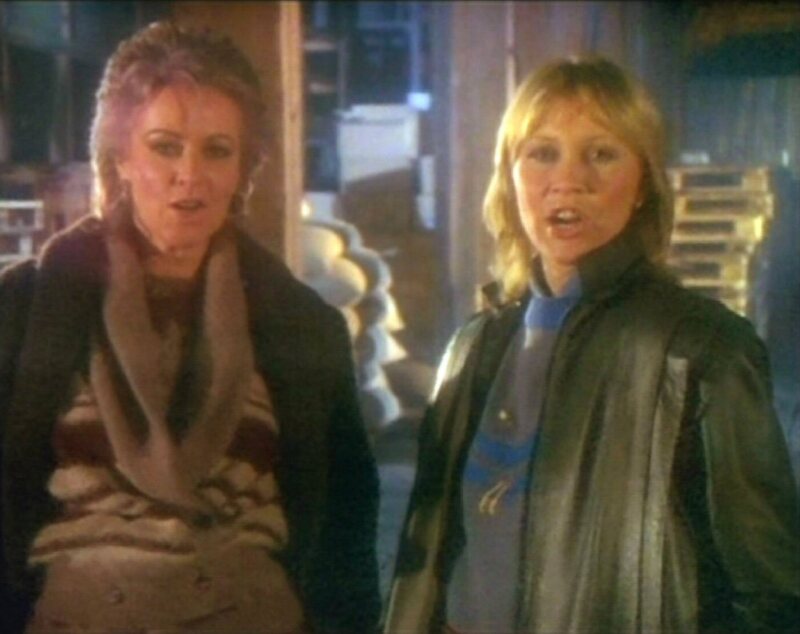 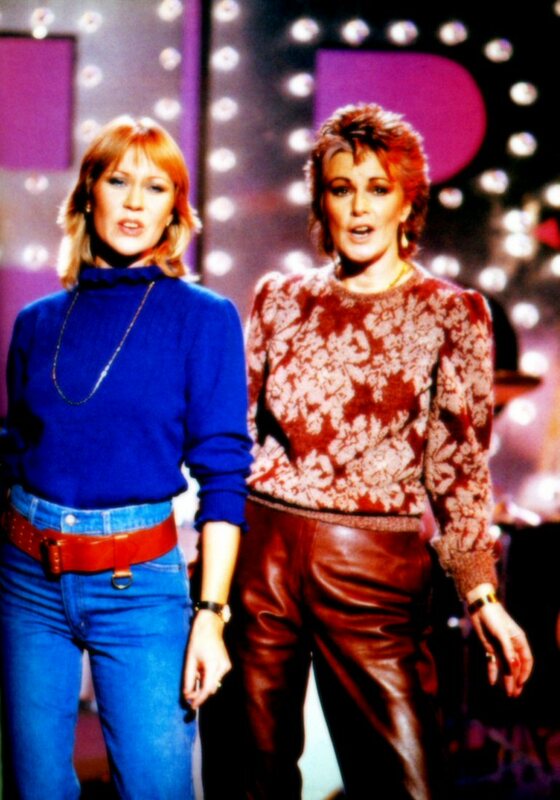 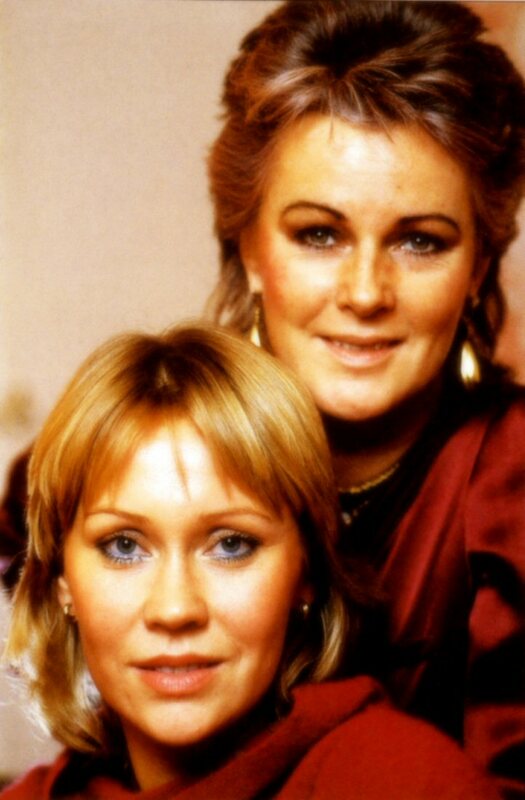 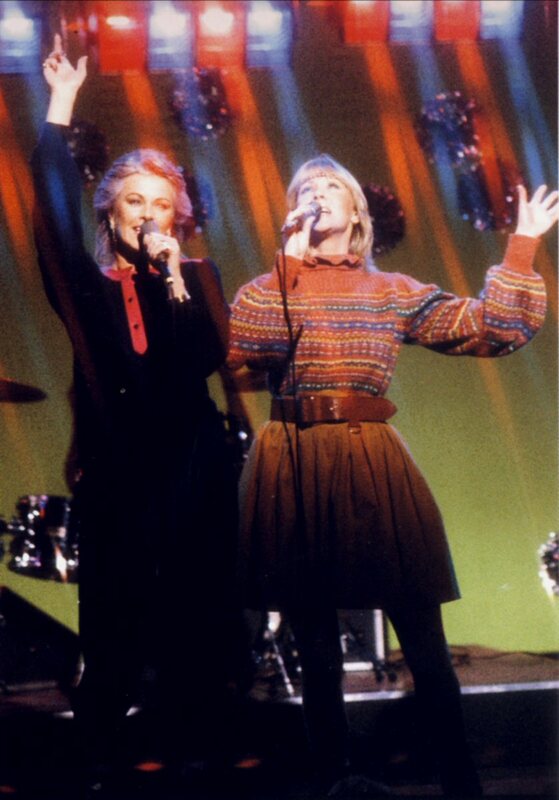 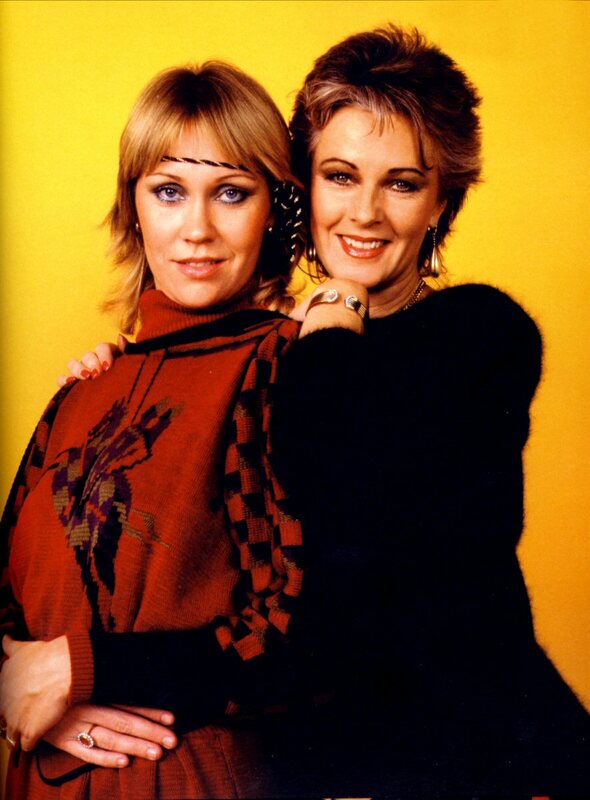 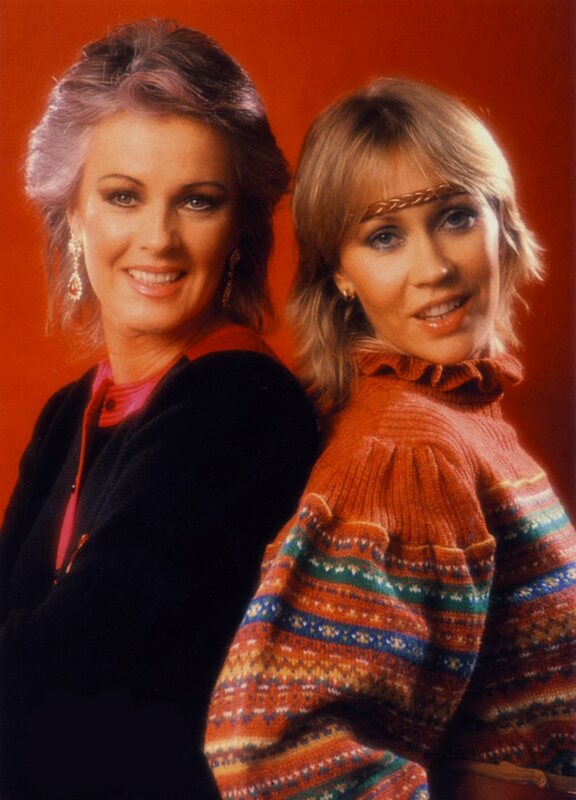 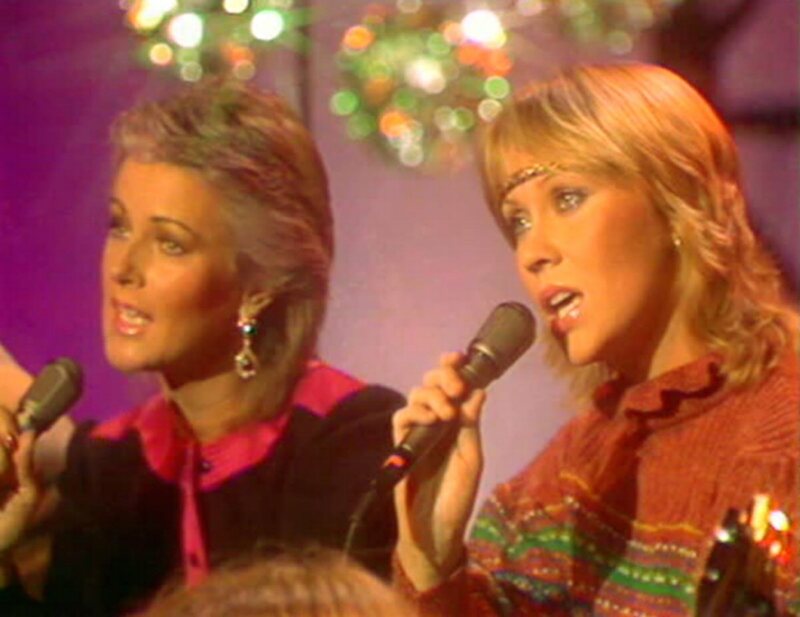 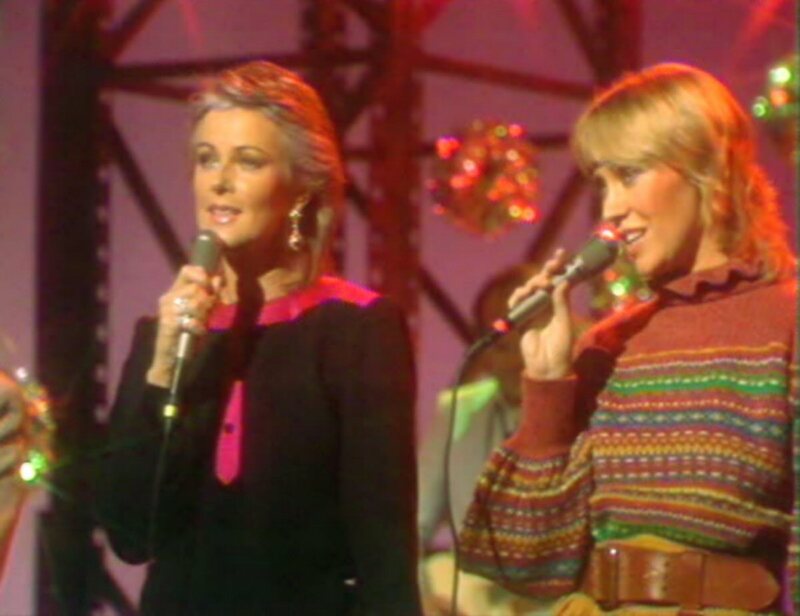 Frida and Agnetha on the contrary looked fabulous. 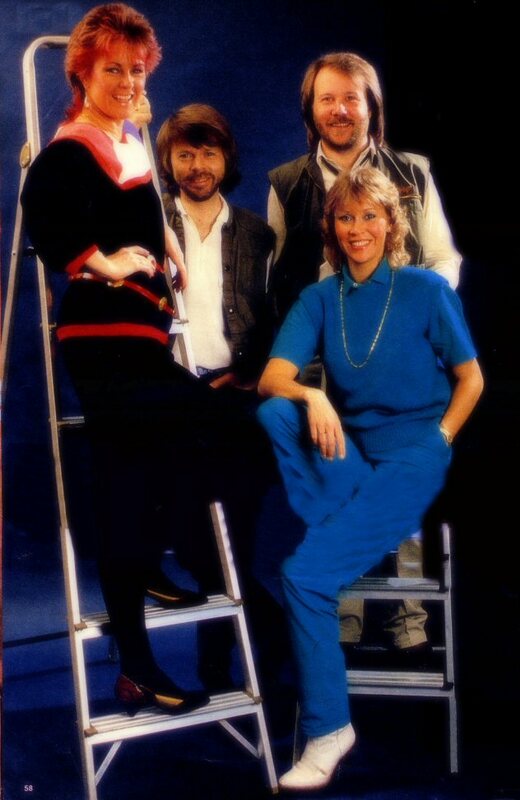 Their latest album "The Singles" was no 2 on English charts that week. 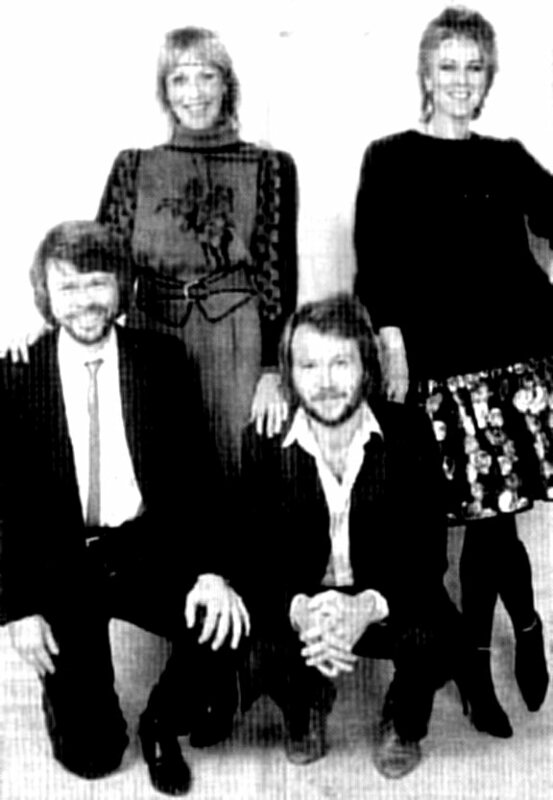 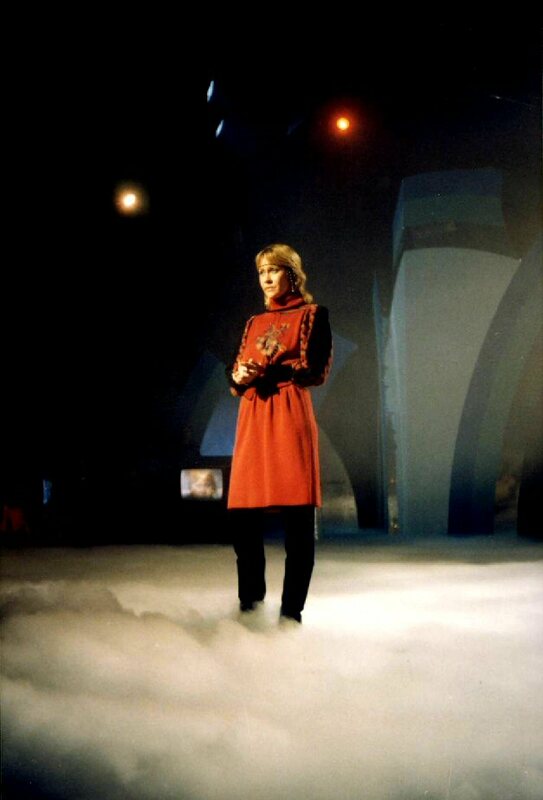 ABBA stood in front of camera for the last time after the show. 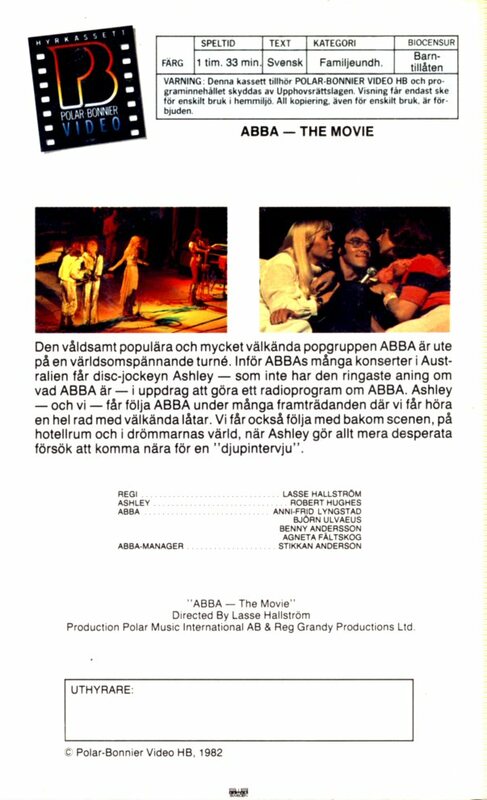 At the end of the year 1982 "ABBA The Movie" was released on video cassette by Polar-Bonnier Video. 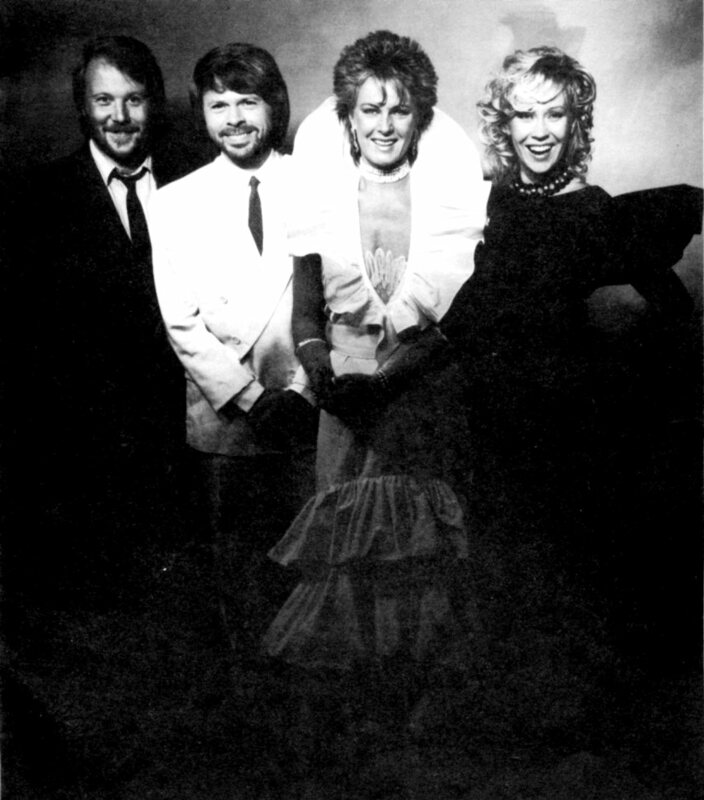 The cover featured photo of the group taken in 1982. 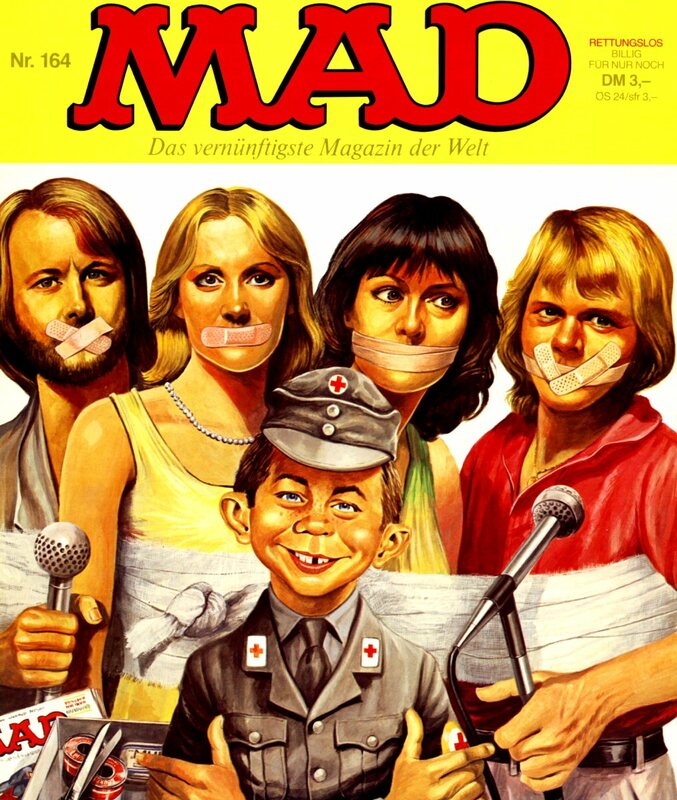 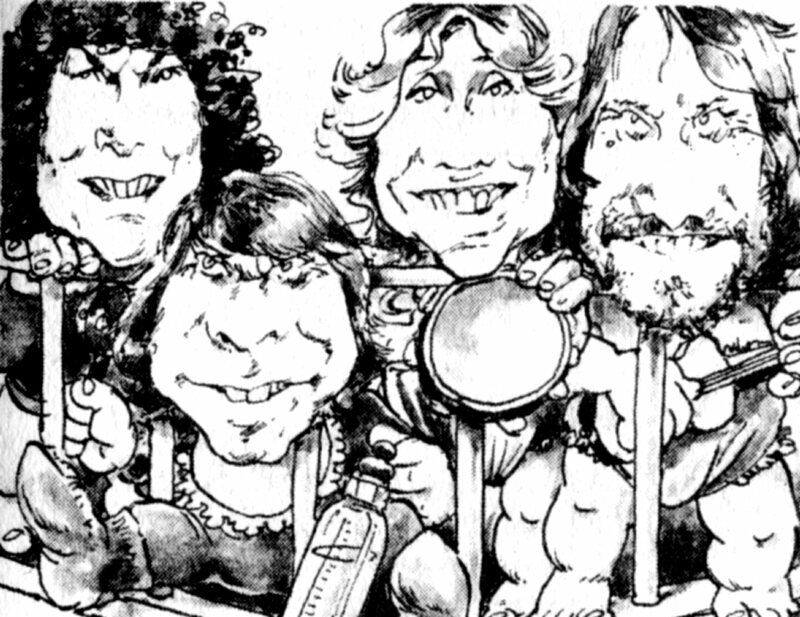 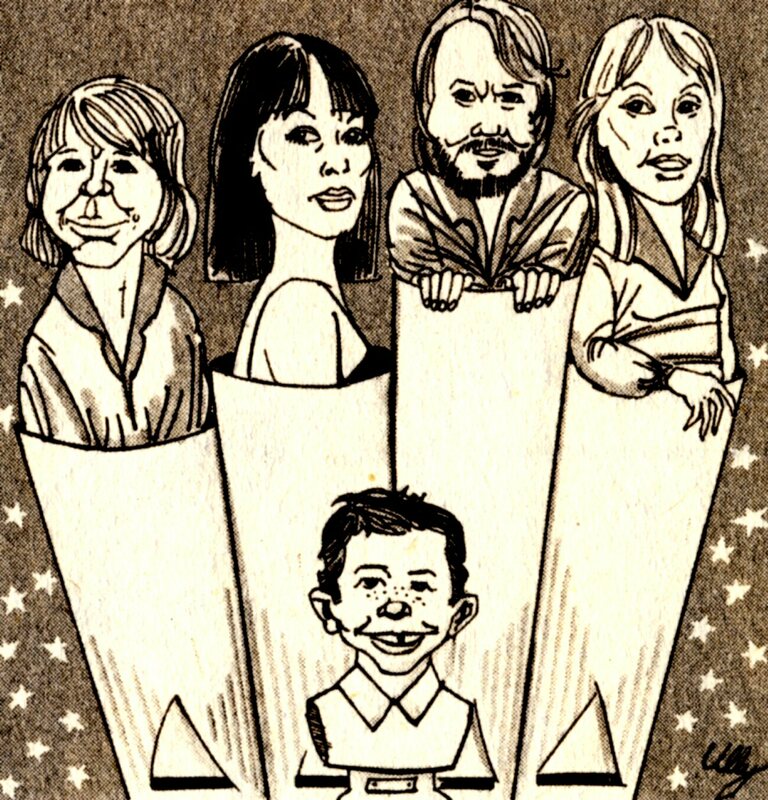 ABBA was featured in German cartoon magazine "Mad" in December 1982. 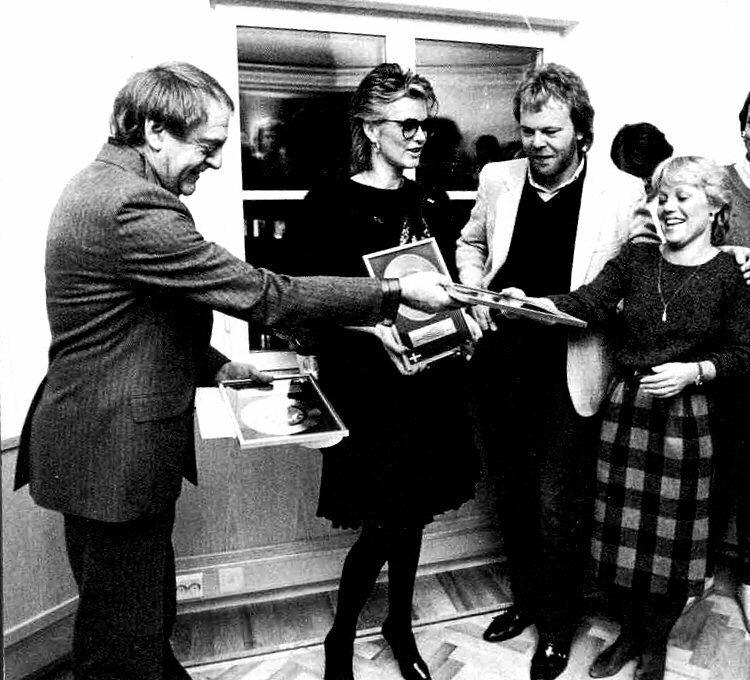 The group was awarded with the magazine's own Alfons-prize.